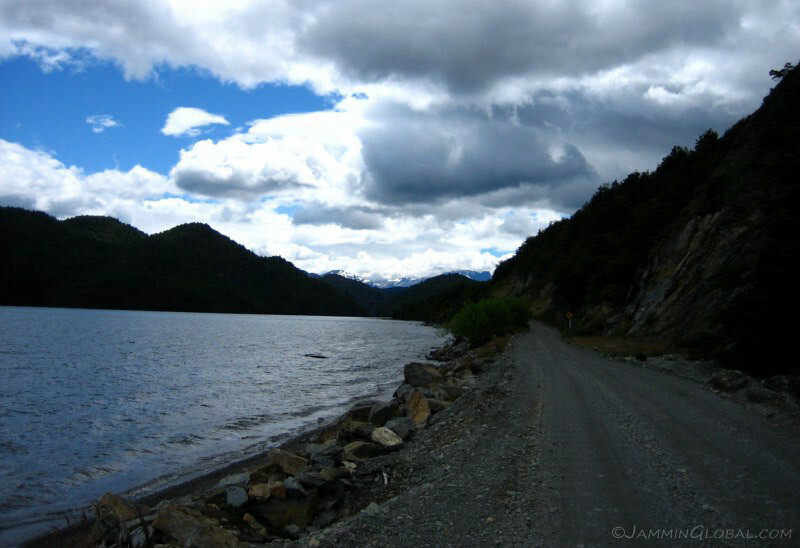 I was in the midst of Chile’s northern Patagonia, deep along the Carretera Austral and getting a feel for living in a remote land. 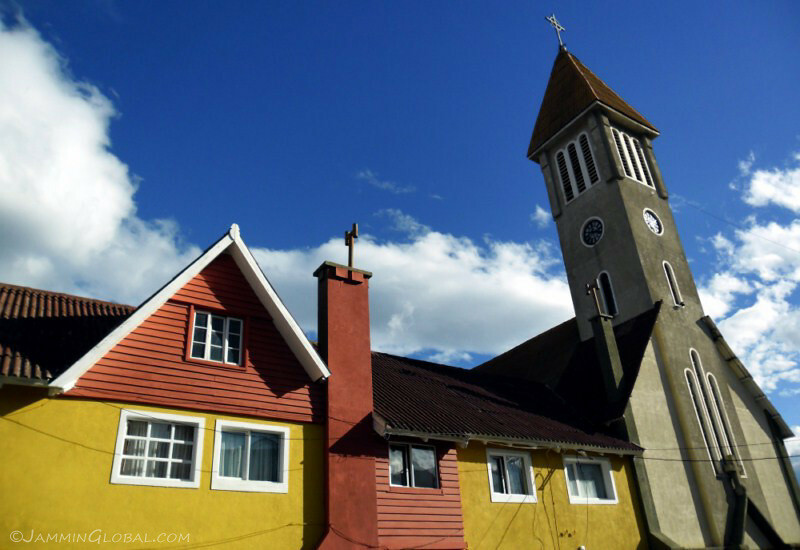 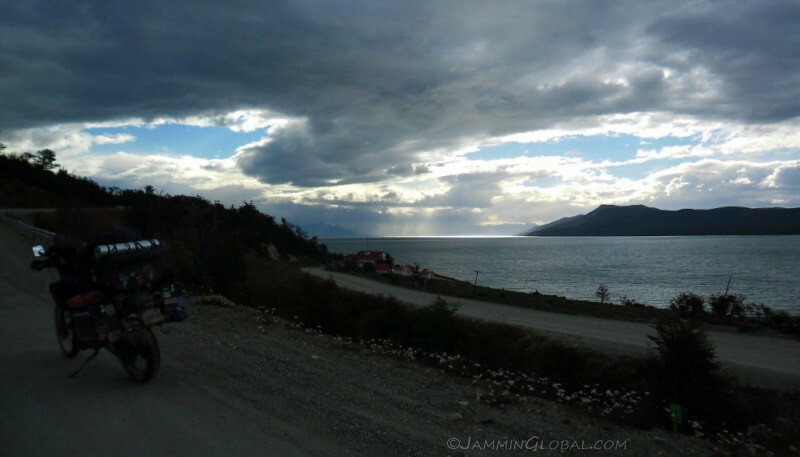 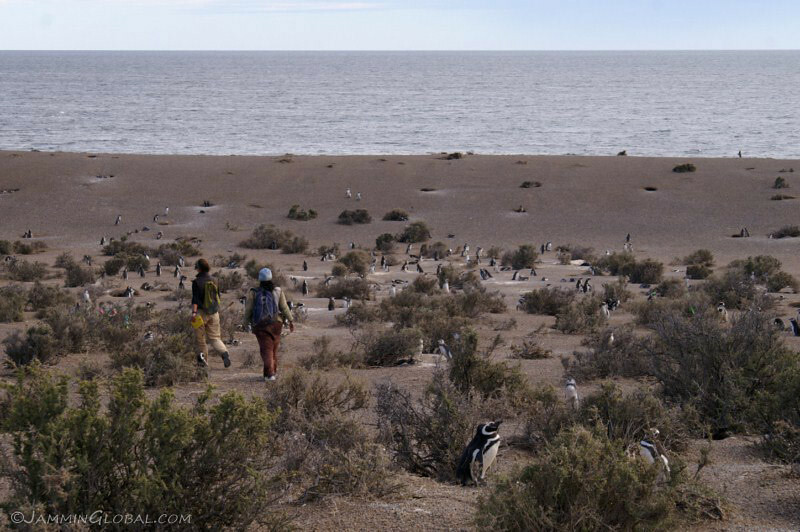 After a few days in Puerto Aisén, I continued south around Lago Carrera General and to the current terminus of the Carretera Austral at Villa O’Higgins. 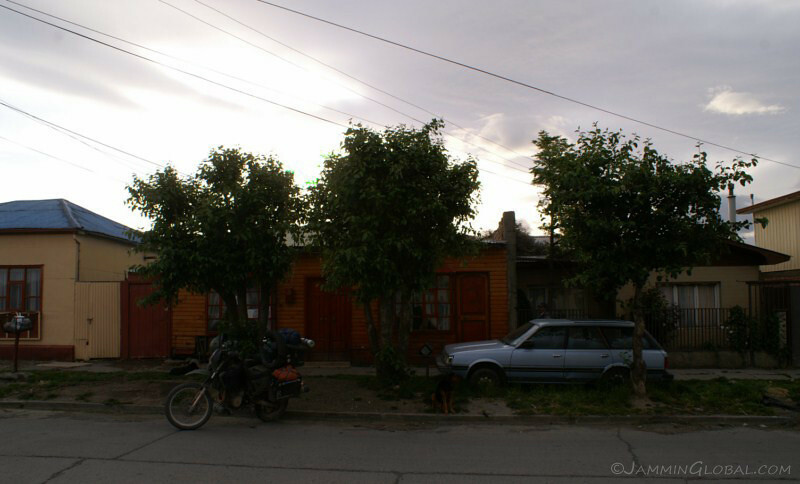 The wood shed of the small hotel that I was staying at in Puerto Aisén. 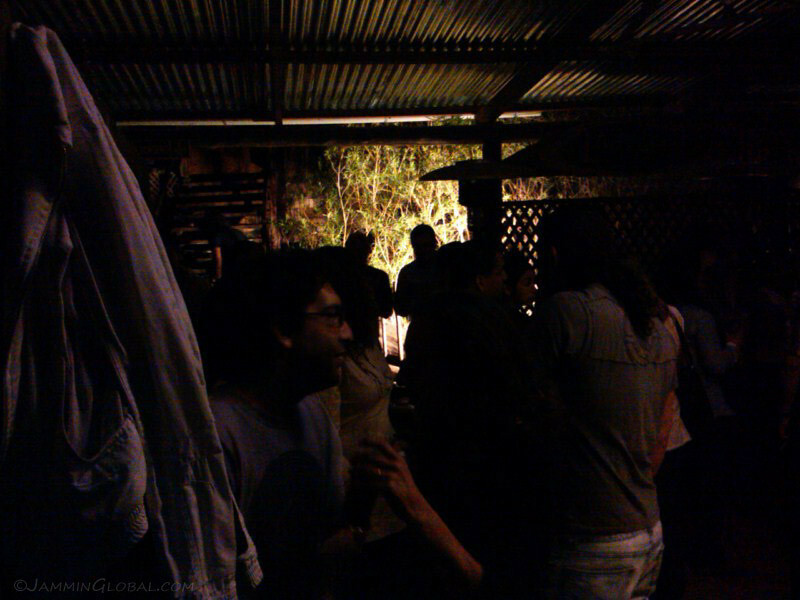 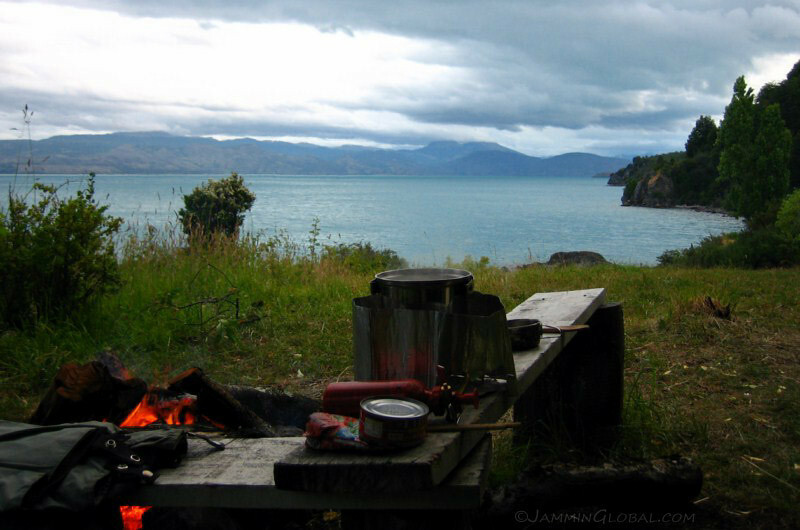 Even in summer, it’s quite chilly here and fire places were roaring. 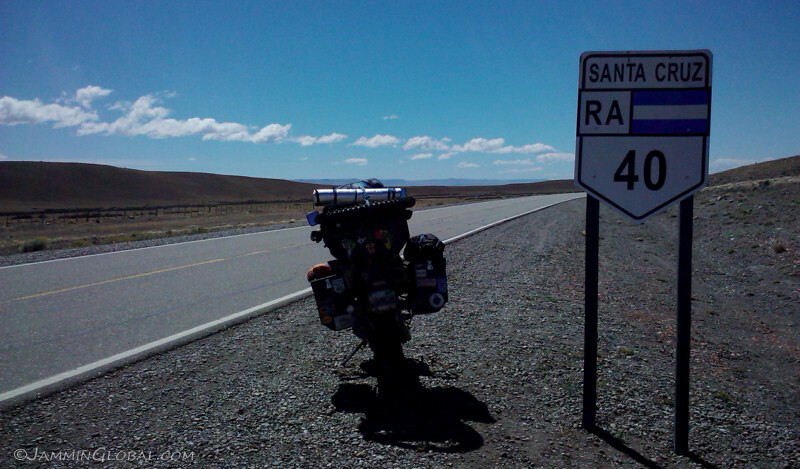 After resting for a day, I continued on south. 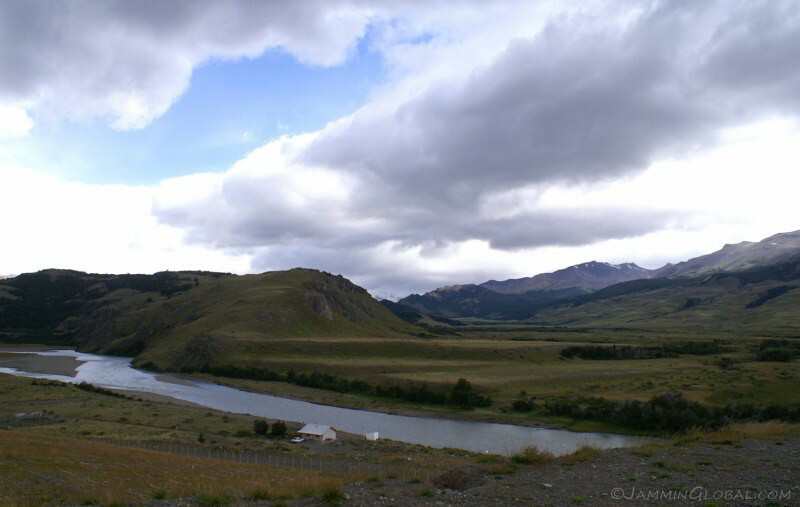 The first and only wind power turbines that I saw in Patagonia. 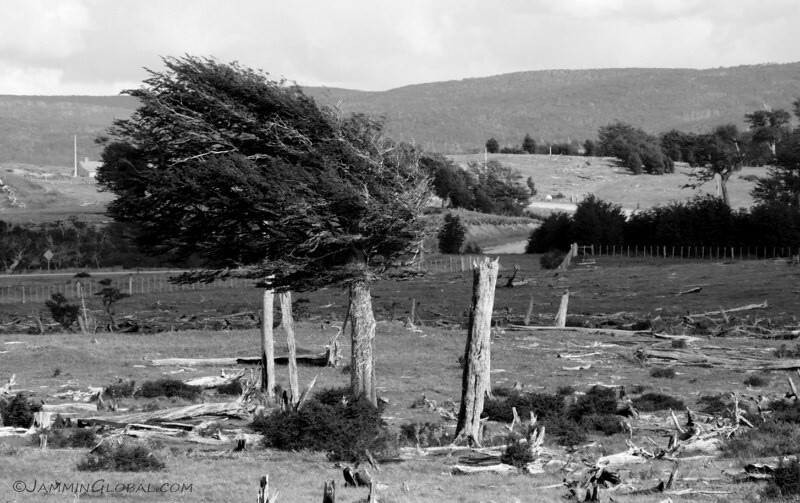 If there’s one place in the world where the winds are constant and strong, it’s here and I’m wondering why there aren’t more wind turbines. 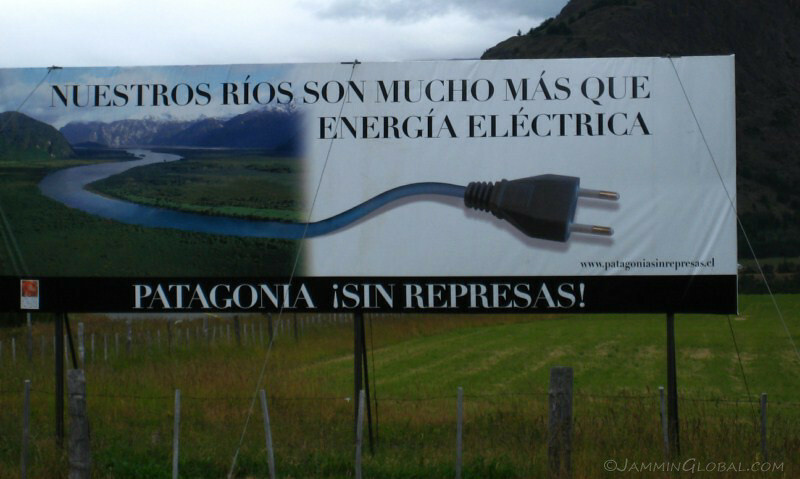 If the government really wants to harness energy from Patagonia to supply the north, let it be thru wind rather than hydro. 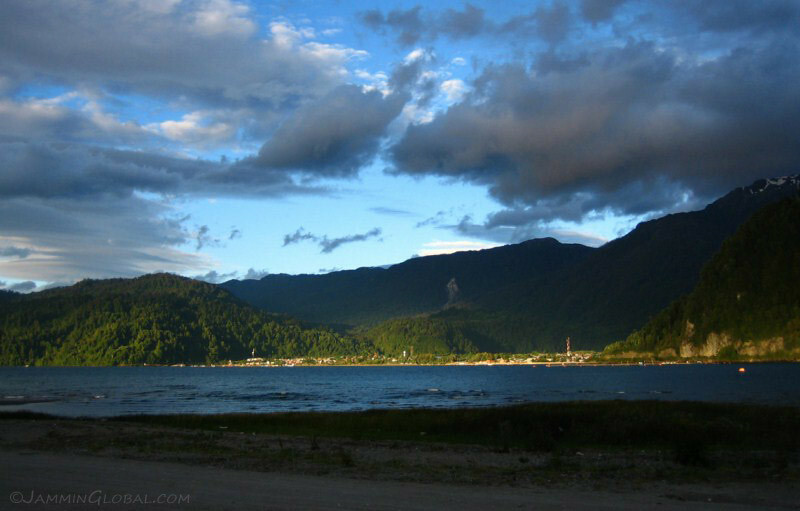 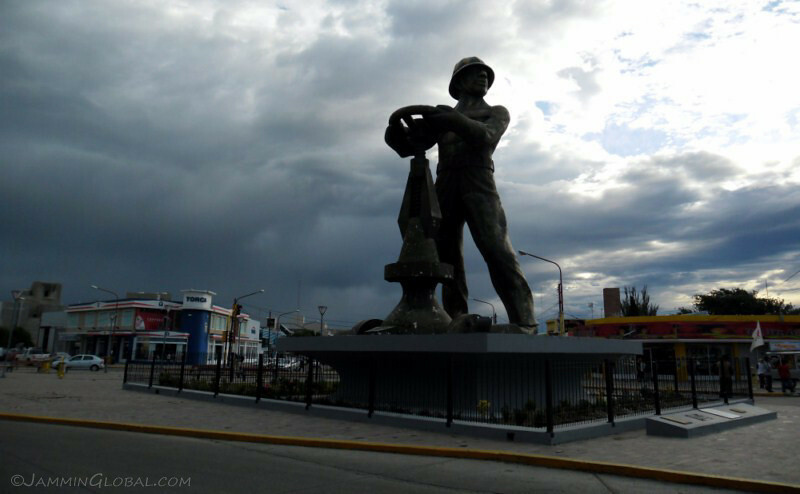 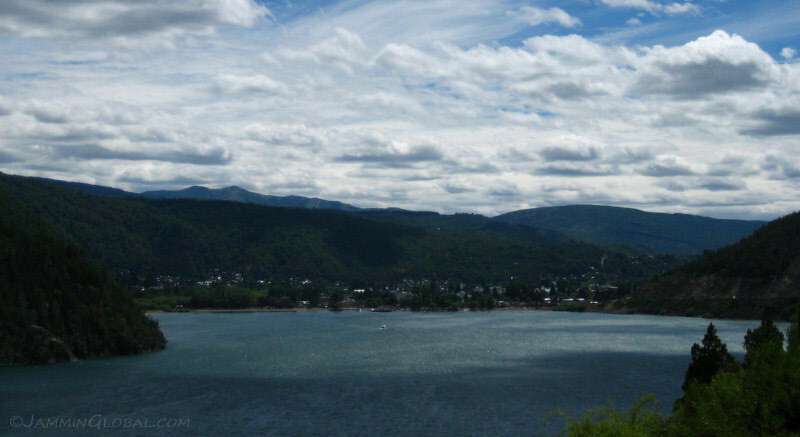 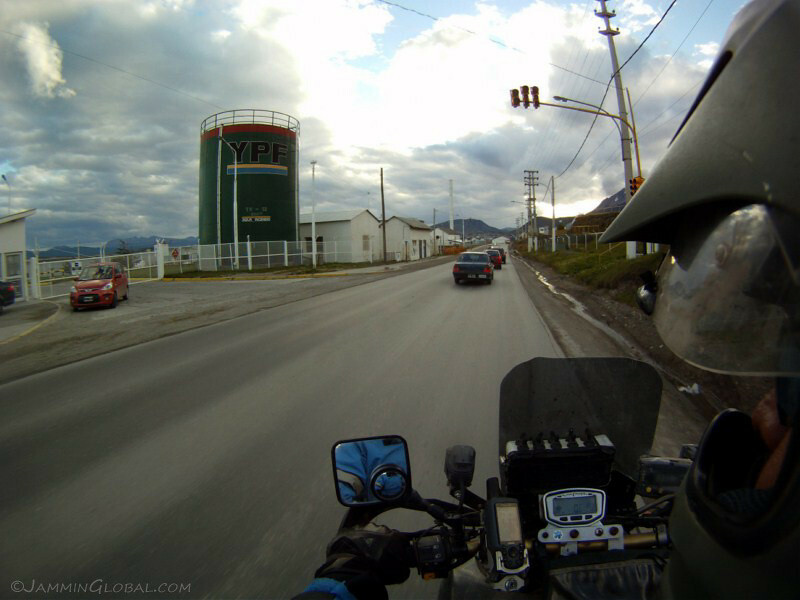 I fueled up and restocked my grocery supplies in the biggest city in this region, Coyhaique and then headed to the massive lake coming up. 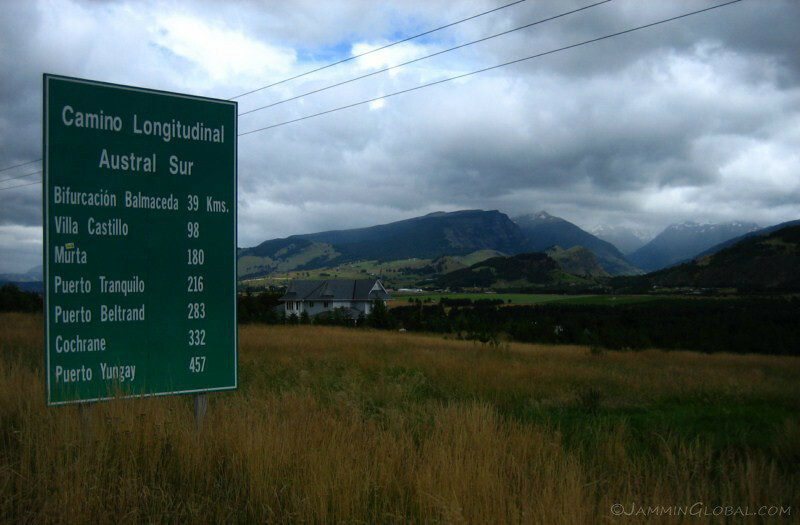 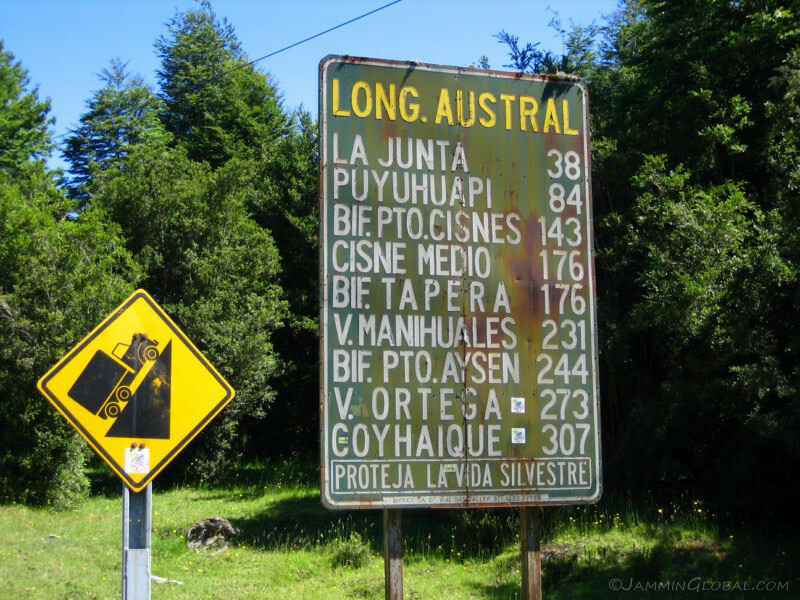 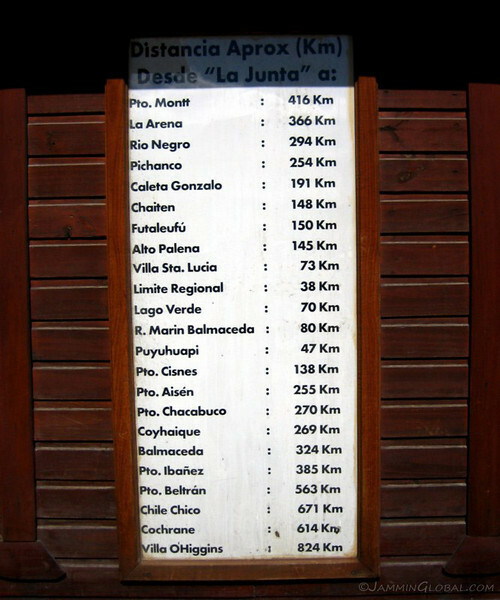 A sign board of the towns on the southern section of the Carretera Austral. 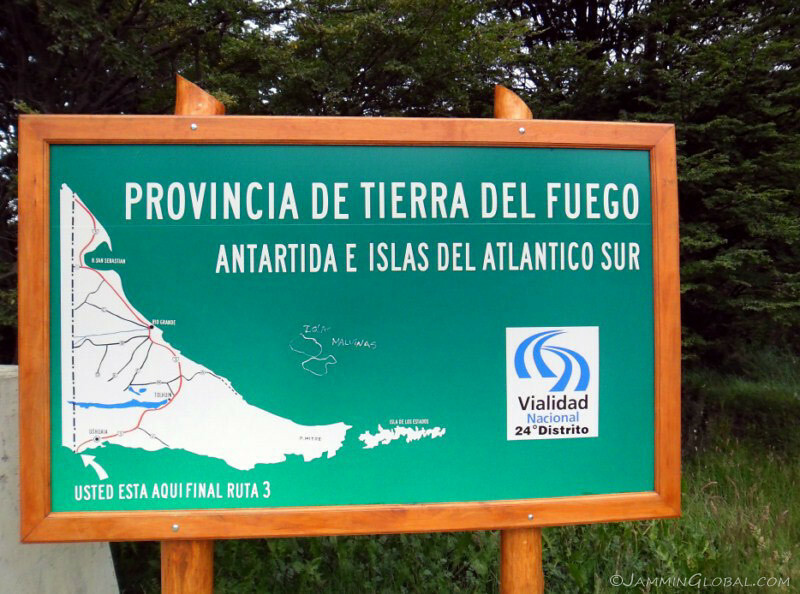 From Puerto Yungay, it’s another 100 kms (62 mi) to Villa O’Higgins. 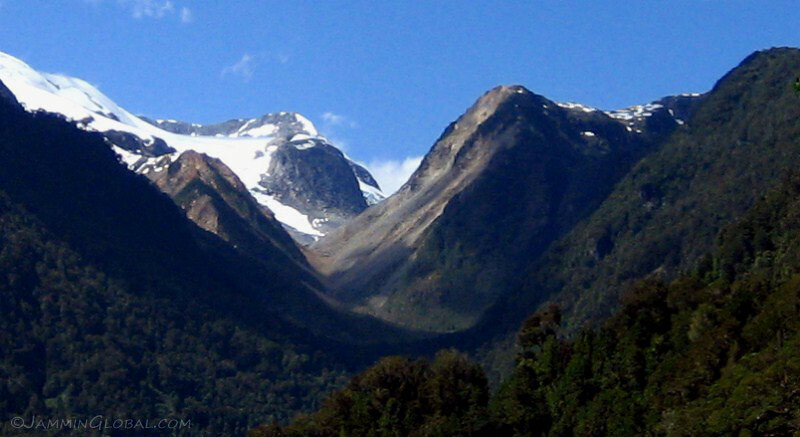 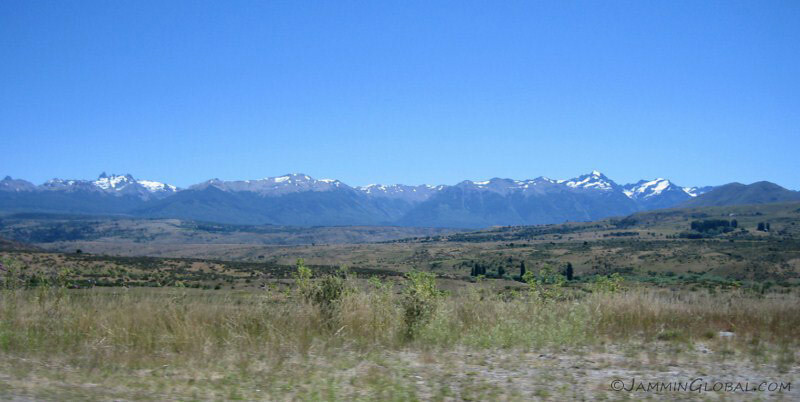 South of Coyhaique, I rode through this valley lined with jagged snow peaks. 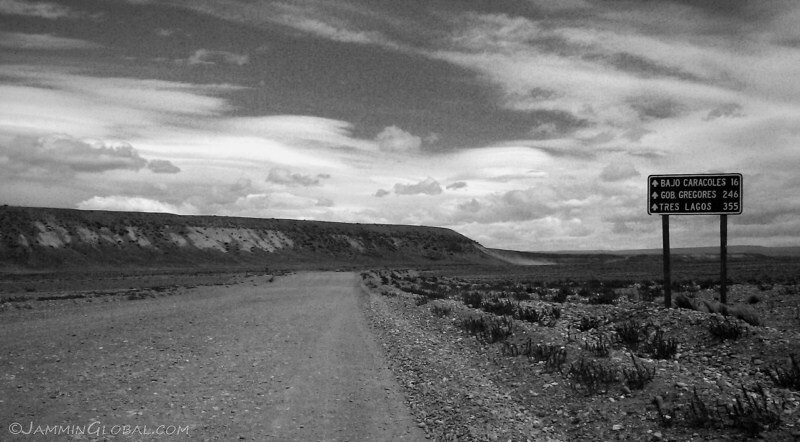 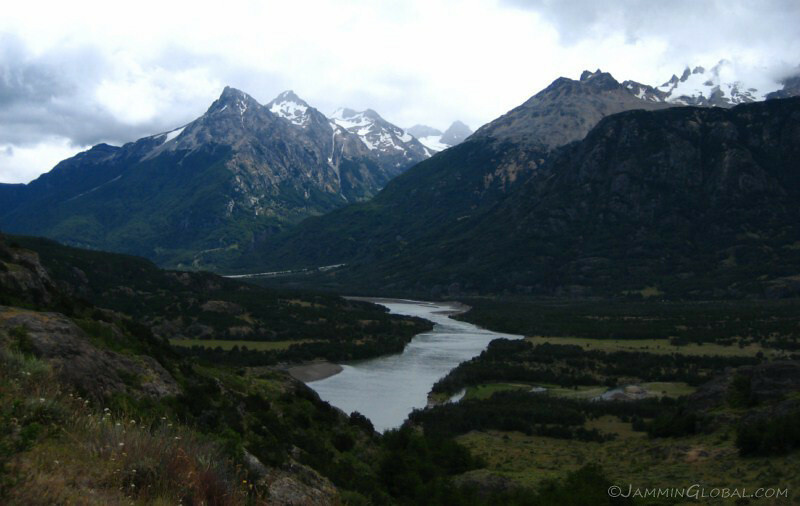 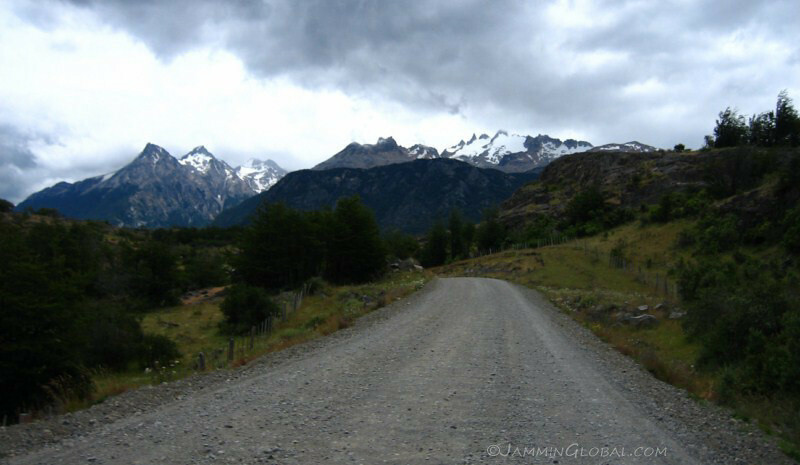 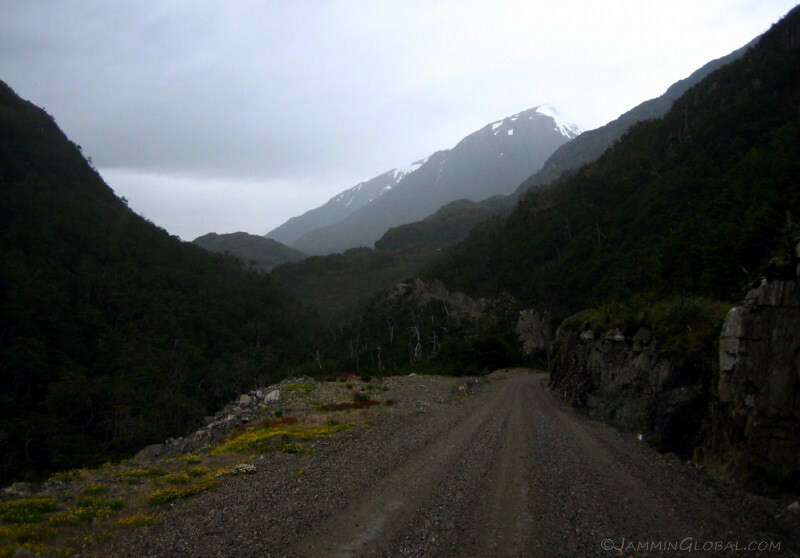 This was a classic image of Patagonia that I had before I got here and it’s just like it looks in the pictures, but of course, it’s a much grander feeling when you’re actually in this huge valley, devoid of much human activity, except this snaking, winding path. 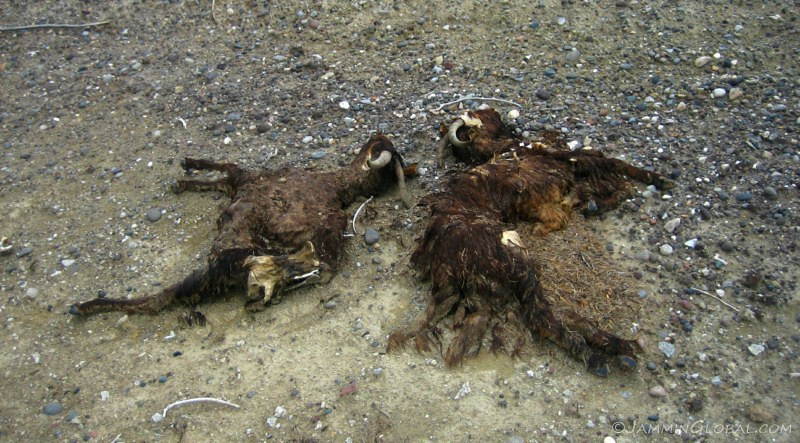 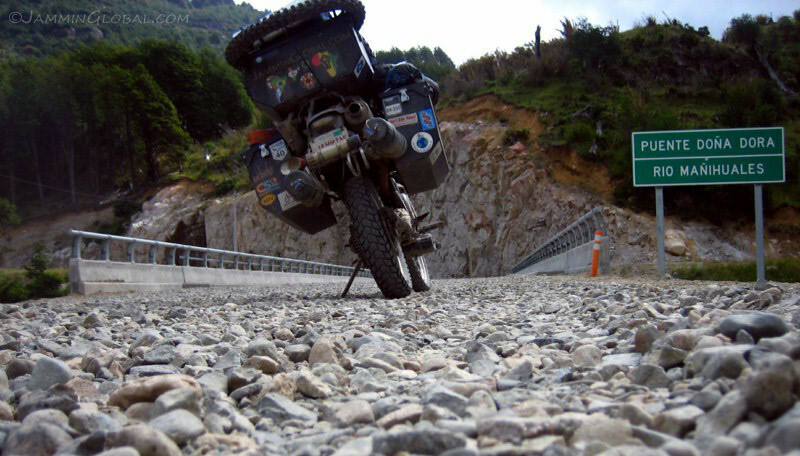 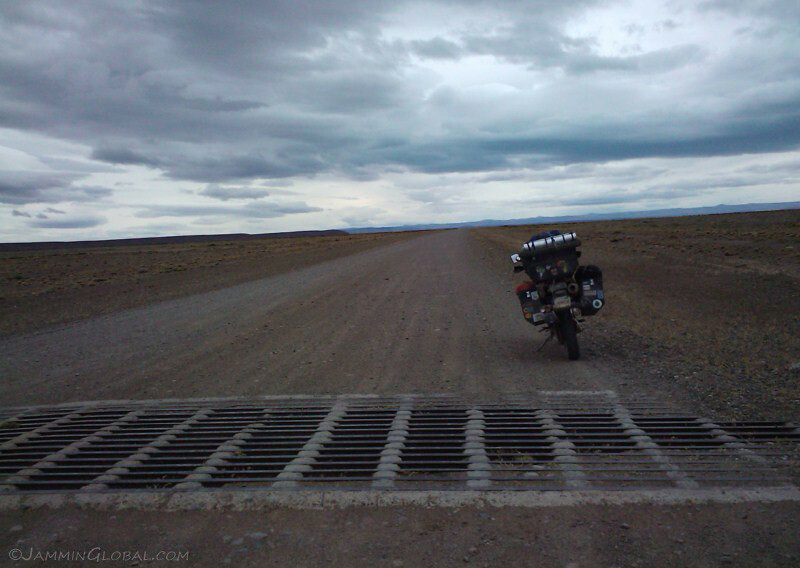 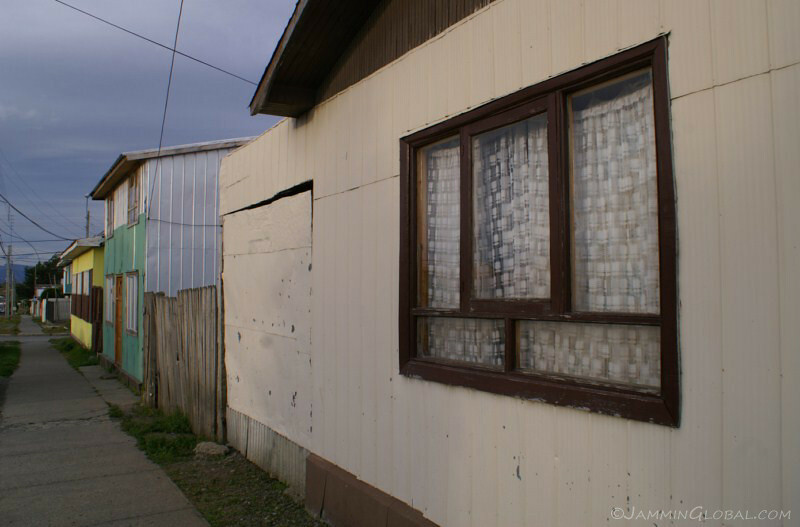 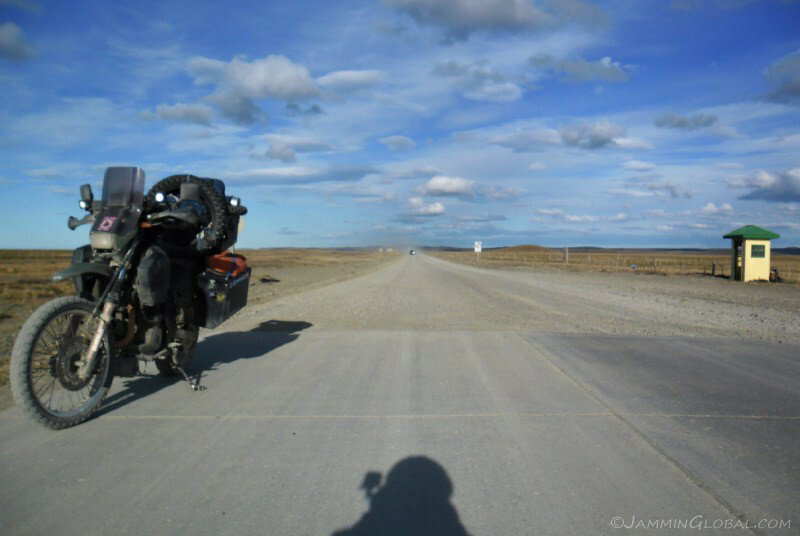 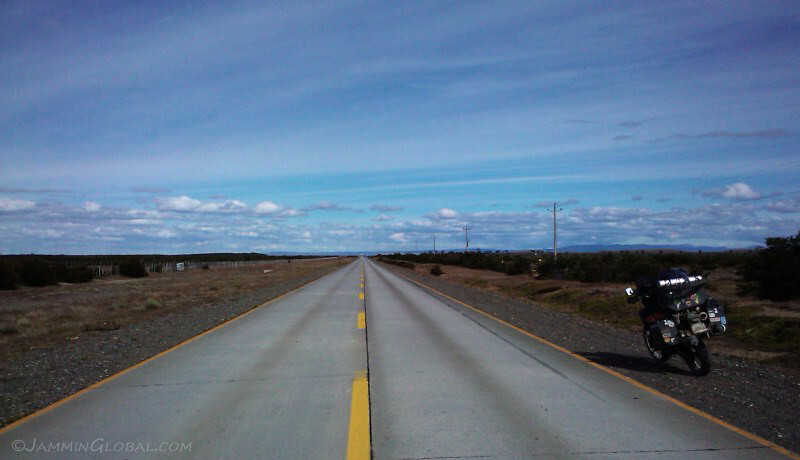 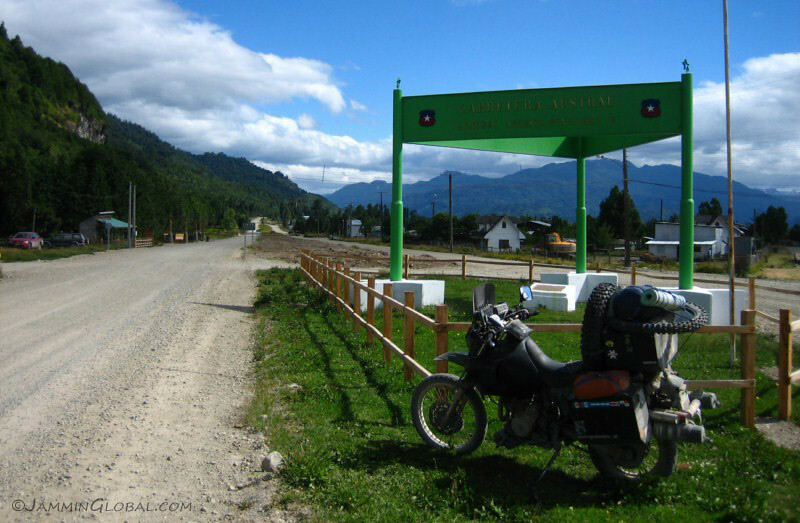 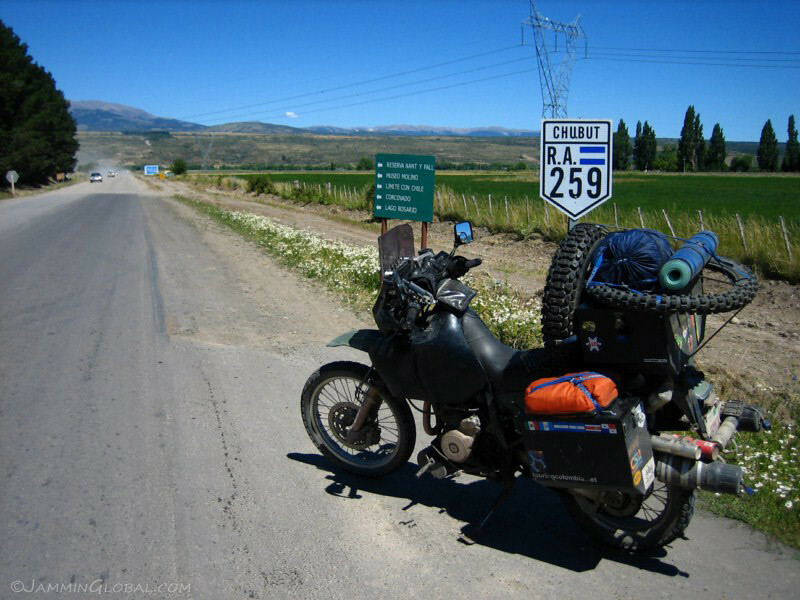 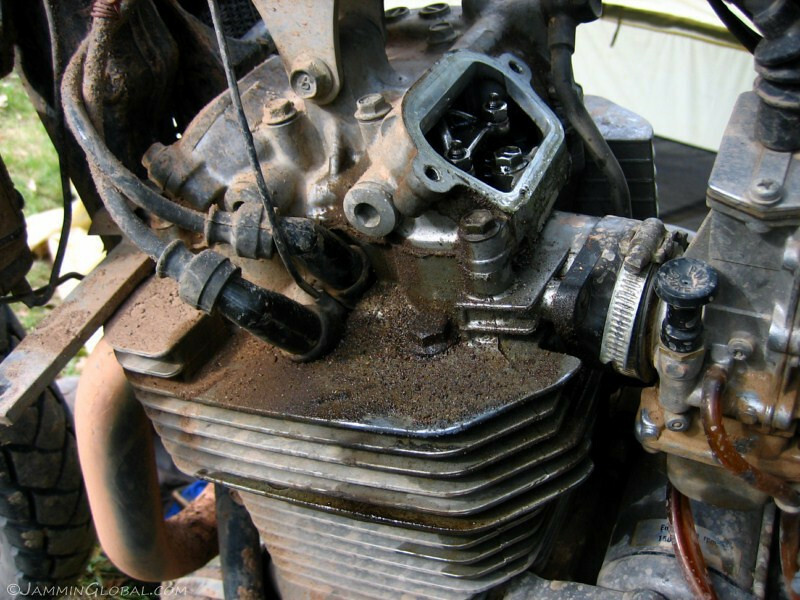 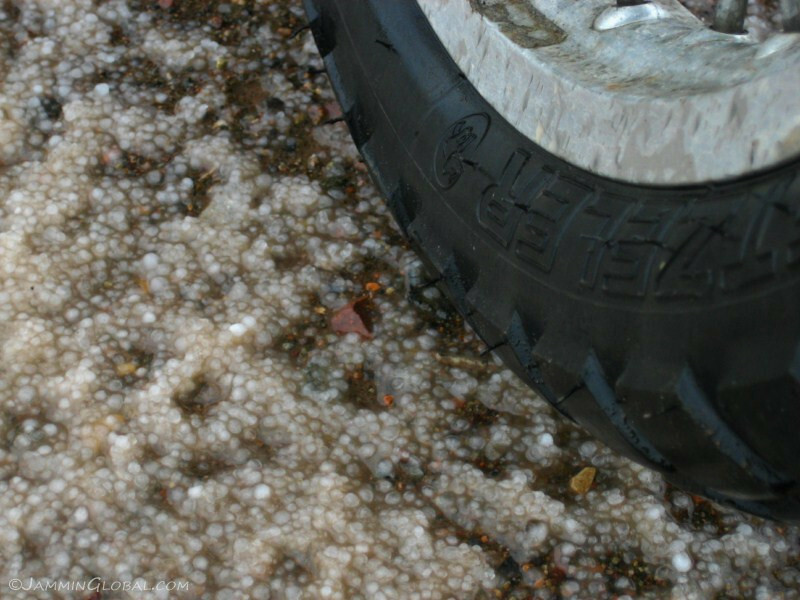 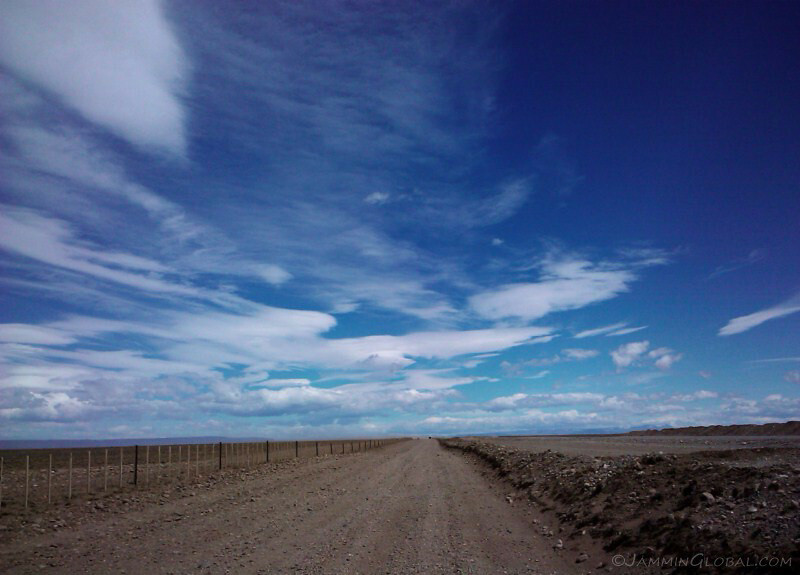 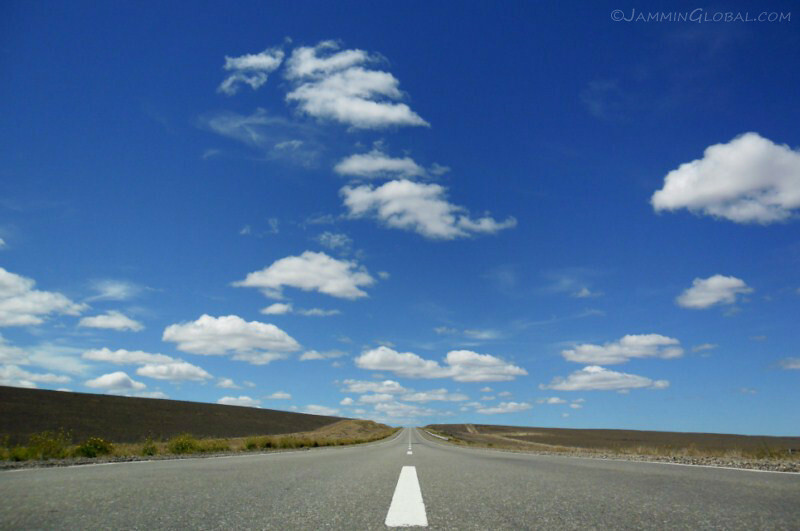 The pavement ended about 100 kms (62 mi) south of Coyhaique and it soon turned into washboard. 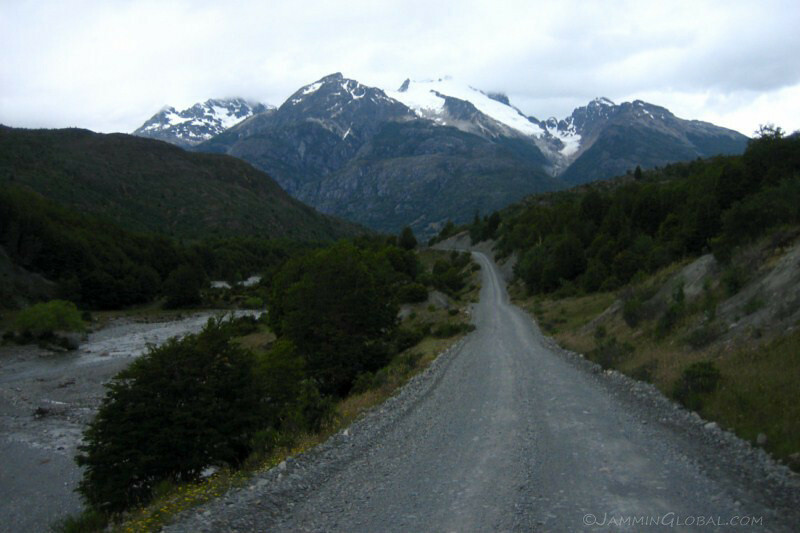 The route was climbing up the opposite side of this valley with the snow peaks coming and going into view. 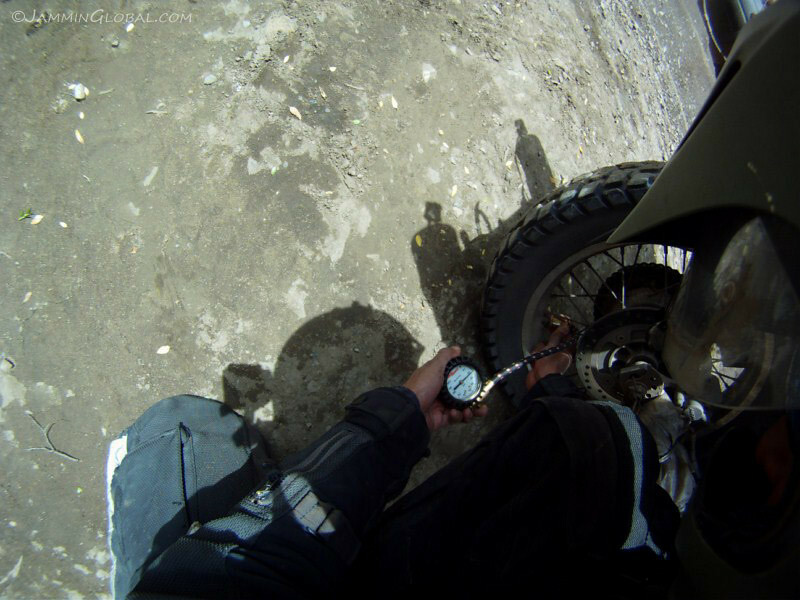 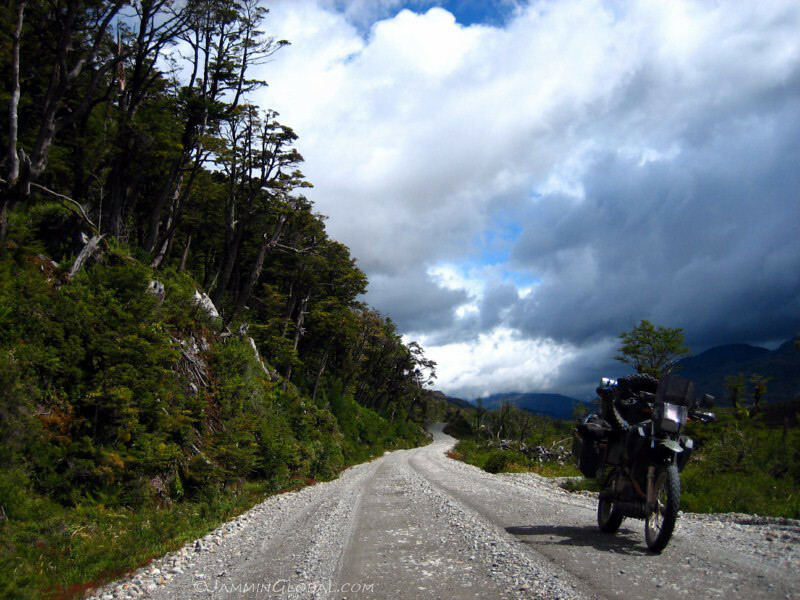 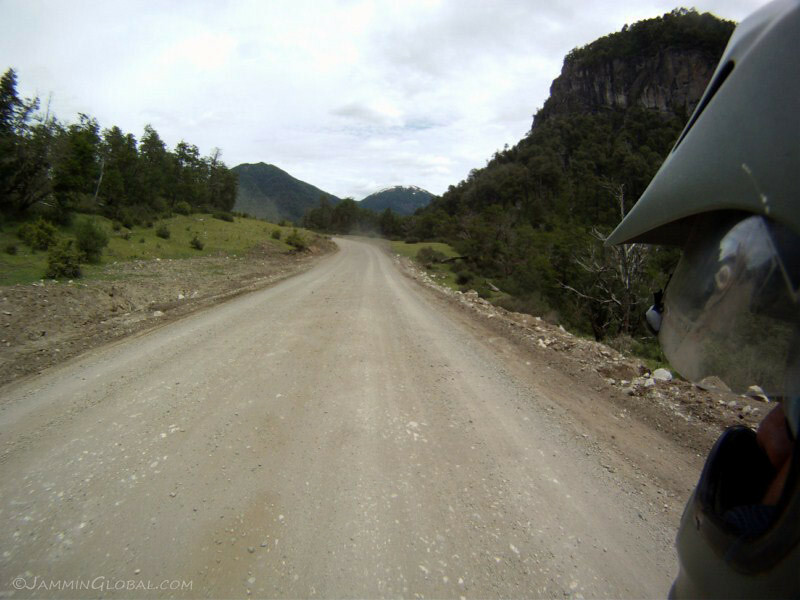 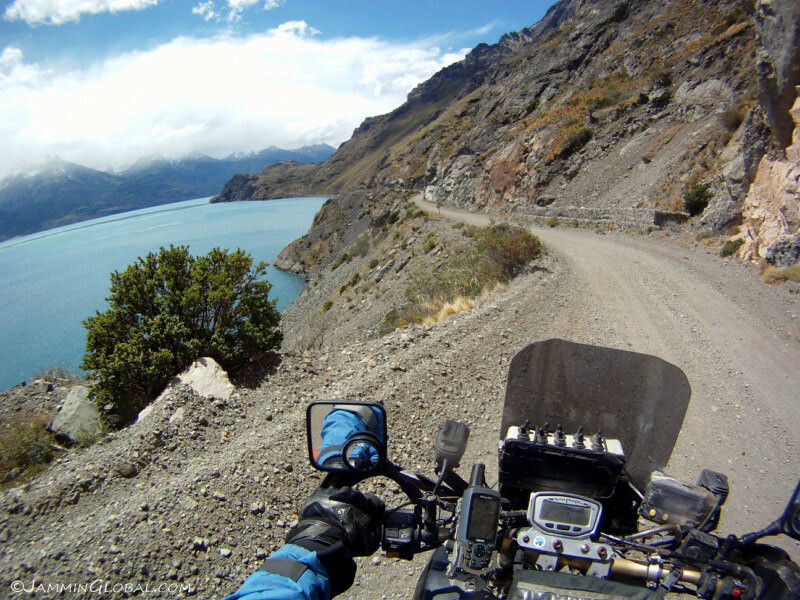 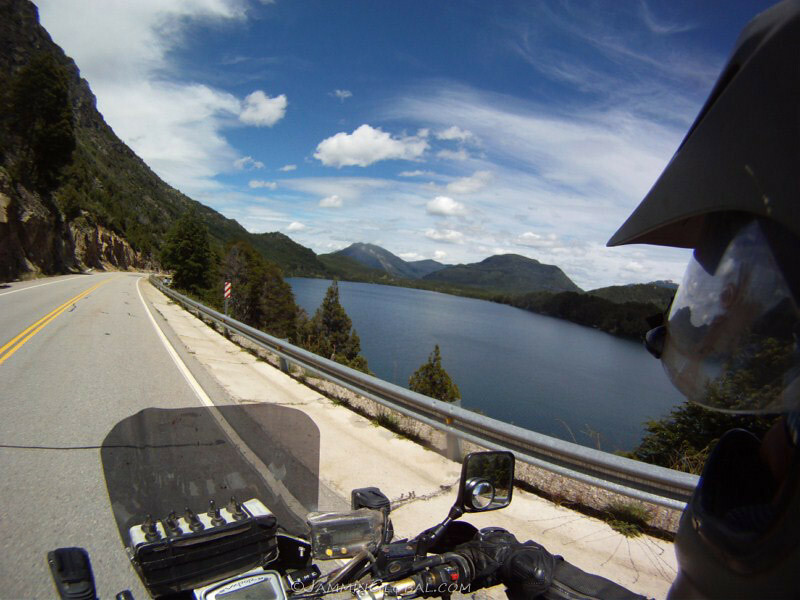 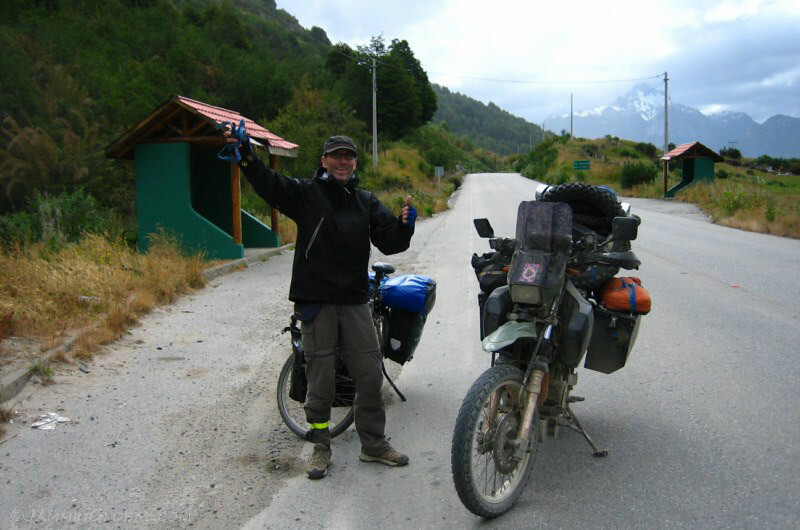 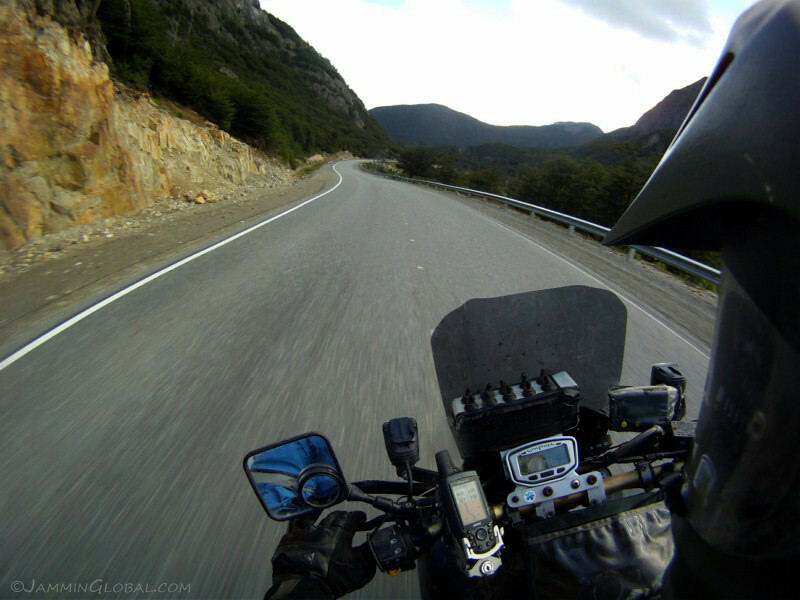 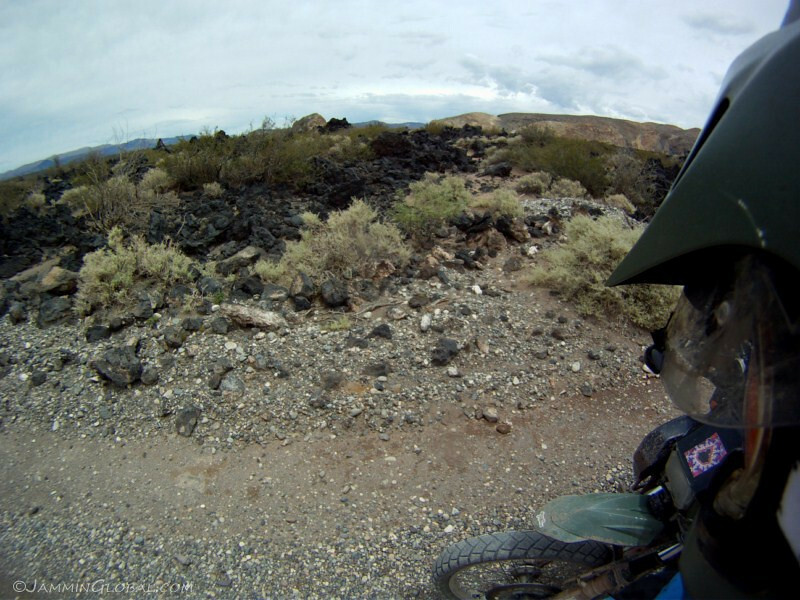 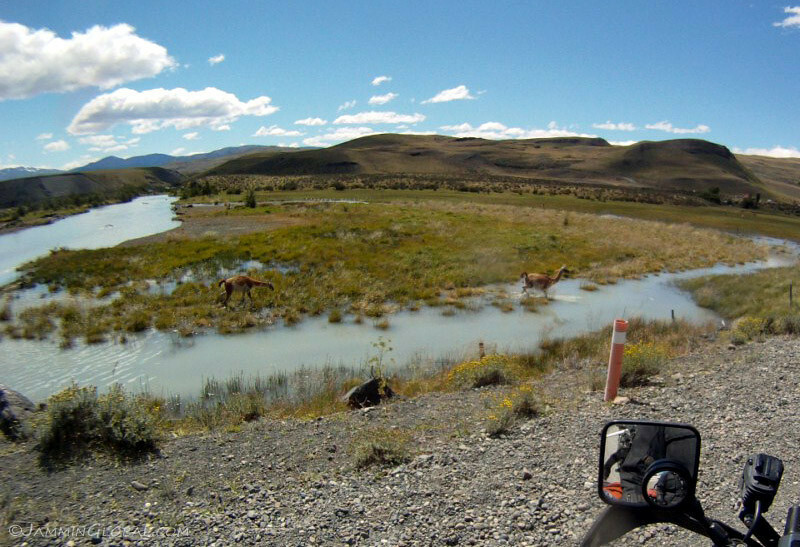 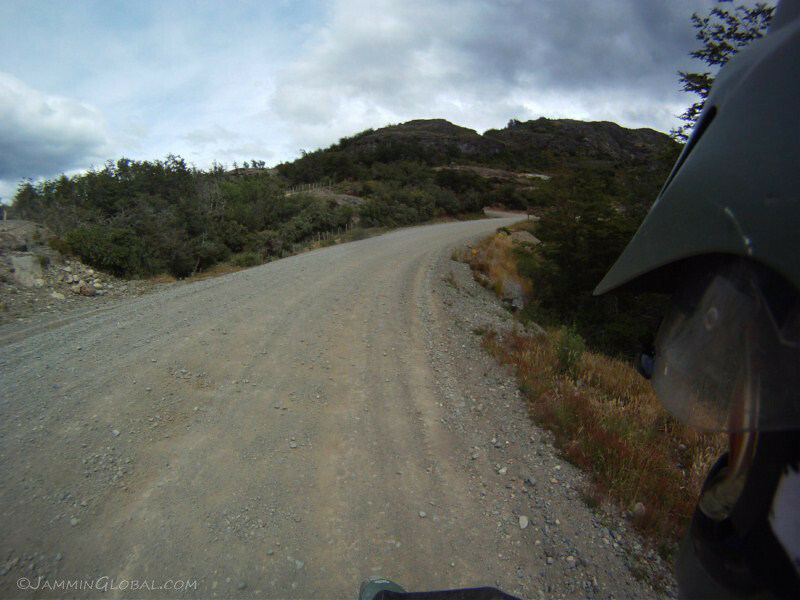 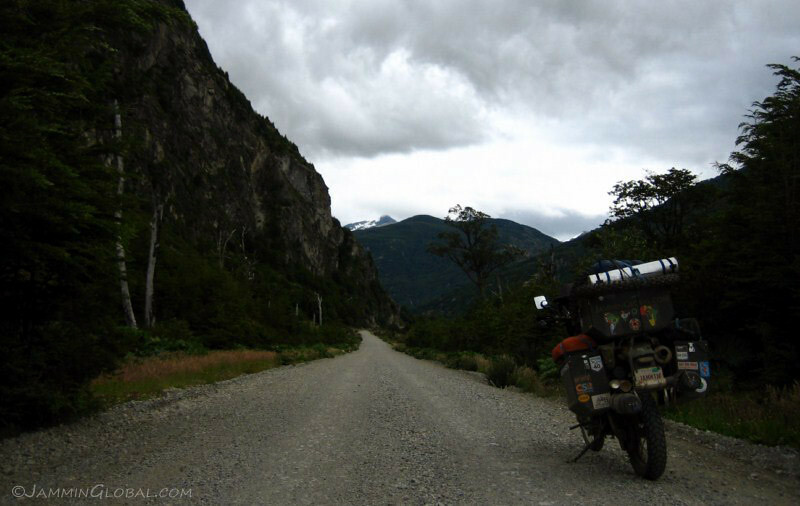 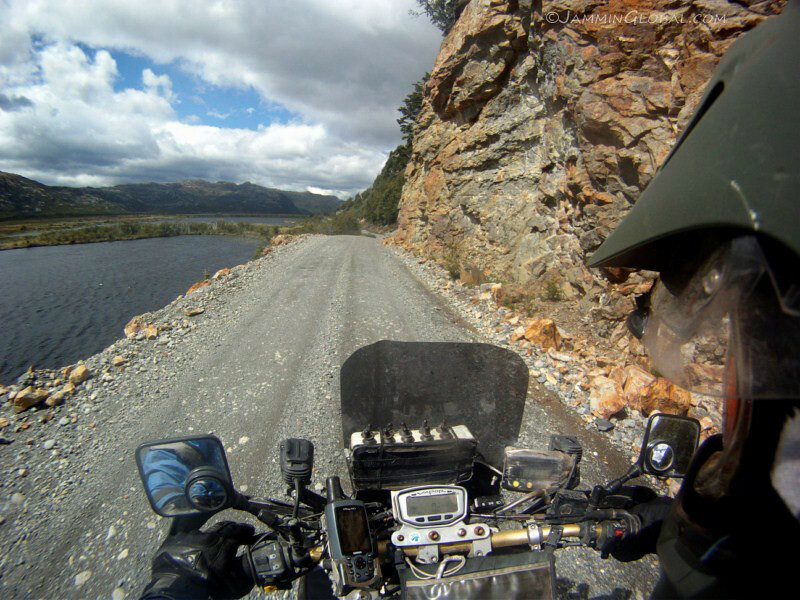 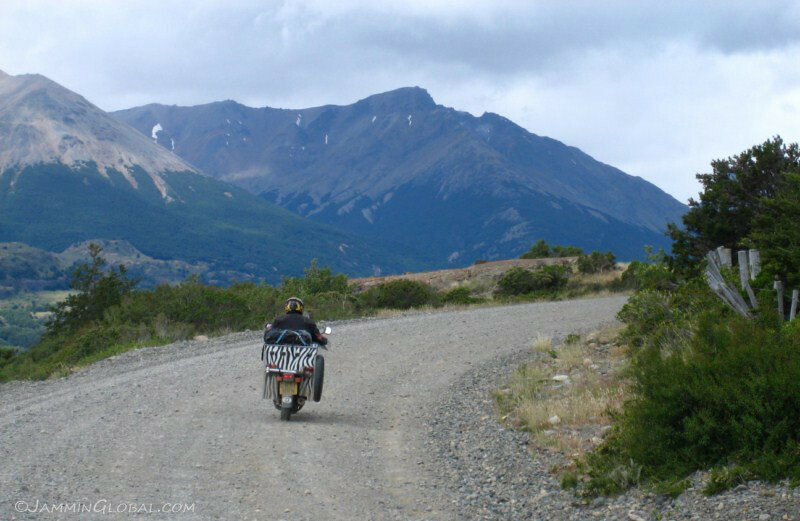 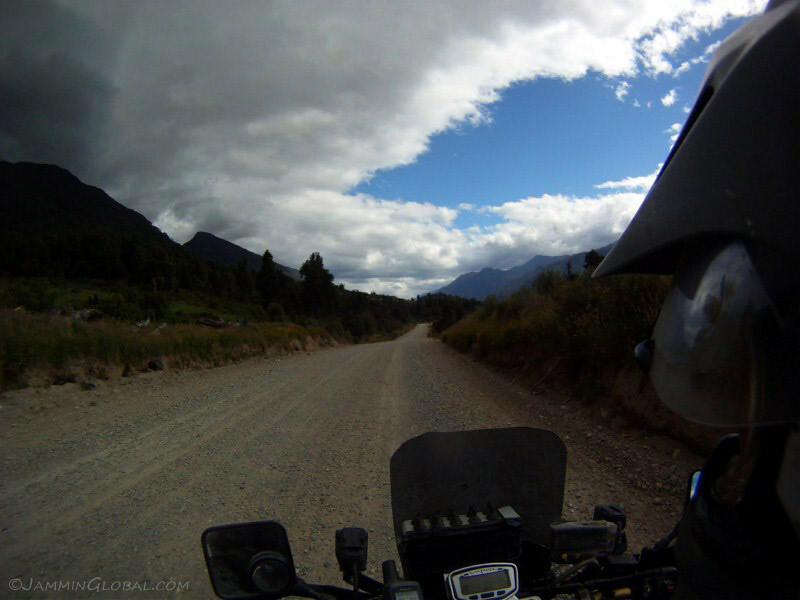 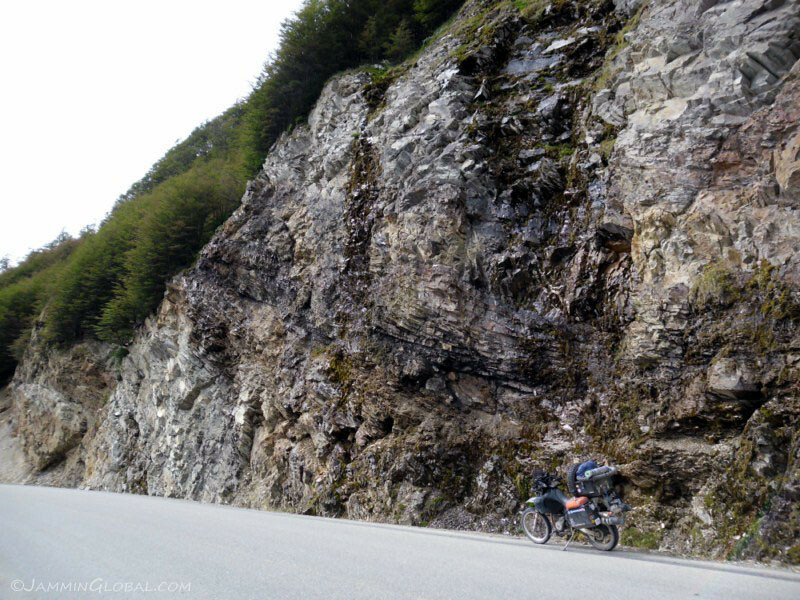 Nice to be back on the dirt and on the pegs after the central paved section of the Carretera Austral. 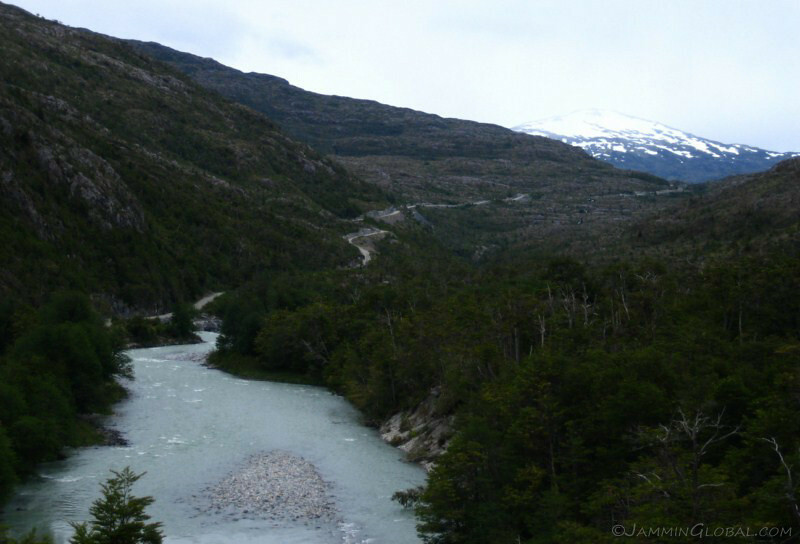 Rivers flowing down from glaciers and ice caps up in the mountains. 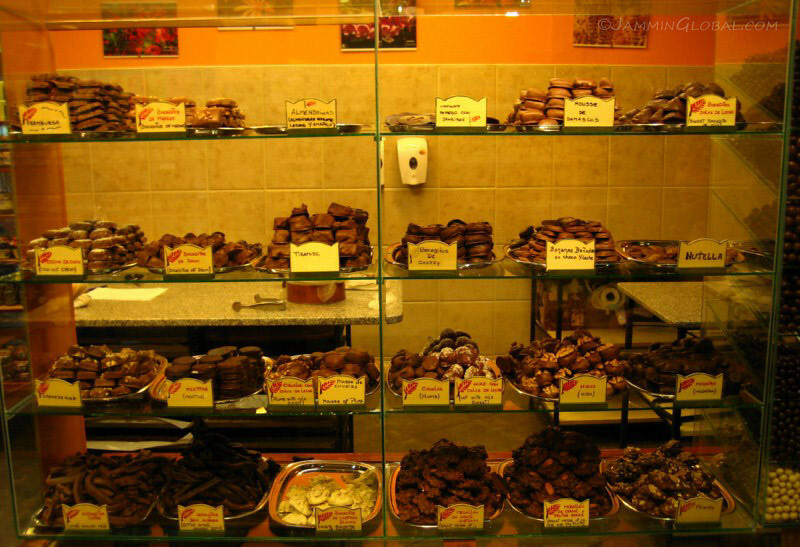 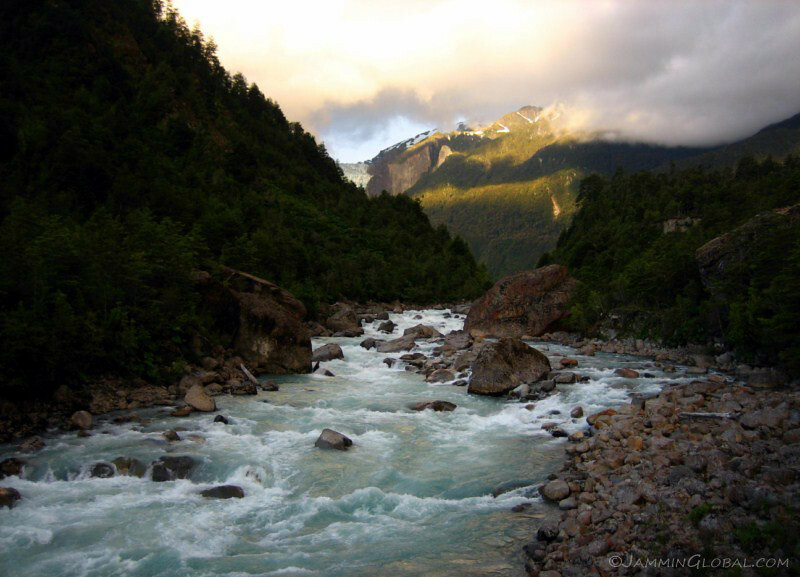 Is it worth losing these kind of places in the name of energy from dams for continued economic growth? 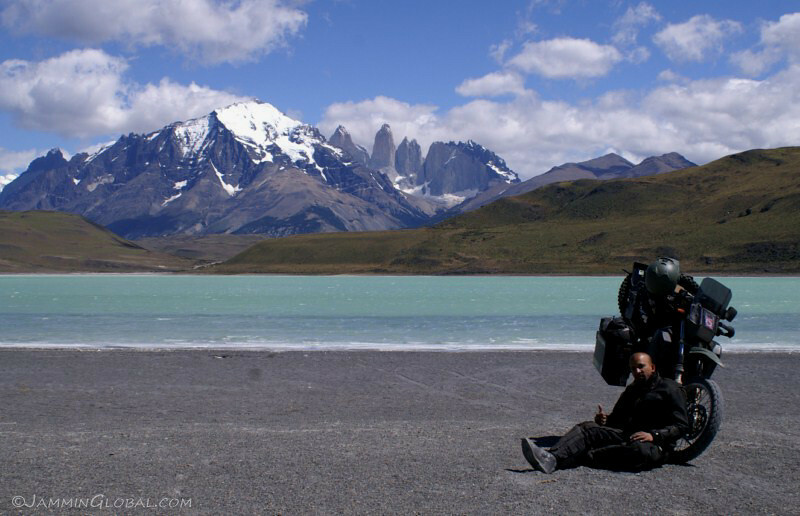 I came around a corner and found these blokes from New Zealand taking a break. 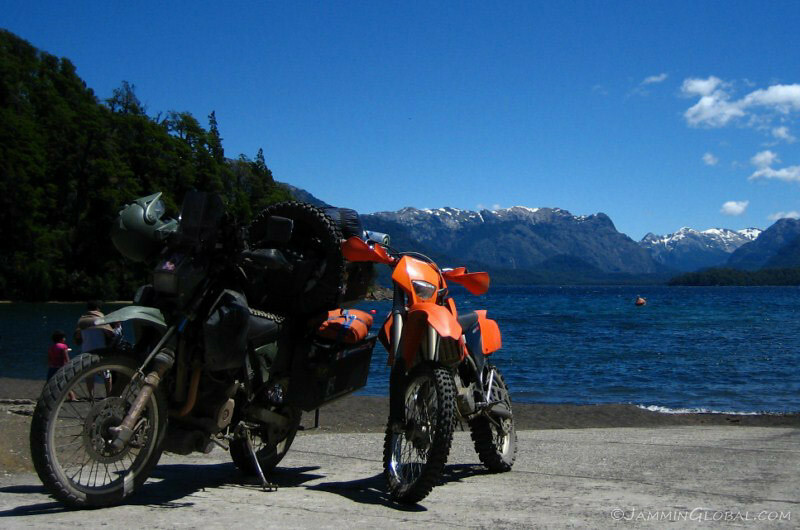 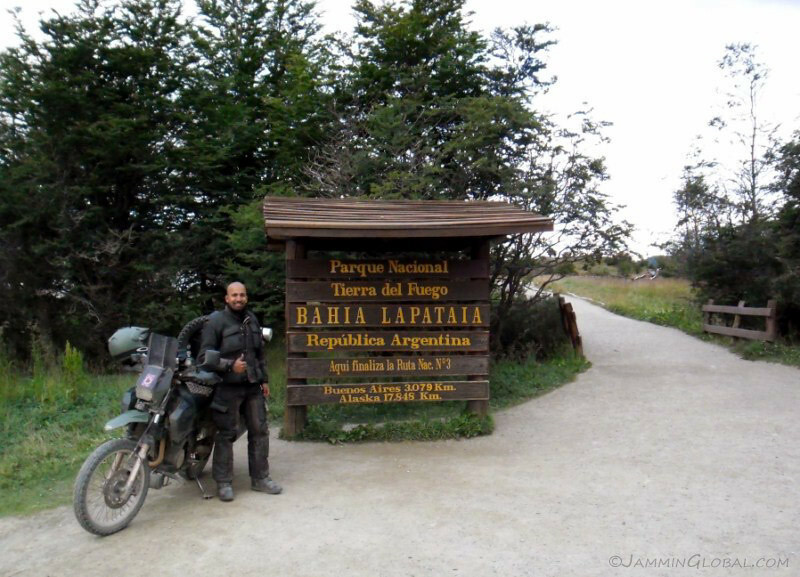 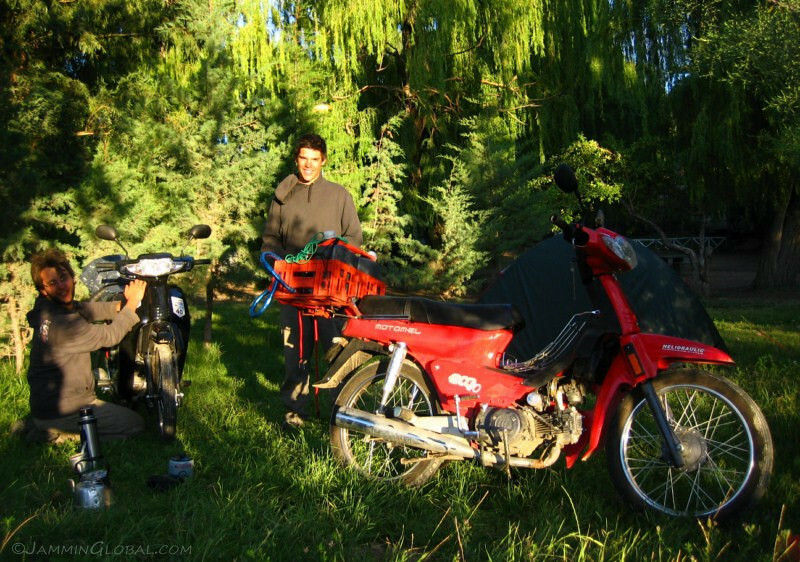 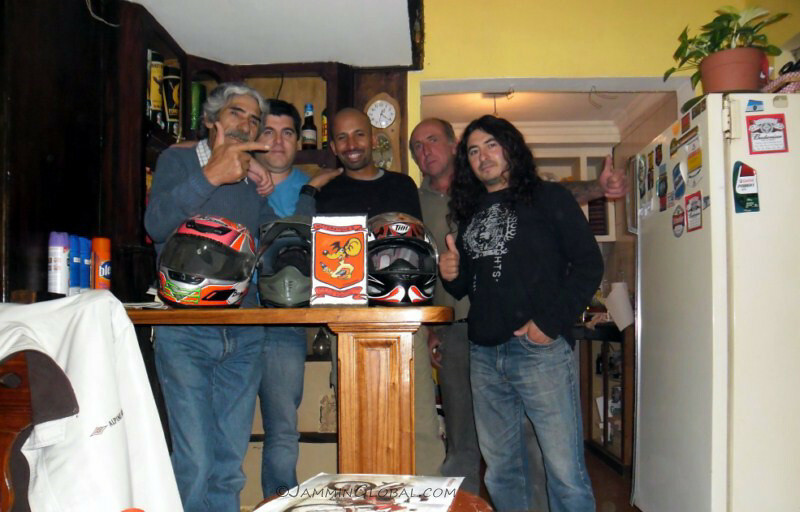 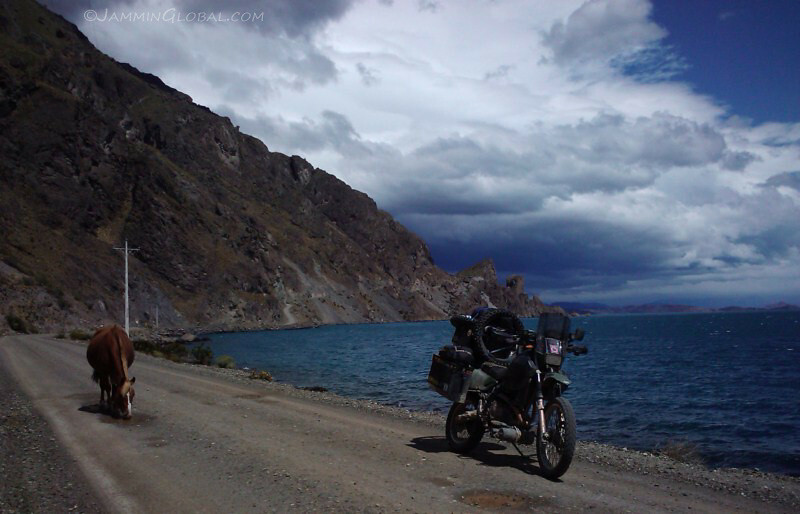 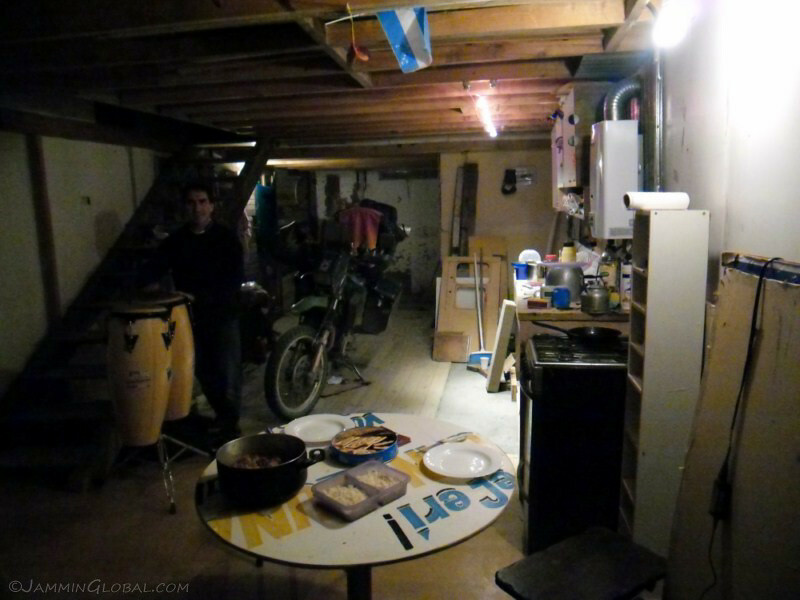 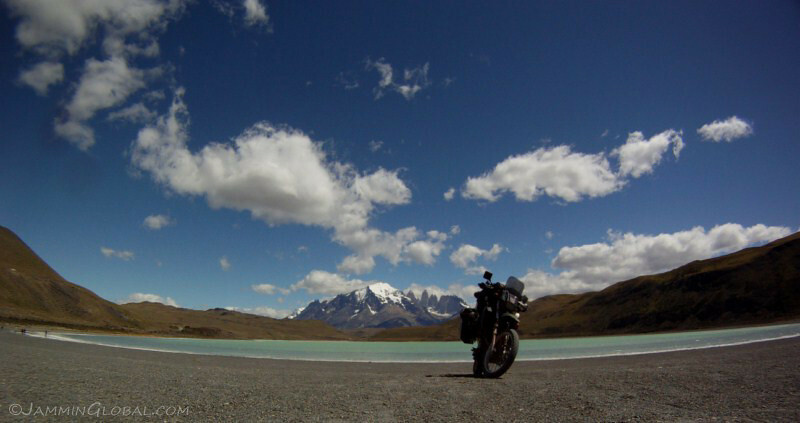 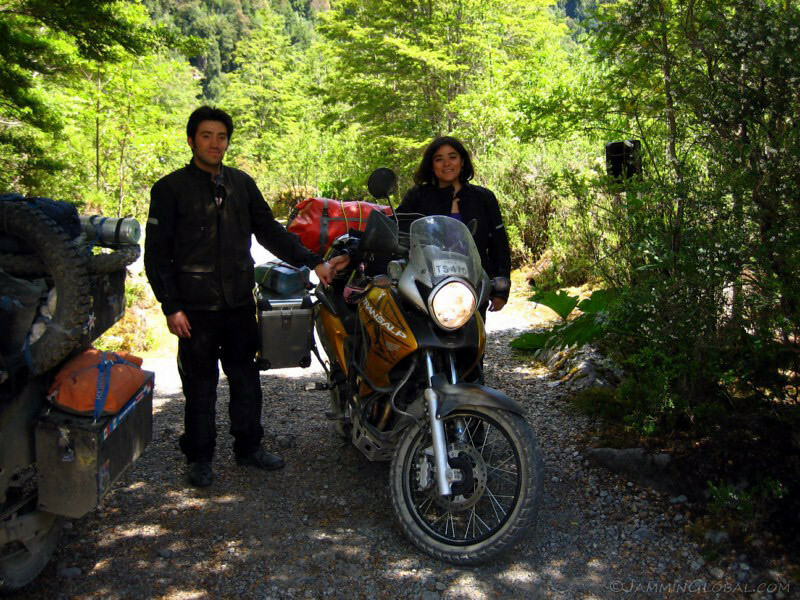 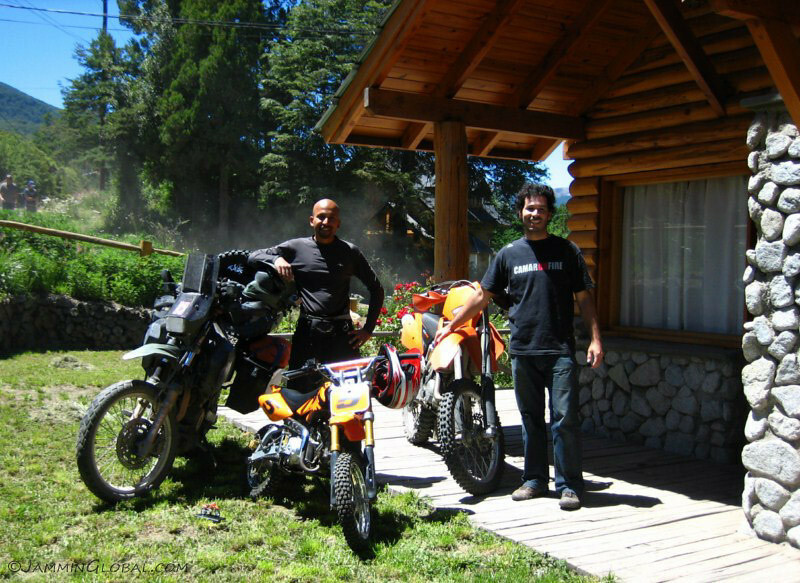 They flew into Los Angeles, bought these used DR650s and set off on a 6 month ride around Latin America and found buyers for the bikes in Buenos Aires. 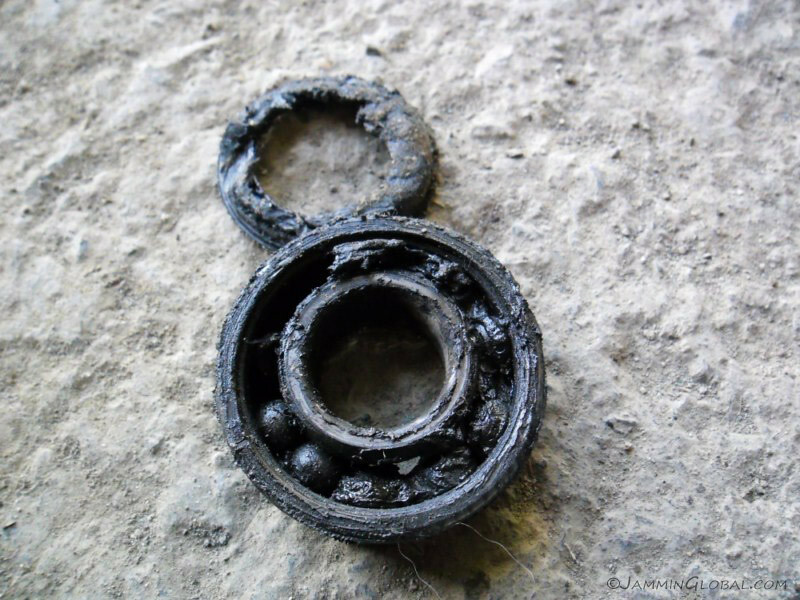 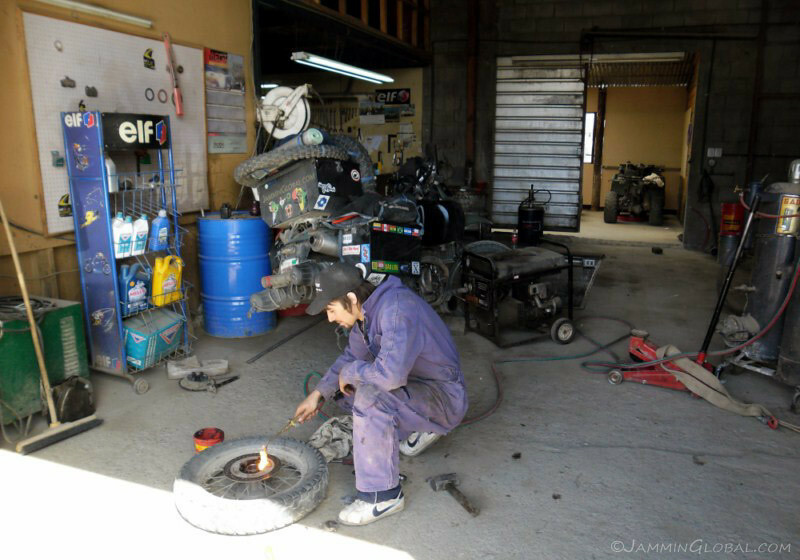 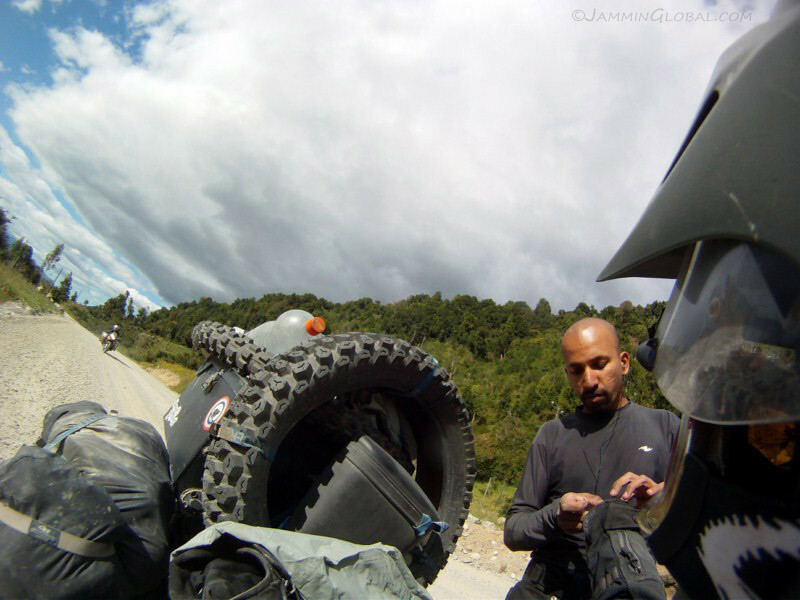 They hadn’t planned too much for spare parts and their tires were bald and one guy’s rear sprocket was way past its usable life. 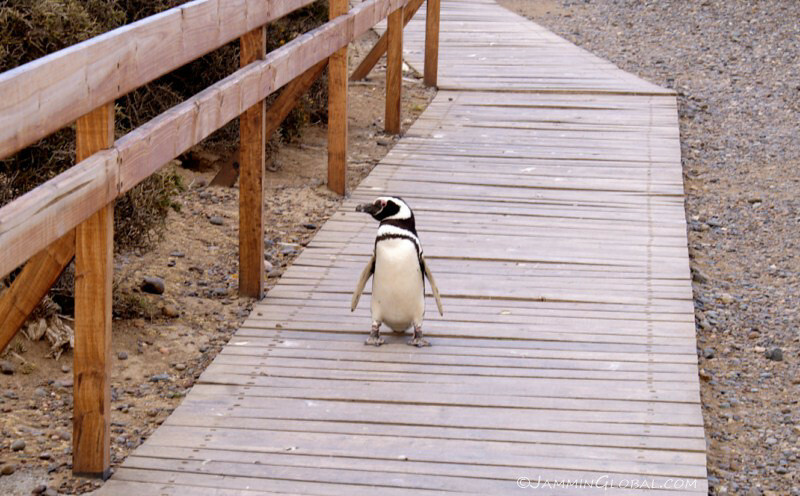 I told him to watch the down-shifting. 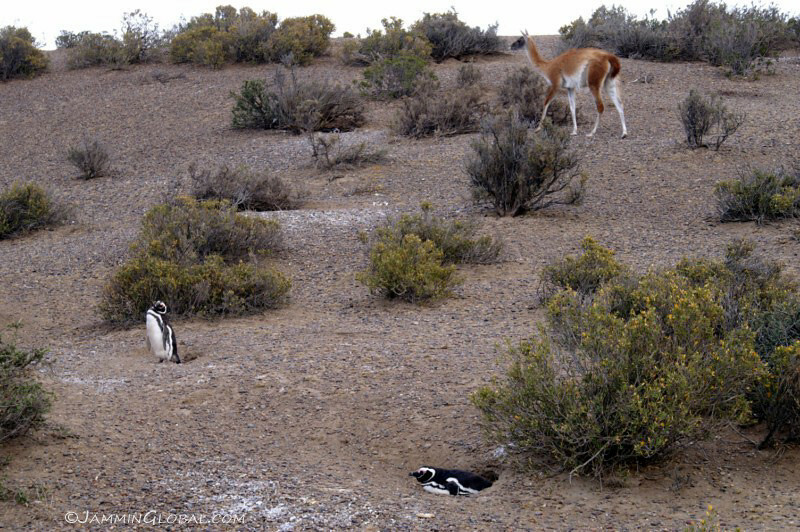 They were loving all the things I did to sanDRina and were happy to see a well-setup DR in the wild. 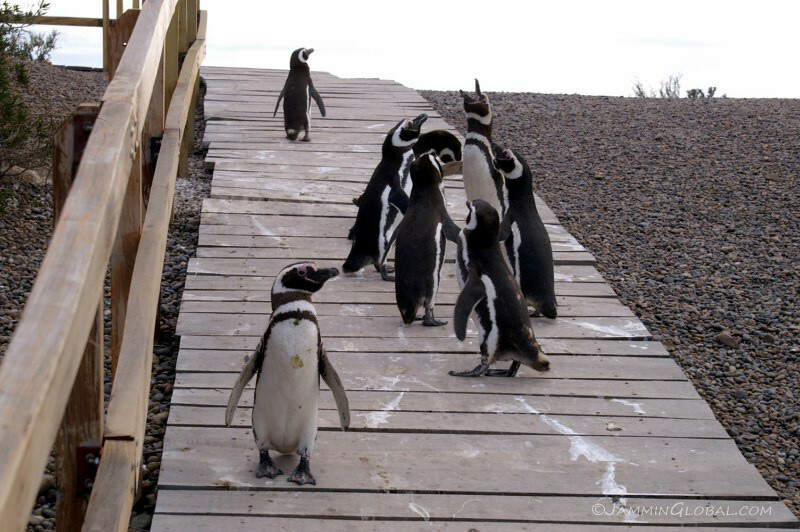 And of course, they asked what all the switches were for. 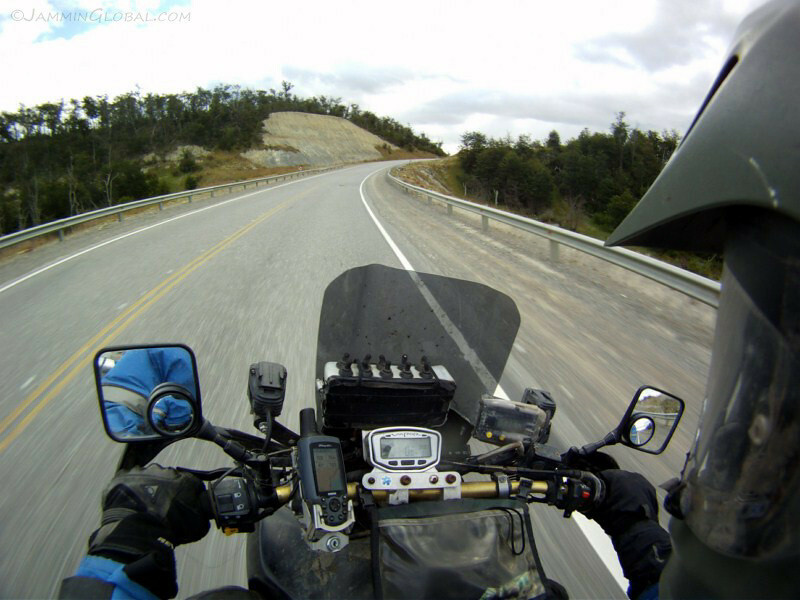 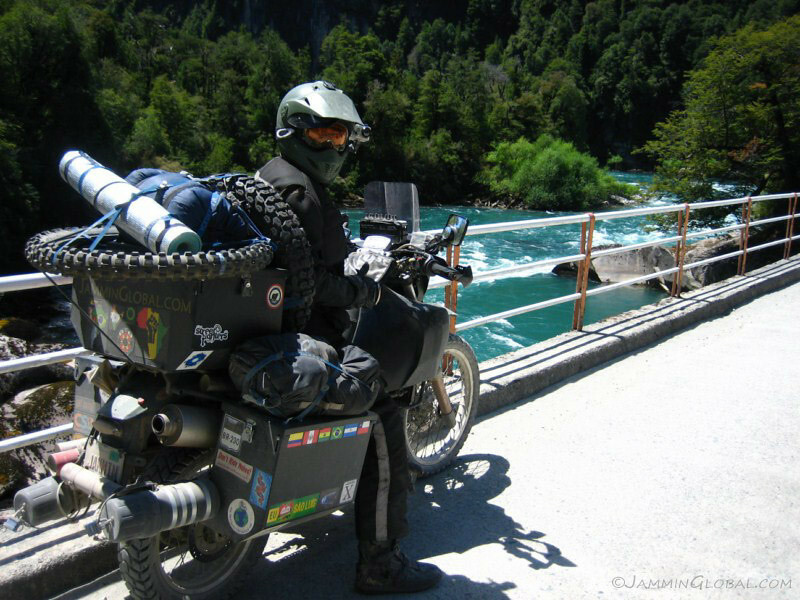 Coming up behind them was this Brit on a BMW R100GS with a DR front end. 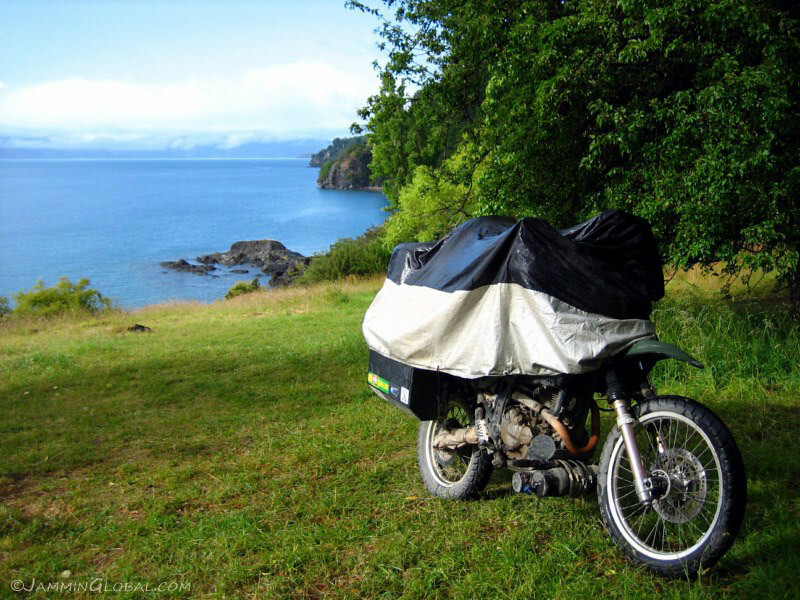 A proper Franken-bike. 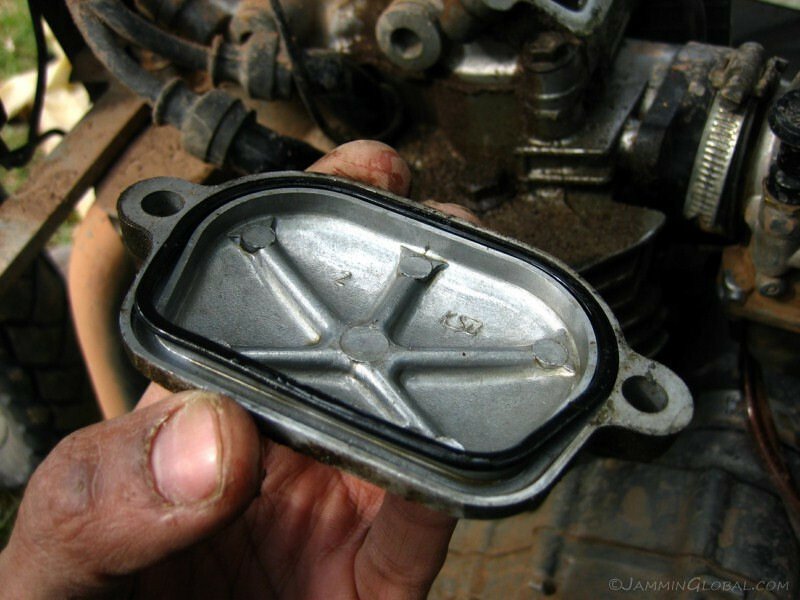 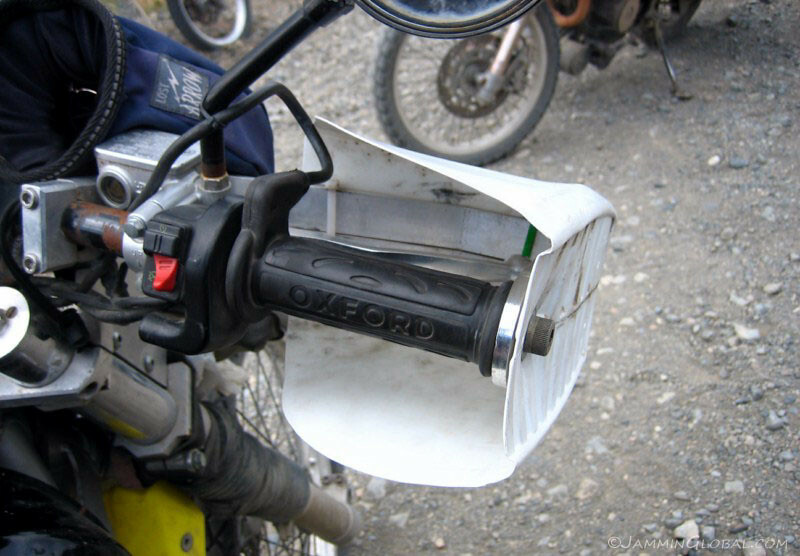 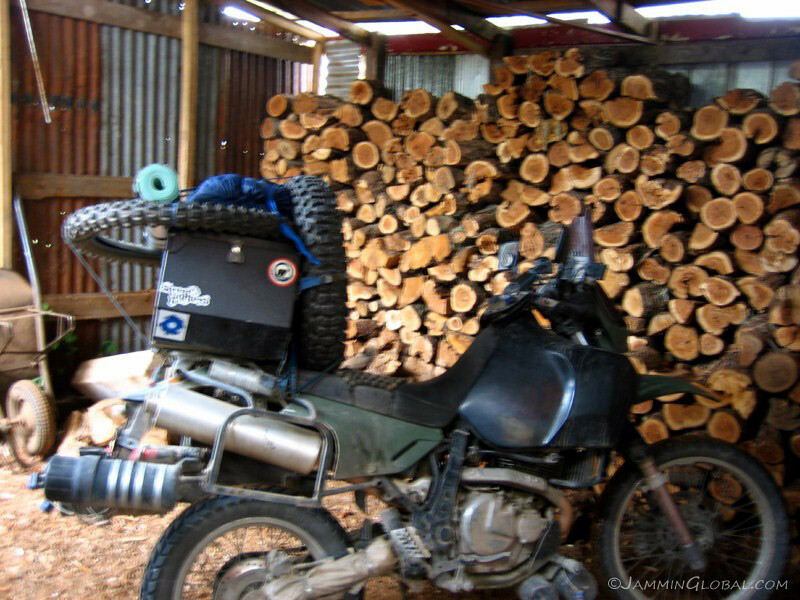 I admired all his self-fabrication and envied his wind guards that he cut from oil containers. 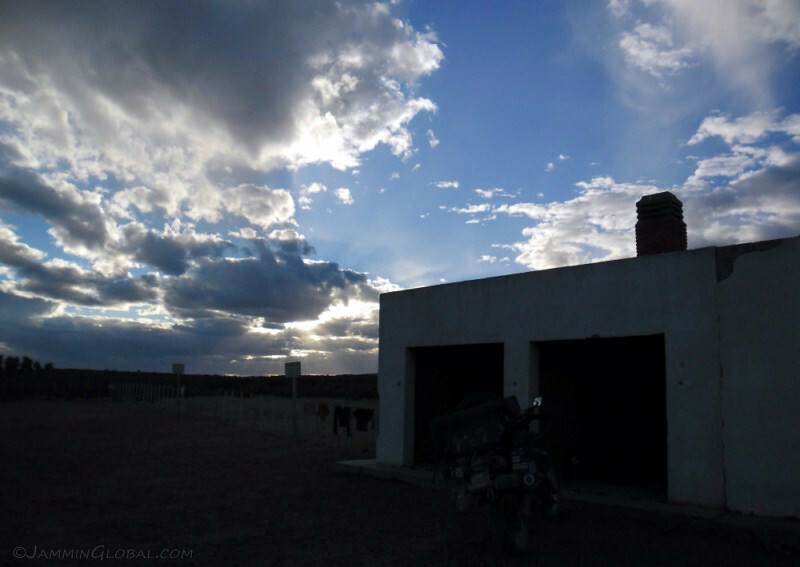 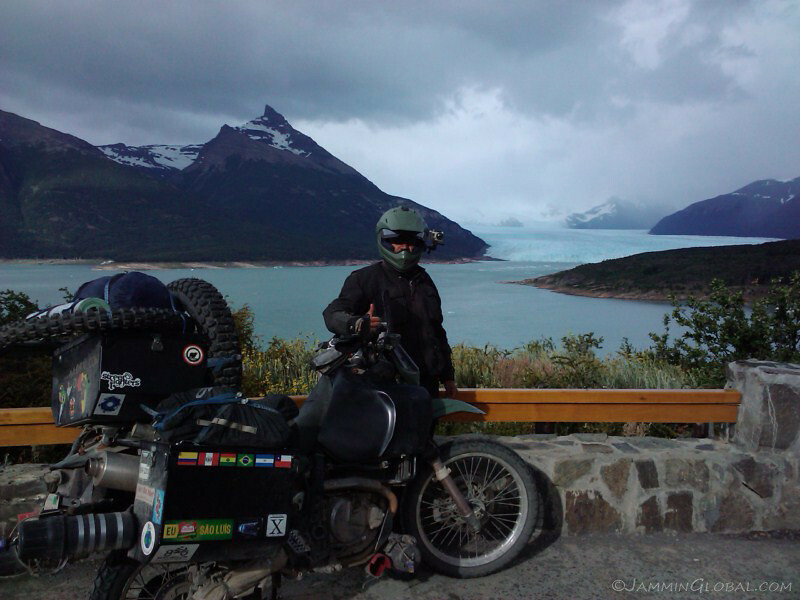 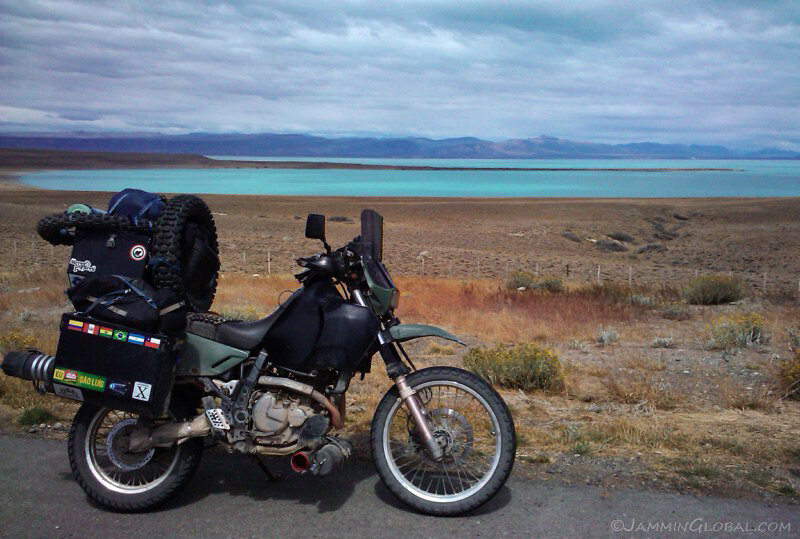 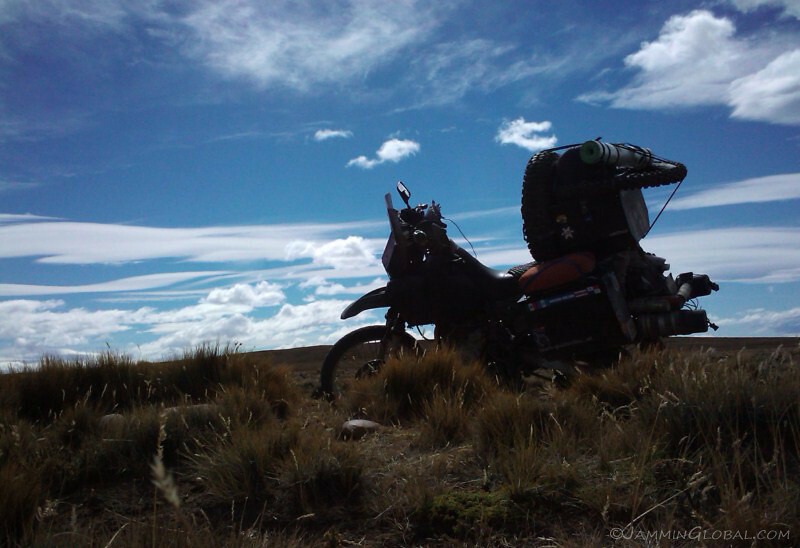 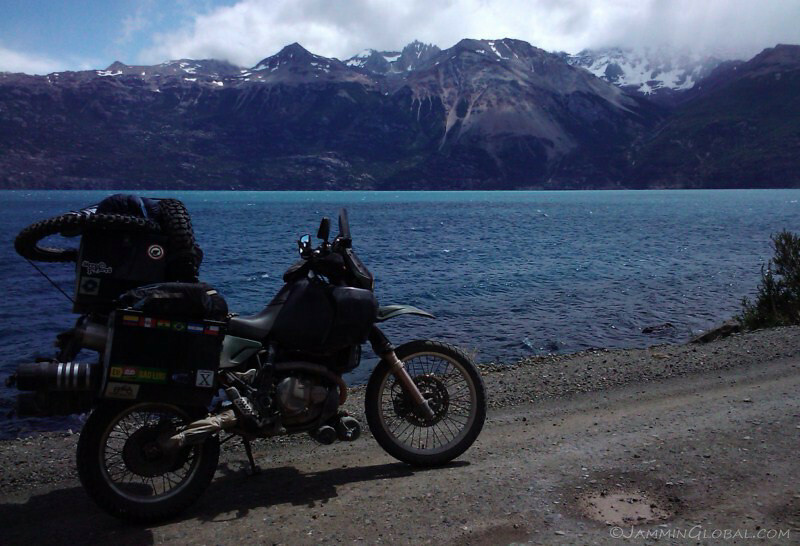 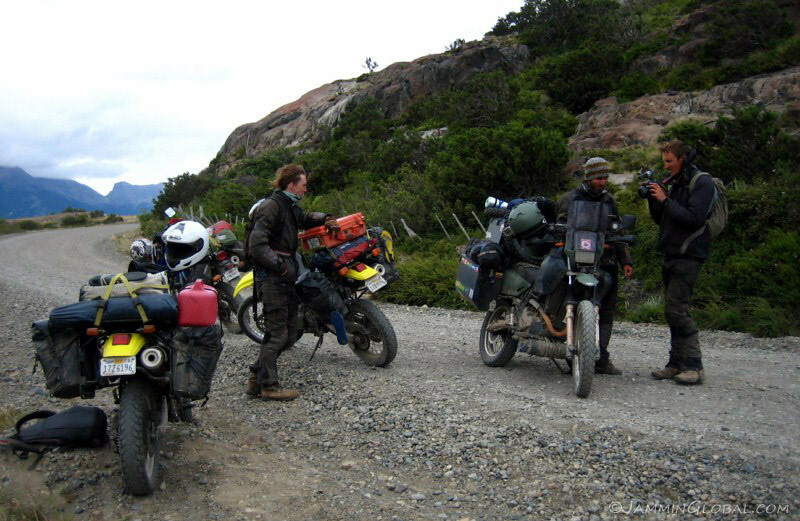 So, in the middle of Patagonia, there was a bike meeting of 4 1/2 DR650s and a half of a Beemer. 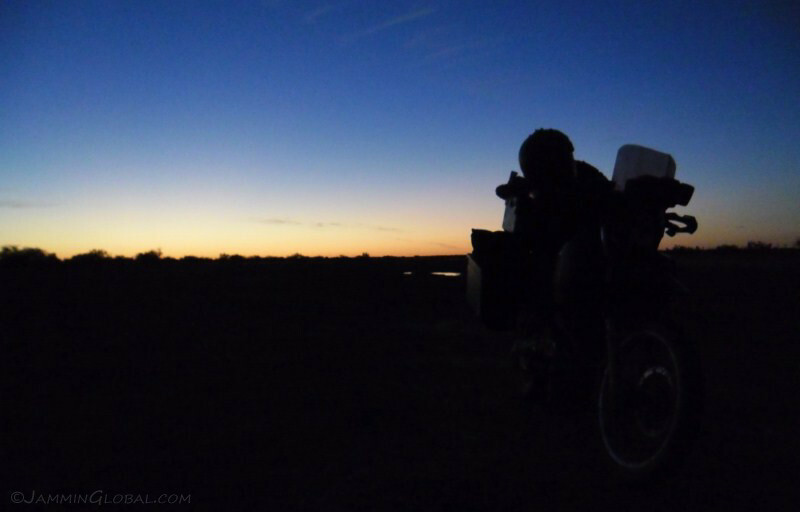 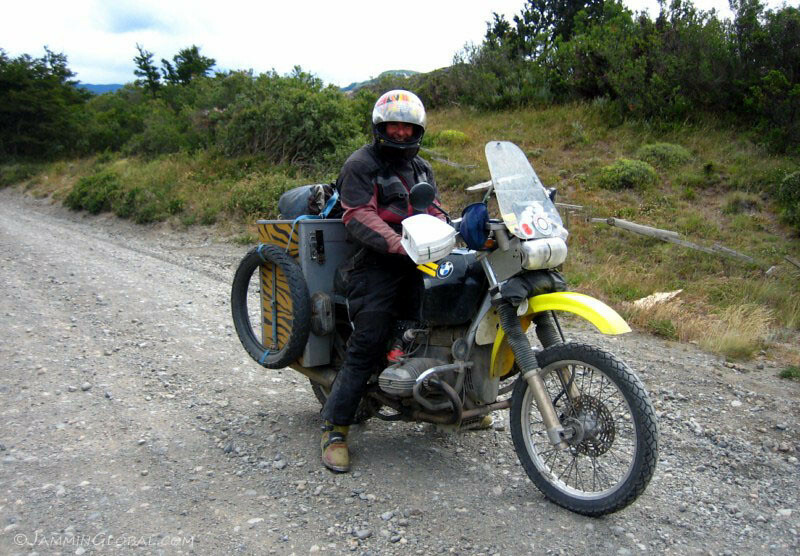 The crazy chap made his panniers from plywood and had a livery of zebra stripes; he could be mistaken for dinner in the savanna. 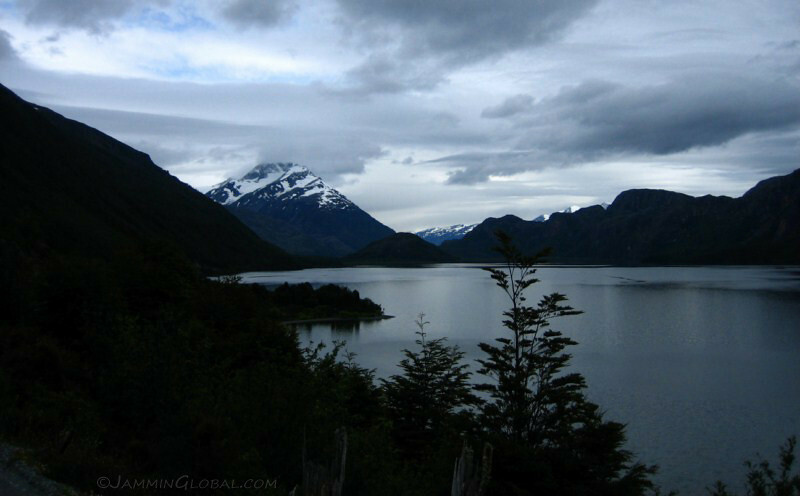 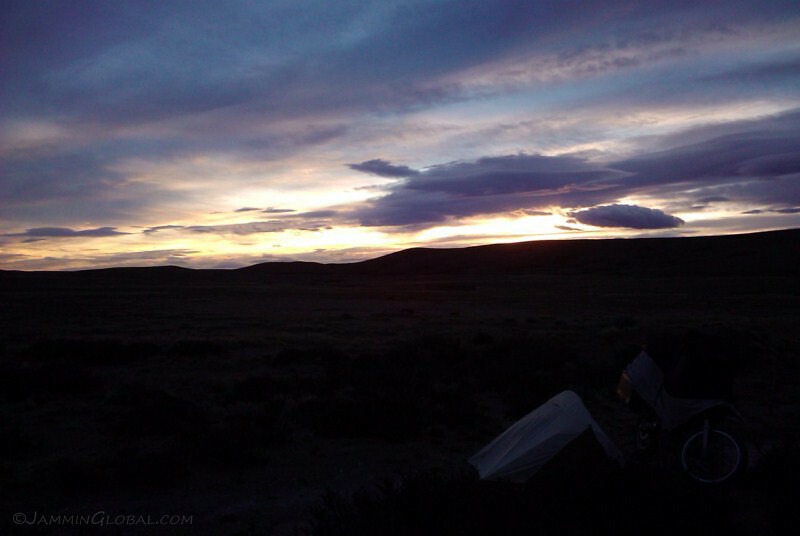 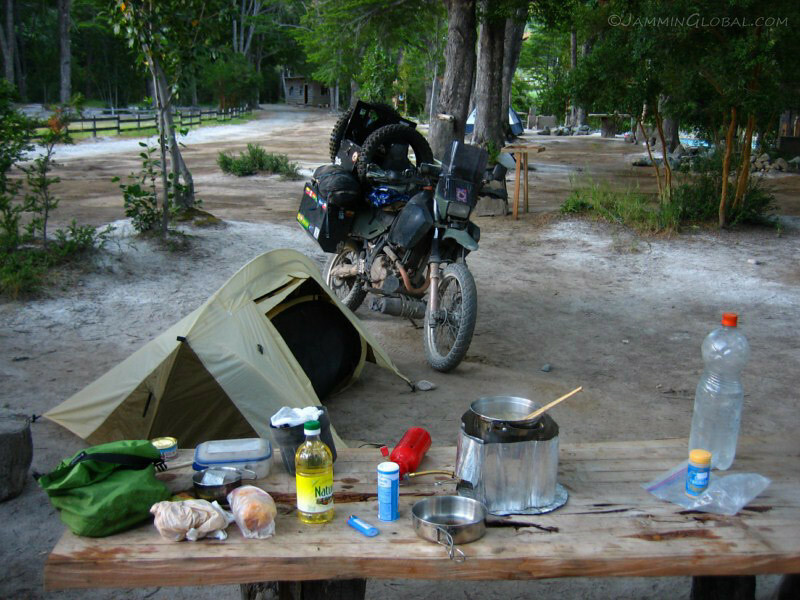 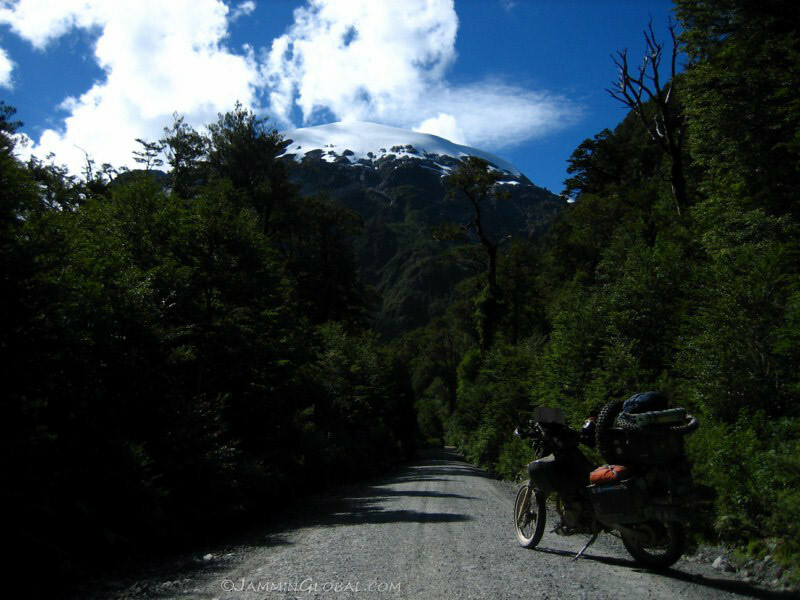 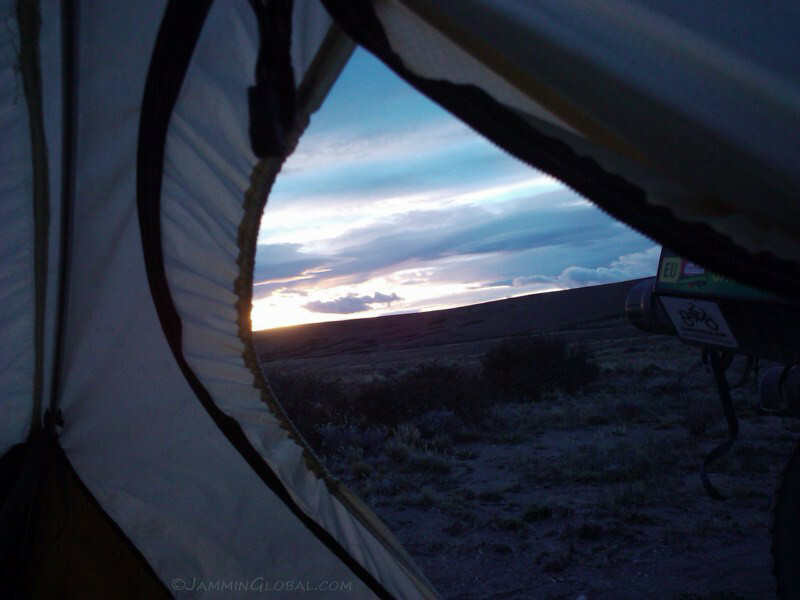 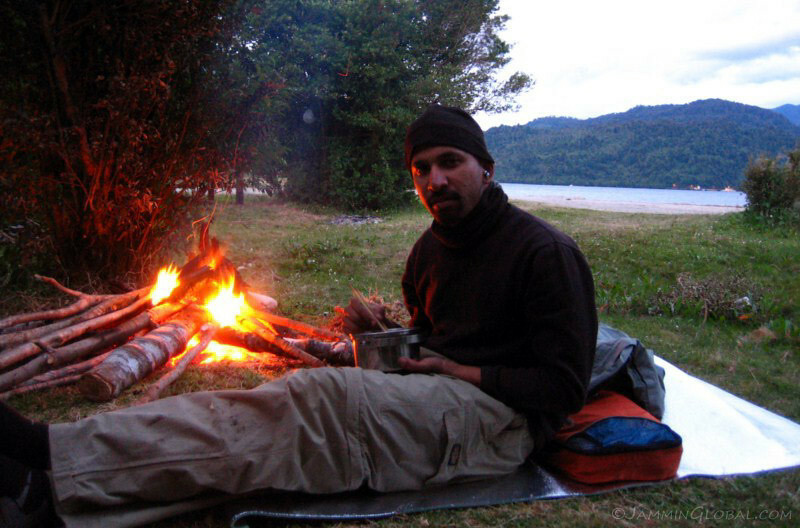 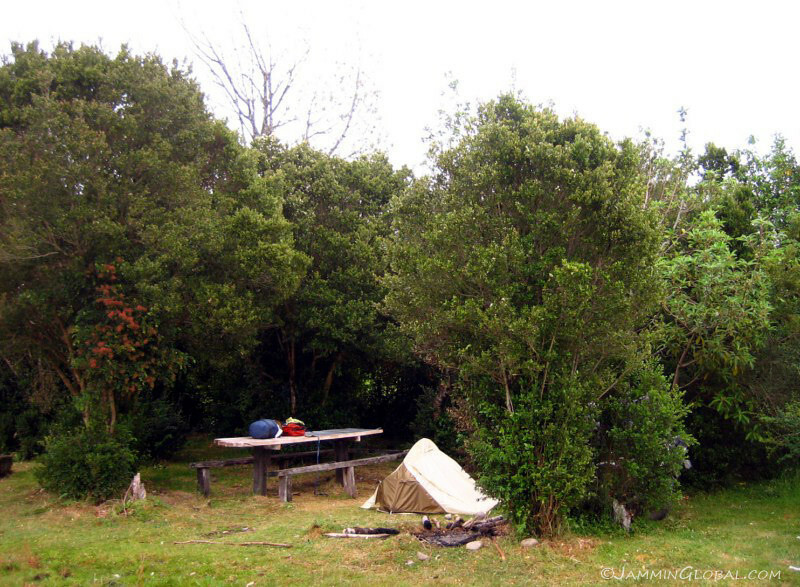 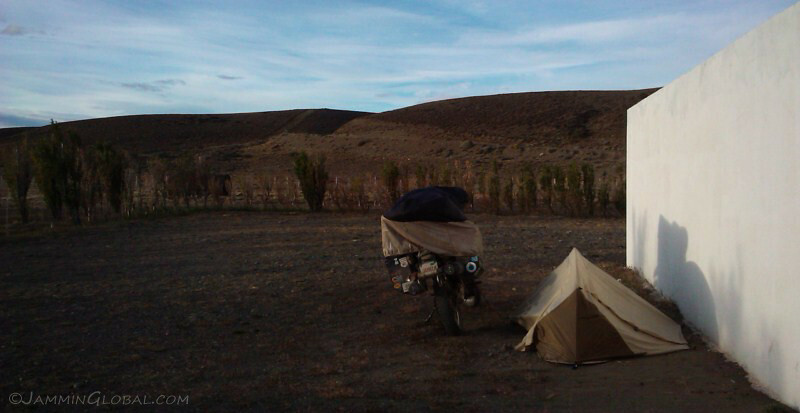 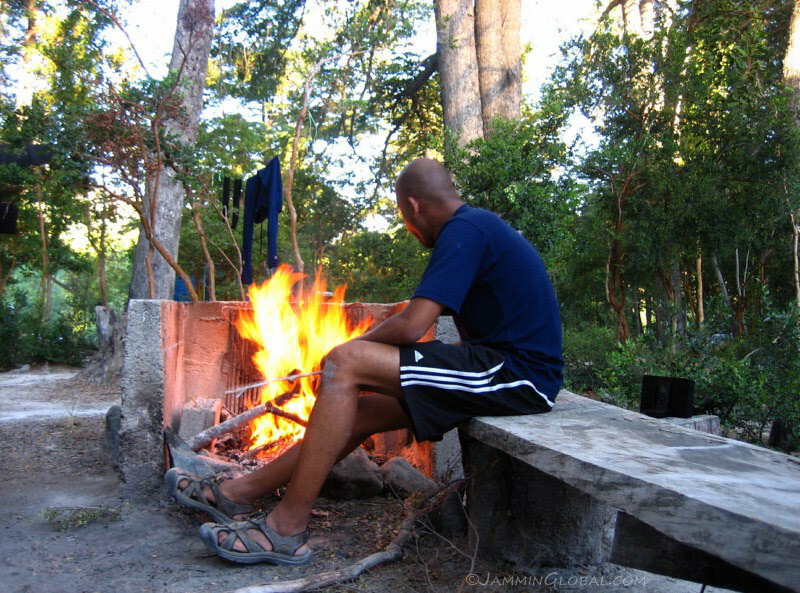 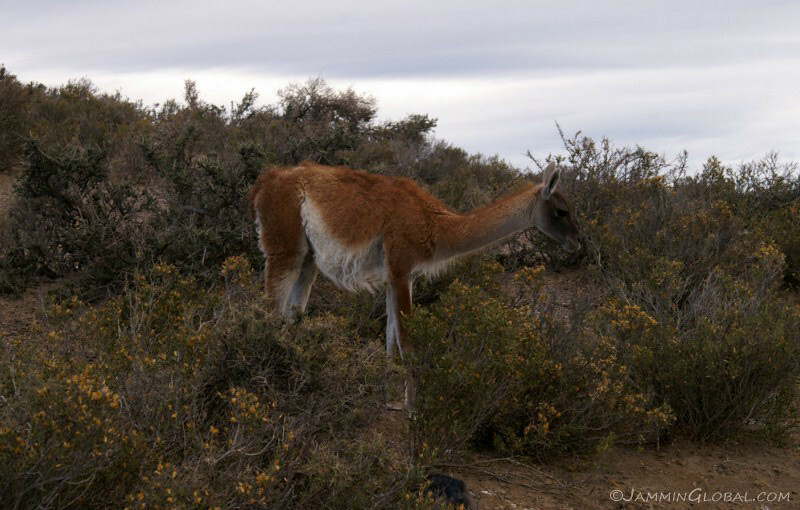 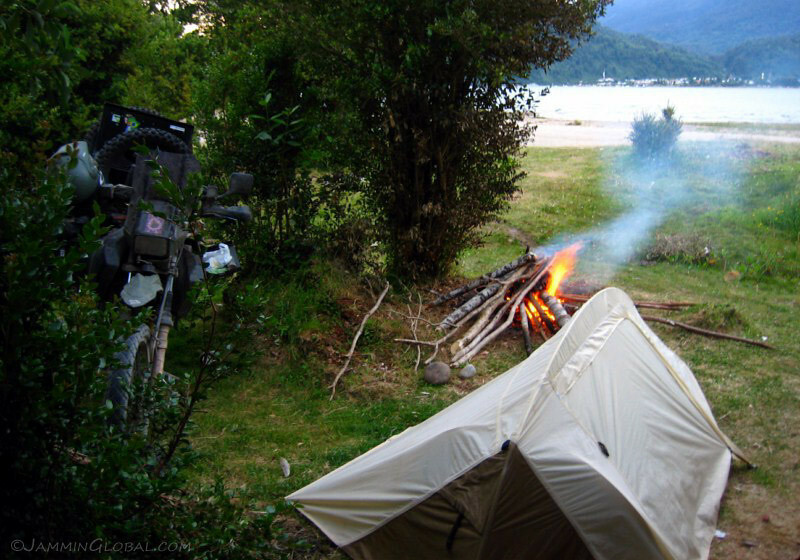 The Kiwis told me of a great place to camp along Lago Carrera General, so I headed there for the night. 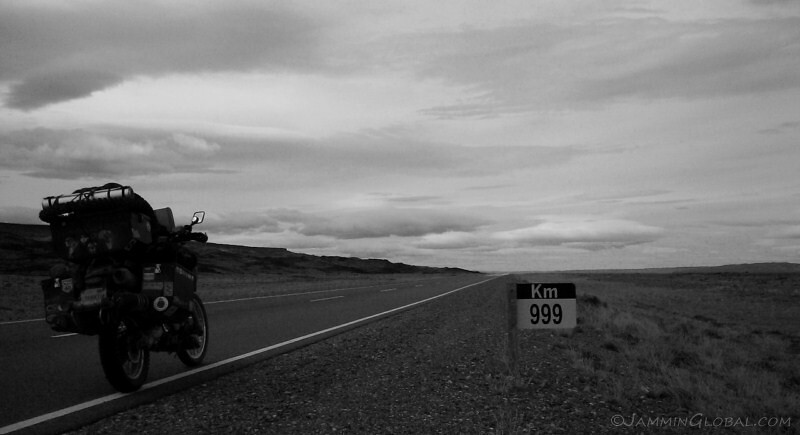 It was slow-going with so many wonderful photo opportunities. 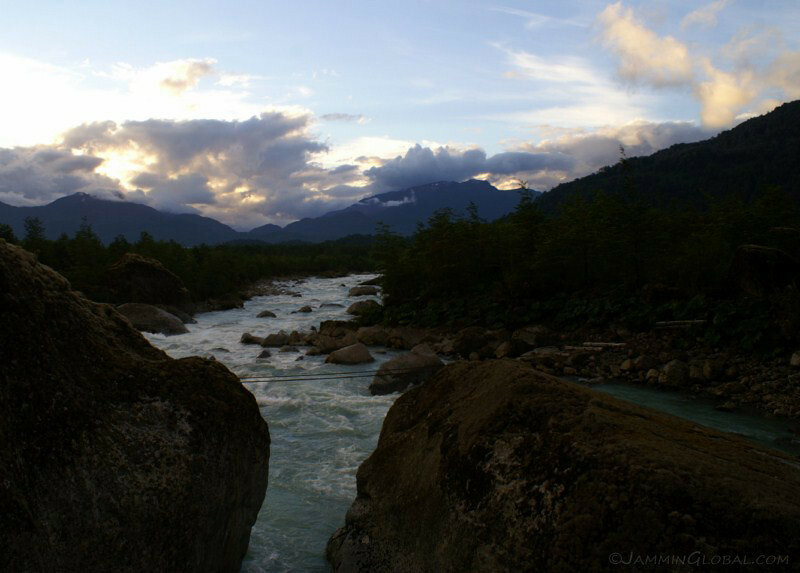 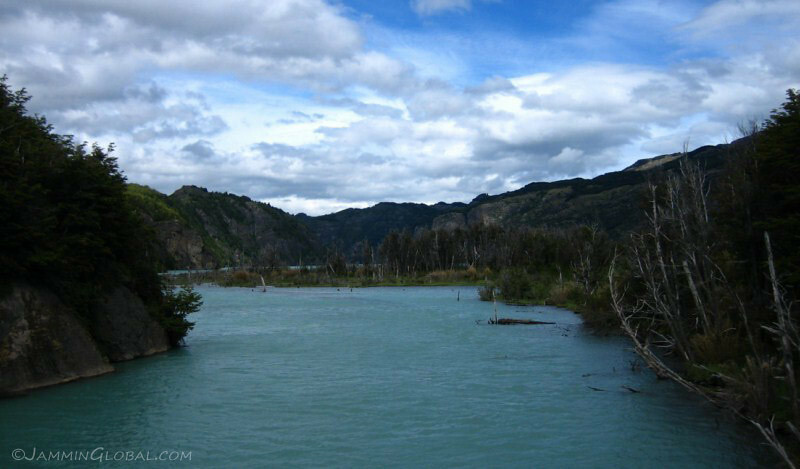 A turquoise river flowing from an unseen glacier that cloudied-up the water with pulverized rock held in suspension. 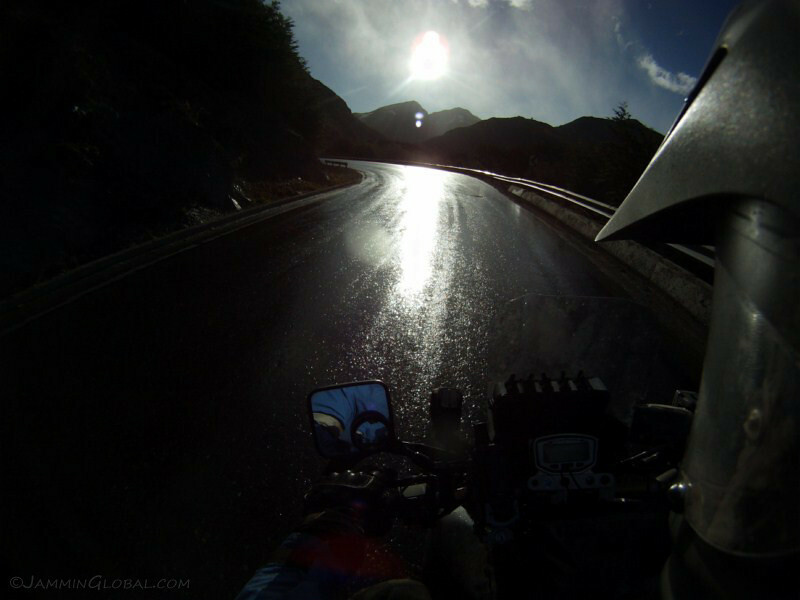 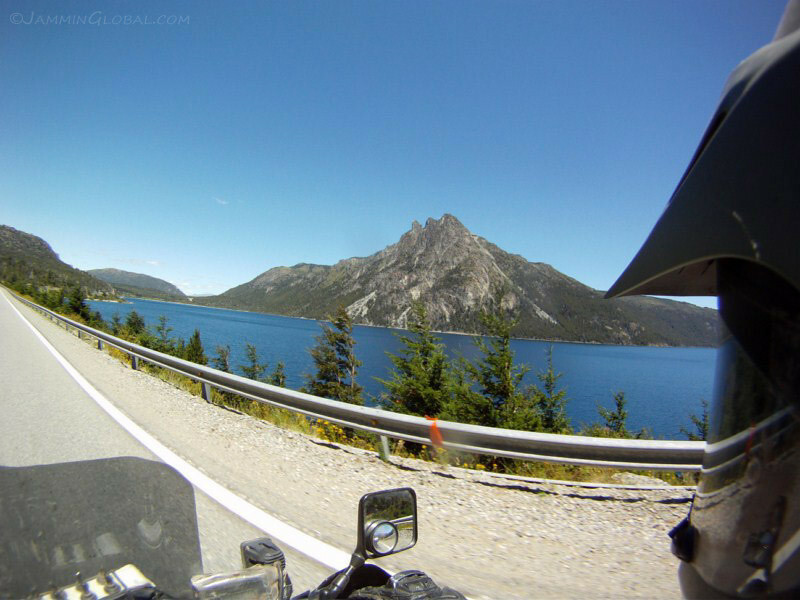 The road was in good condition, allowing for higher speeds but the views were constantly distracting. 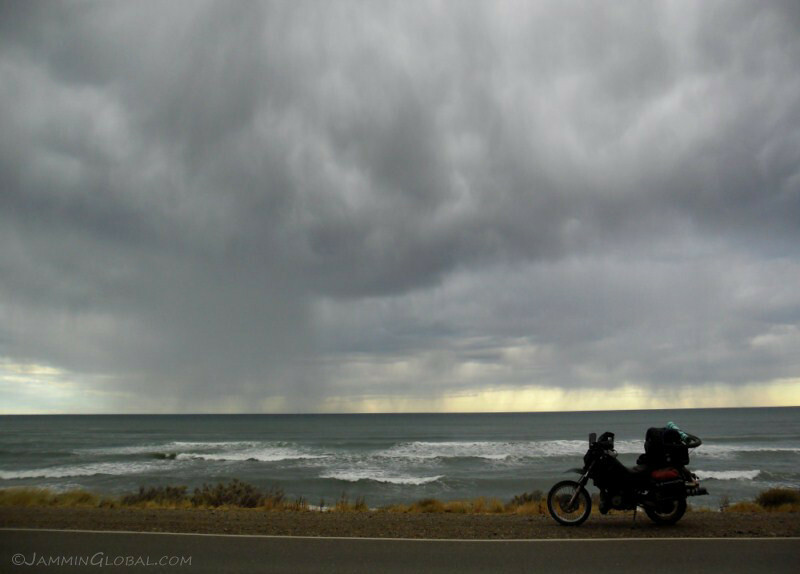 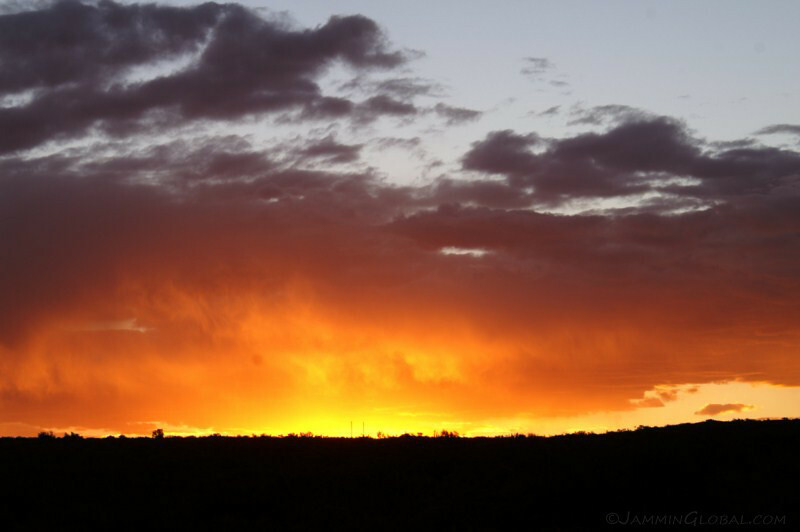 Besides the epic scenery, the fast-changing weather held my rapt attention with the thick clouds changing day into night. 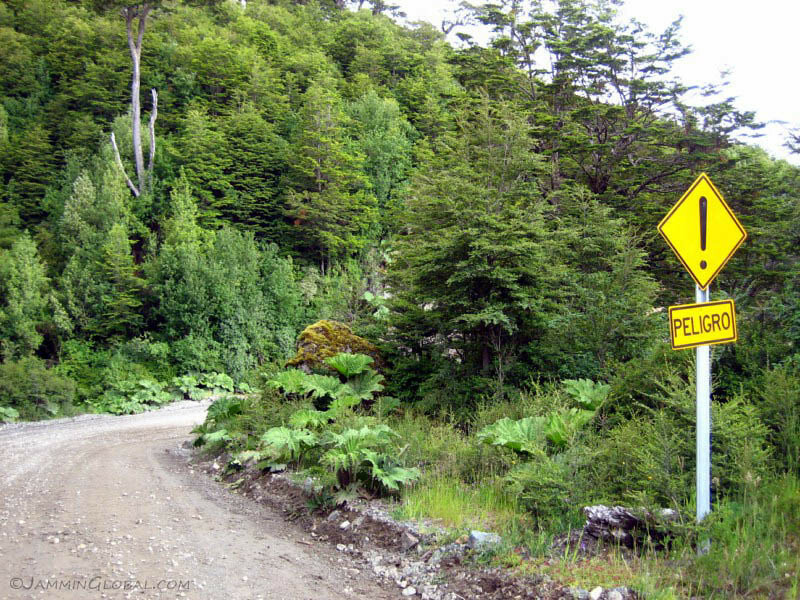 When I saw the first of these signs, I was ready for some ‘danger’ around the corner, but then I realized, they were just warning about the corner itself. 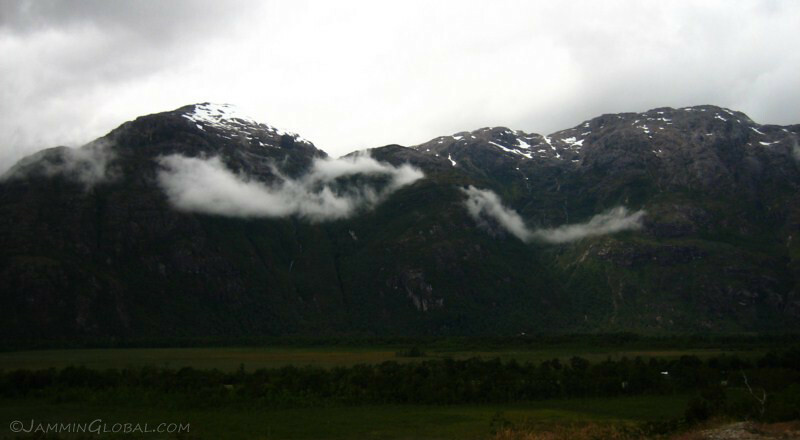 …and then dropping down and flowing over these hills. 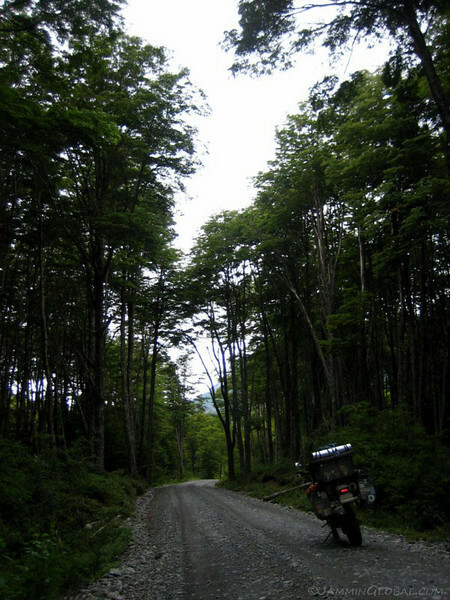 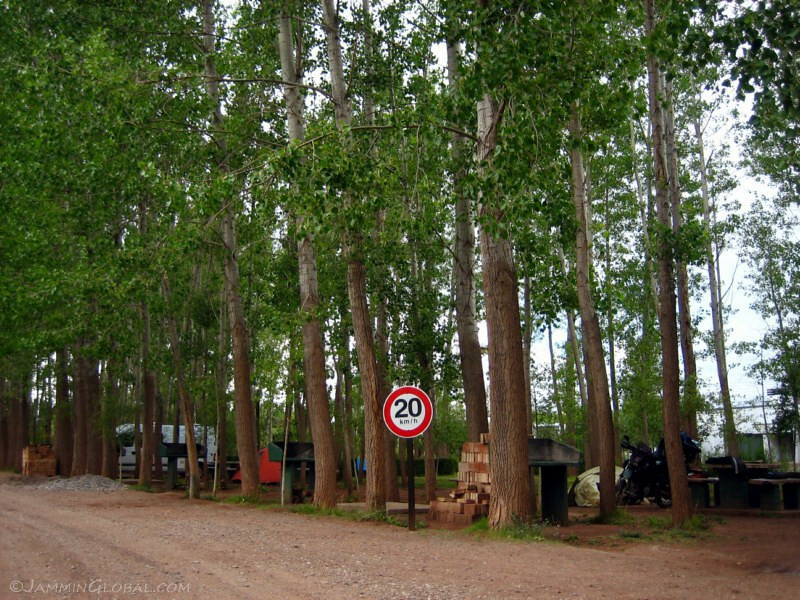 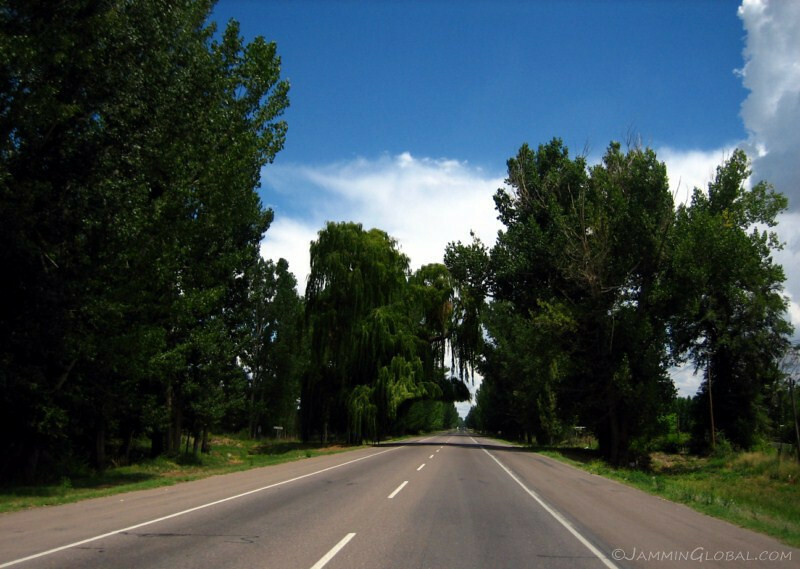 The Carretera is characterized with these slender, tall trees. 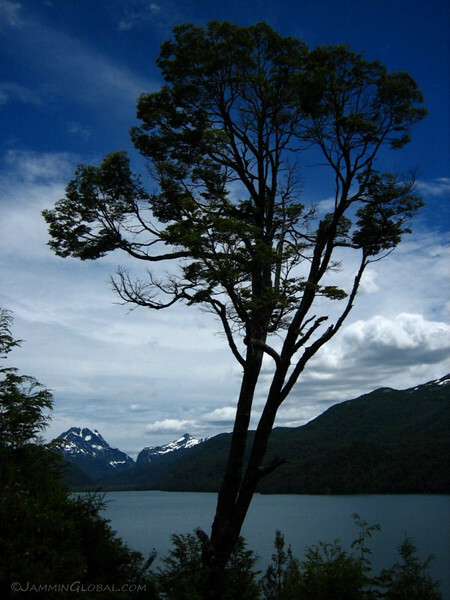 Perhaps it’s a result of the constantly wet environment, letting the trees grow as tall as they desire. 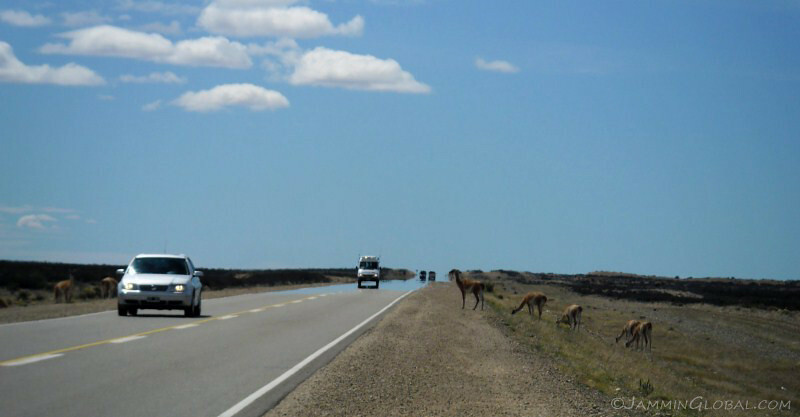 Taking a break in the middle of the road and not worrying about any traffic. 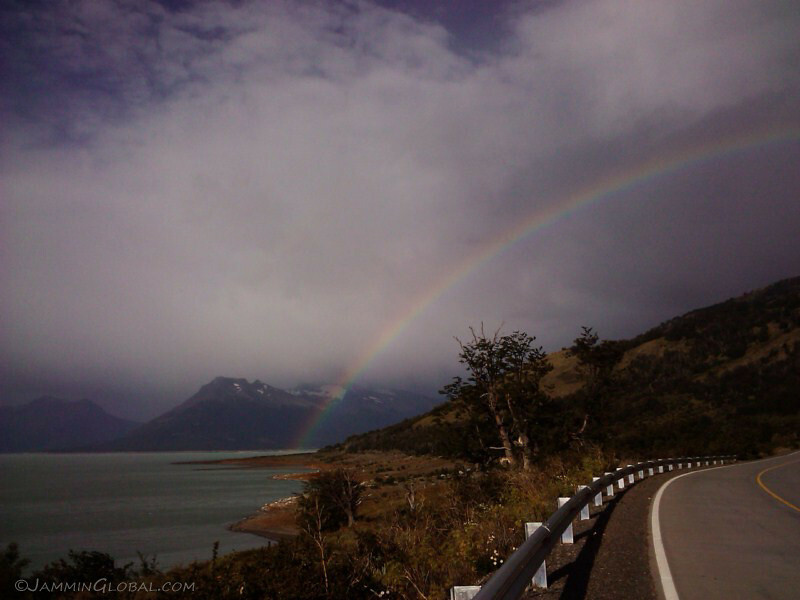 I turned the corner and wow, a complete rainbow to welcome me to the jewel of Chile’s northern Patagonia, Lago Carrera General. 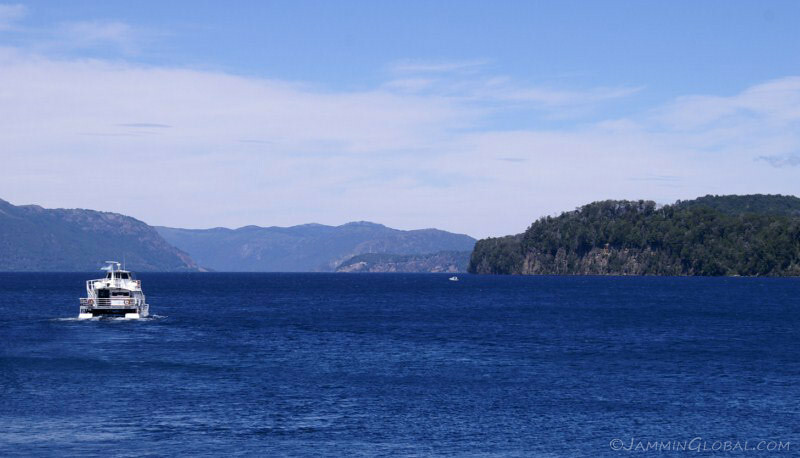 The lake is massive, the second largest in South America below Lago Titicaca and its most striking feature is the almost unreal color of its waters. 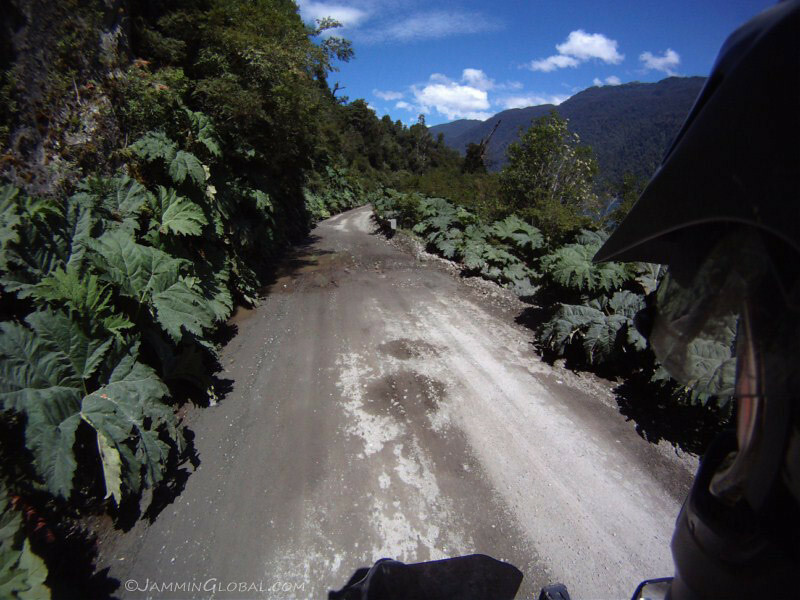 I found the camping spot that the Kiwi riders told me about and it was just past the small settlement of Rio Tranquilo. 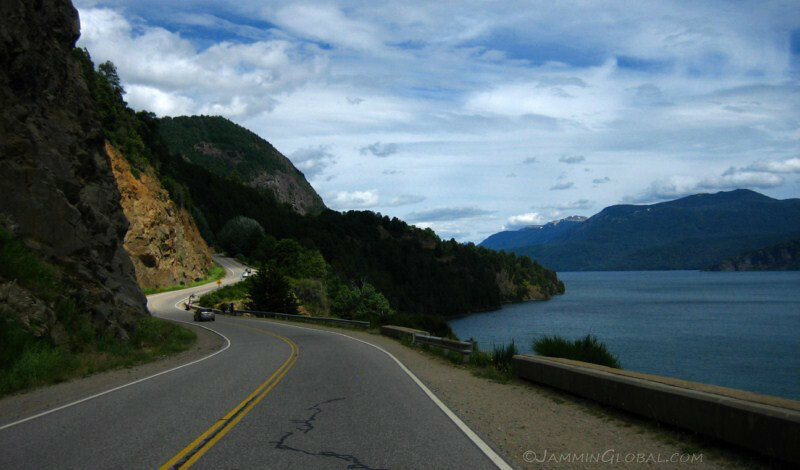 The road stays high up along the cliffs and it was a steep descent down to the shores of the lake. 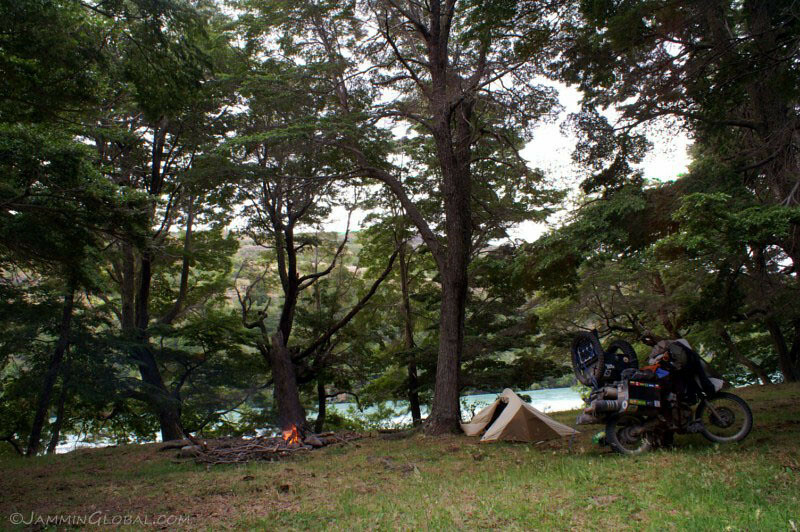 My spot for the night under these trees with a fantastic view of the lake. 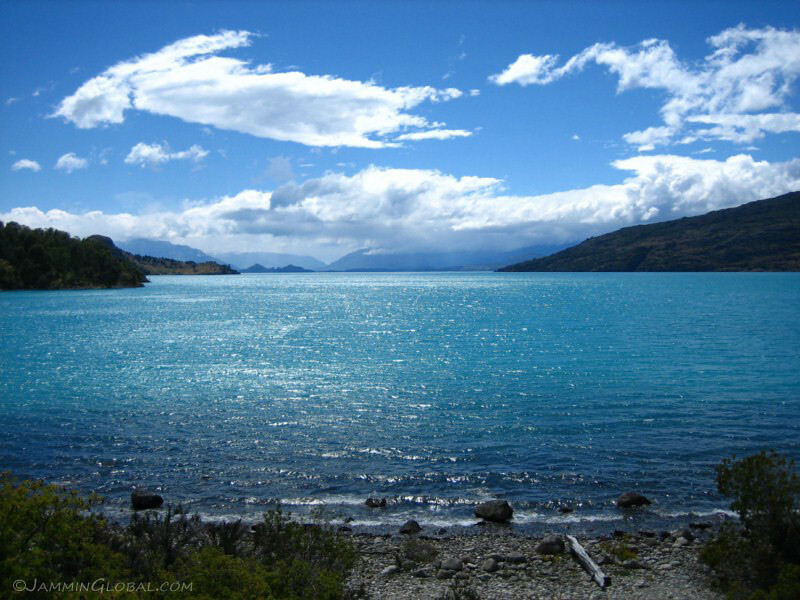 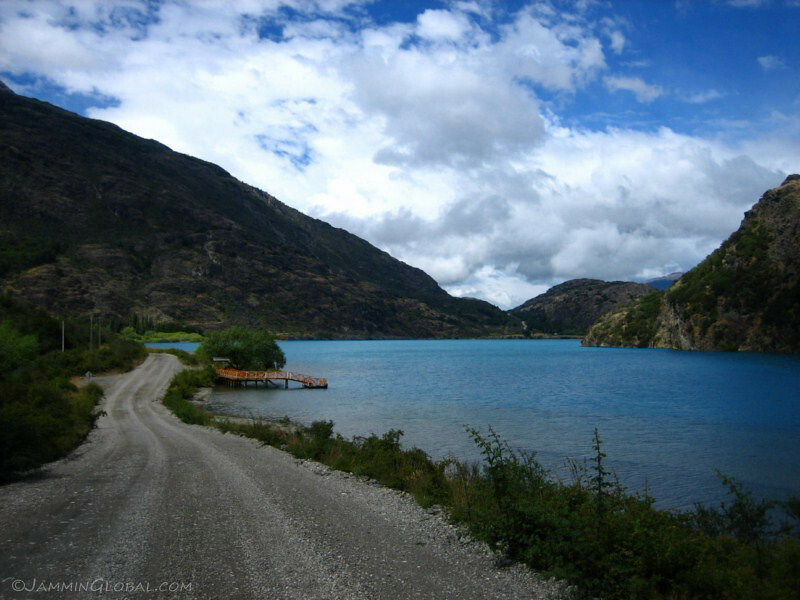 The iridescent blue waters of Lago Carrera General. 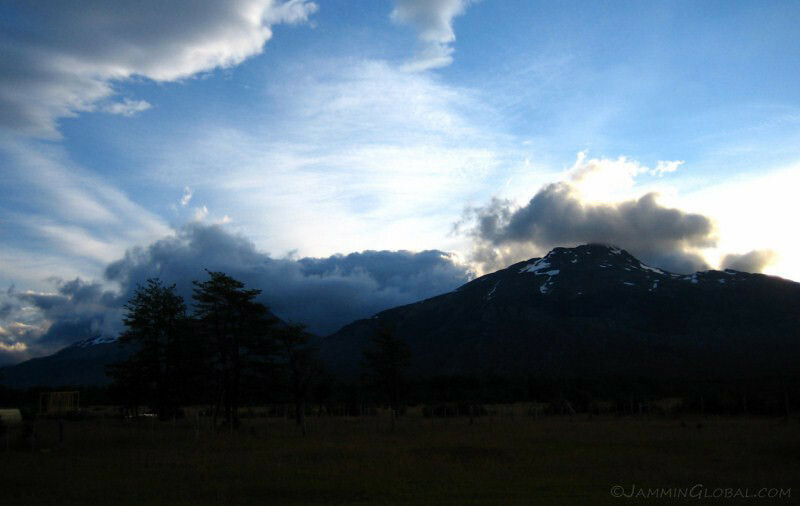 The changing sunlight determined what kind of blue was shown and I guess rainbows are quite common here with the humid air easily catching the Sun’s photons. 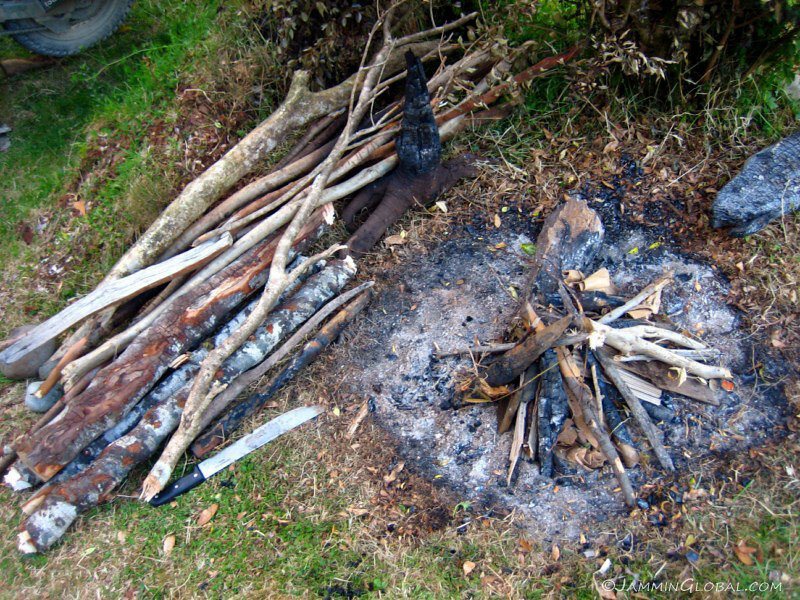 There was a fire ring with a picnic table and home was setup for the night. 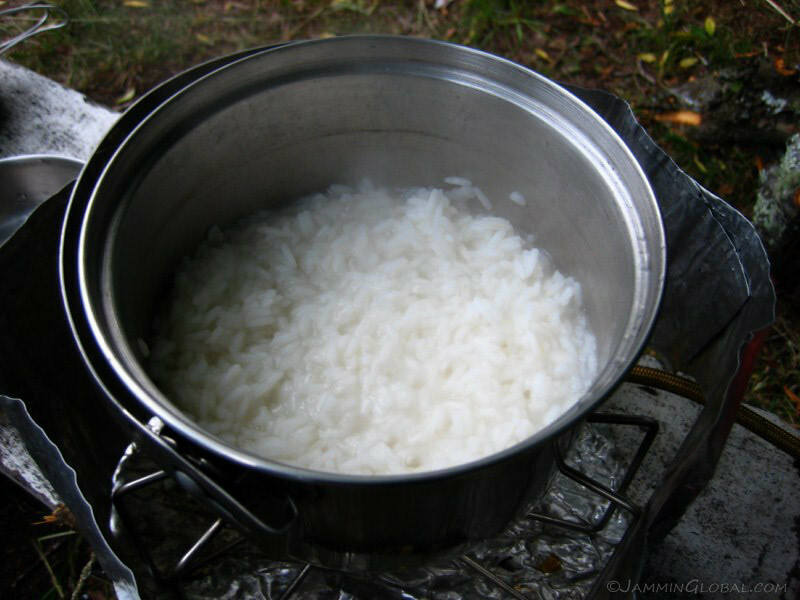 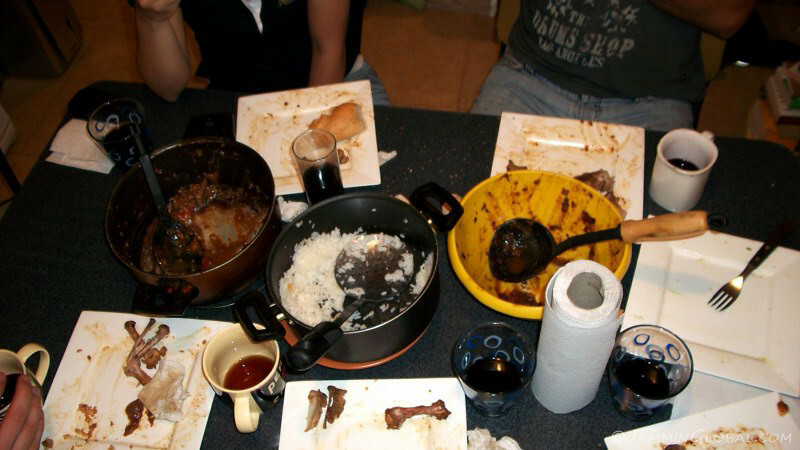 I started cooking more rice than pasta after I realized it didn’t really take all that much more time to prepare rice. 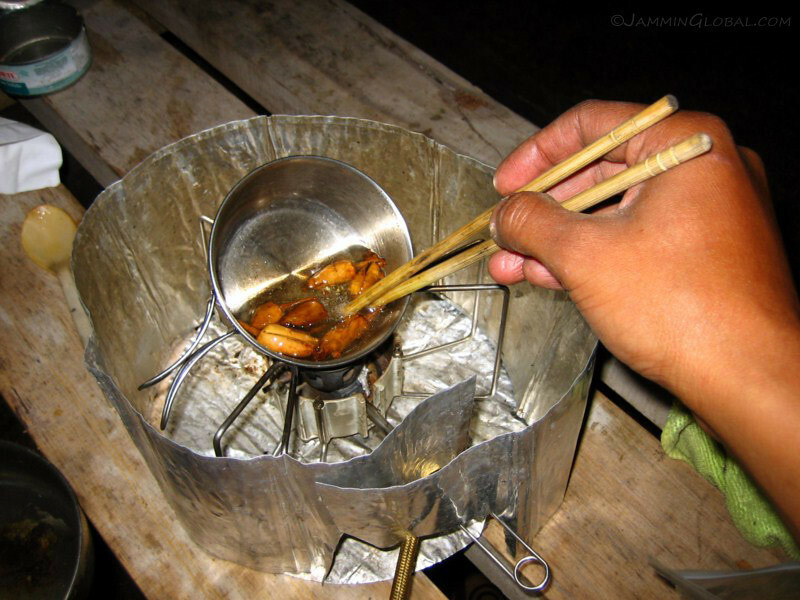 And with the adjustable flame option of the MSR Dragonfly stove, I could have it simmering on a low-enough flame to make a good pot of rice without burning it. 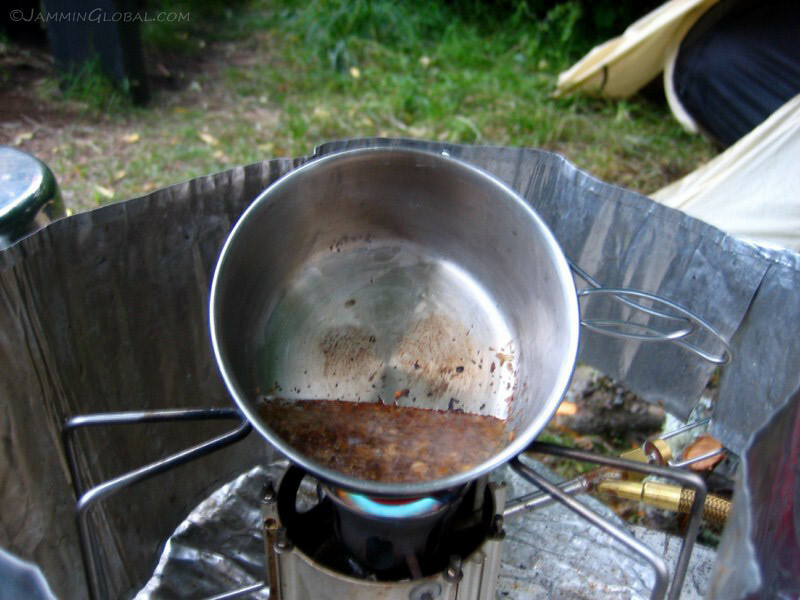 Frying up some dehydrated spices to add flavour to dinner. 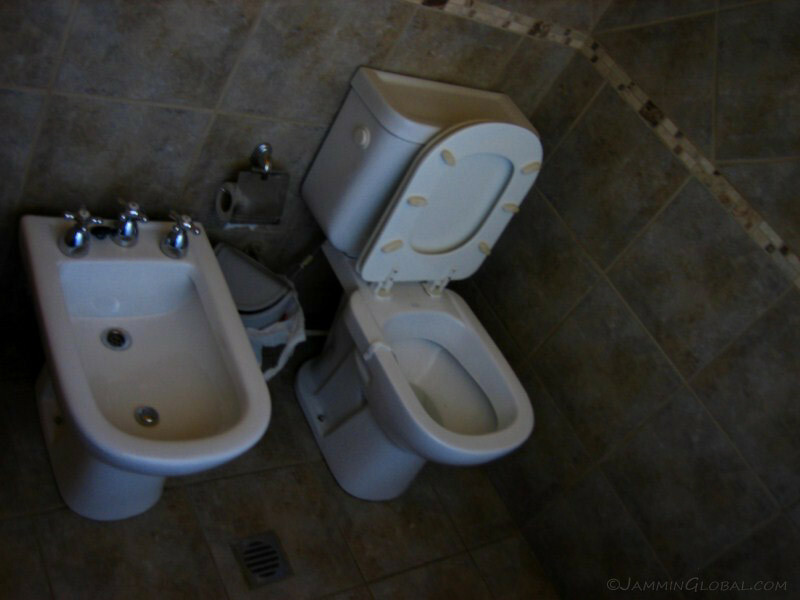 This was also made by my aunt in my mother’s village outside Madras, India. 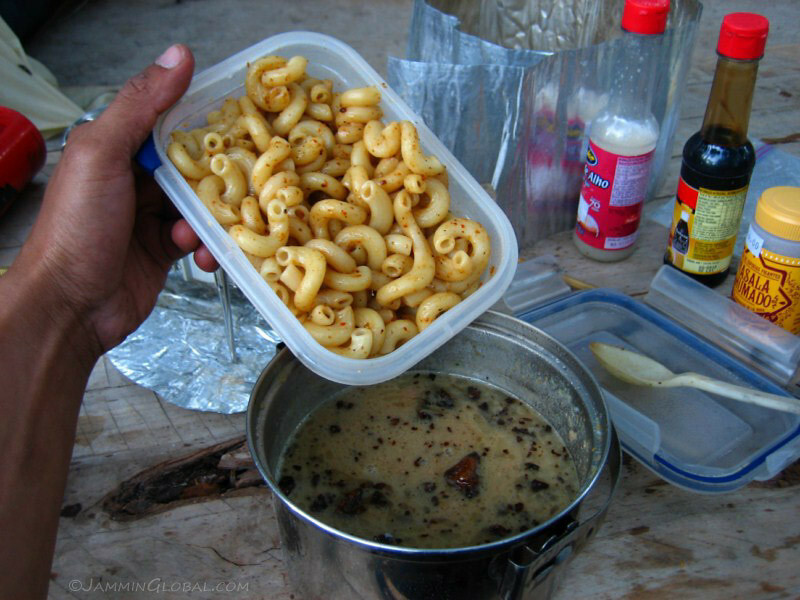 It’s a mixture of onions, garlic, mustard seeds, fennel and other such ingredients, which are dried and when fried release their flavours. 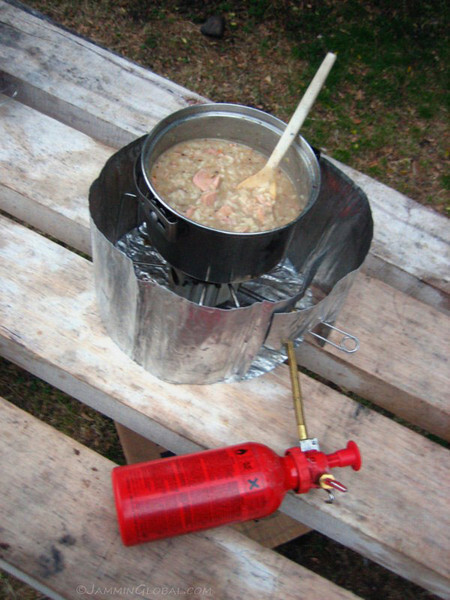 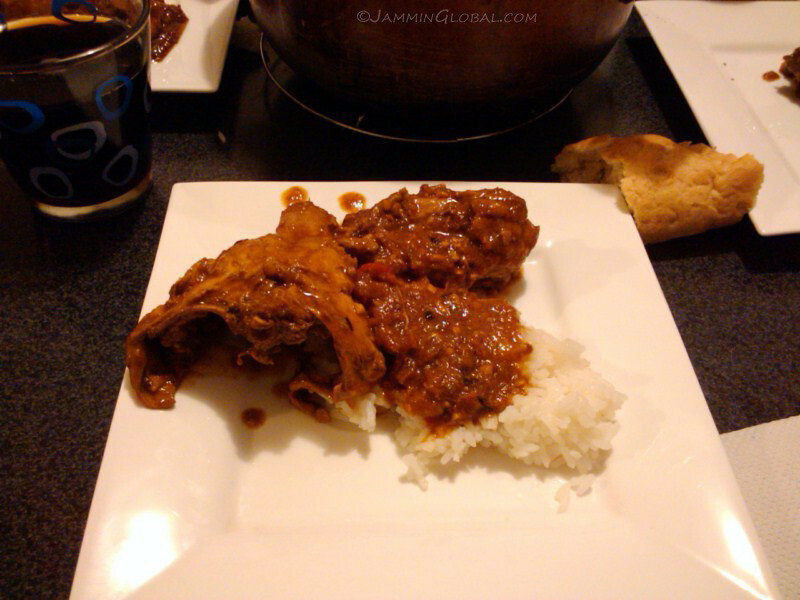 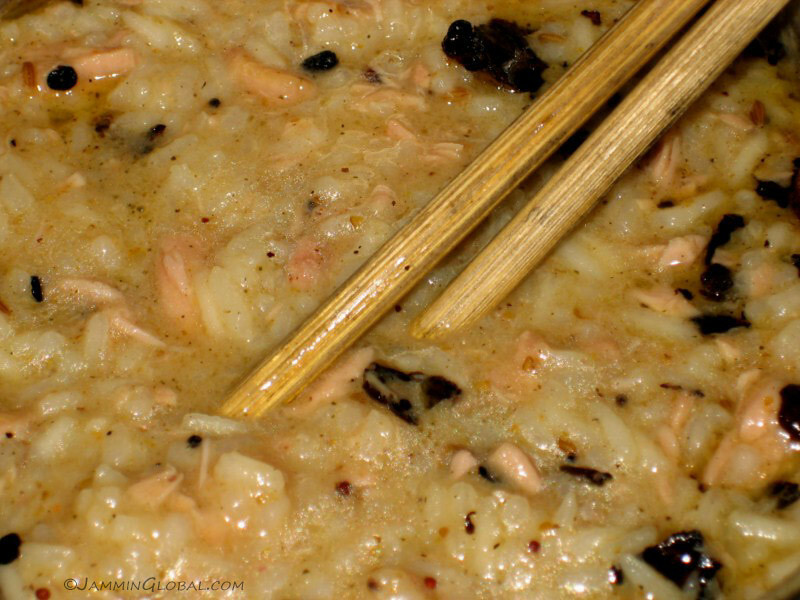 The fried spices were added to the rice with a can of tuna and tomato sauce. 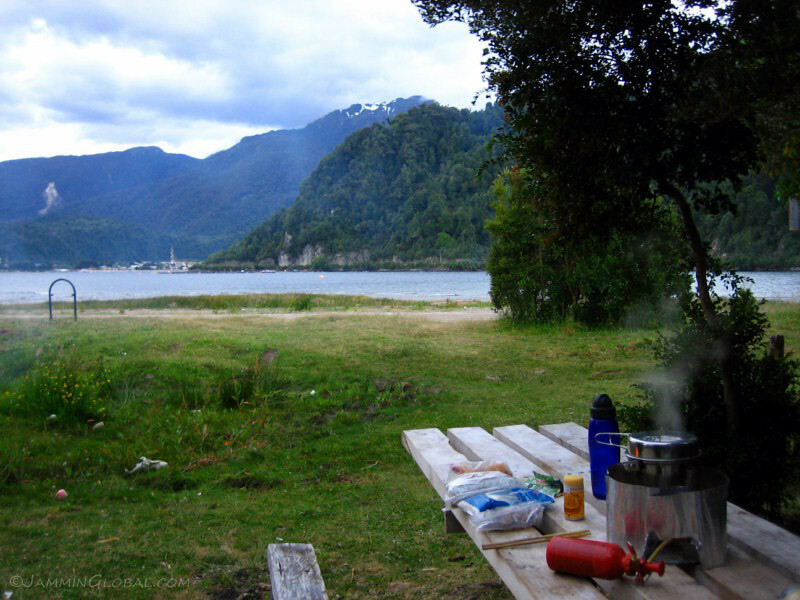 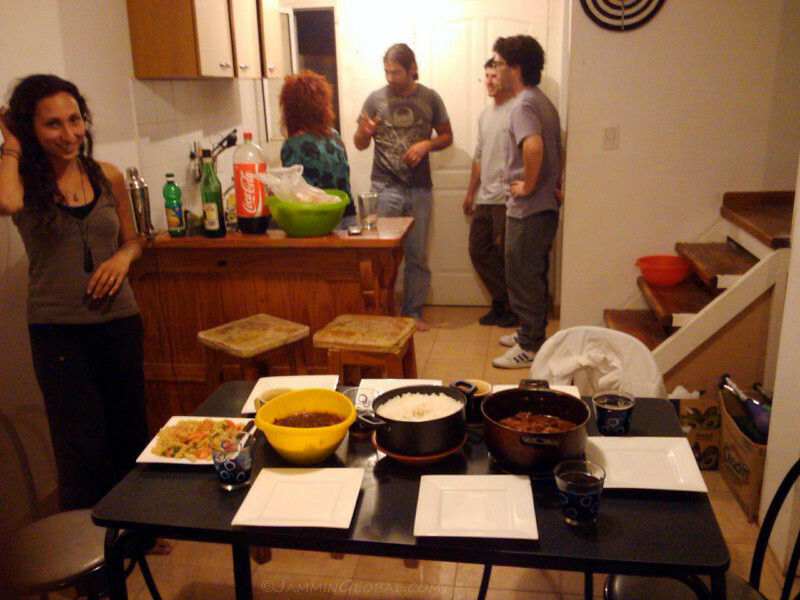 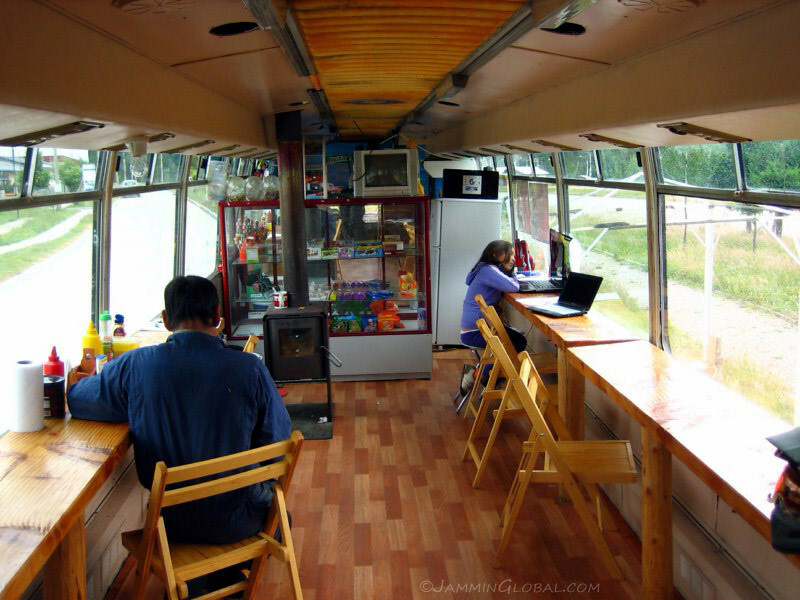 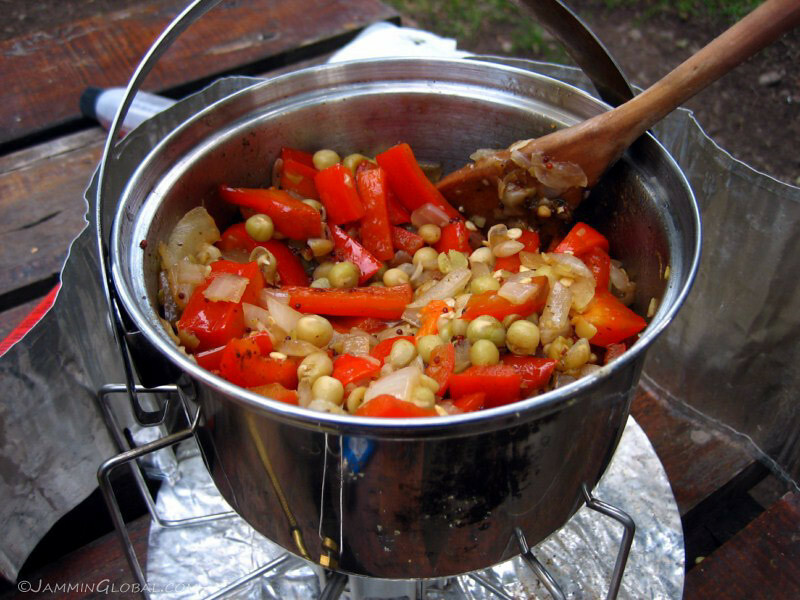 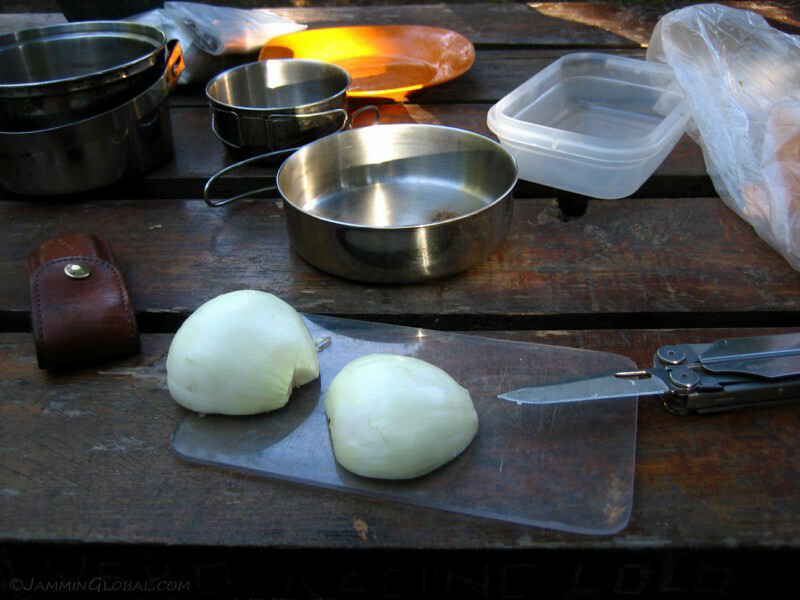 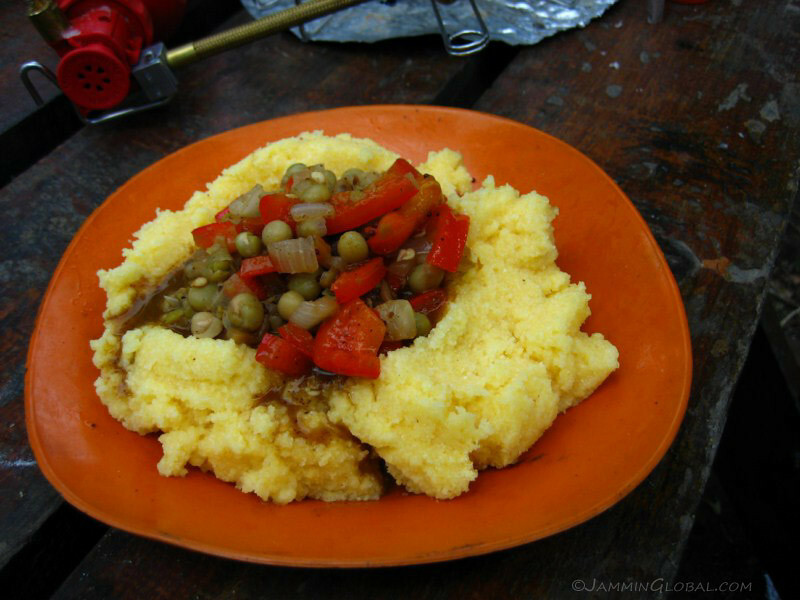 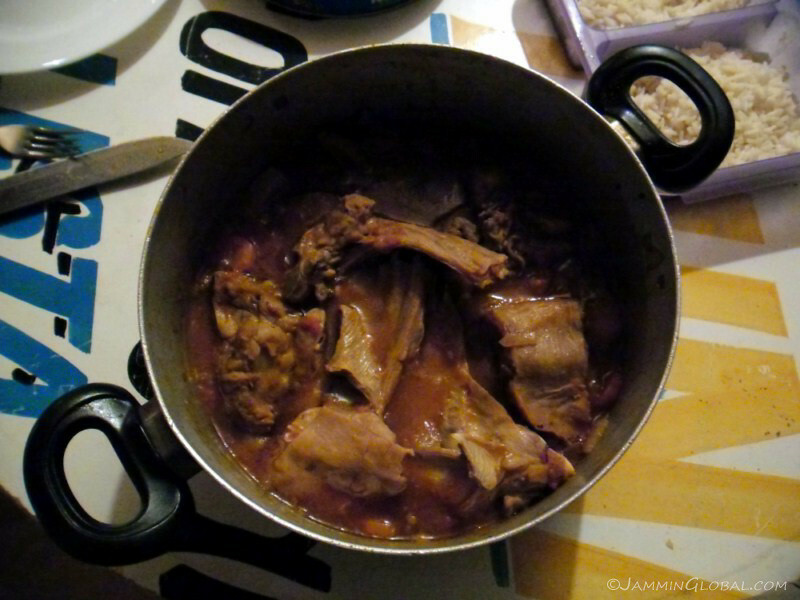 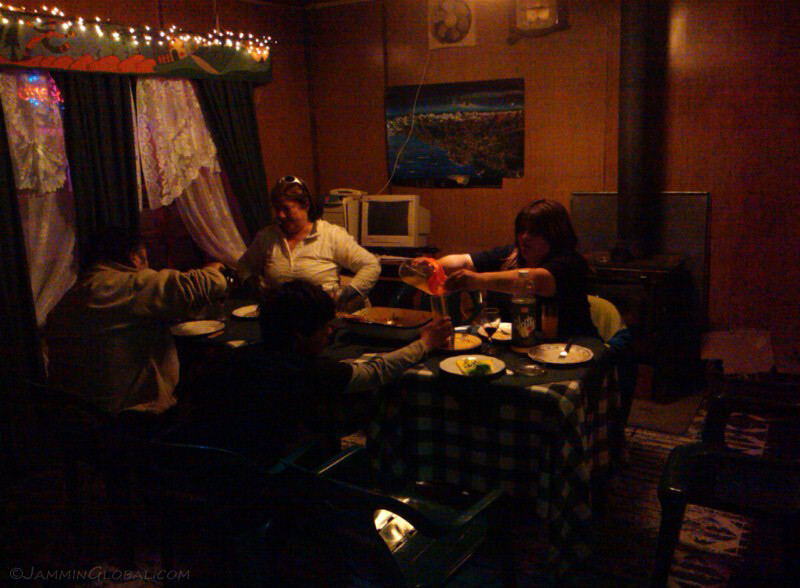 Good eats on the Carretera Austral. 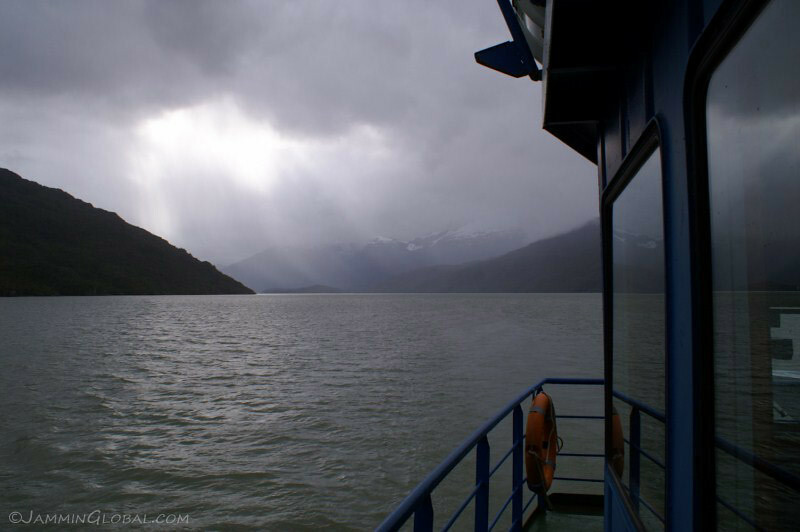 I woke up to rain the next morning but after waiting a while, the sun came out and made it a happy day. 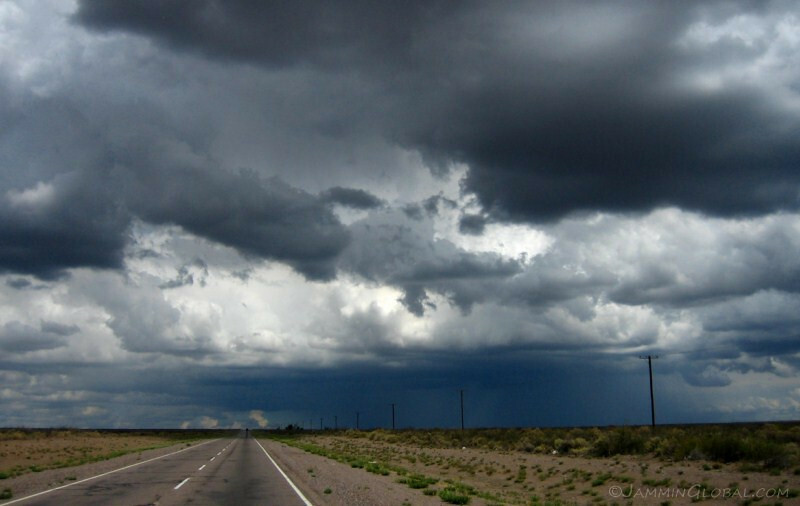 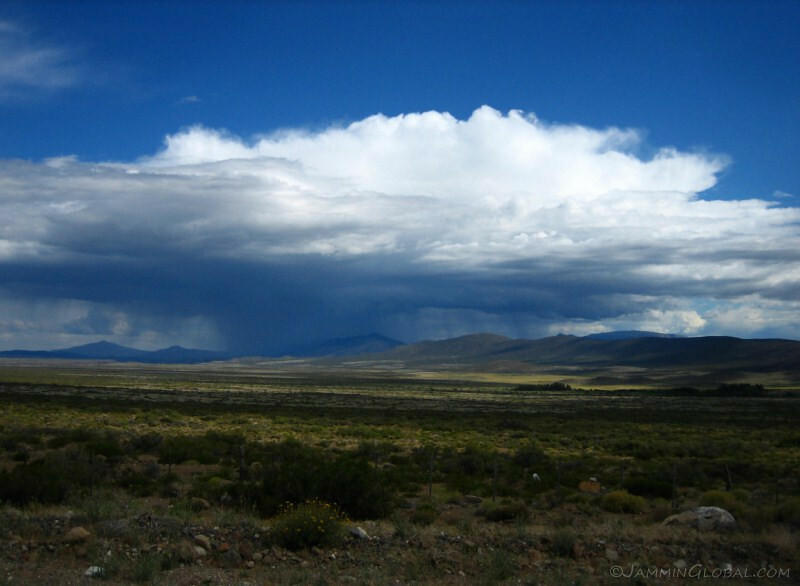 The nice thing about rain is that once it’s done, it leaves behind clear air. 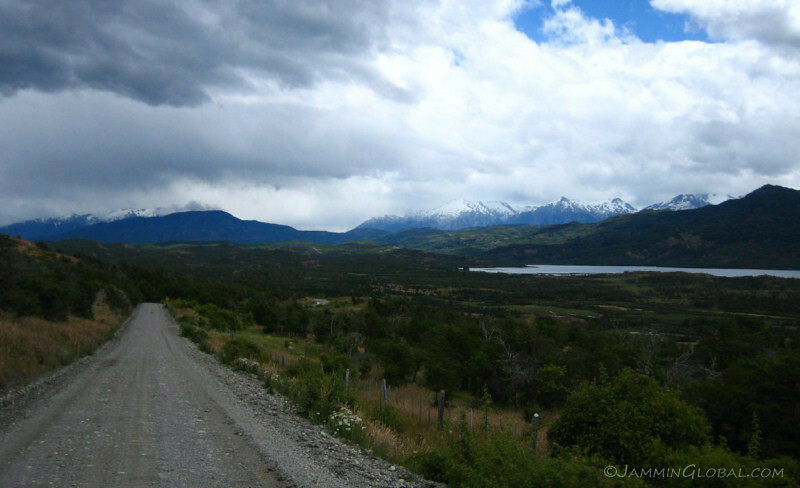 Continuing south around the lake. 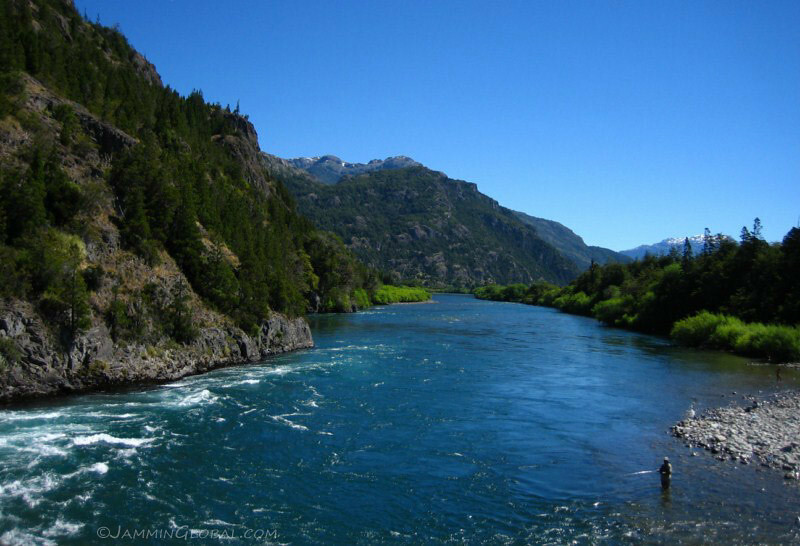 It’s known for great trout and salmon fishing. 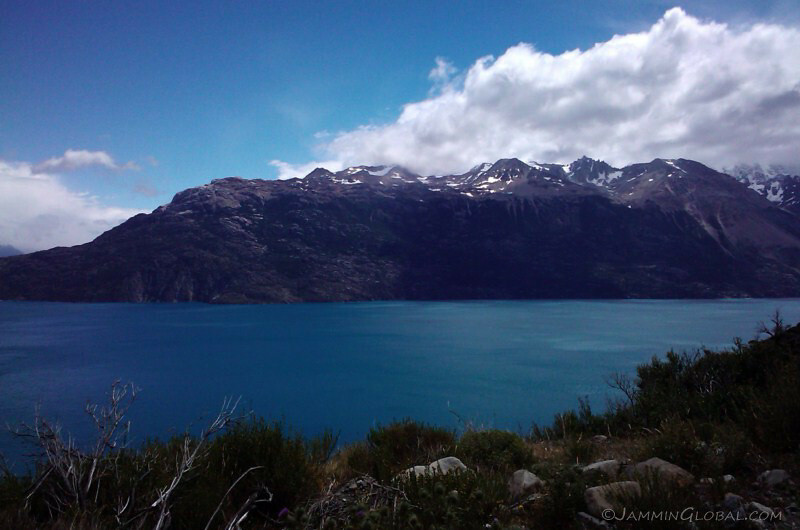 The blue is just surreal, especially contrasted with the surrounding greens. 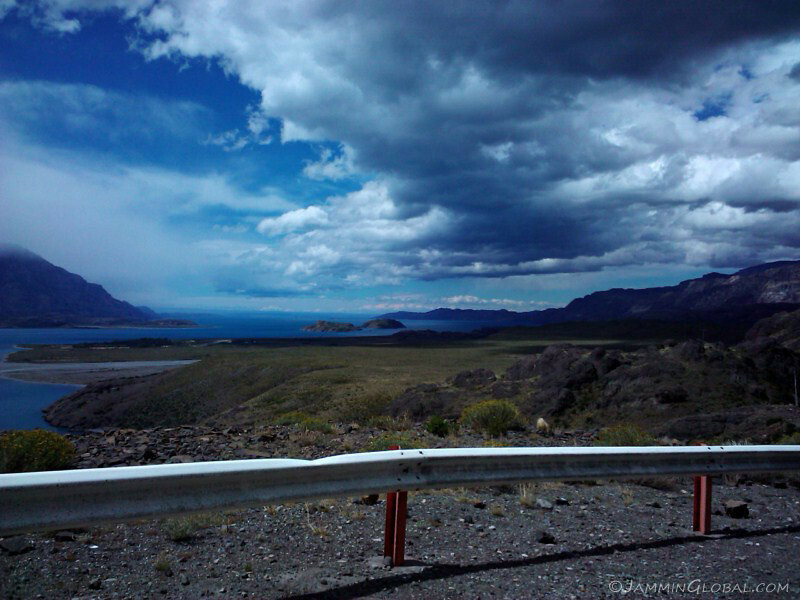 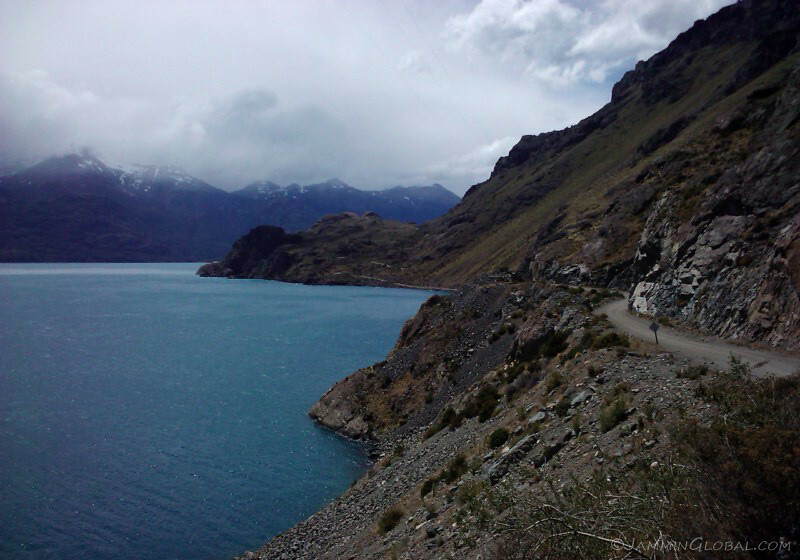 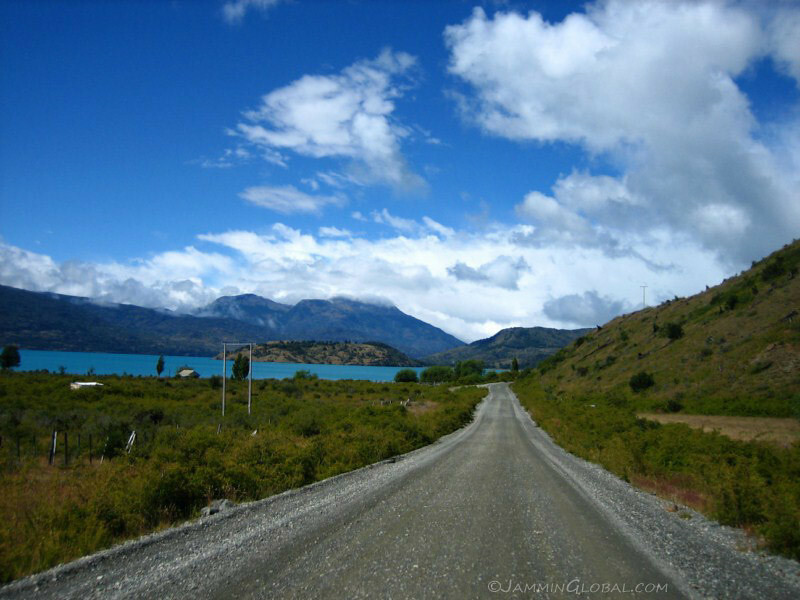 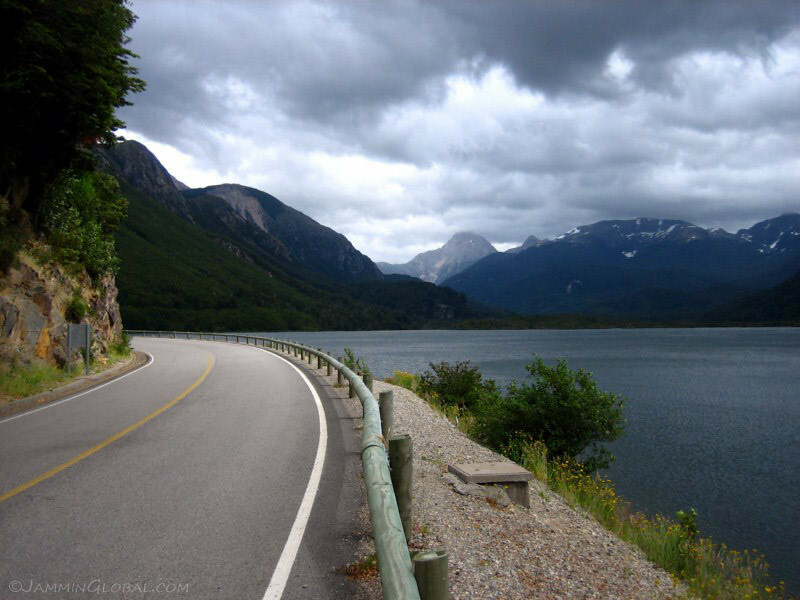 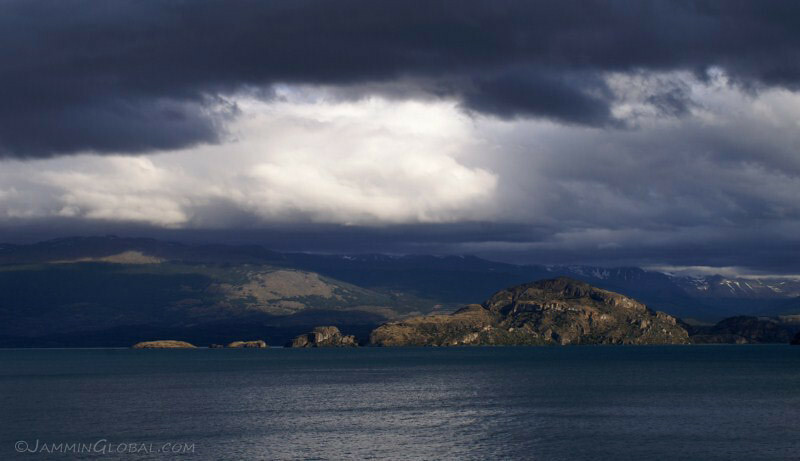 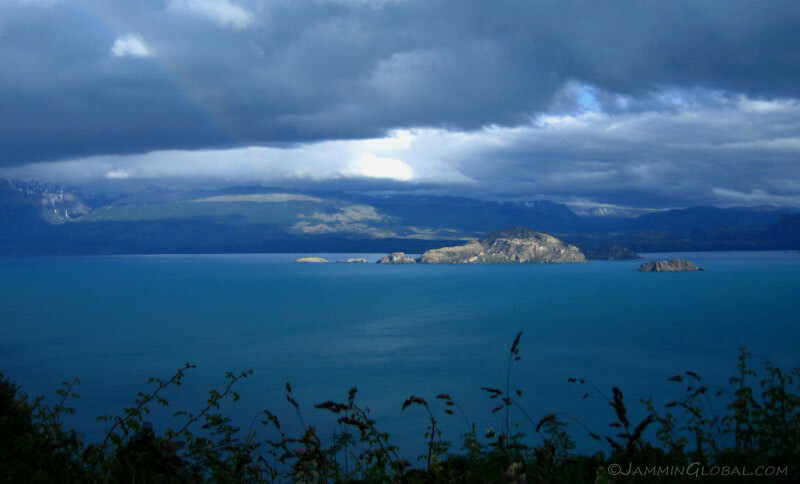 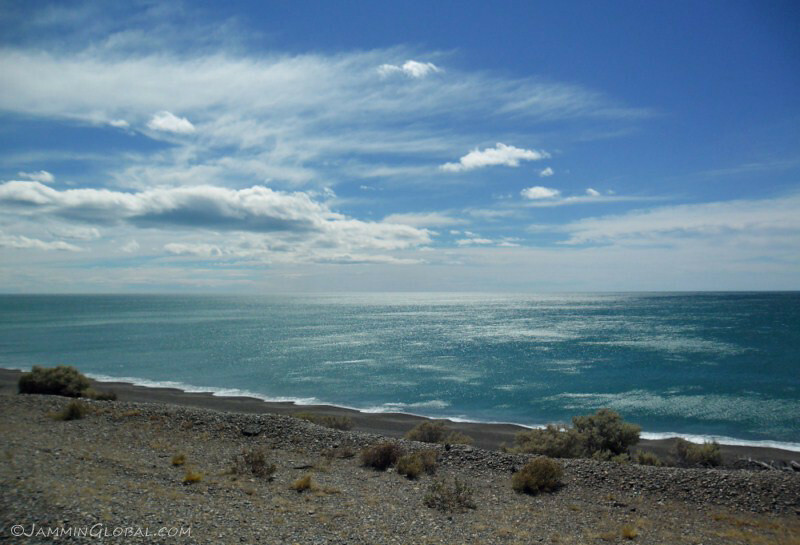 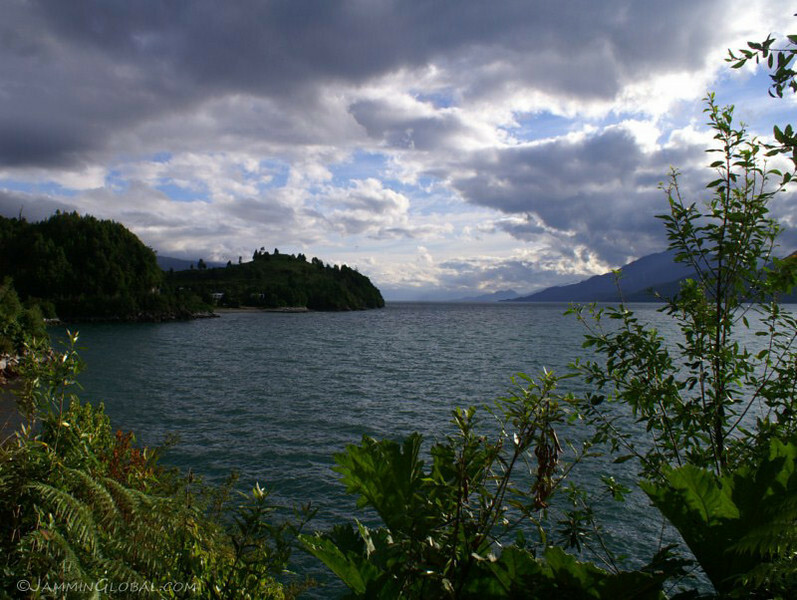 At the southern edge of the lake, the Carretera continues in a one-way direction to Villa O’Higgins. 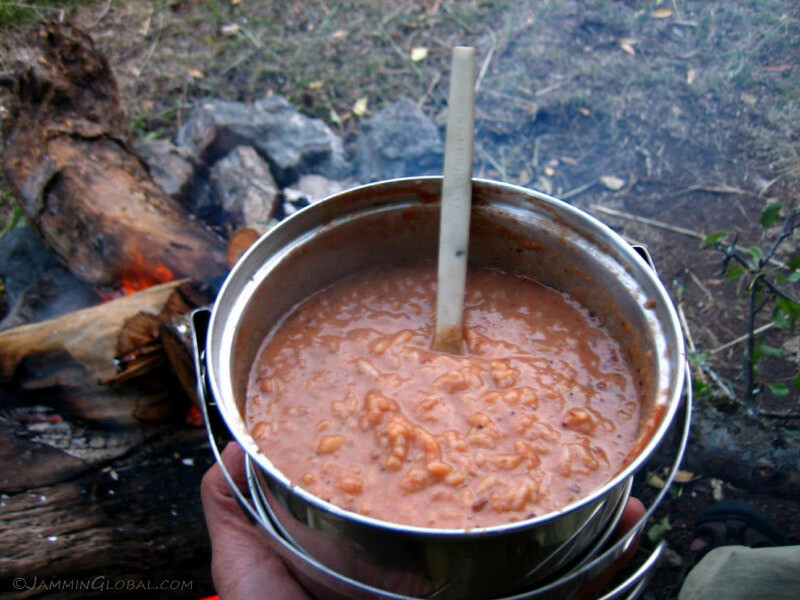 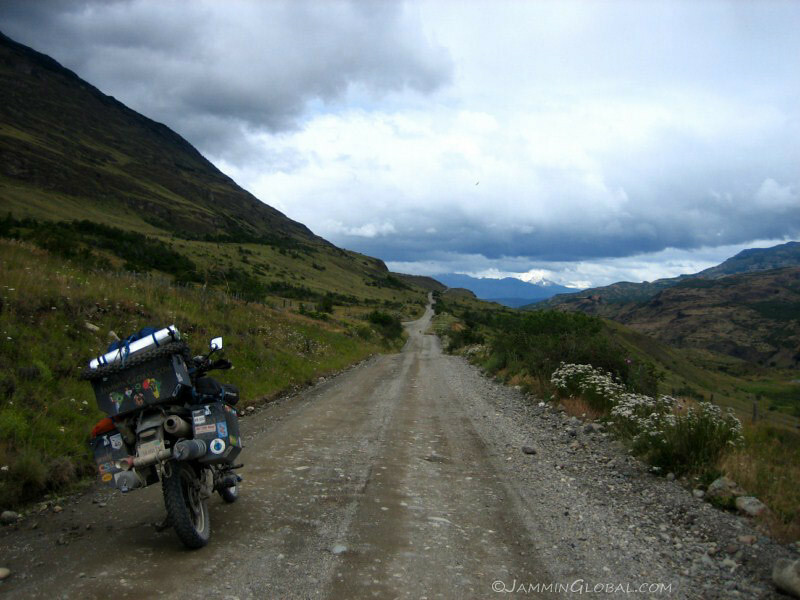 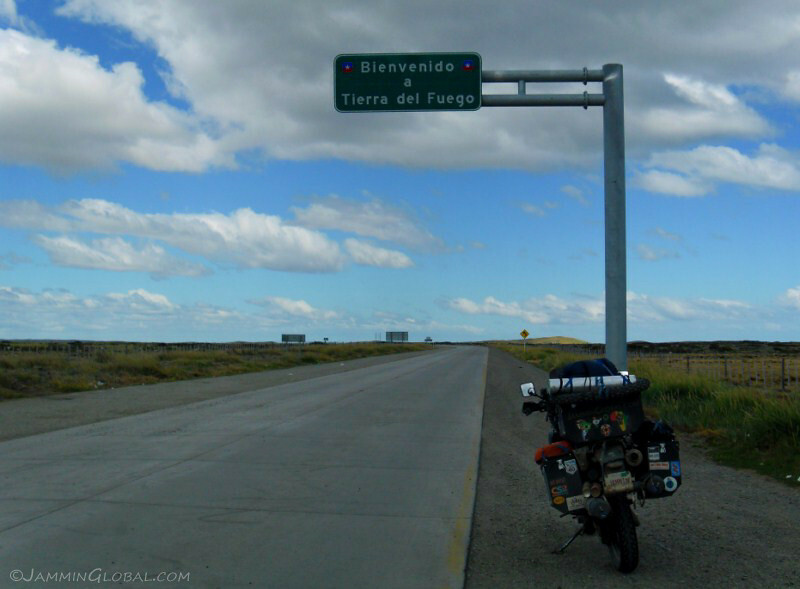 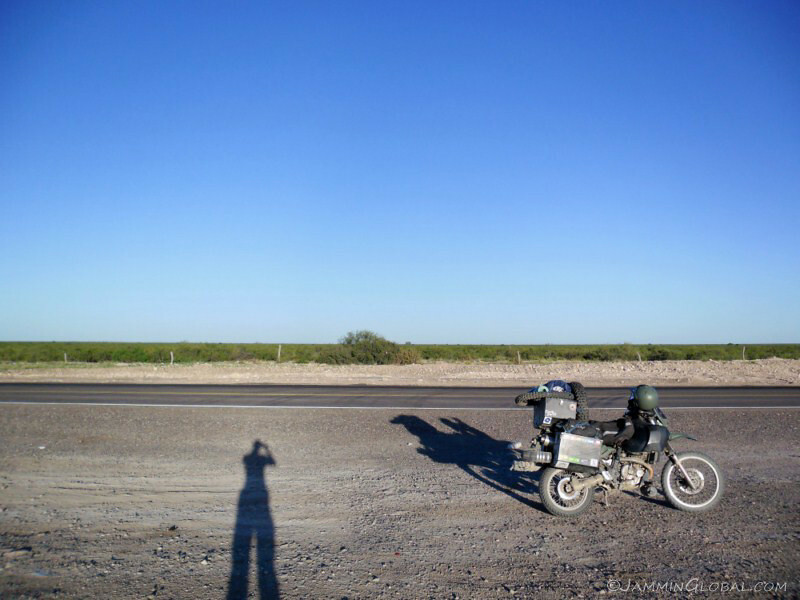 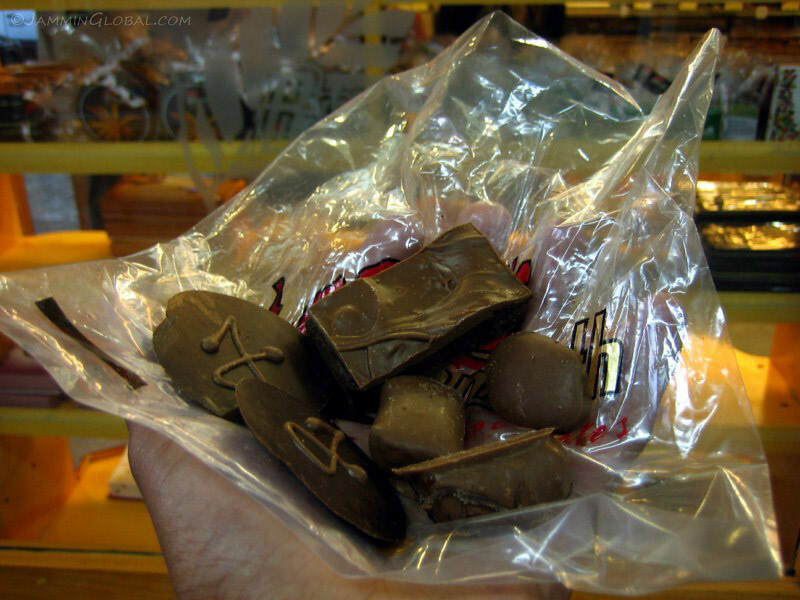 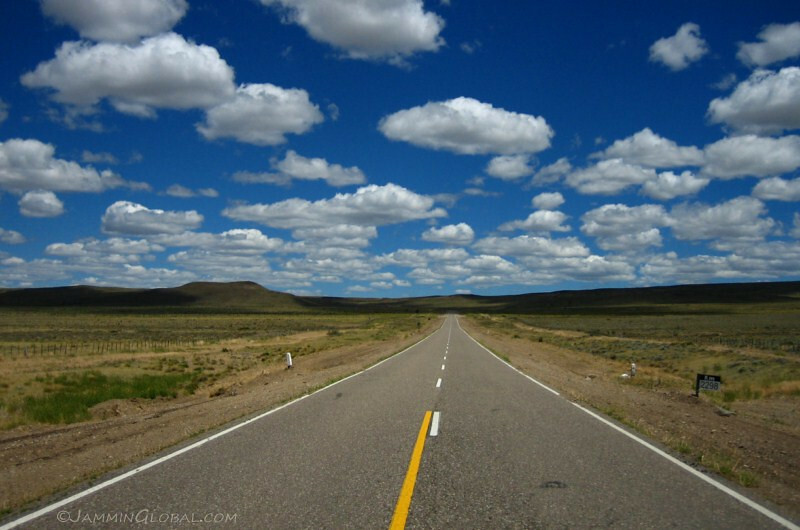 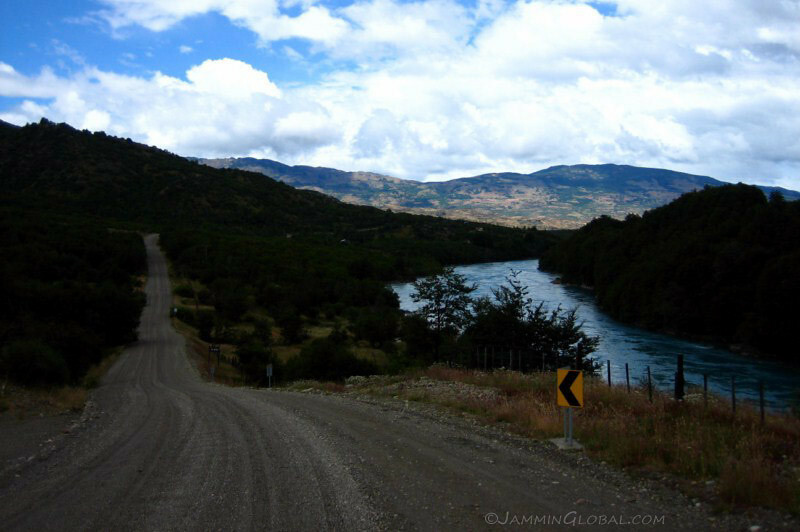 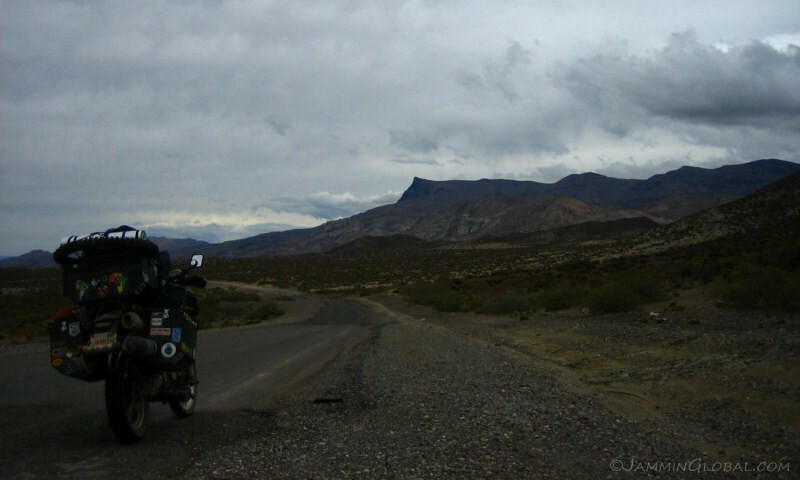 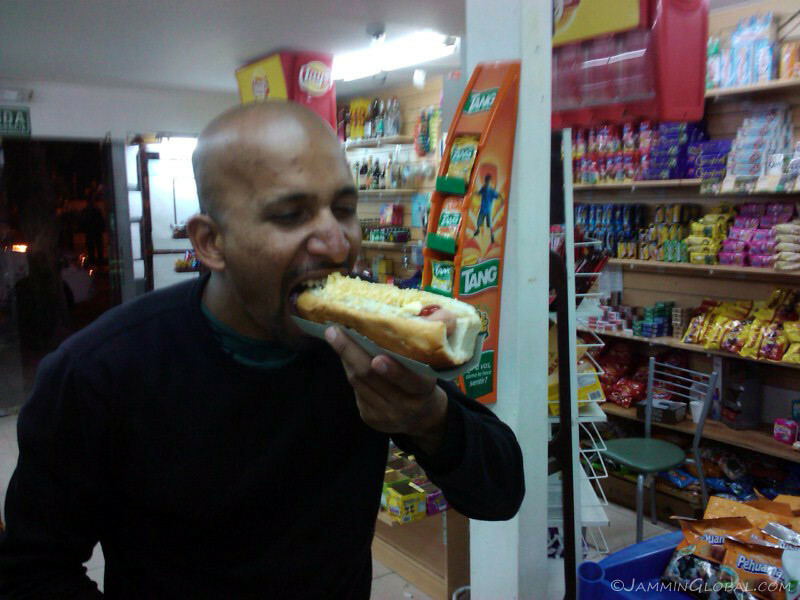 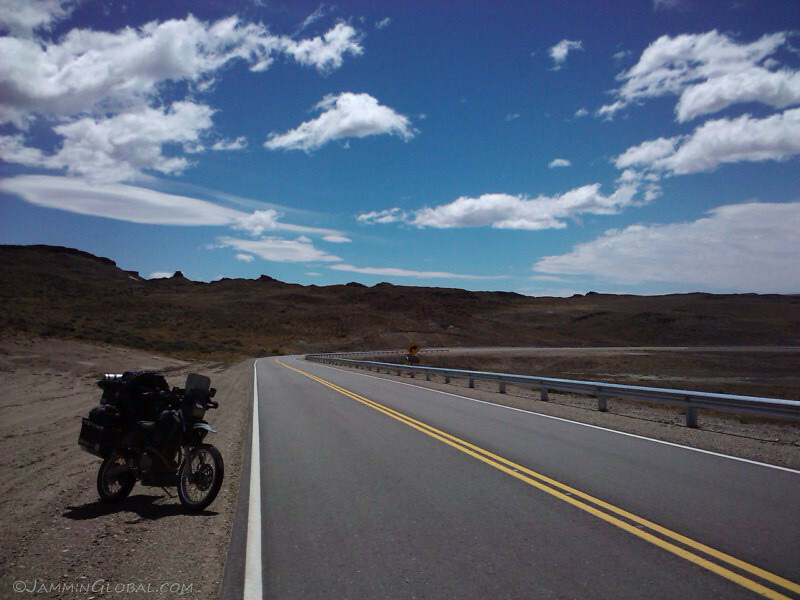 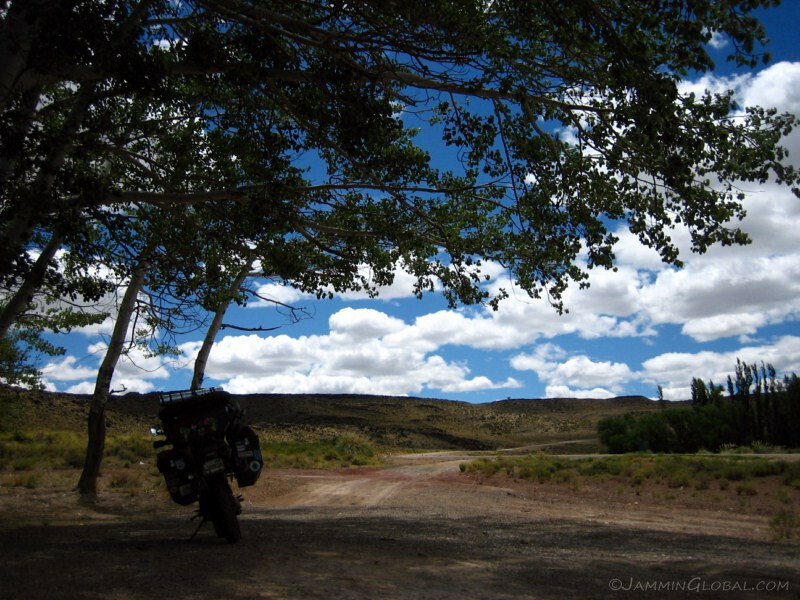 From here, there are only two ways to get back into Argentina by road. 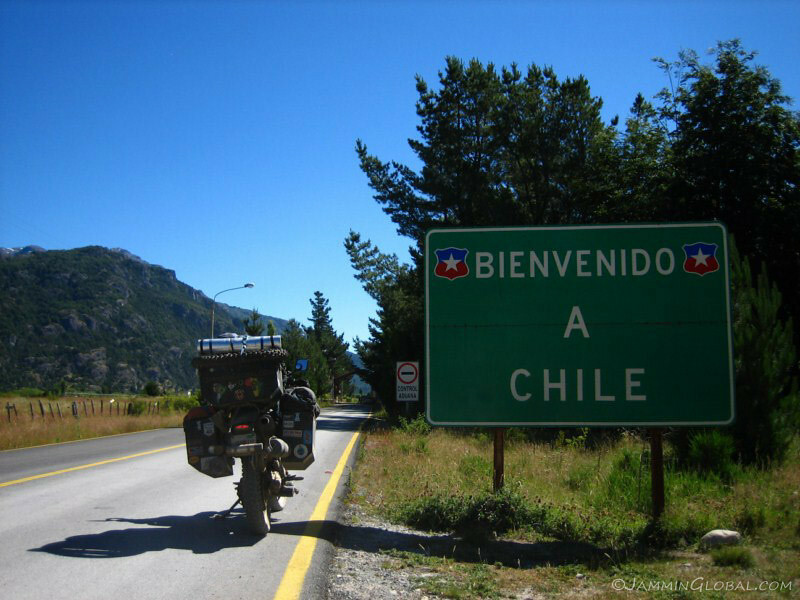 One is going east around the lake to cross at Chile Chico or a smaller border crossing a bit further south at Paso Raballos. 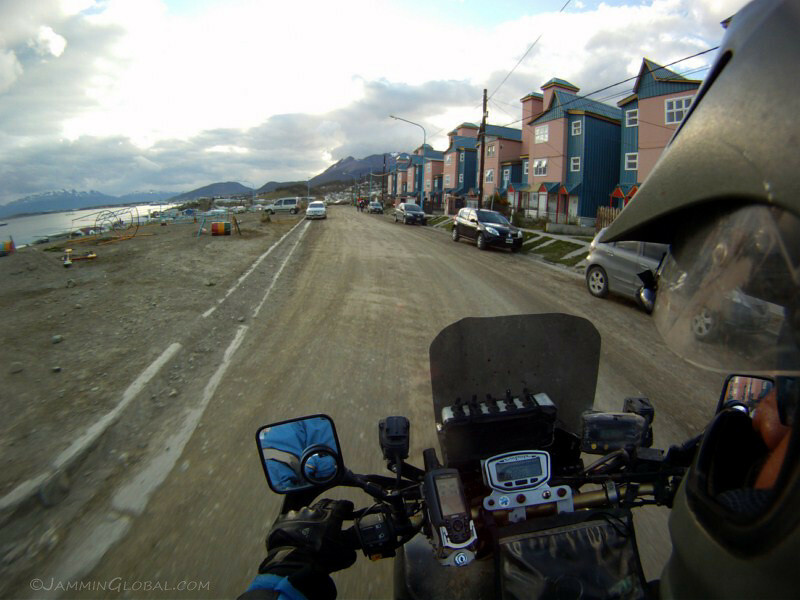 Since I was heading all the way to Villa O’Higgins, I would be back-tracking up to this junction in a few days to continue to Ushuaia. 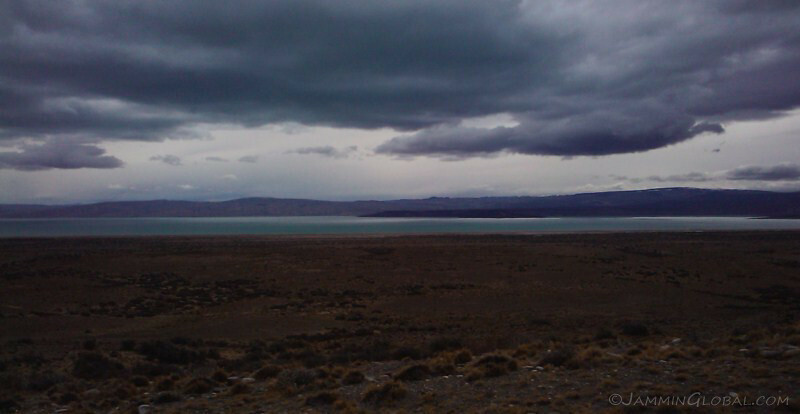 Lago Carrera General with a back drop of snow-peaked Andes and Laguna Negra in the foreground, which was considerably darker than it’s more turquoise neighbour up north. 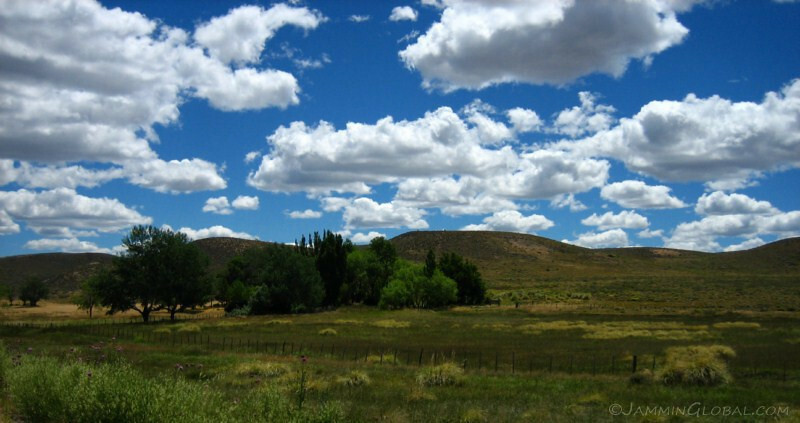 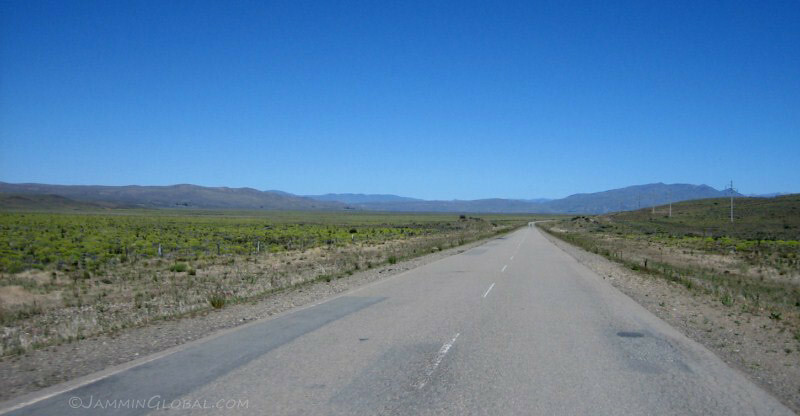 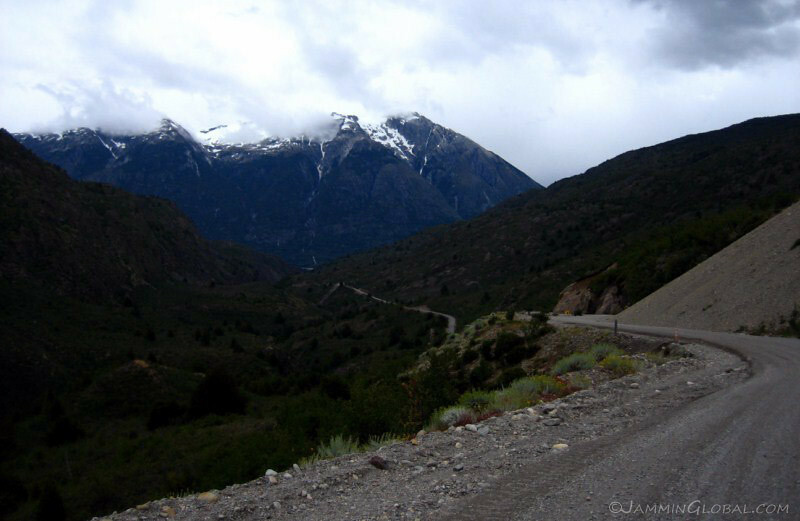 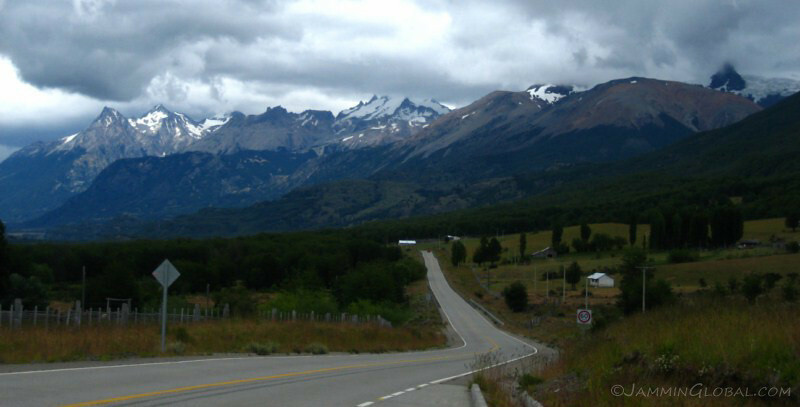 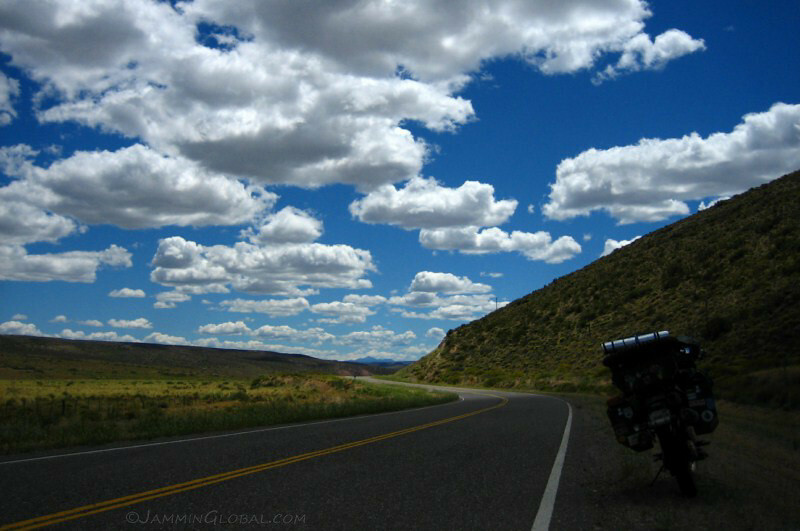 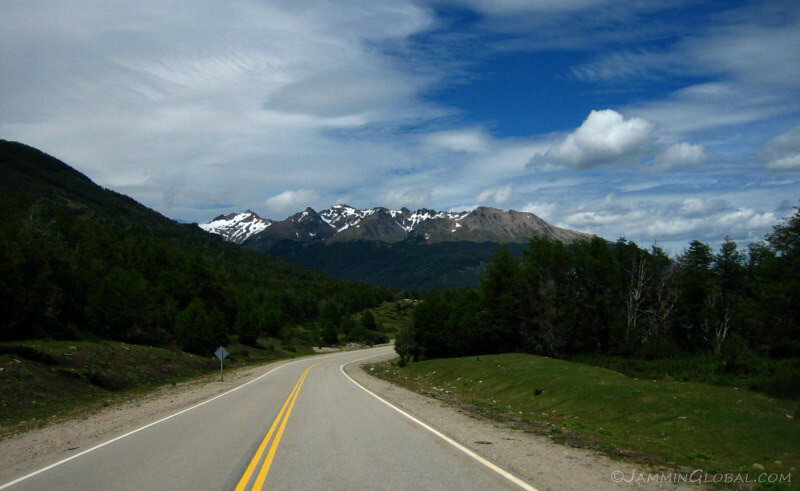 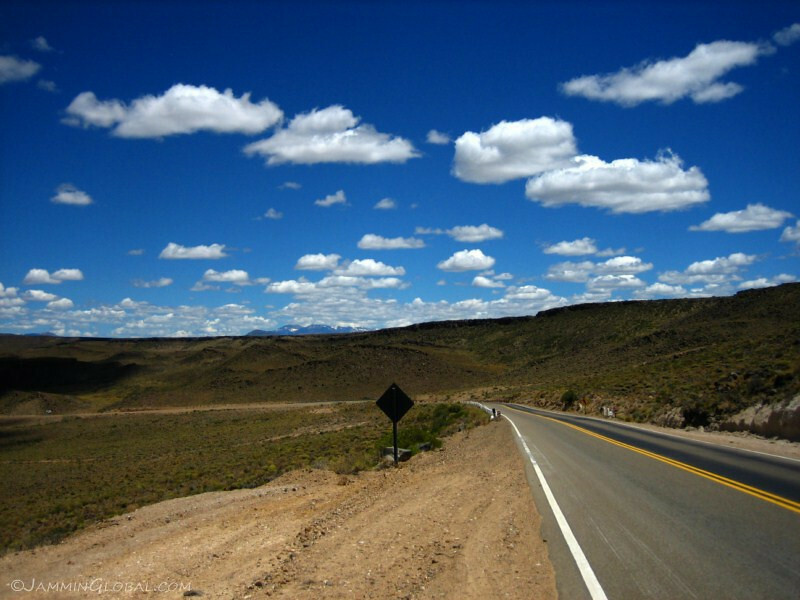 From El Maiten to Villa O’Higgins, the Carretera is even more remote than the relatively more populated region in the north. 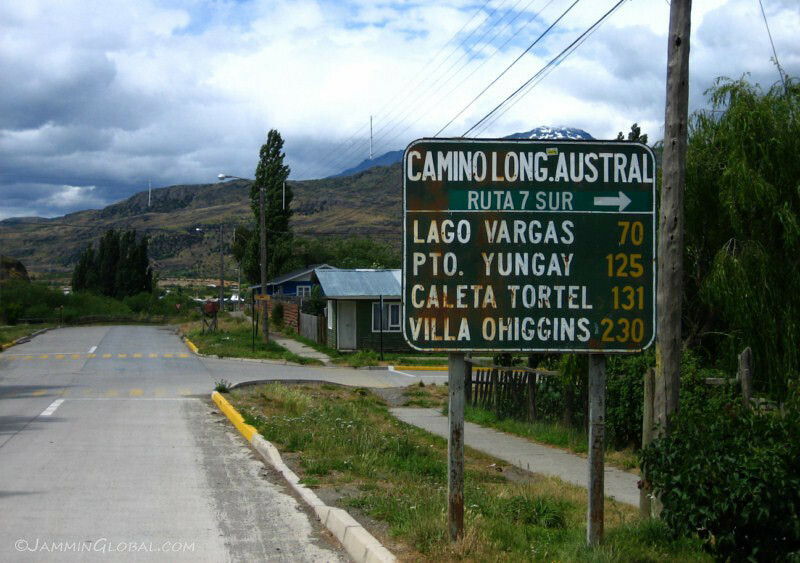 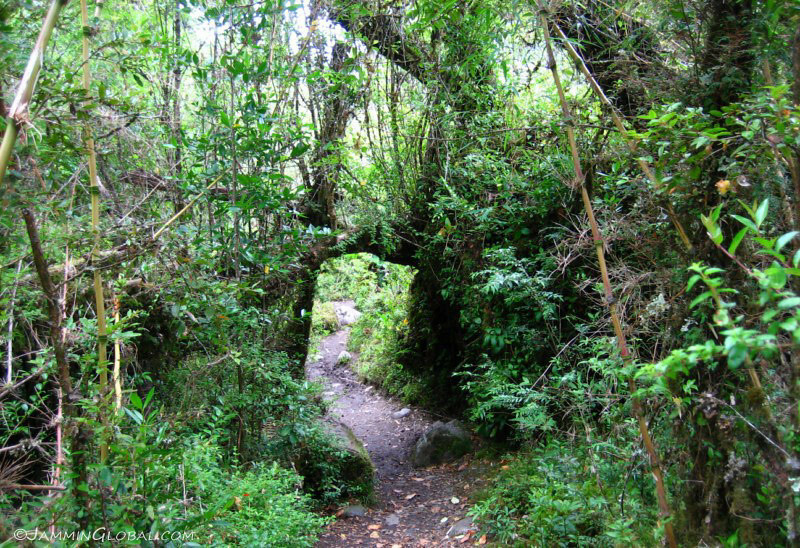 The route followed Rio Baker, which drains Lago Carrera General to the Pacific. 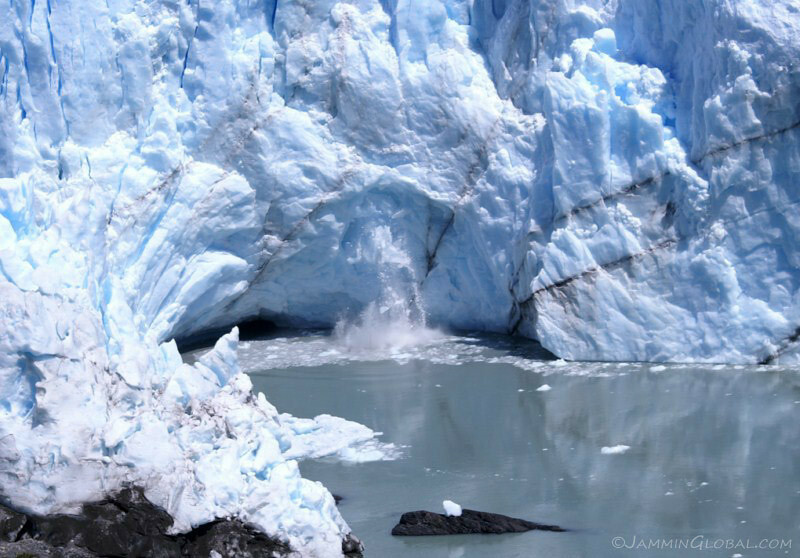 The river flows along the eastern edge of the Northern Patagonian Ice Field, the largest continuous mass of ice besides the polar regions. 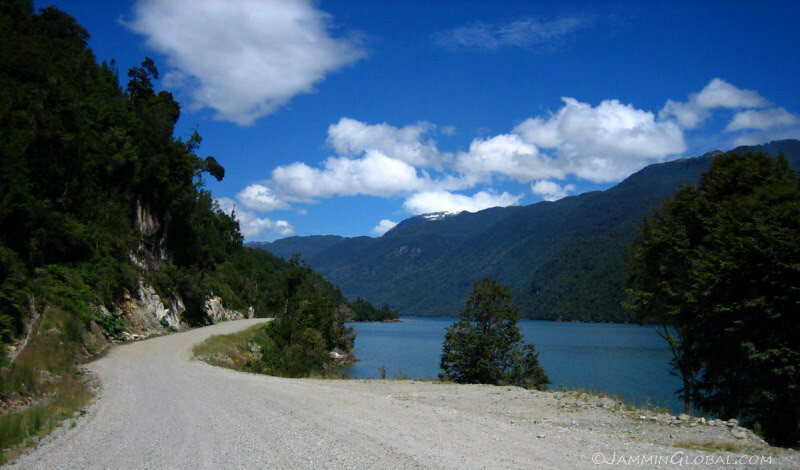 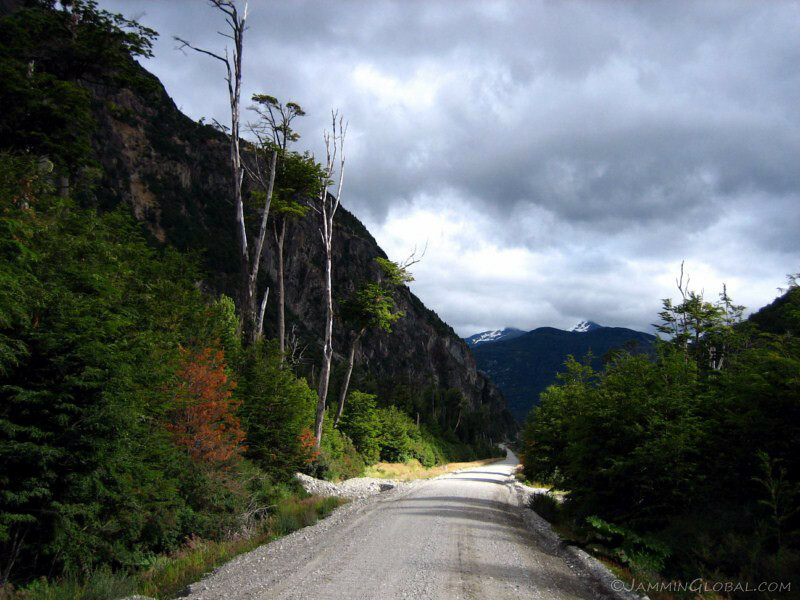 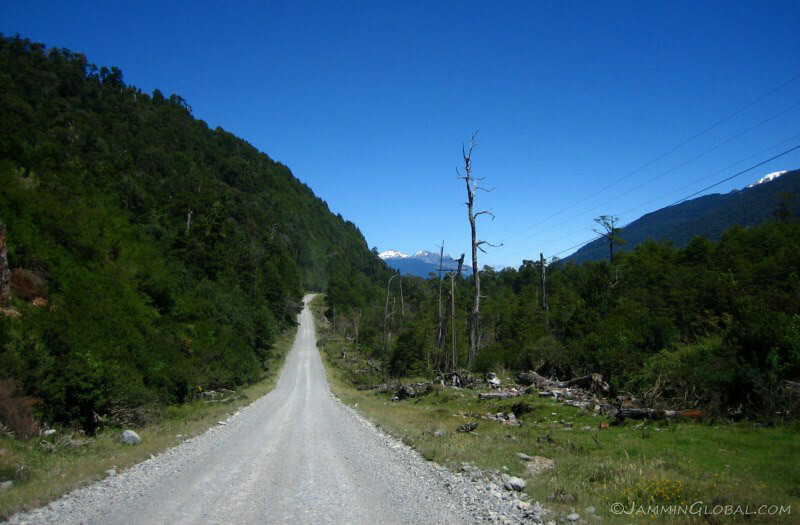 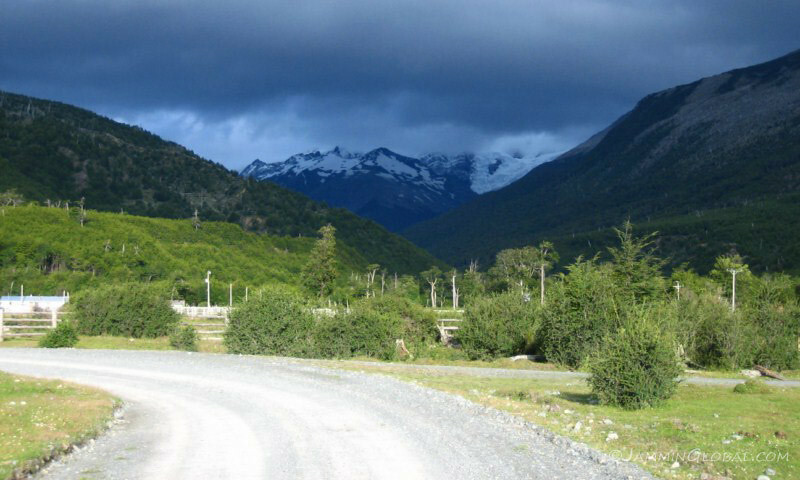 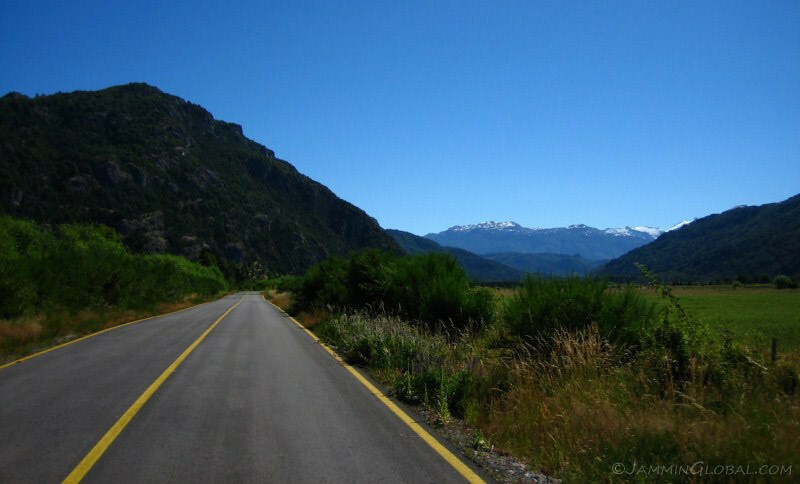 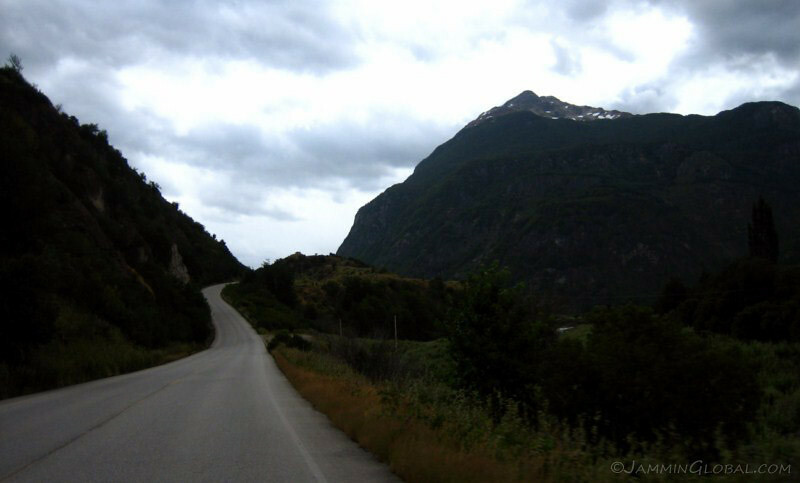 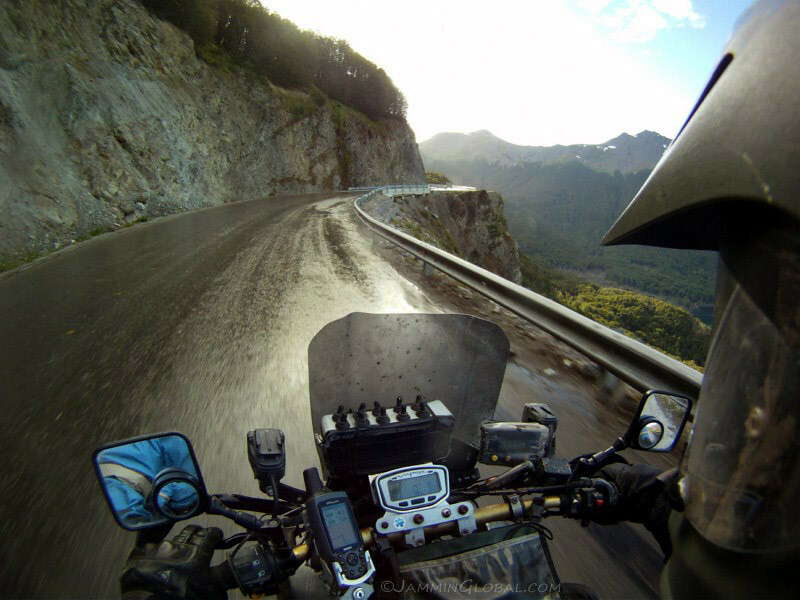 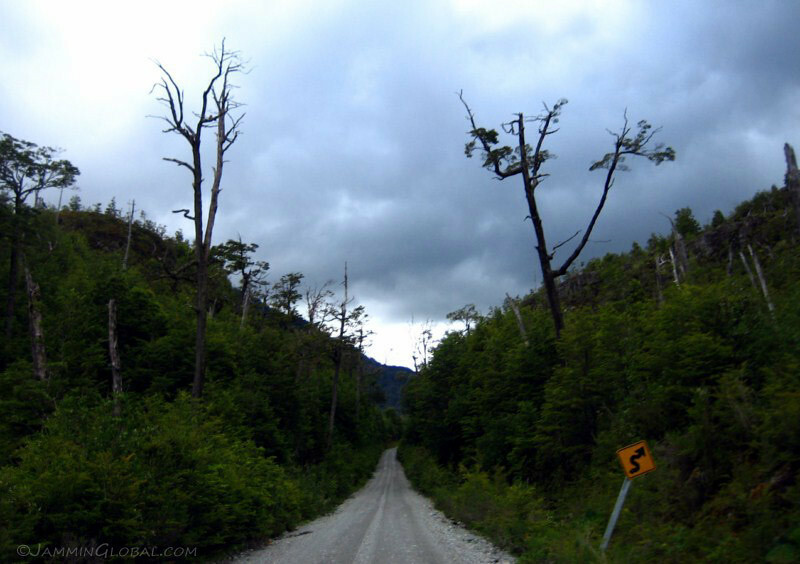 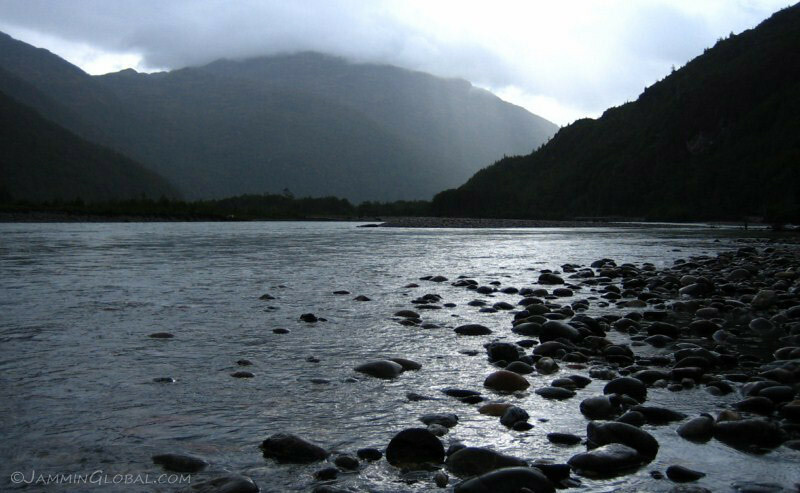 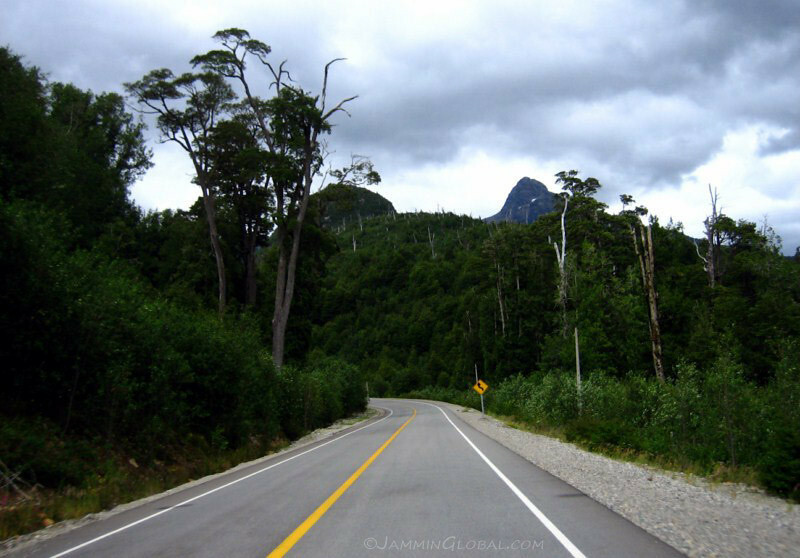 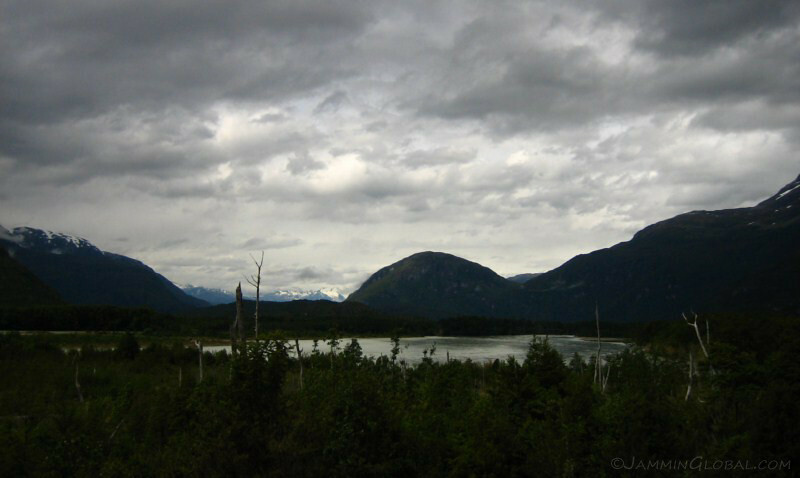 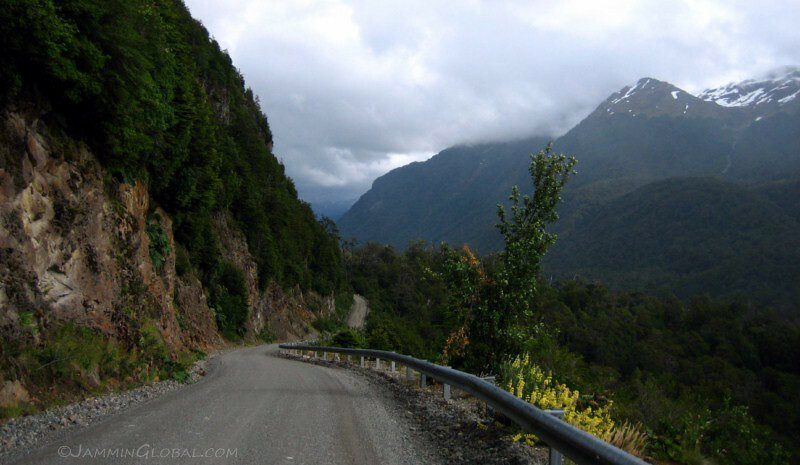 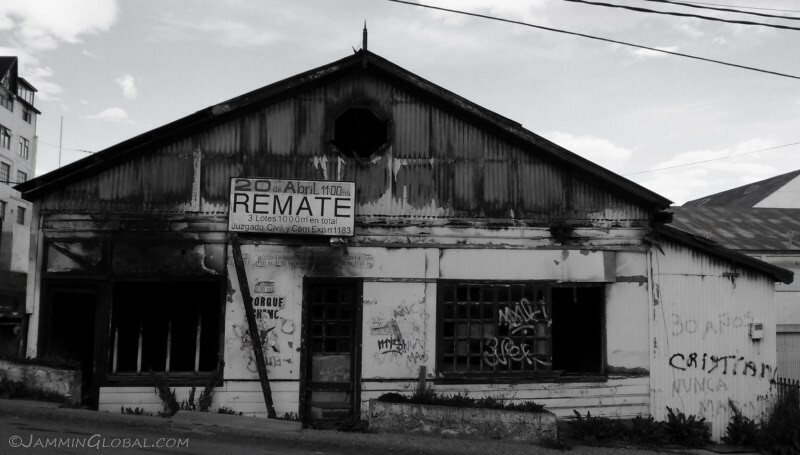 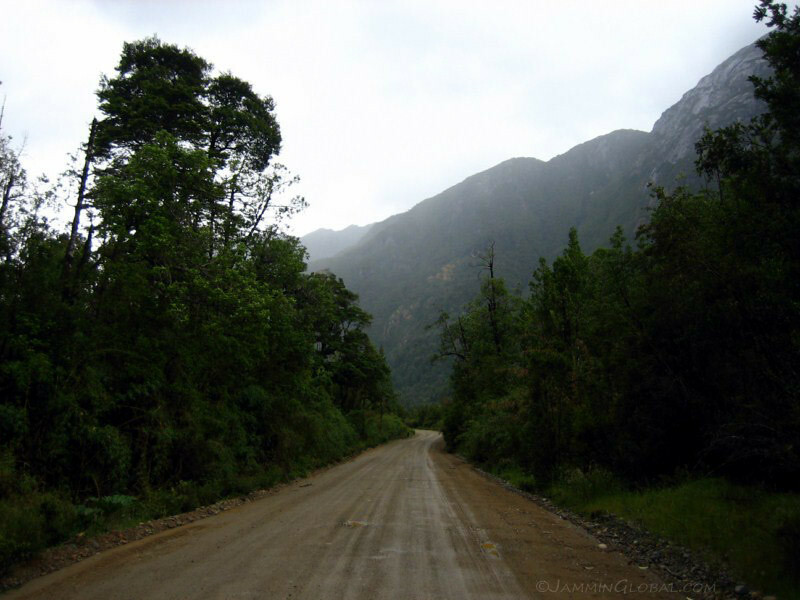 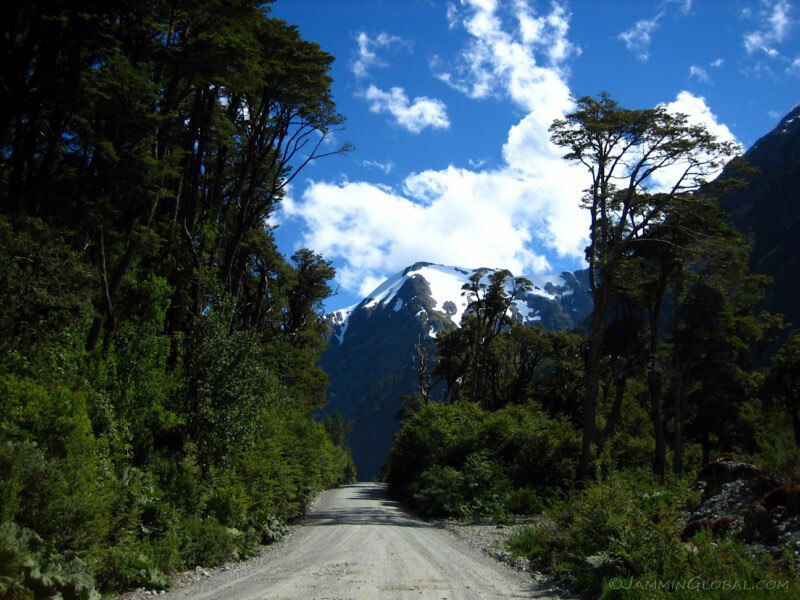 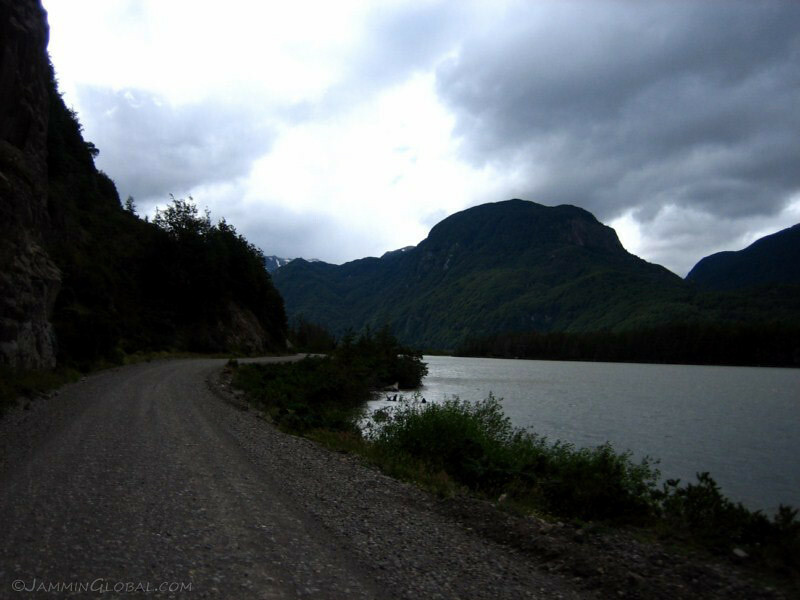 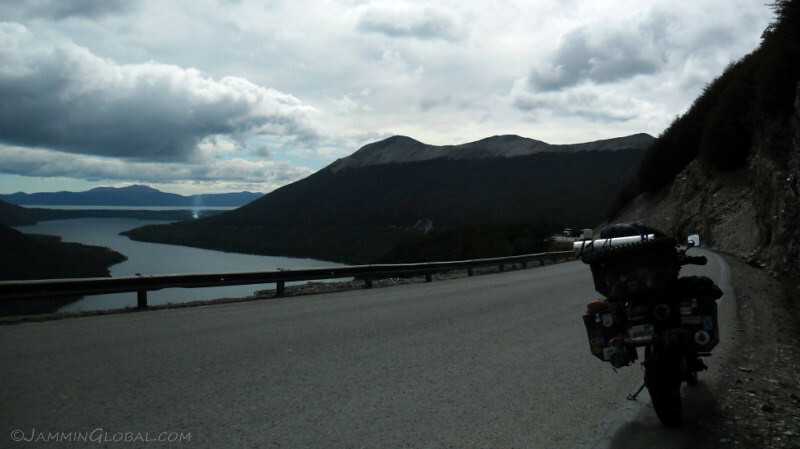 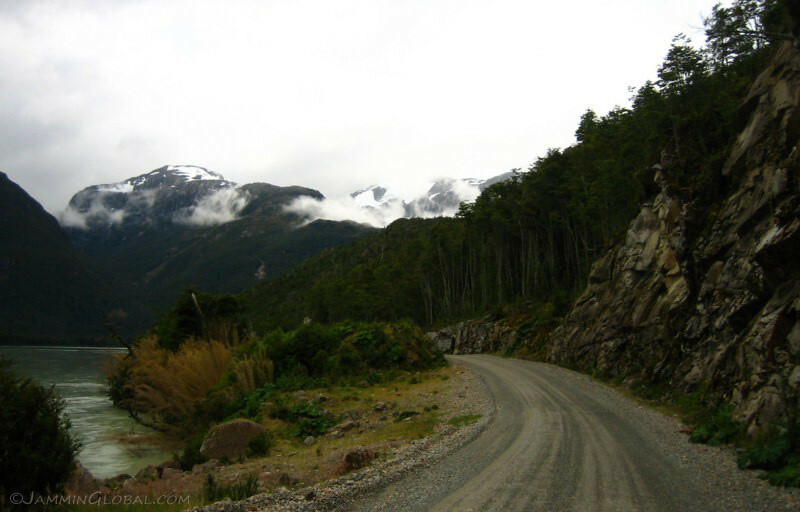 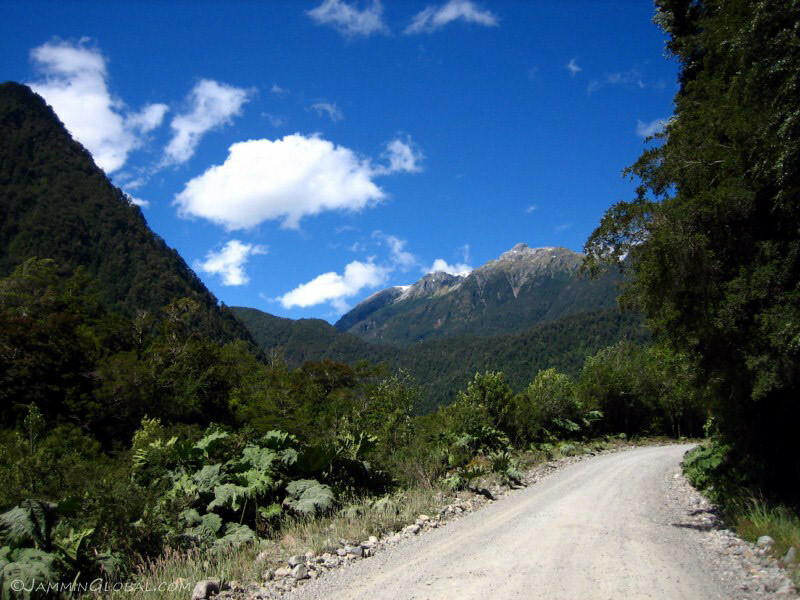 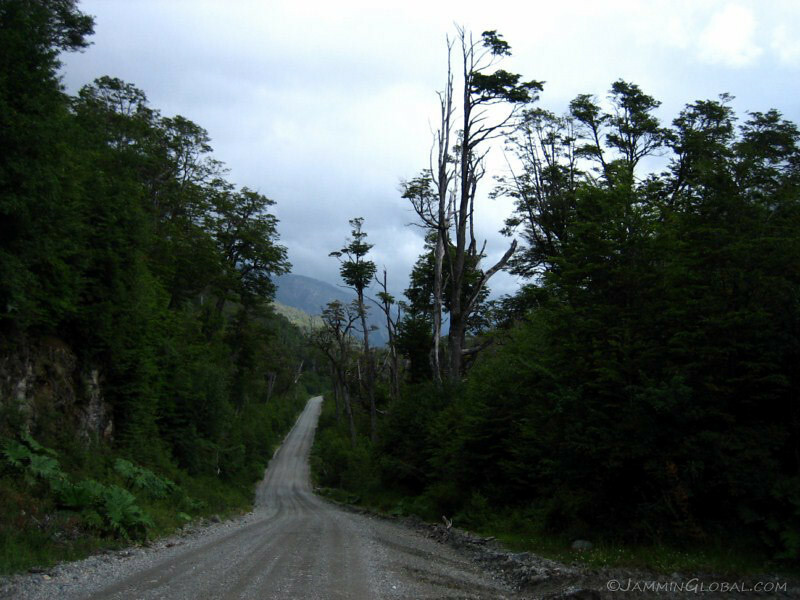 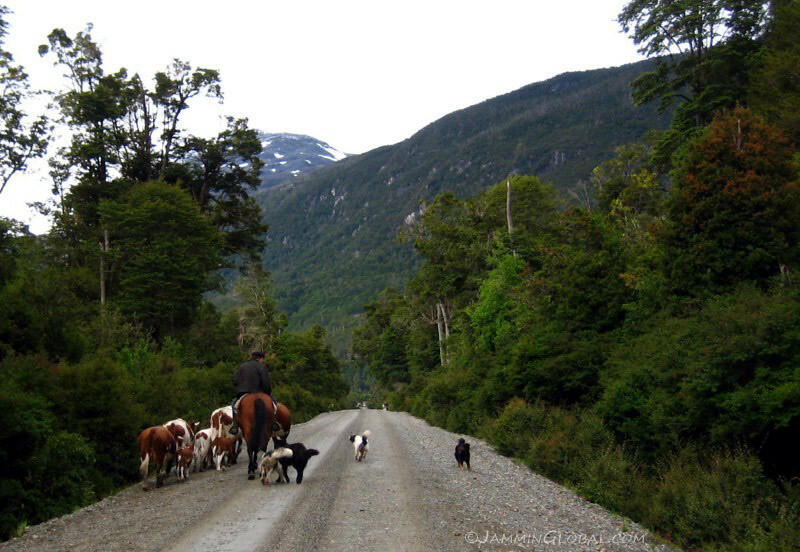 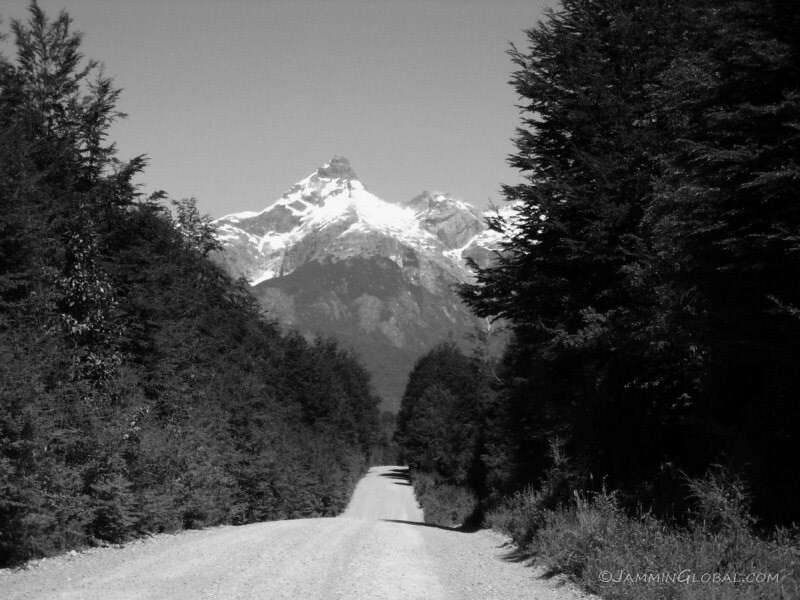 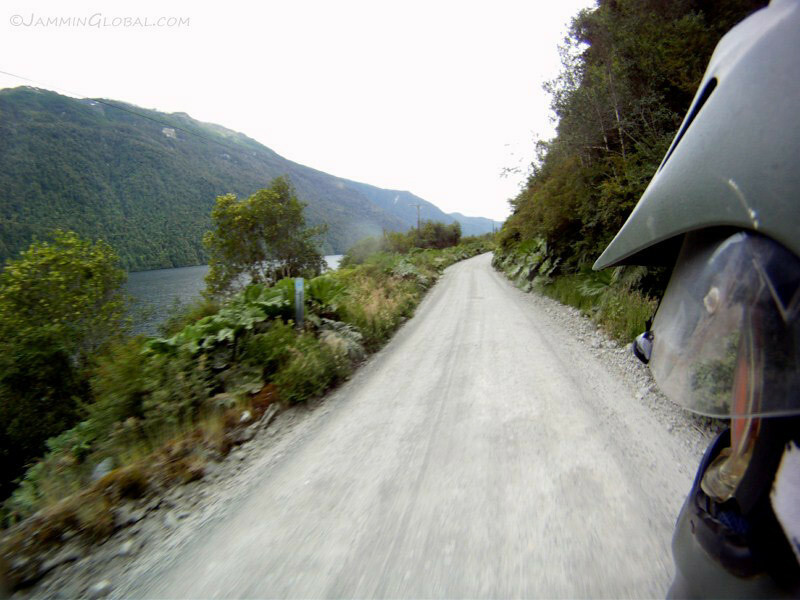 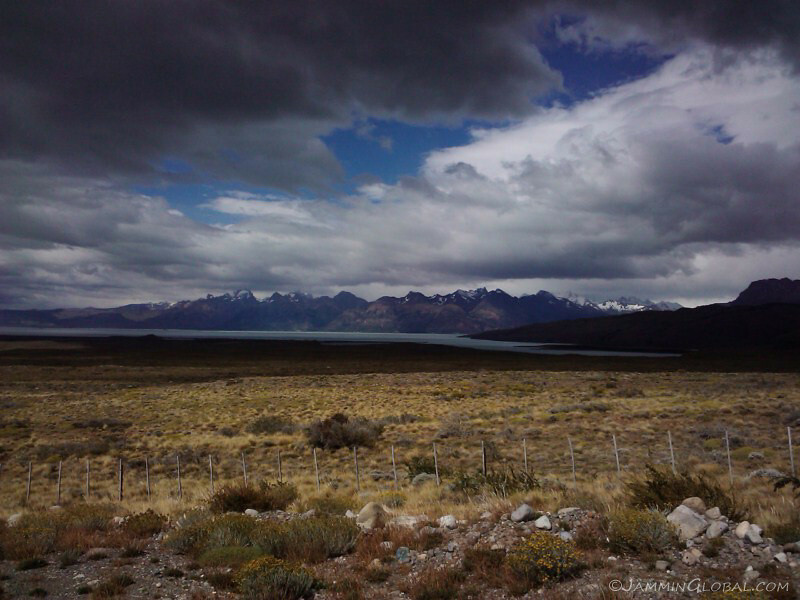 The changing characteristics of the Carretera Austral. 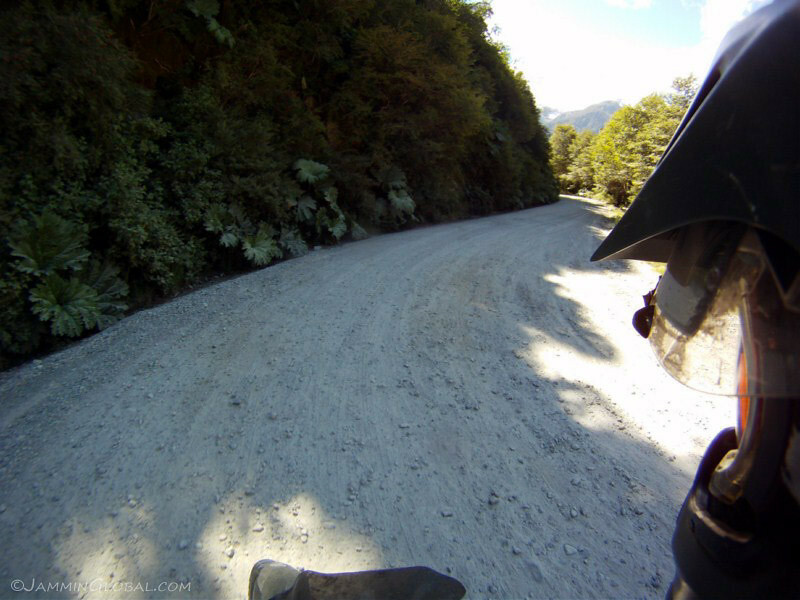 The route climbed more into the mountains compared to the relatively flat riding in the past few days. 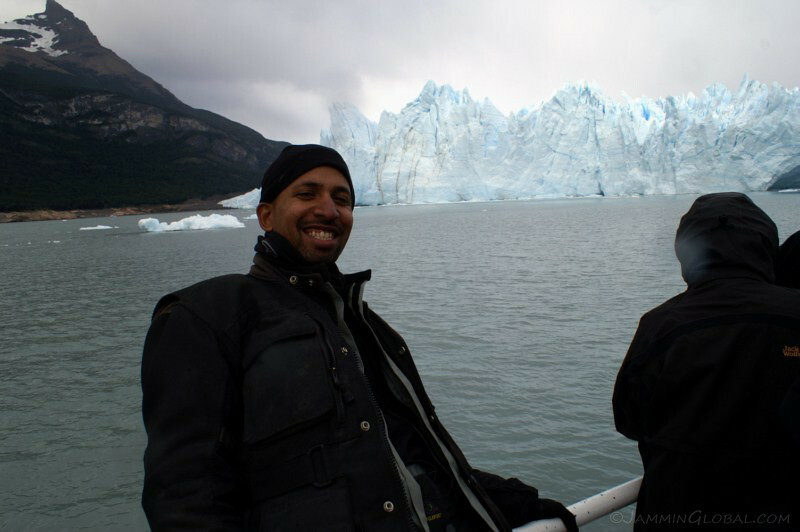 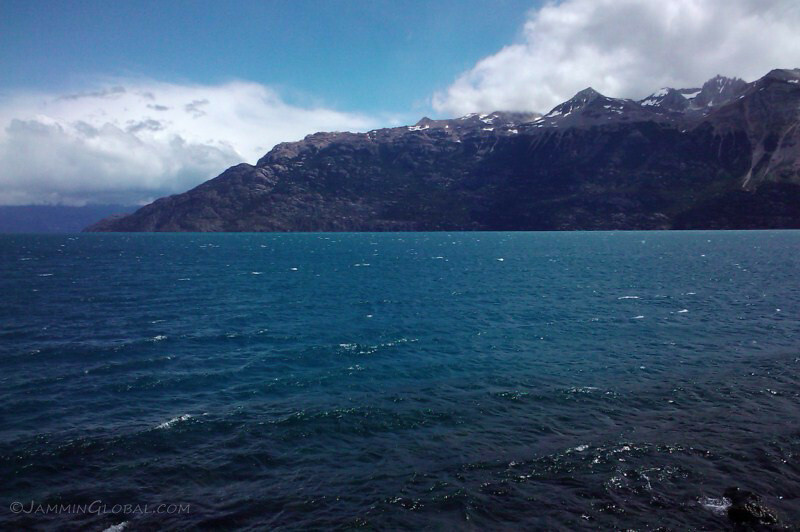 Rio Baker and the glaciated turquoise waters of Patagonia. 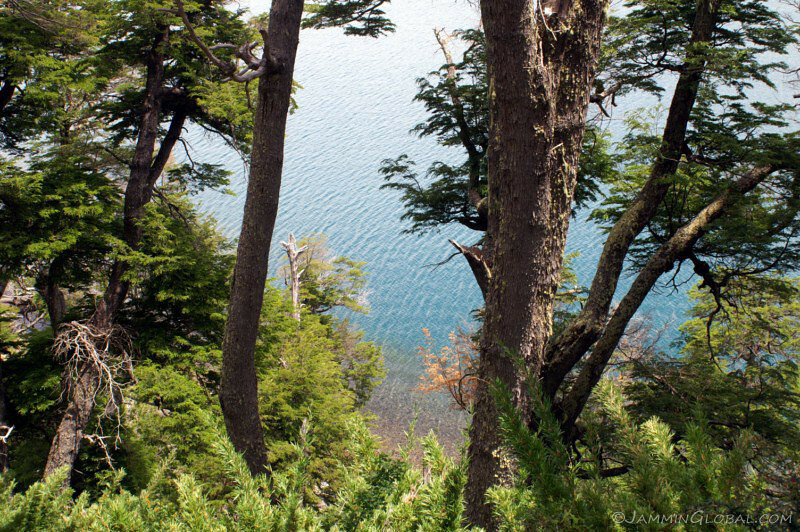 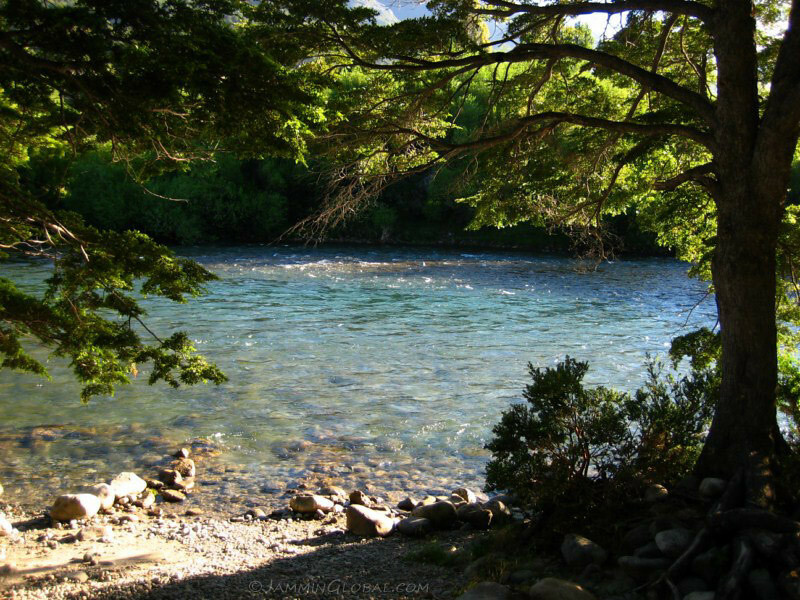 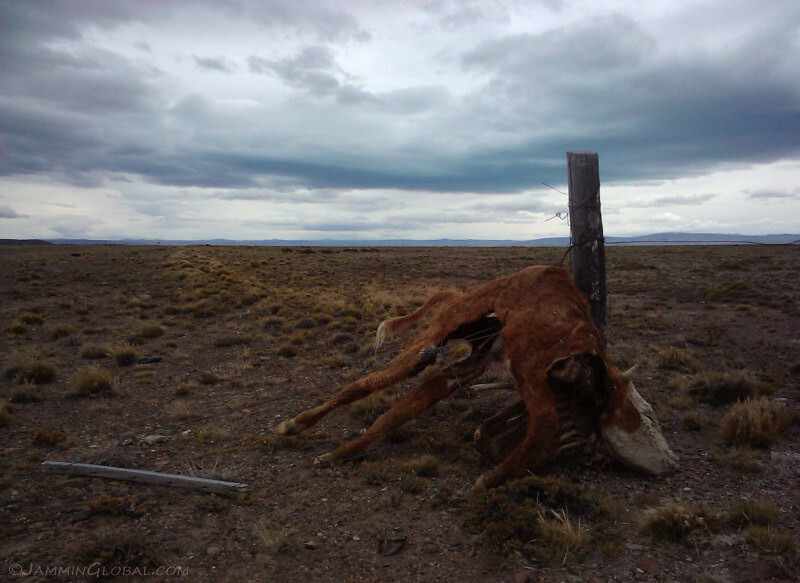 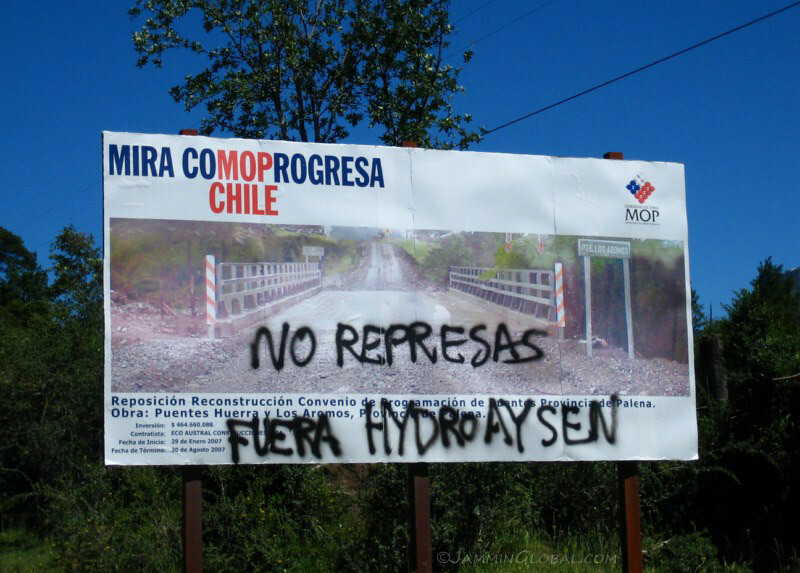 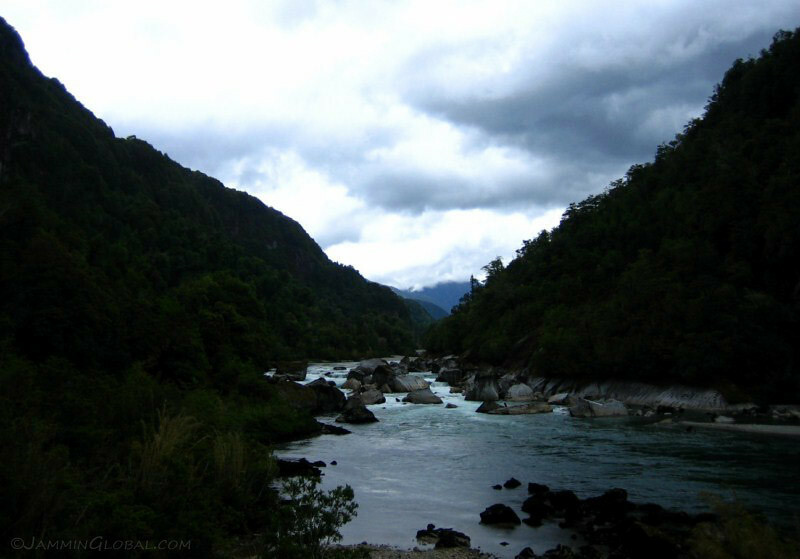 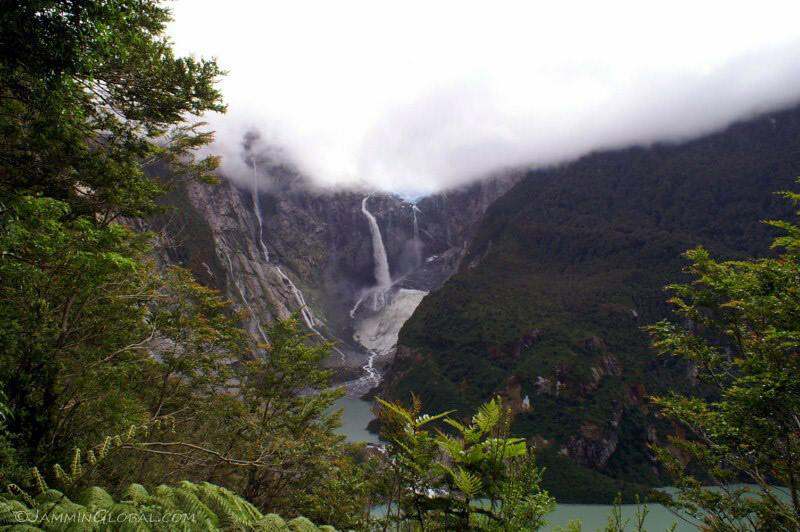 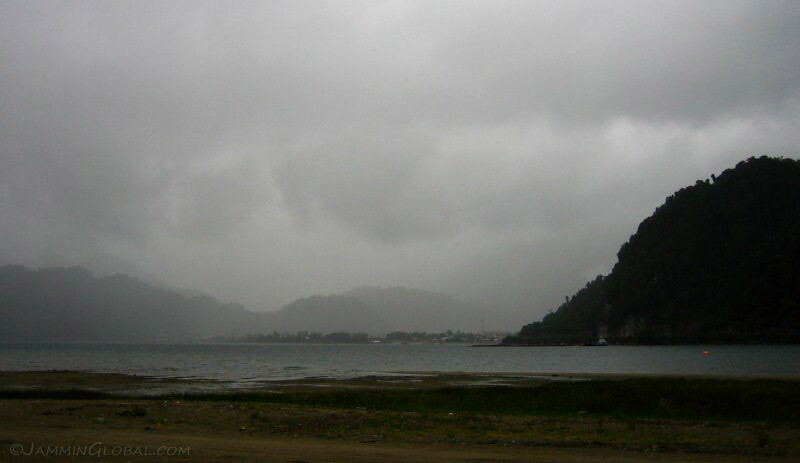 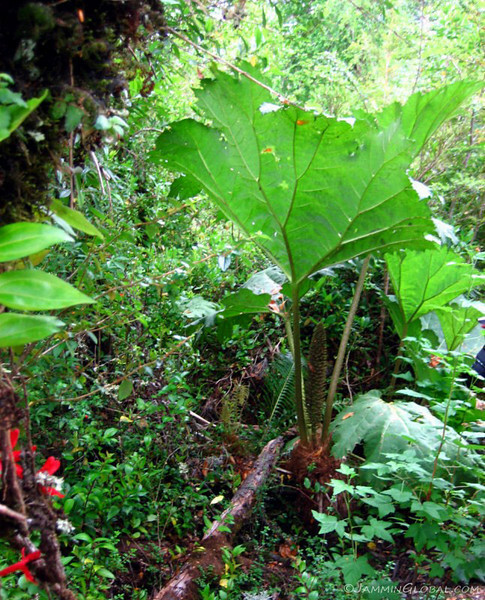 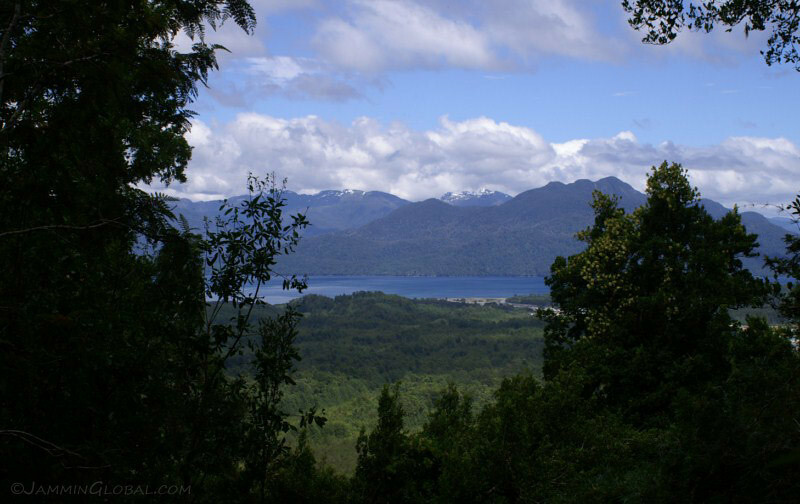 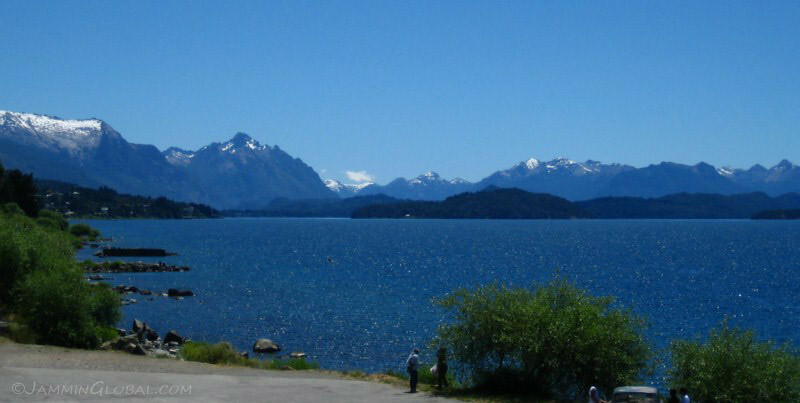 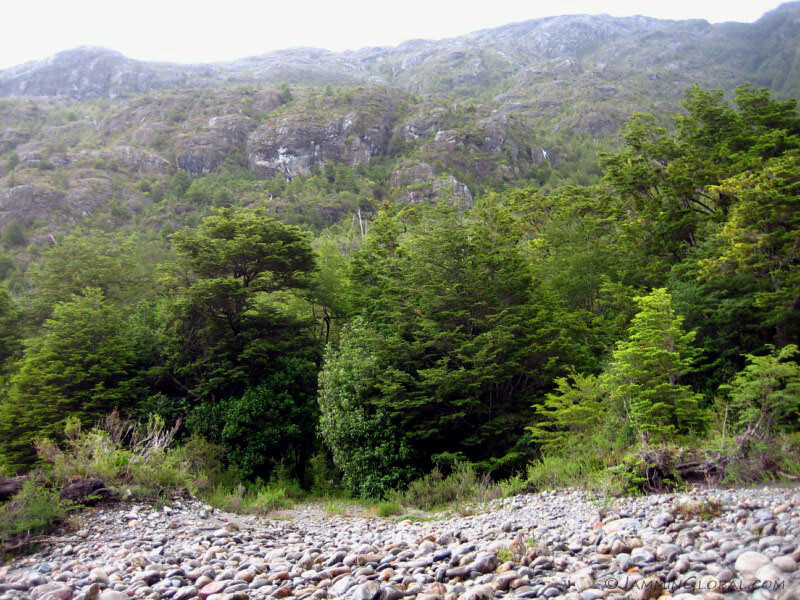 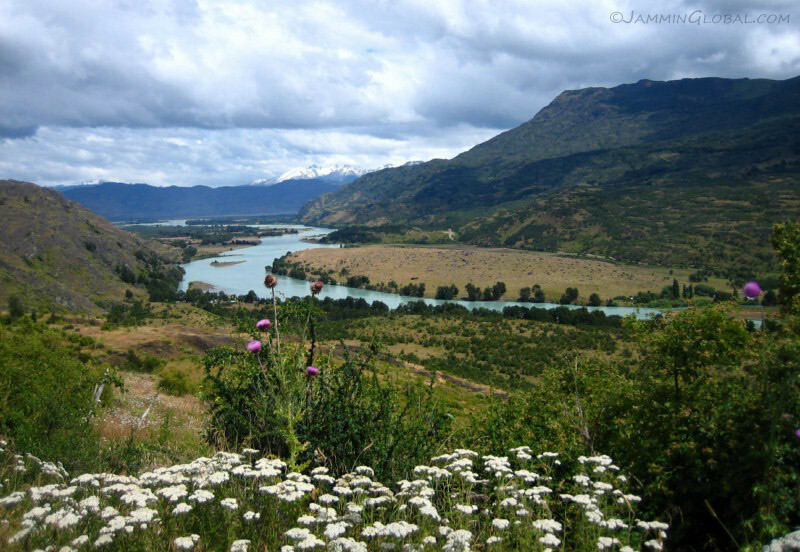 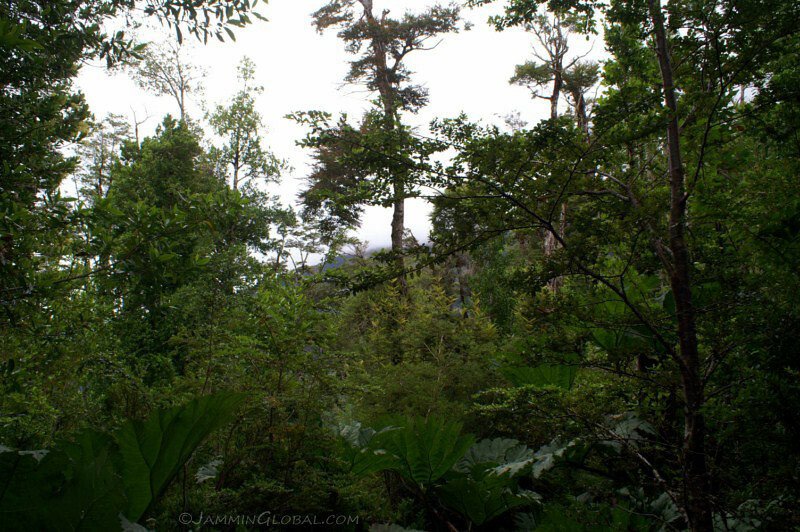 This is the site of the proposed dam by HidroAysén. 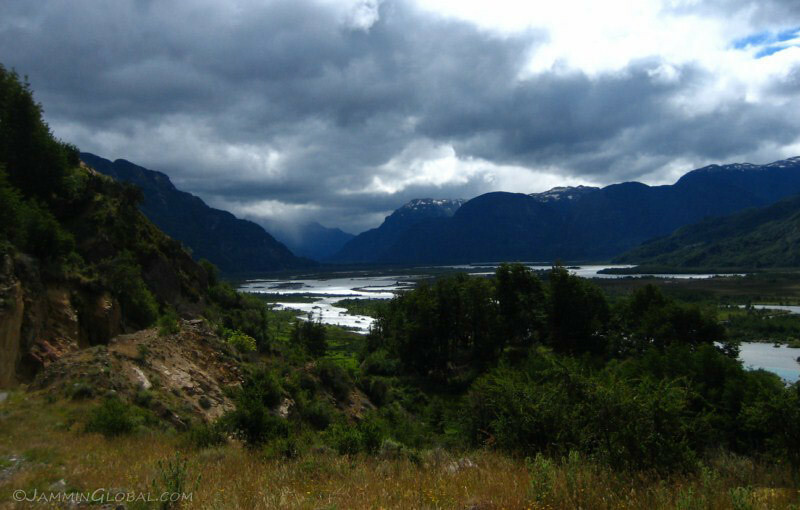 They want to flood this valley and generate power. 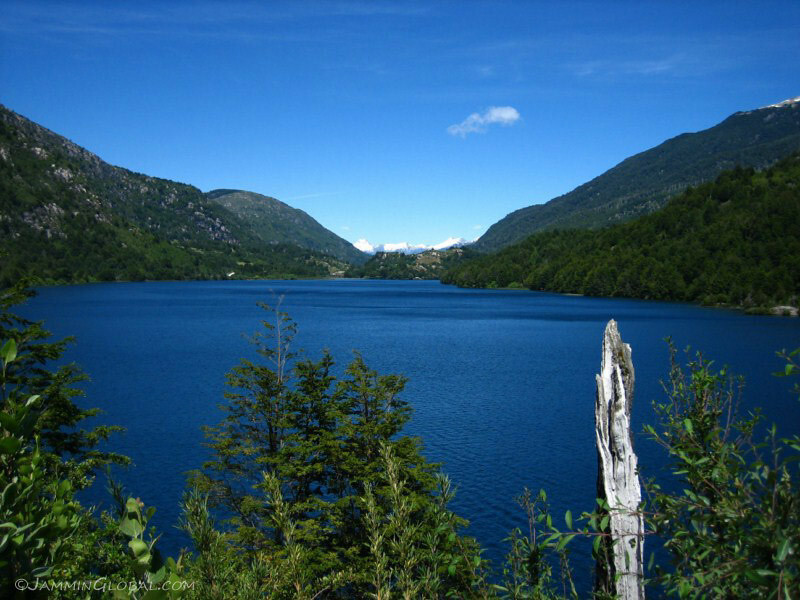 The company bought the water rights to this area during the dictatorship of Augusto Pinochet and thankfully haven’t been able to capitalize on it, yet. 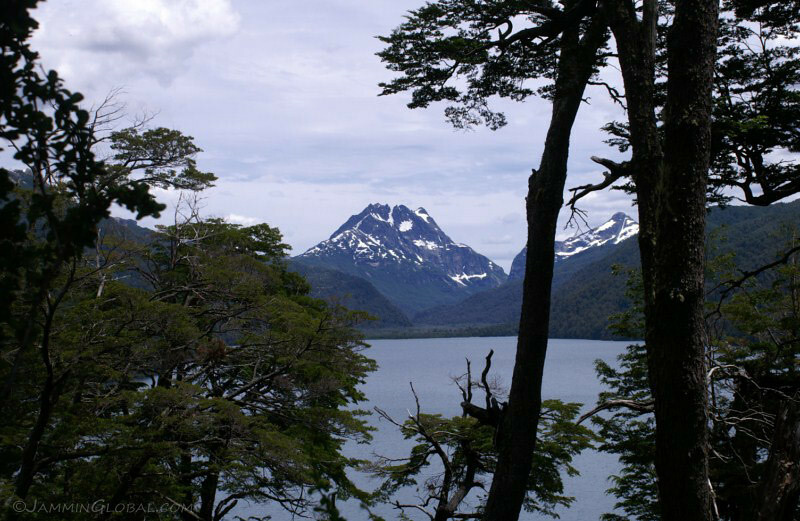 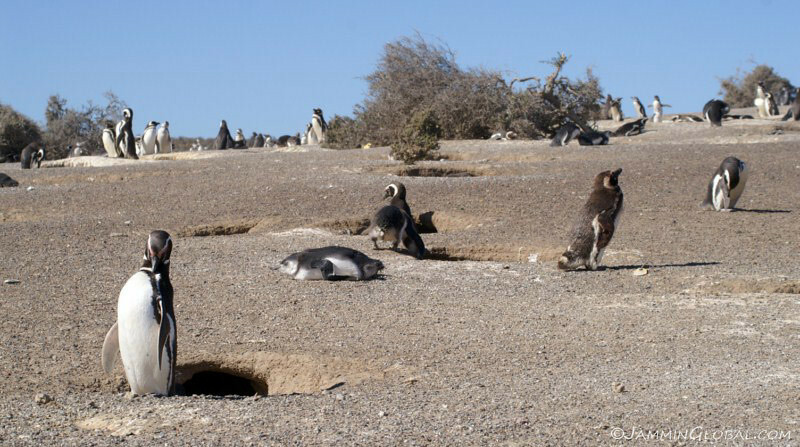 Besides the issue of destroying natural beauty, Chile sits on the Pacific Ring of Fire and its frequent seismic activity is well-known. 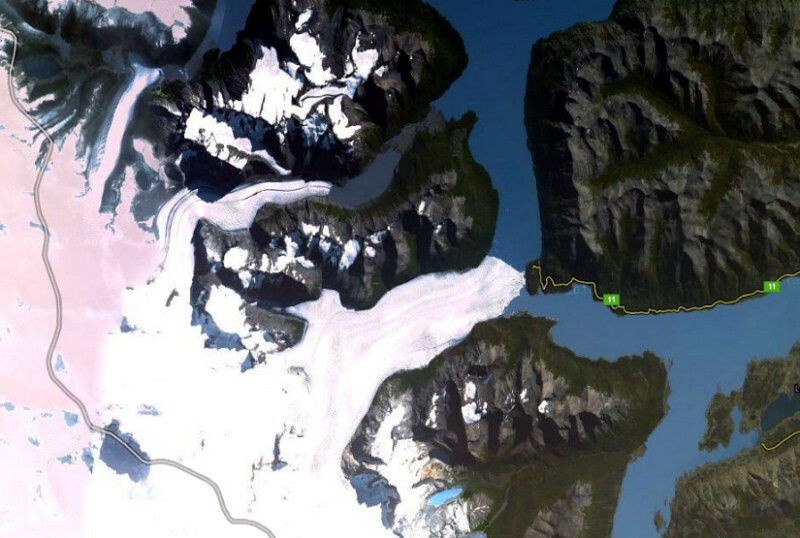 Does it make sense to build a huge dam in a place that could possibly experience a massive earthquake? 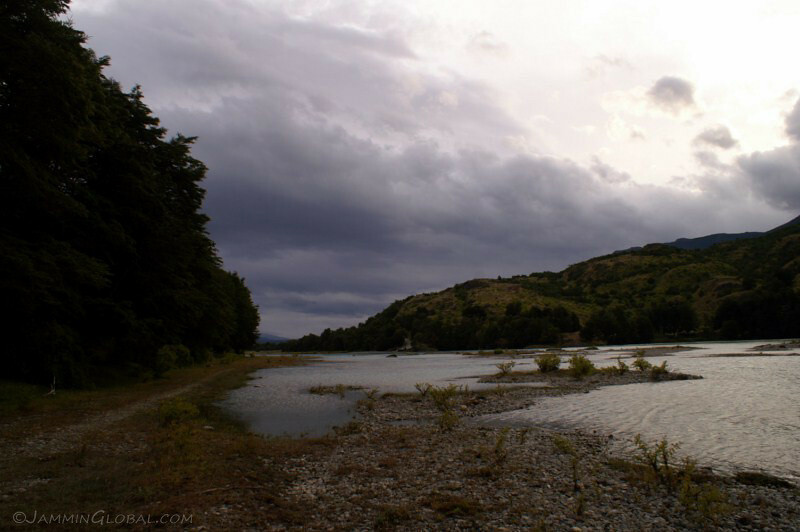 I hope the recent disaster at Japan’s Fukushima Daiichi nuclear plant with make authorities around the world pay more attention to the consequences of building risk into unstable places. 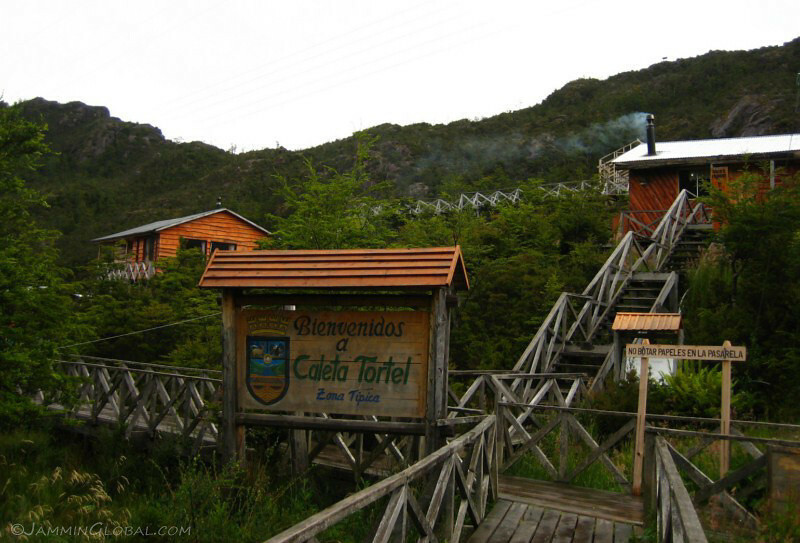 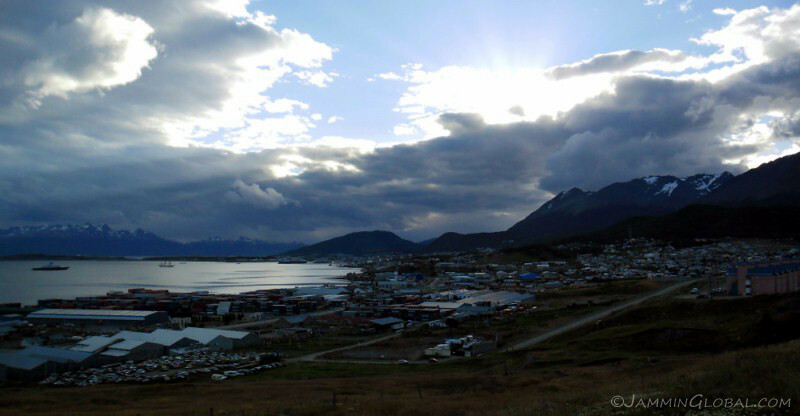 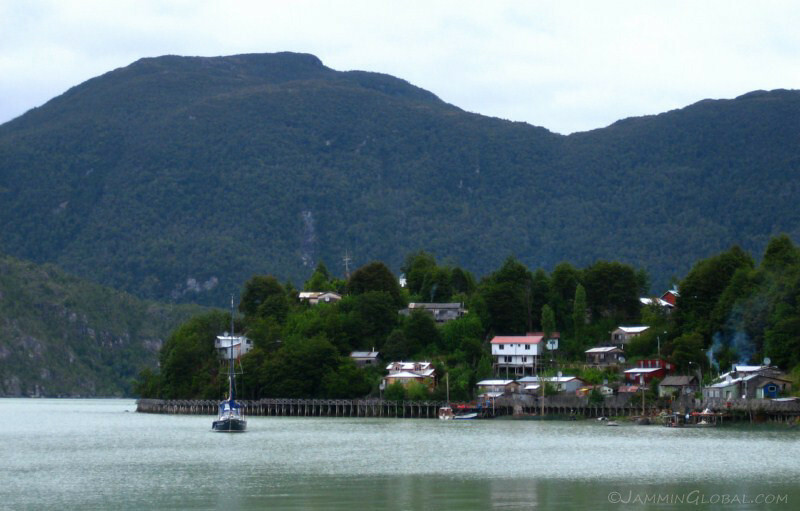 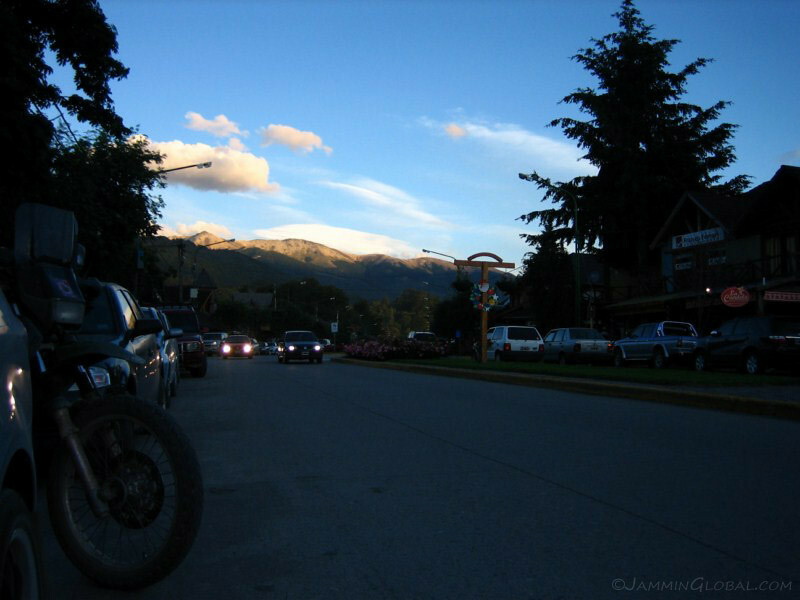 Passing through the biggest town in the southern half of the Carretera Austral of Cochrane. 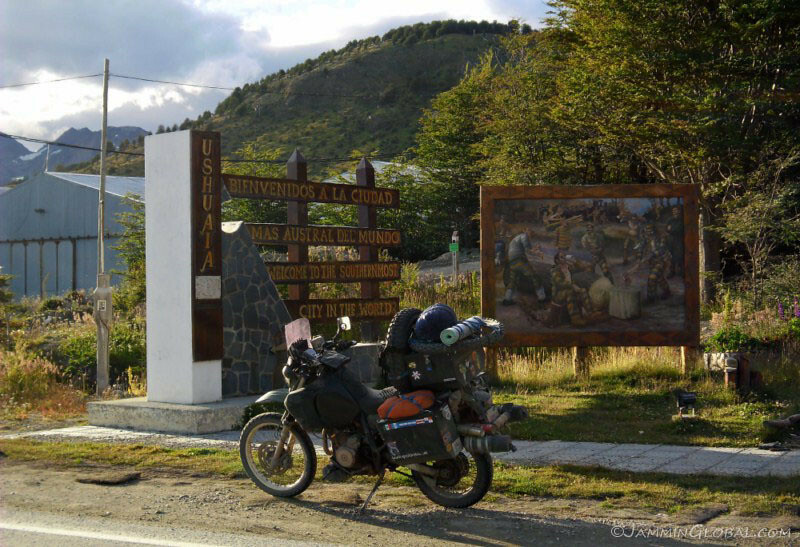 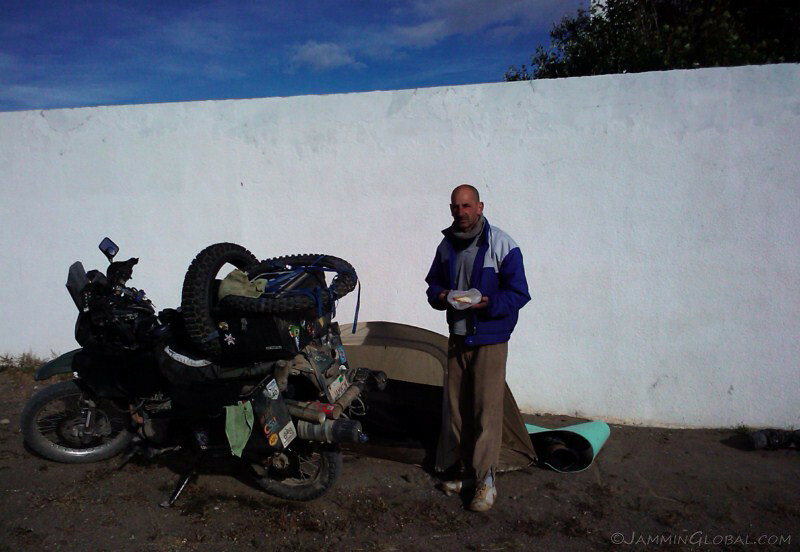 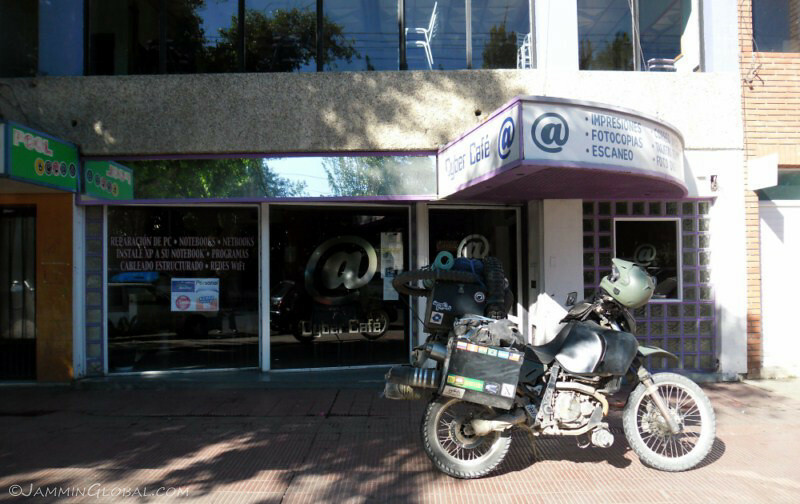 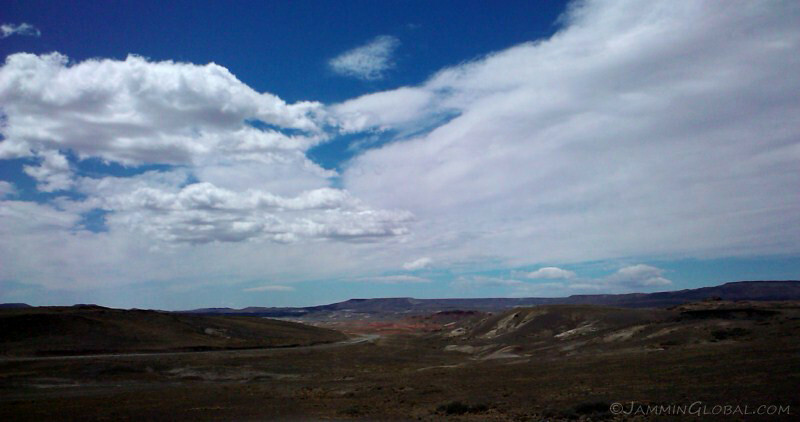 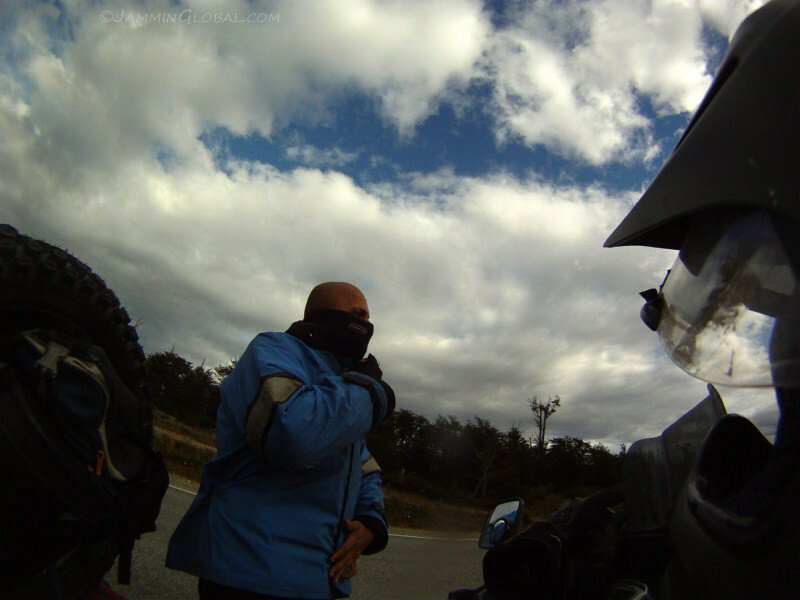 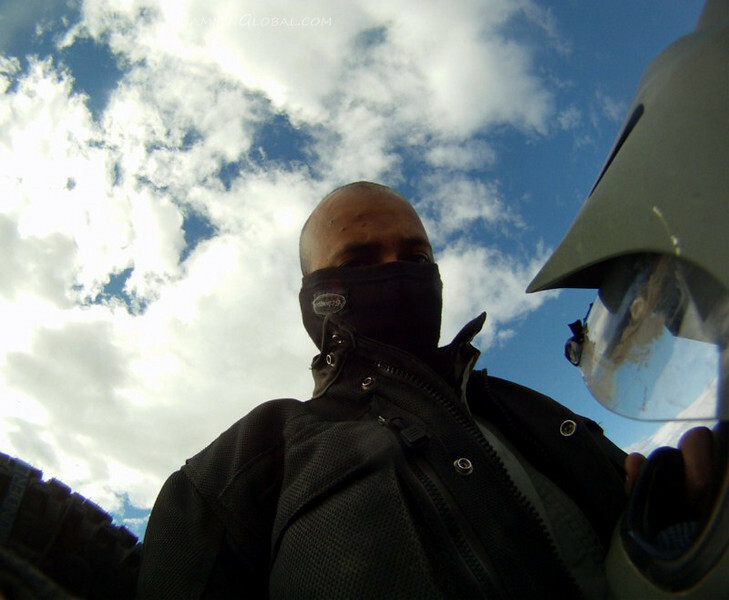 I topped up with petrol and was heading for Puerto Yungay. 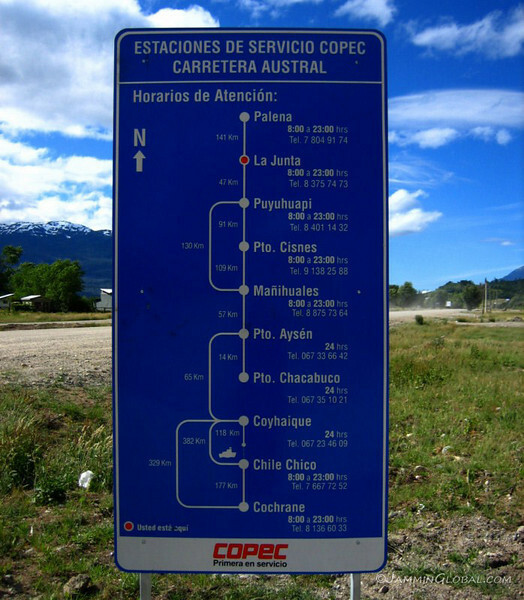 A signboard in Cochrane informing of the ferry schedule for the ride to Villa O’Higgins. 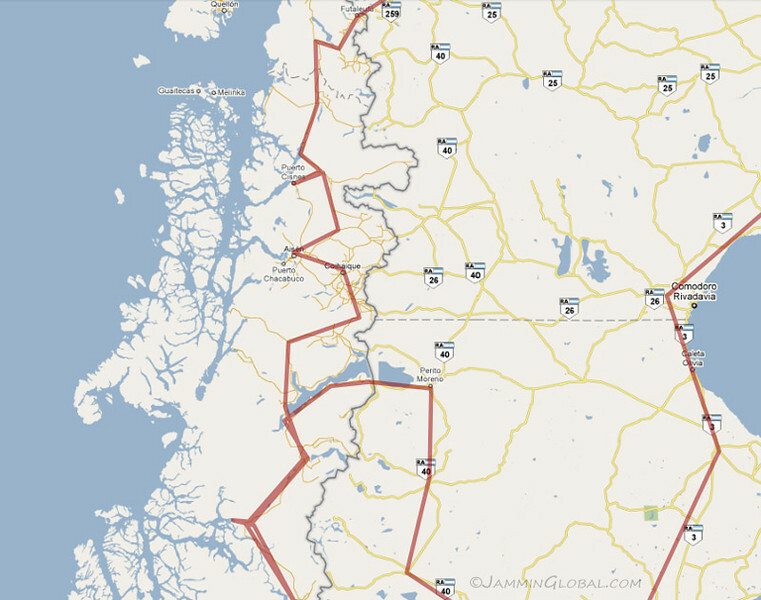 The route flattened out a bit before heading for those mountains. 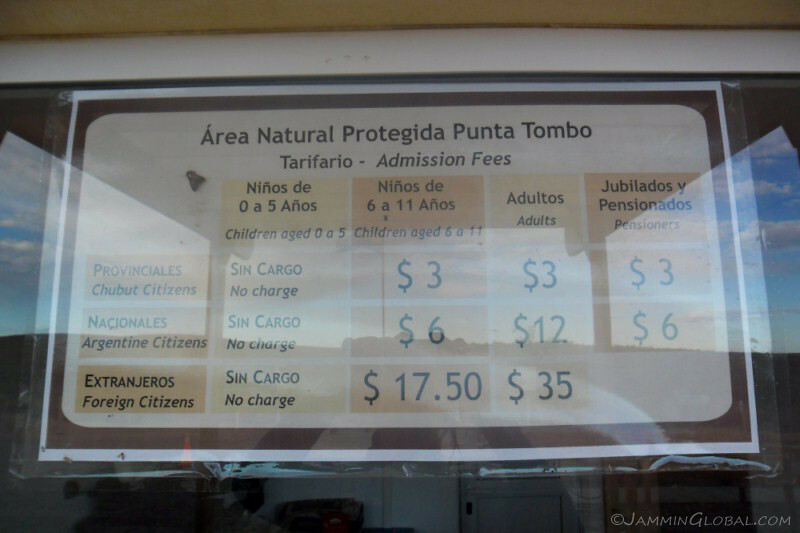 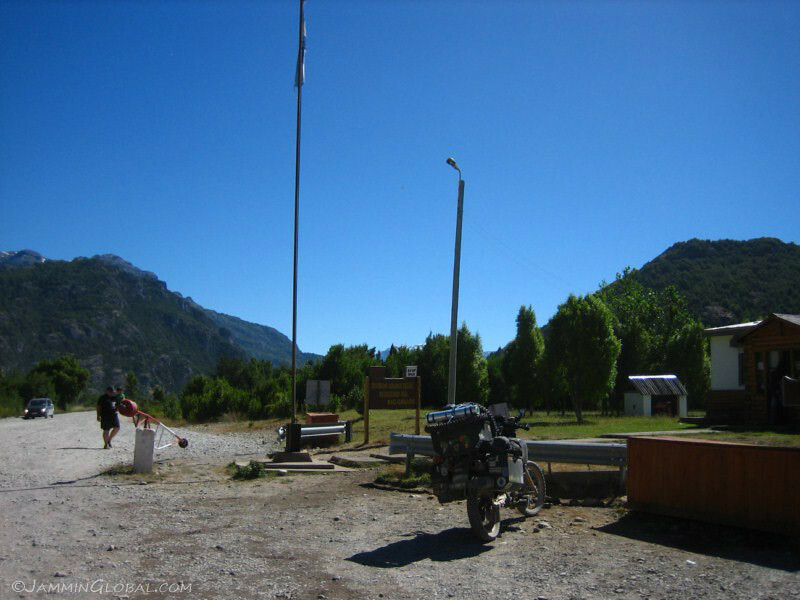 I made quick work of the 125 kms to Puerto Yungay, as I was trying to catch the last ferry at 6 pm. 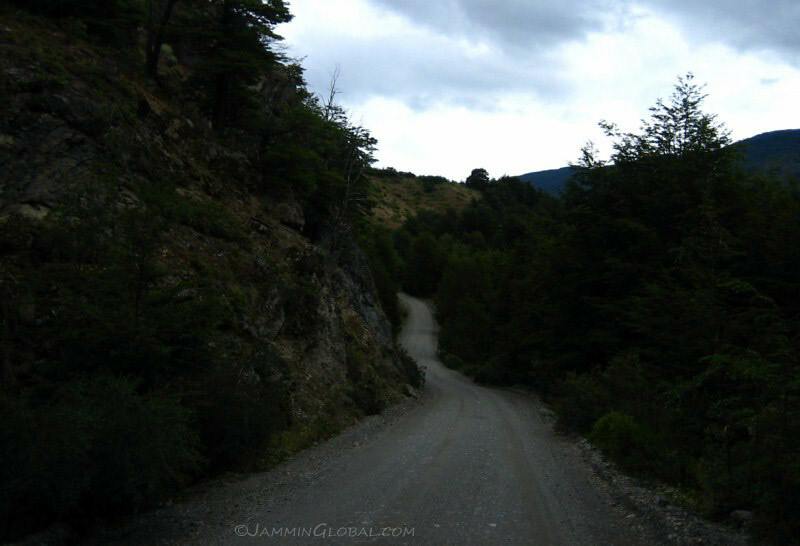 The road wound up the mountainside and one could tell that this was a relatively recently constructed road compared to the other parts of the Carretera. 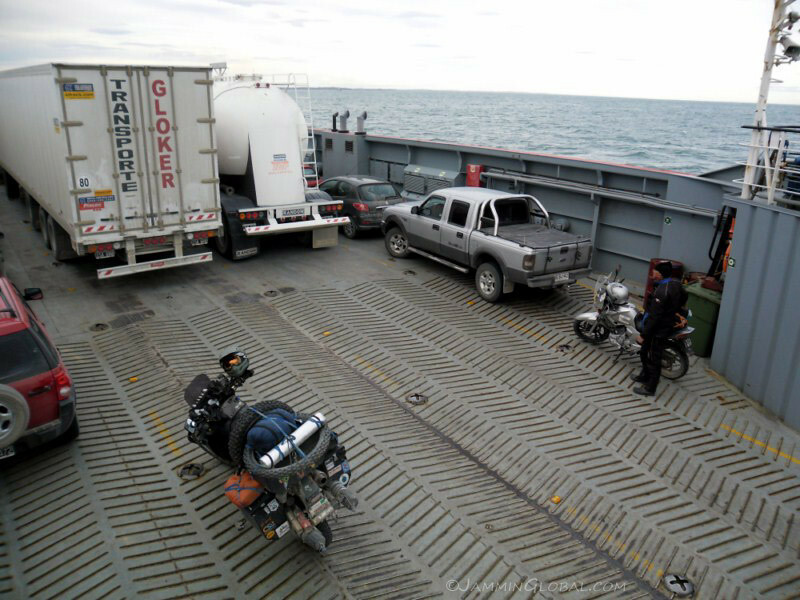 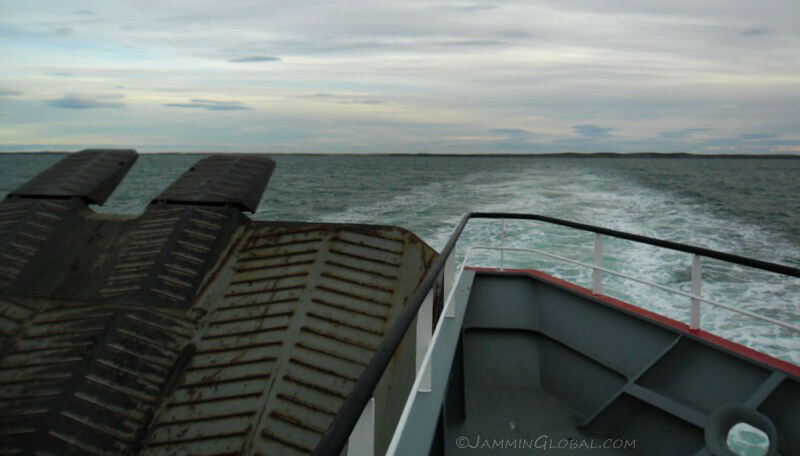 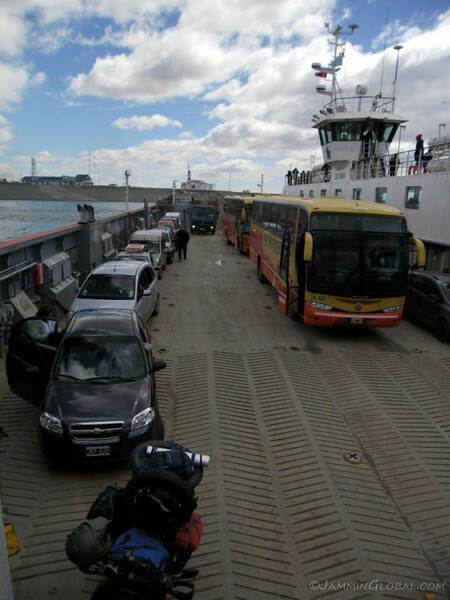 Arriving at the ferry from Puerto Yungay across to Rio Bravo. 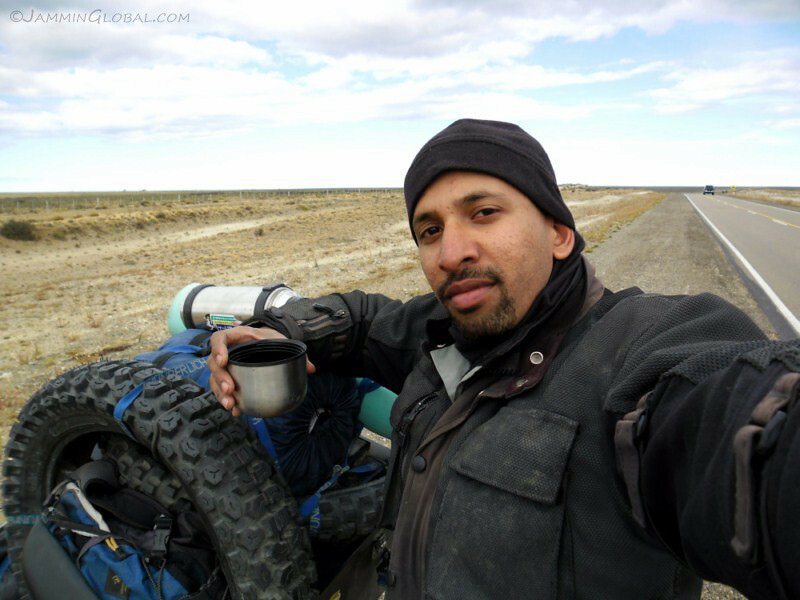 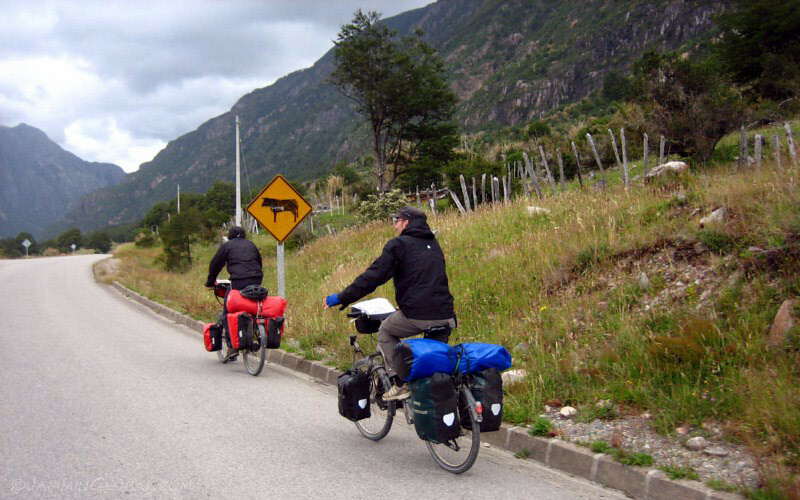 These two Americans were cycling from California, but skipped countries along the way and in their words, were traveling around the world by cycling through ‘safe’ countries. 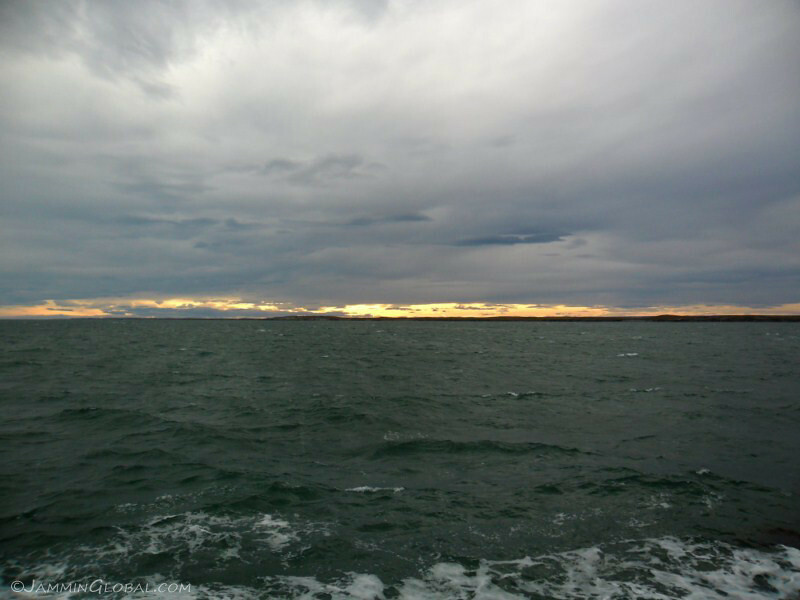 From here, they were heading to New Zealand, then Japan, then flying to Europe. 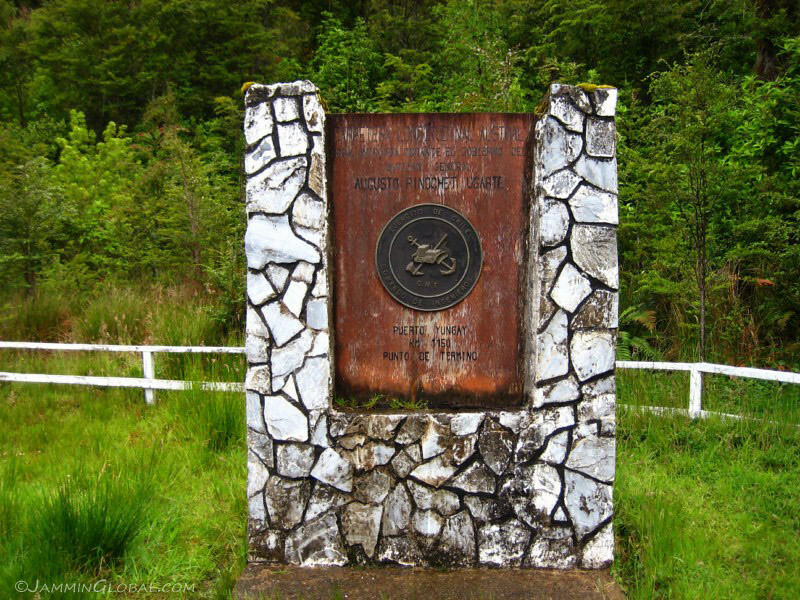 A monument to Puerto Yungay, which was once the terminus of the Carretera Austral, at kilometer marker 1150. 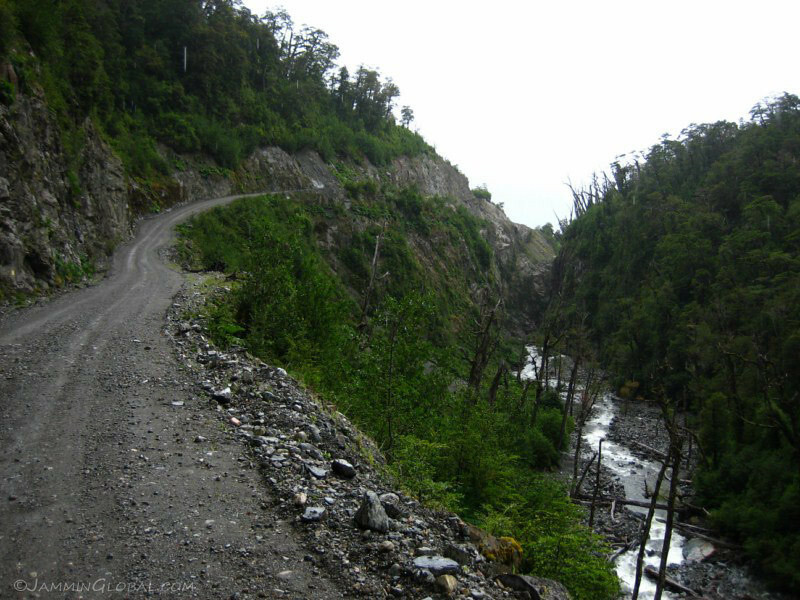 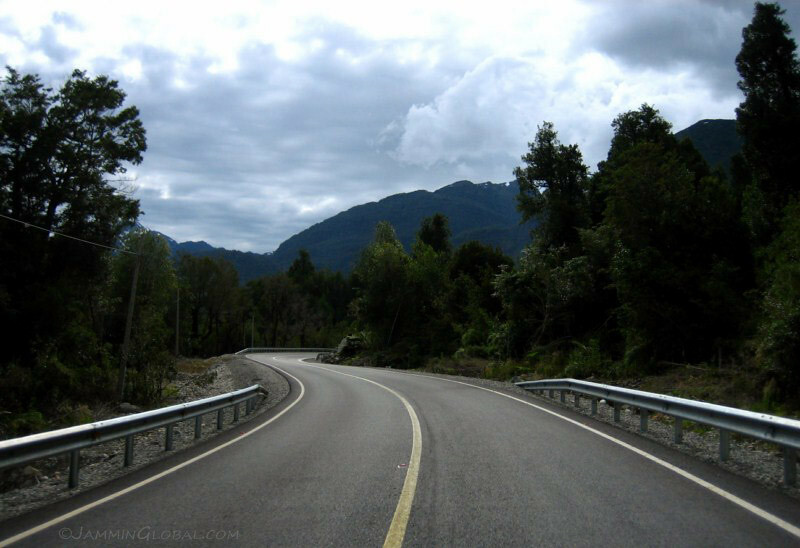 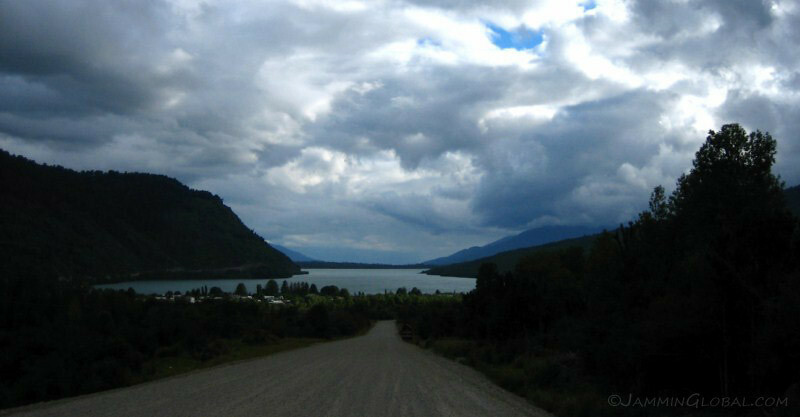 The Cuerpo Militar de Trabajo (Chile’s Army Corps of Engineers), who built the Carretera Austral, recently extended the route another 100 kms (62 mi) to Villa O’Higgins, which was only opened to traffic in 2000. 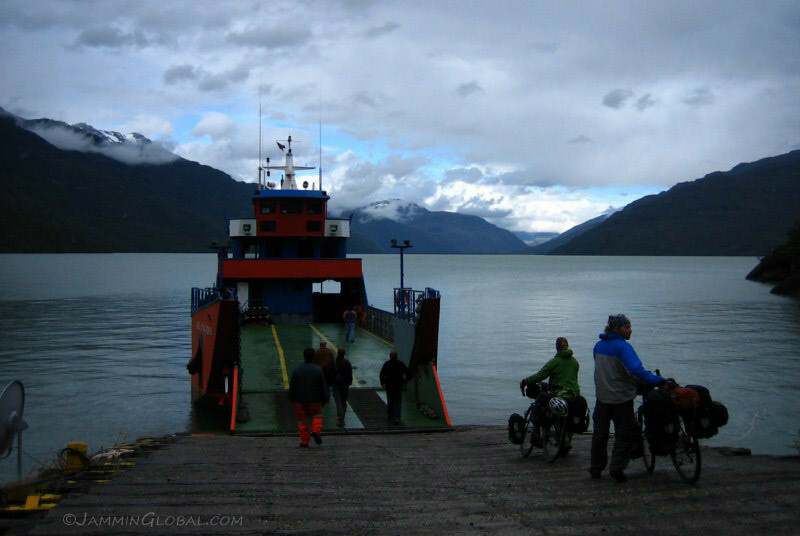 The terrain is quite rough here and the lake and its steep cliffs prevented the southern continuation of the route, but this ferry was put in as the solution. 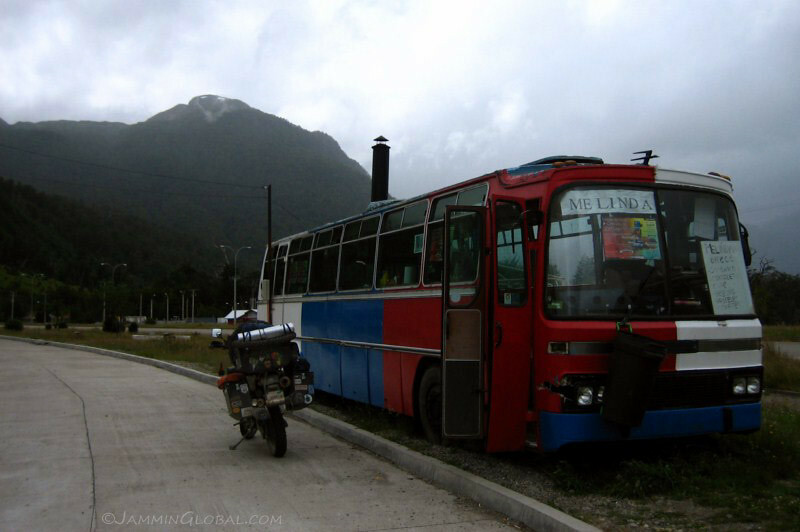 It’s a free service that runs three times a day. 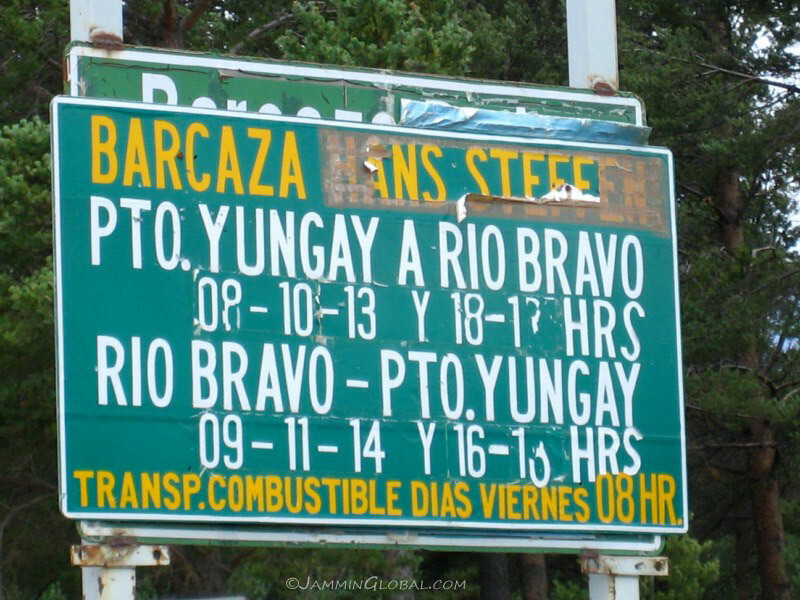 It goes north to south from Puerto Yungay to Rio Bravo at 10 am, 12 pm and 6 pm. 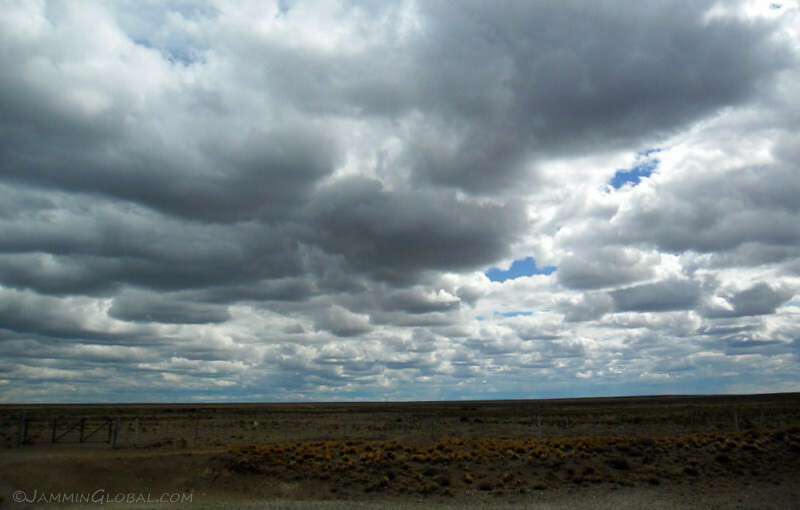 Coming back south to north at 11 am, 1 pm and 7 pm. 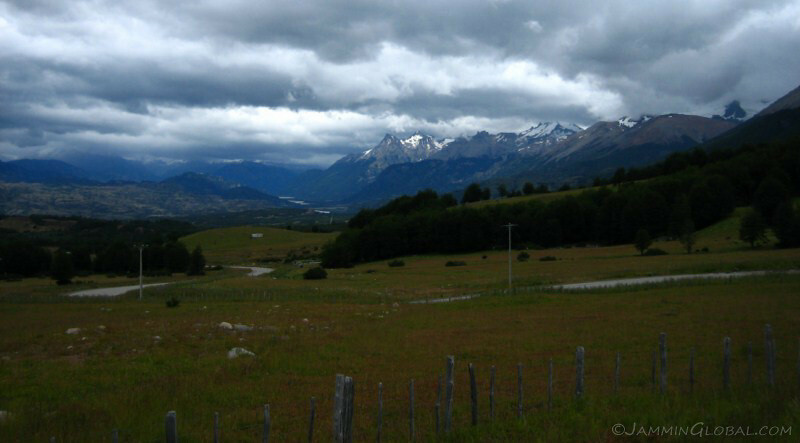 The 45 minute ride went by quickly with nice views of the nearby moutains. 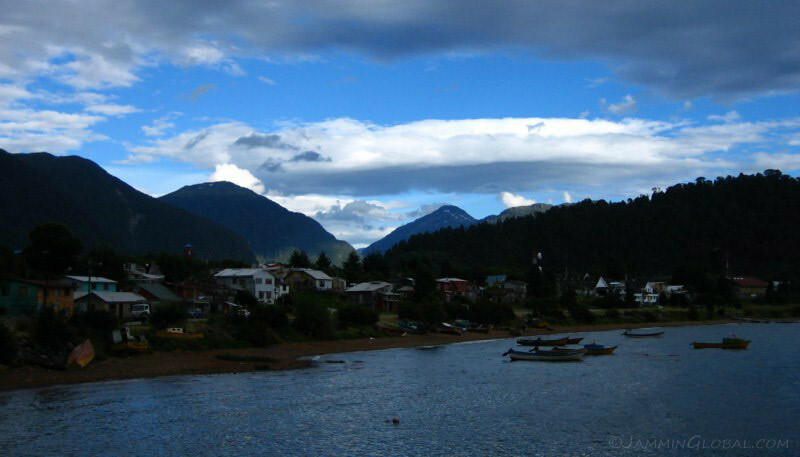 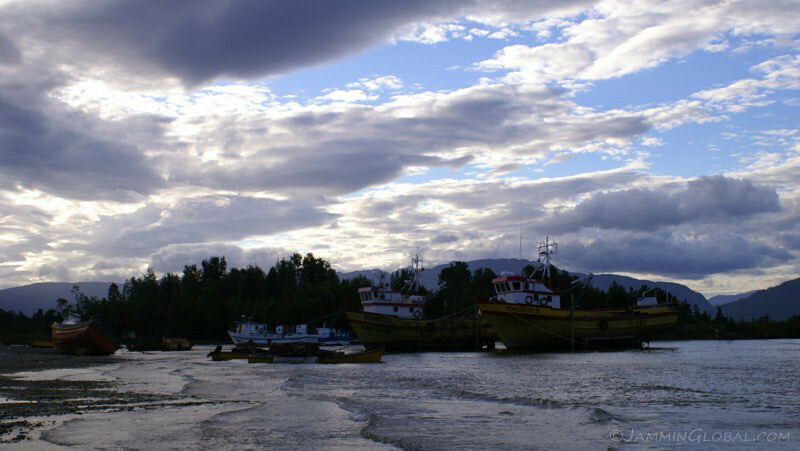 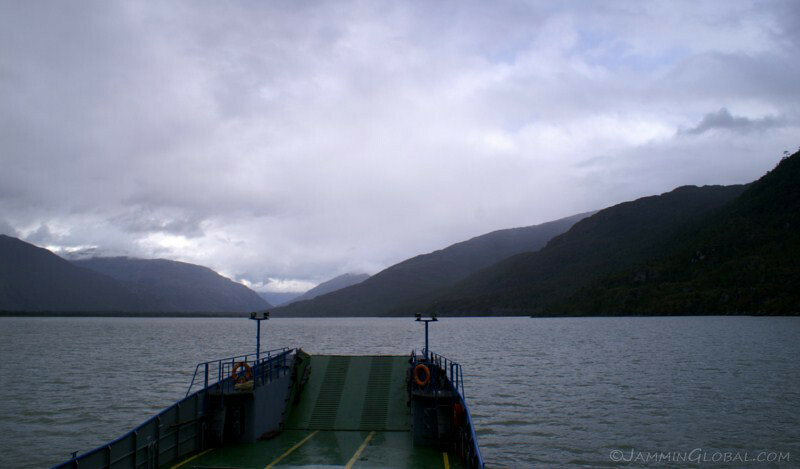 The southern port of the ferry at Rio Bravo and the continuation of the Carretera Austral. 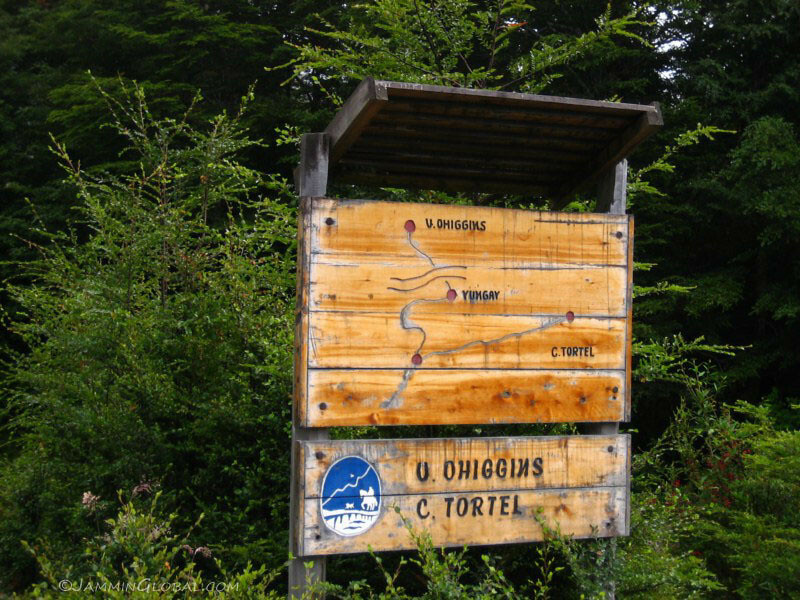 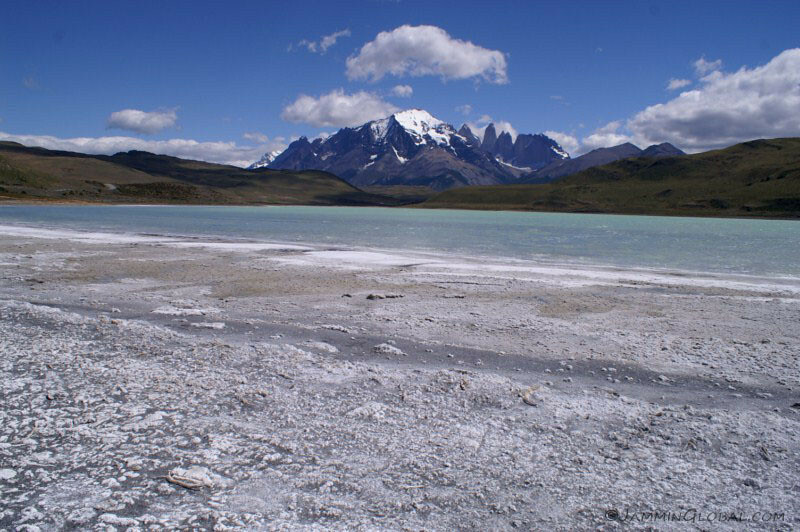 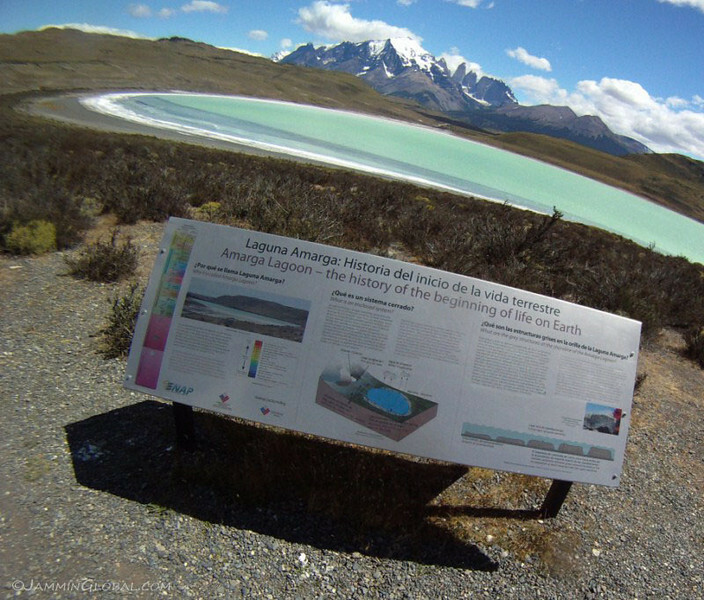 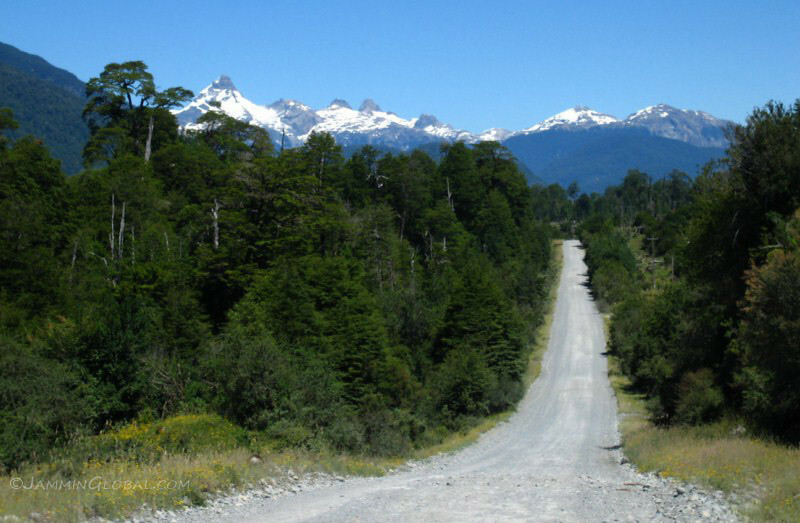 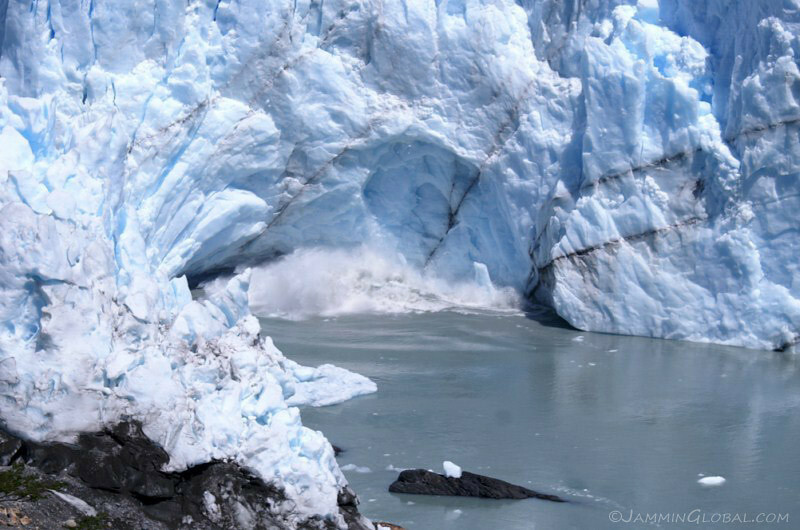 The current terminus of the Carretera Austral is at Villa O’Higgins and the route is impeded by the massive Southern Patagonian Ice Field. 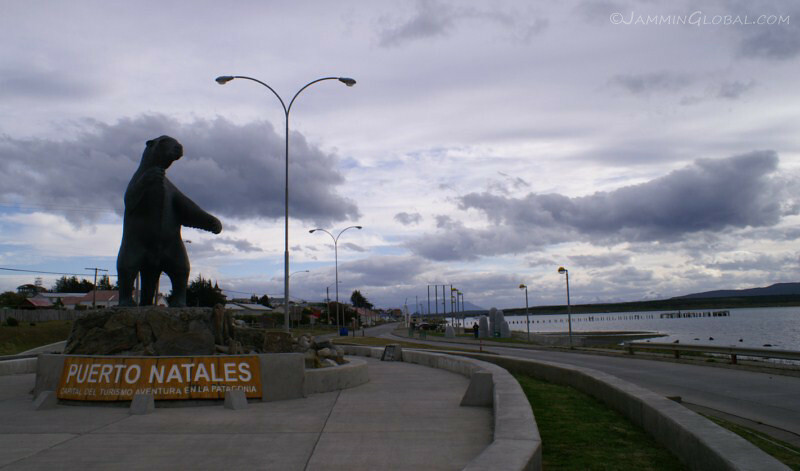 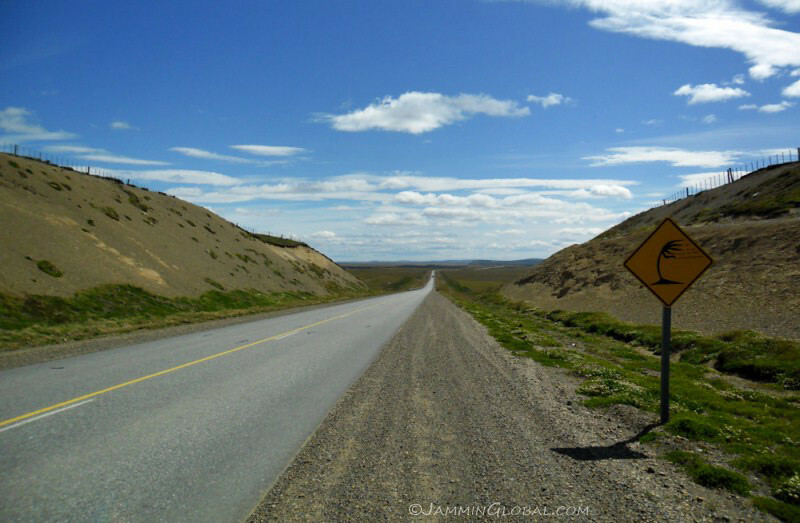 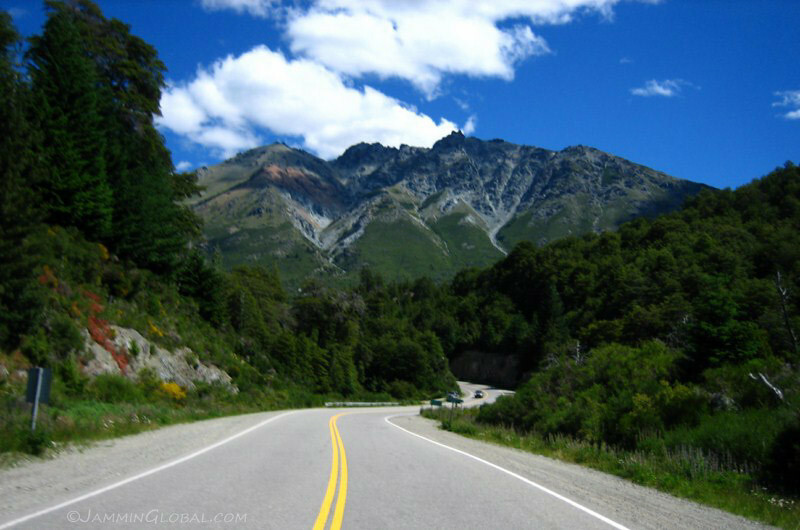 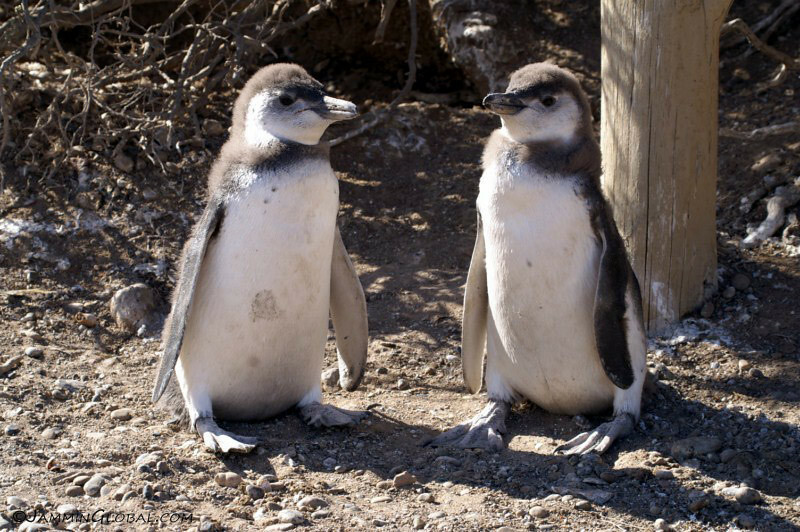 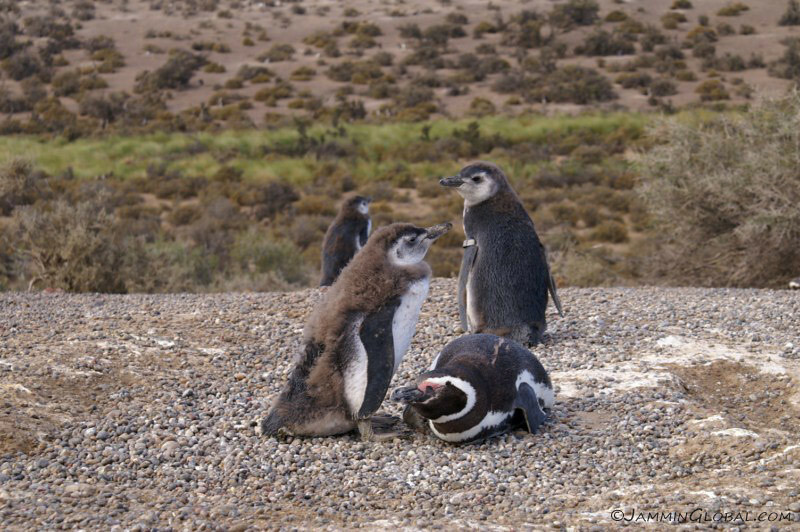 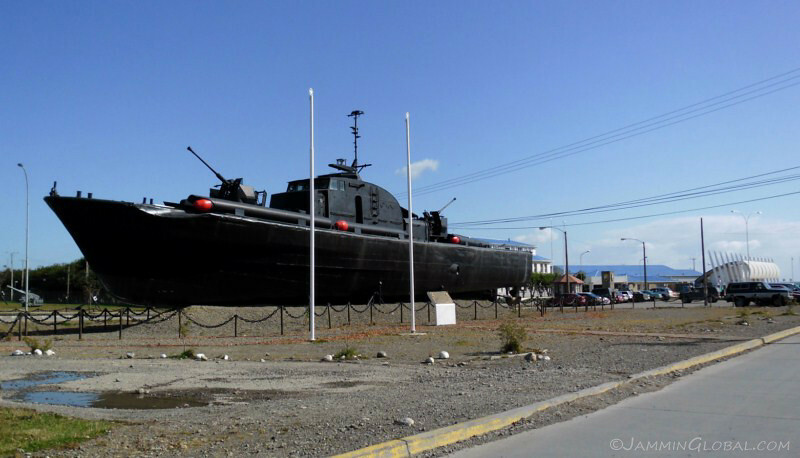 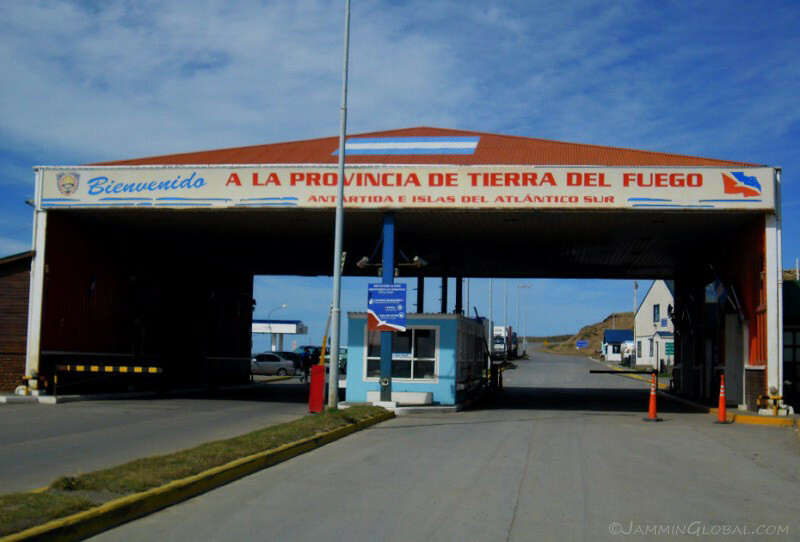 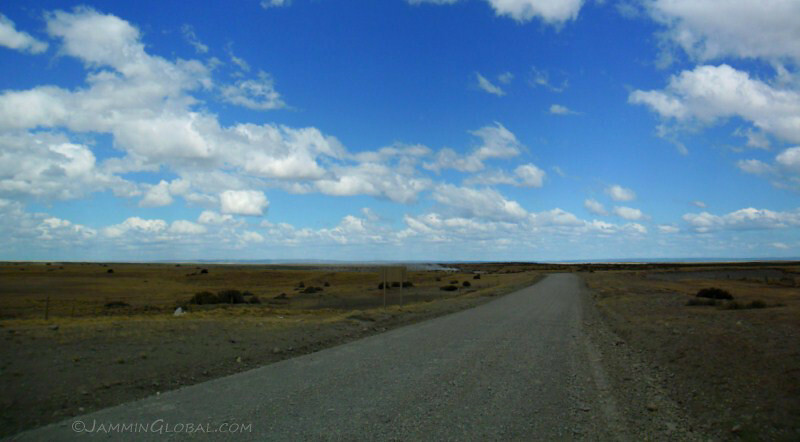 However, there is a drive from the politicians in Santiago to continue the route and link it with Chile’s Southern Patagonia region of Puerto Natales and Punta Arenas. 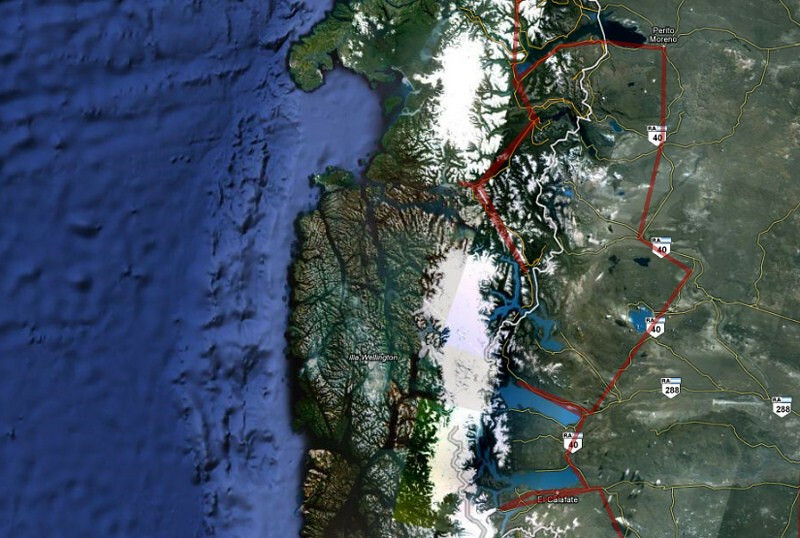 The proposed route heads from Rio Bravo to Ventisquero Montt and onwards with 9 ferries to Puerto Natales. 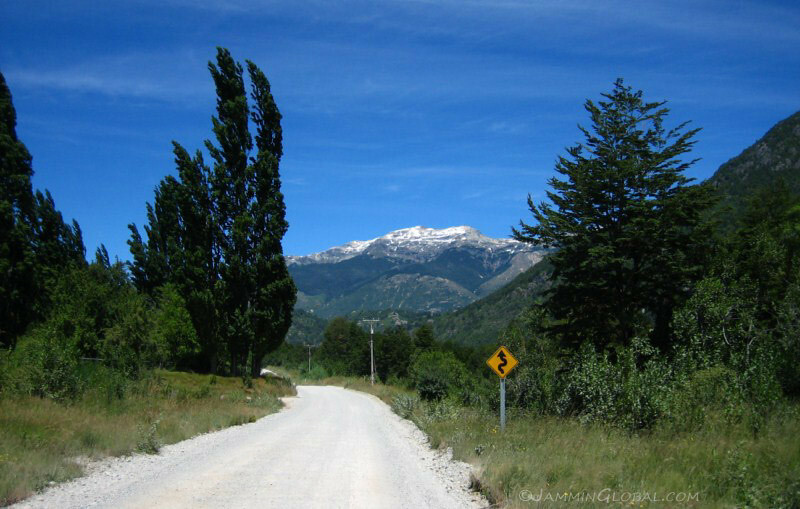 The first part, which branches off from here has been built, but the continuation from Ventisquero Montt is still to come. 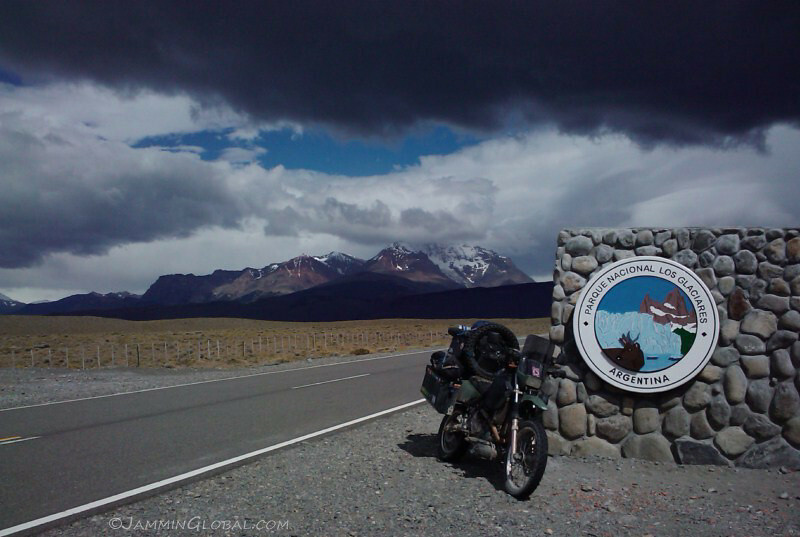 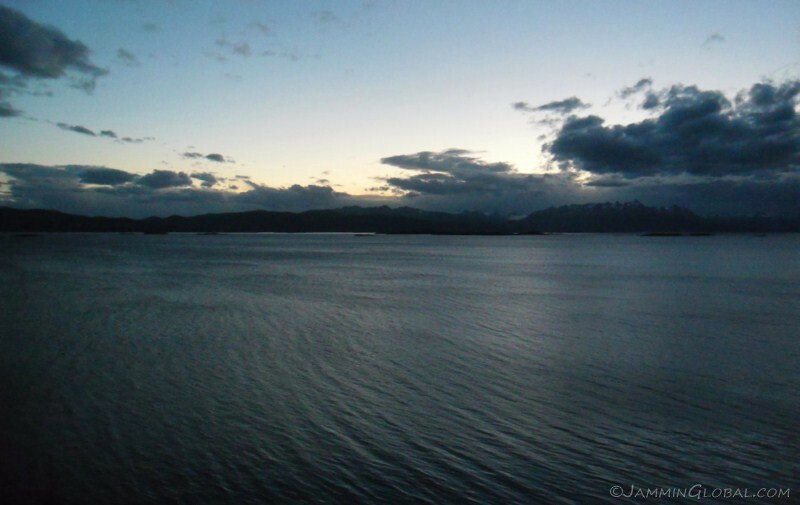 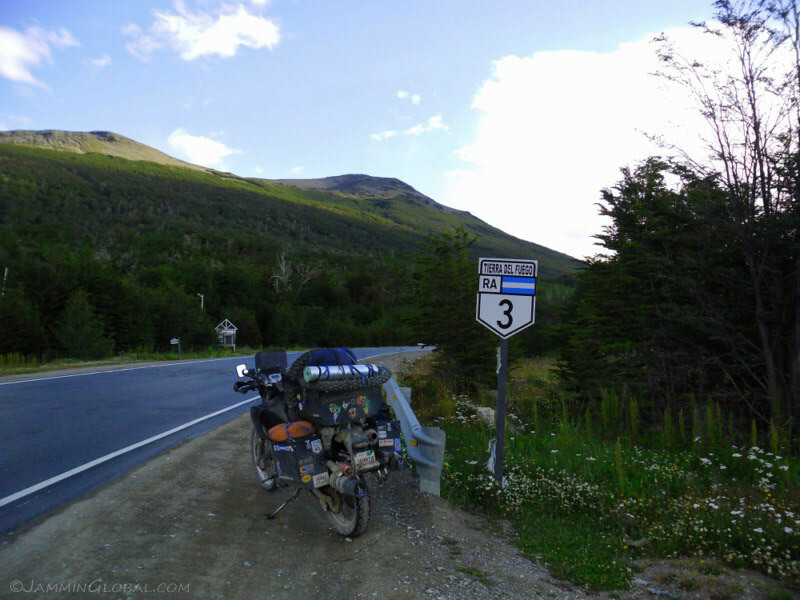 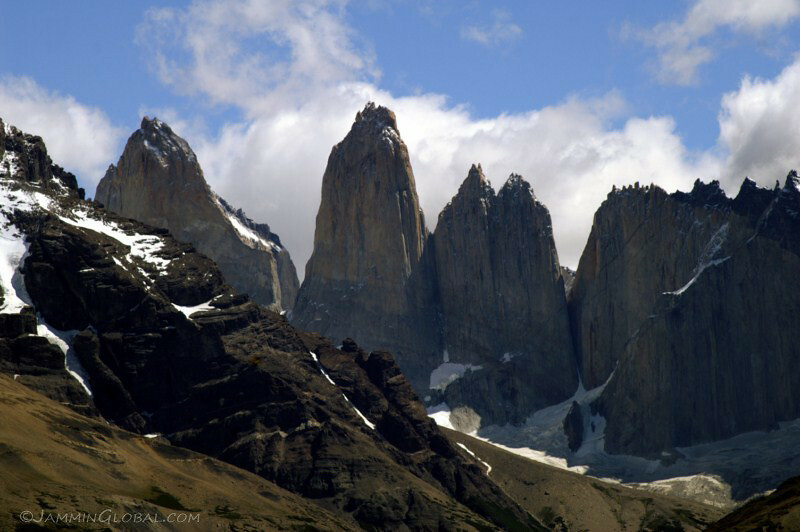 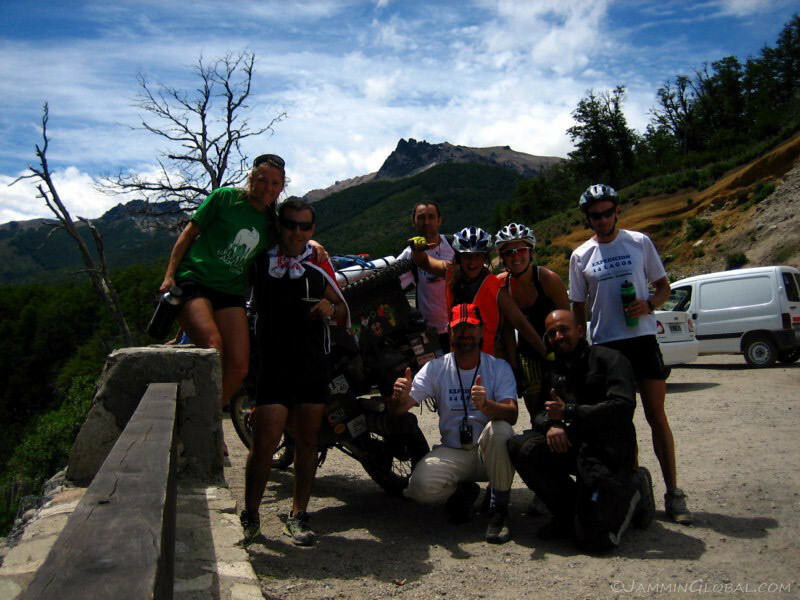 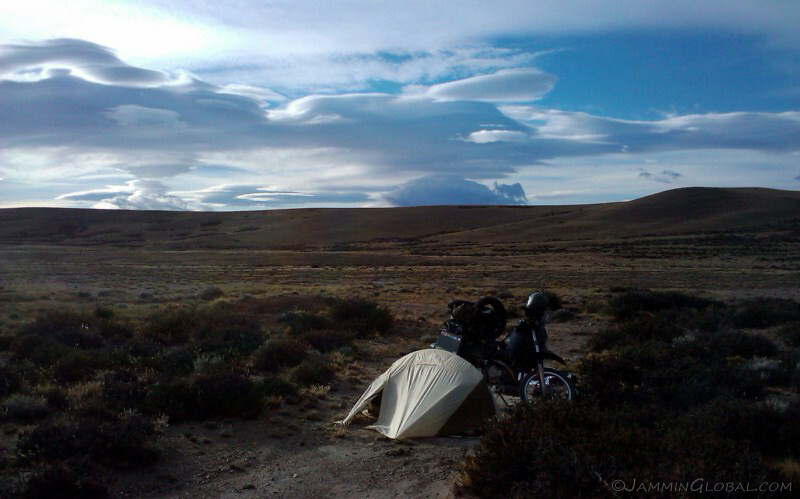 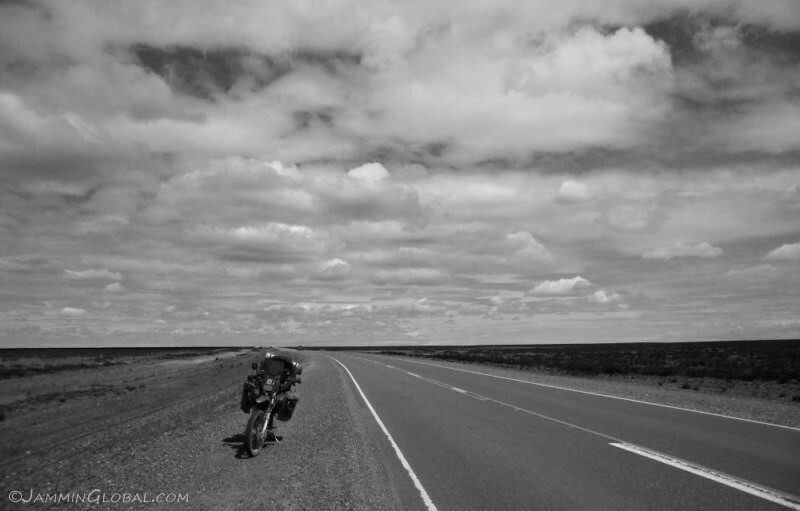 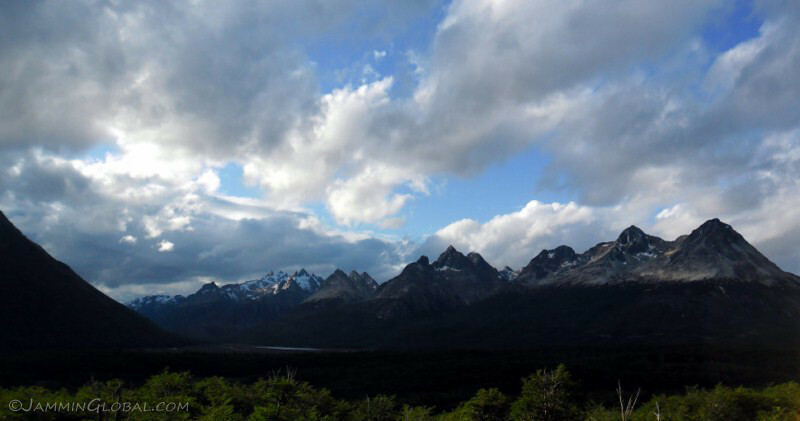 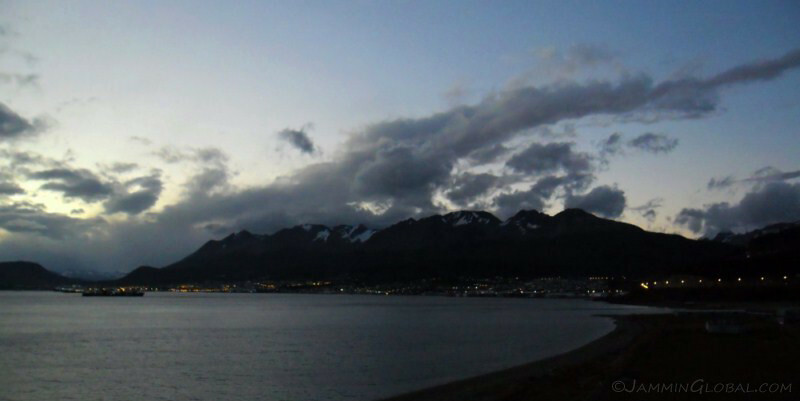 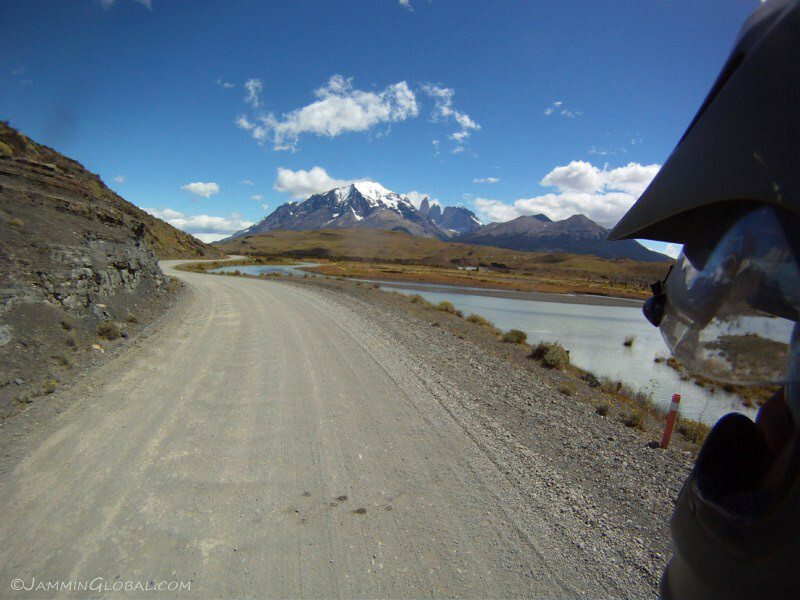 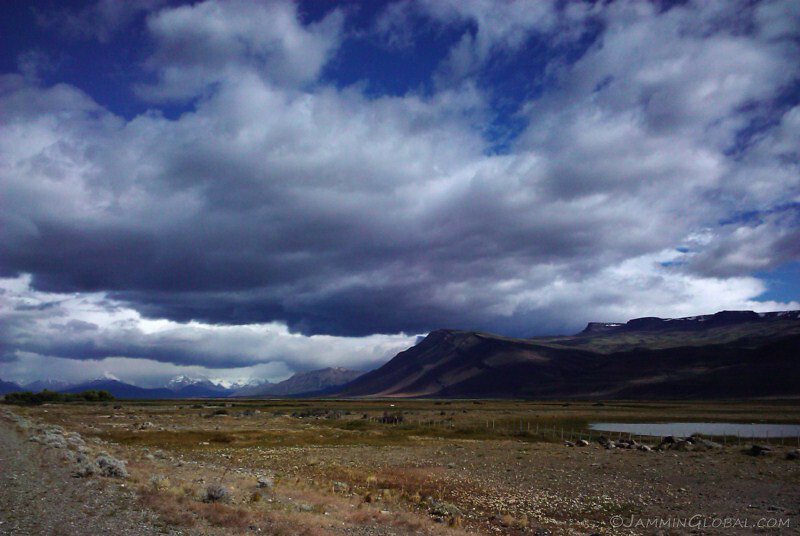 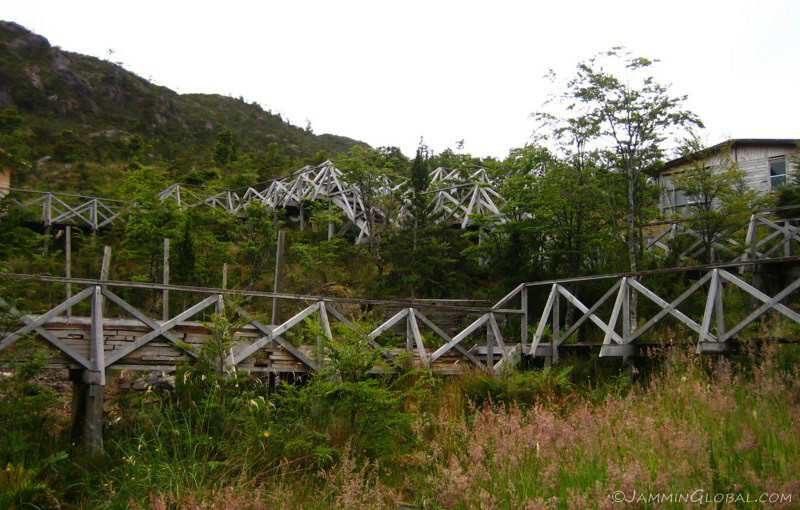 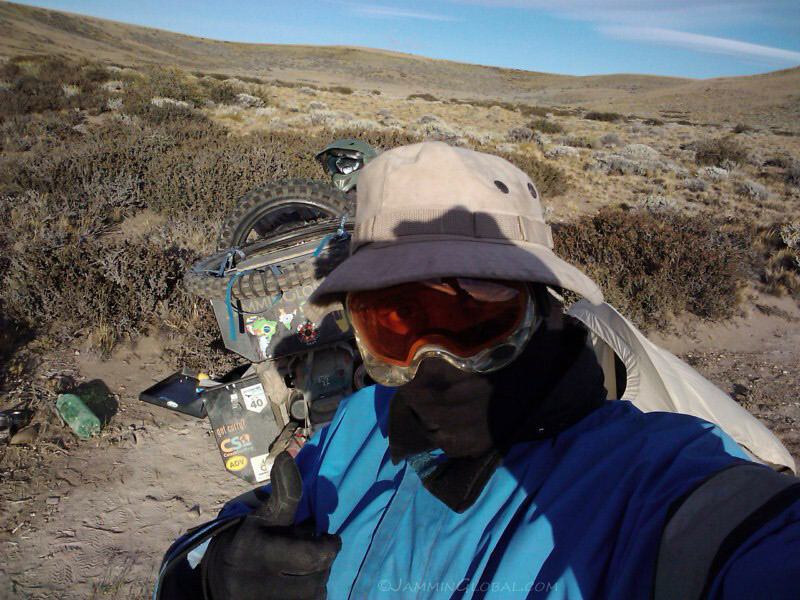 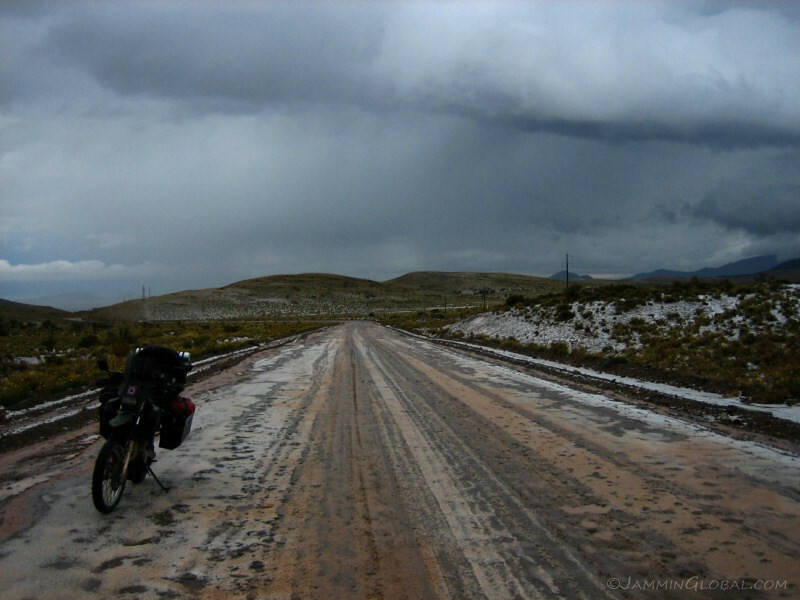 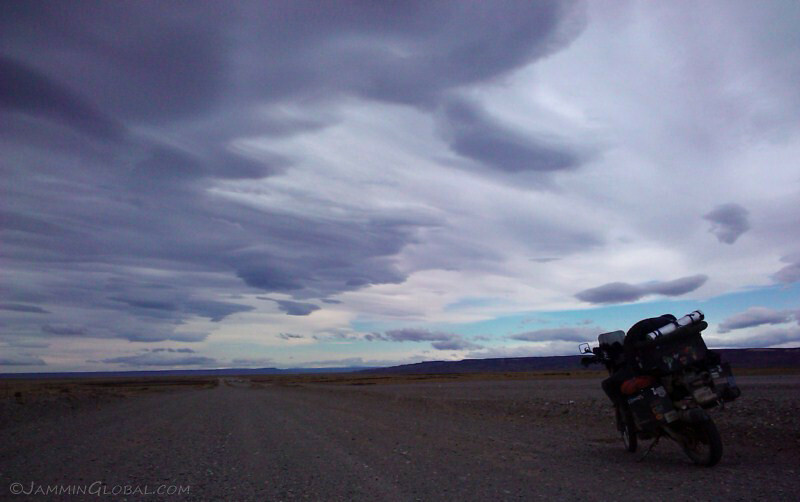 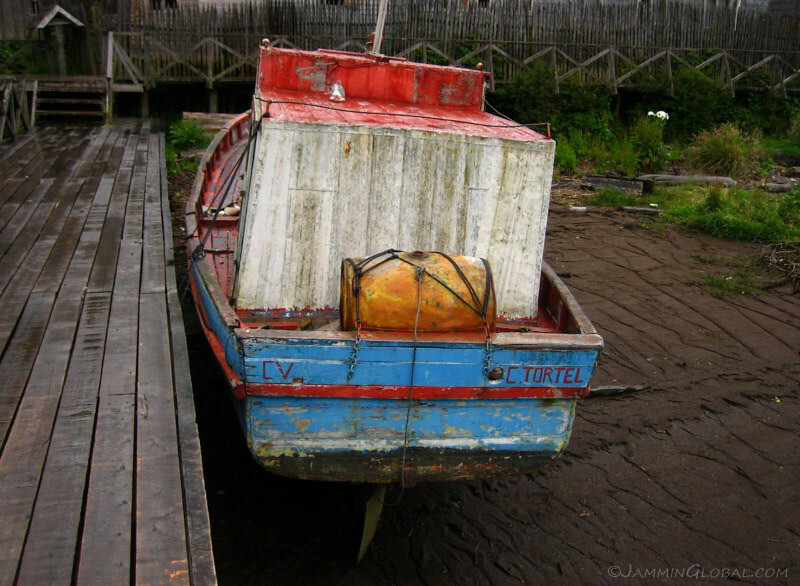 They say it could be another 20 years before the route to Puerto Natales is completed, due to the harsh, icy terrain. 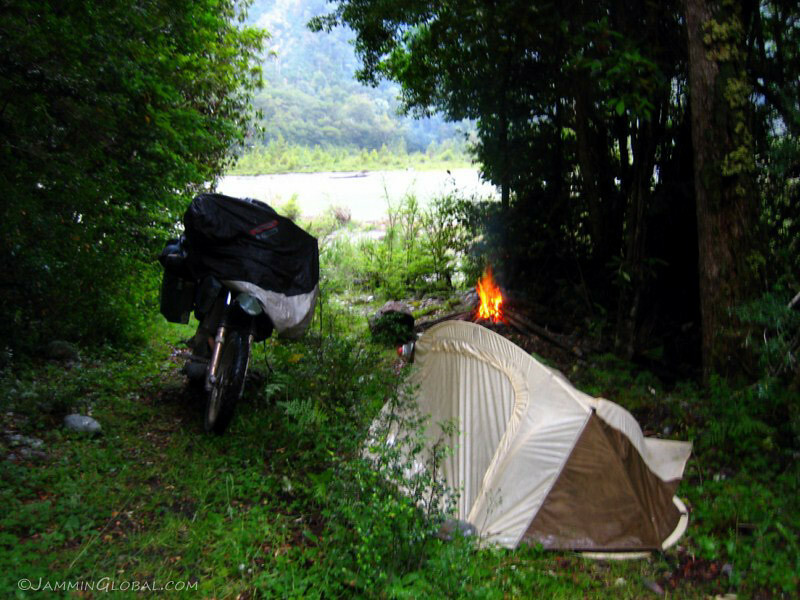 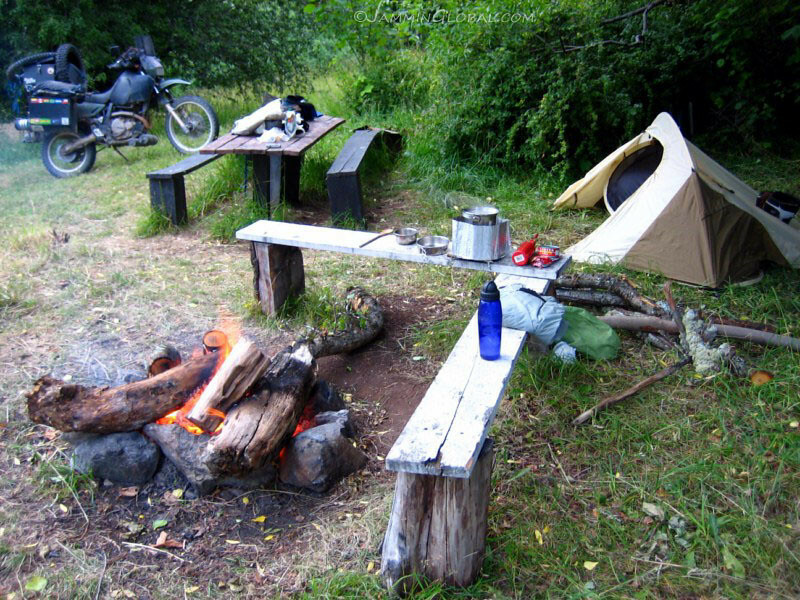 It was 7 pm around now and I rode along the Carretera looking for a place to camp for the night and about 10 kms south of Rio Bravo, I found this clearing in the trees and setup camp as it started to rain. 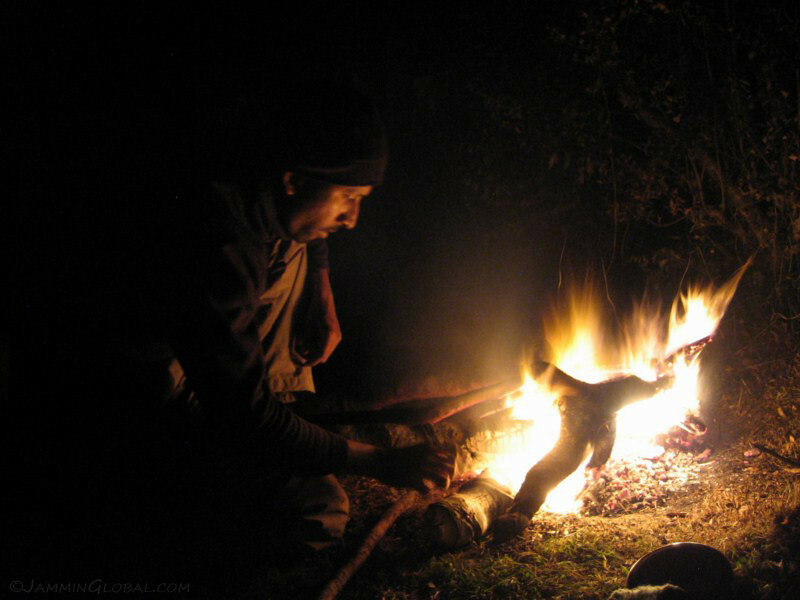 The forest was wet but I managed to get a fire going after dousing the wet limbs with some petrol. 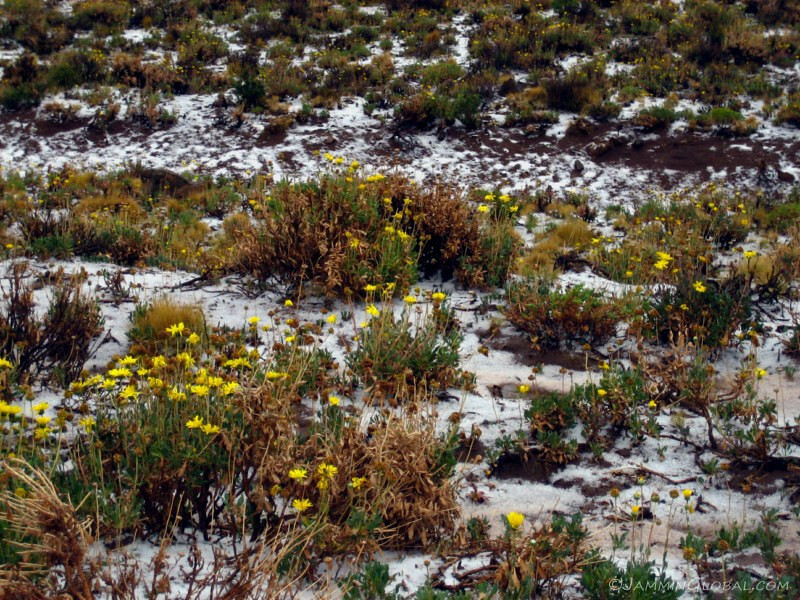 These small flowers on the ground in my camp got picked up by almost anything that touched them with small grips at the end of the purple hairs lodging themselves between threads or I can imagine, animal fur. 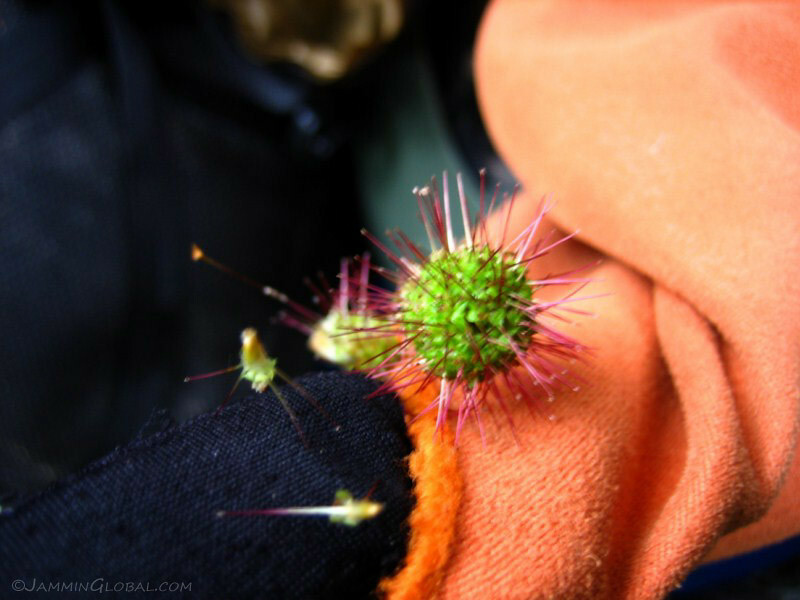 When I tried to remove them, they would self-destruct and fall apart into the numerous individuals pieces that make up each flower ball. 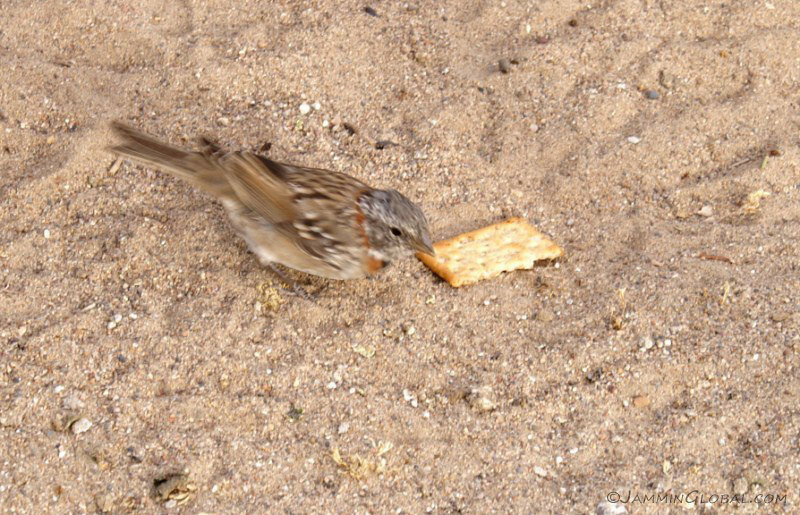 An interesting tactic to spread its seed around. 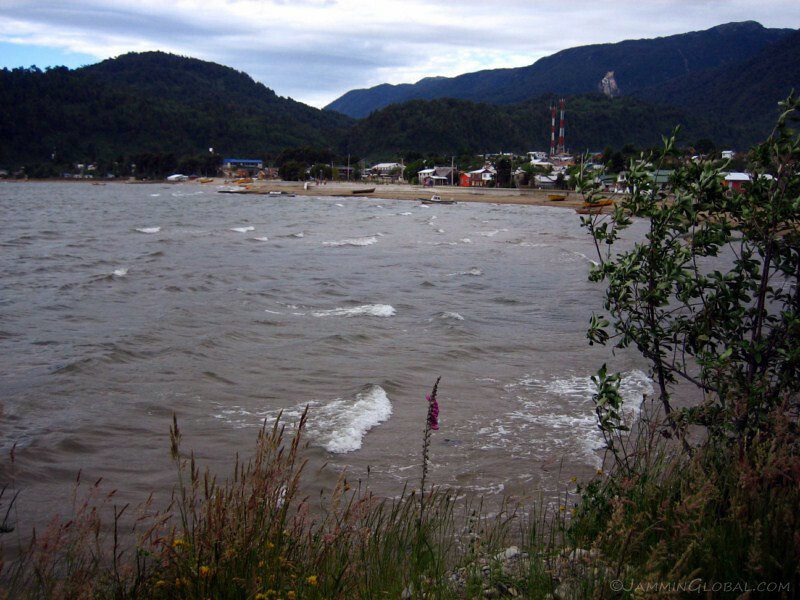 Rio Bravo with the Carretera Austral running along its shore, deep in the southern reaches of Patagonia. 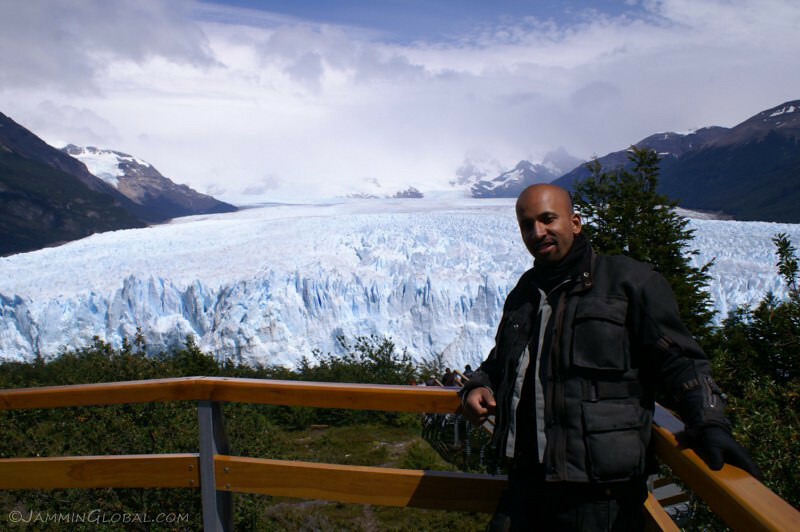 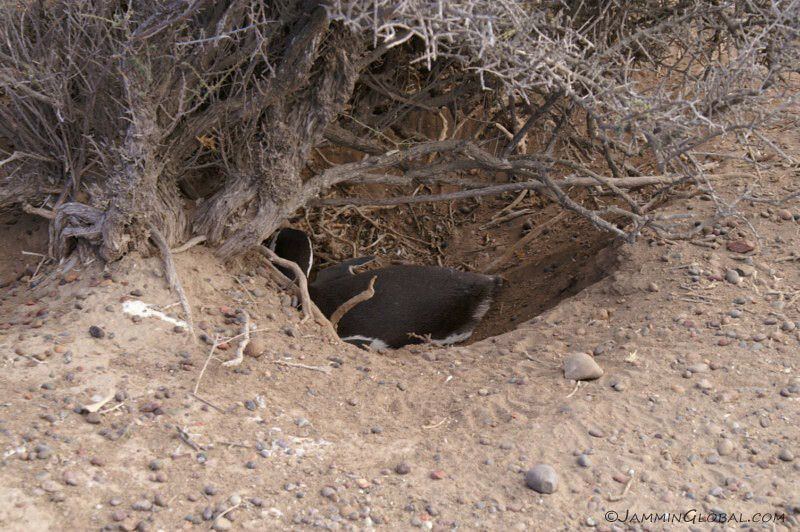 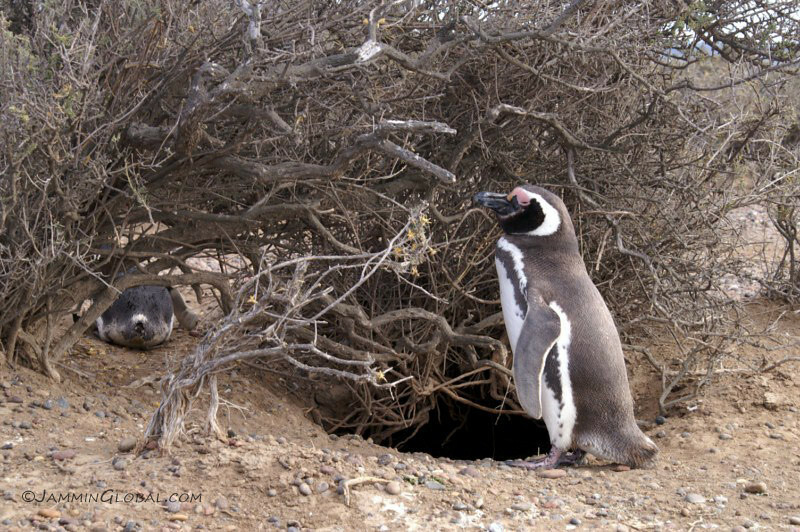 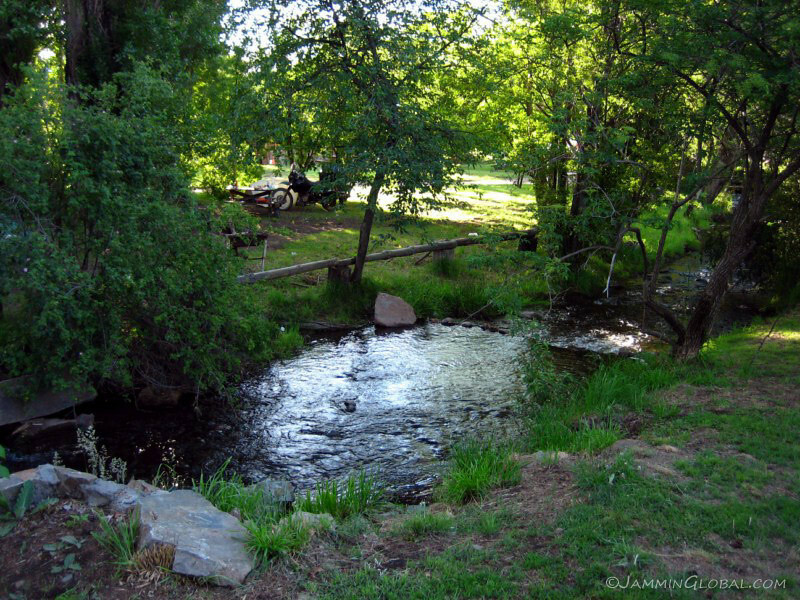 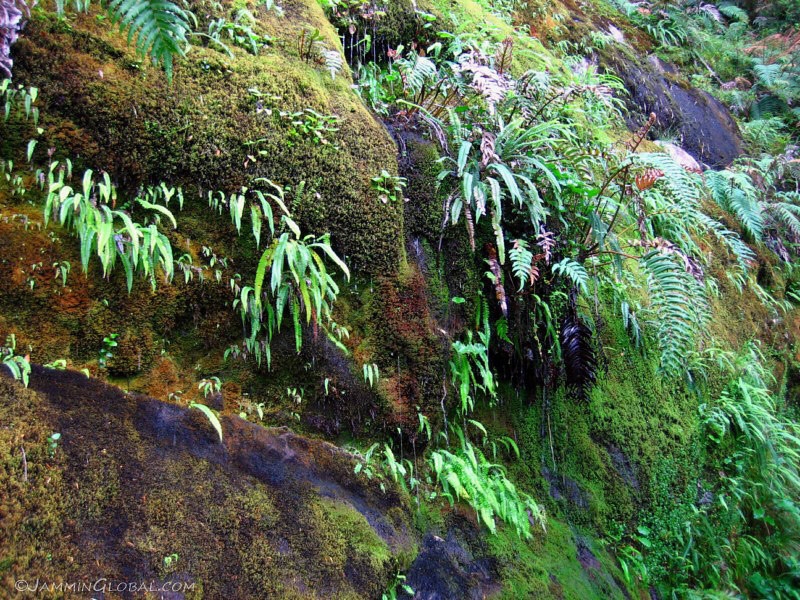 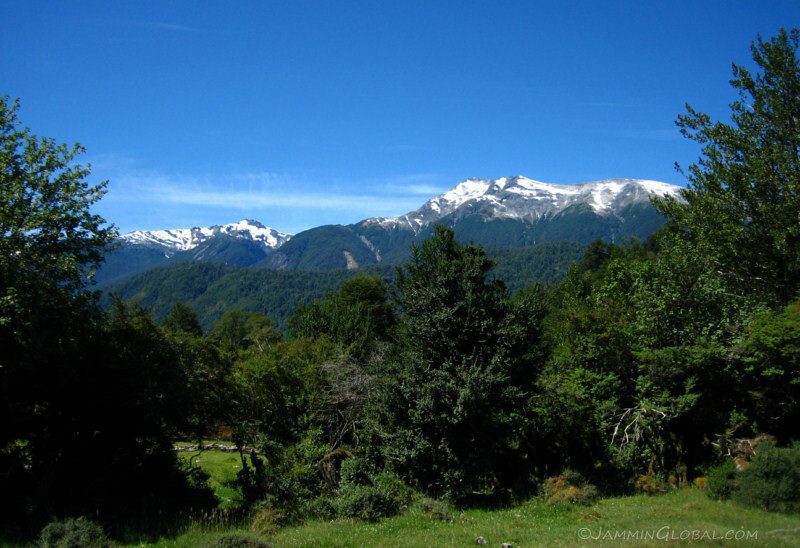 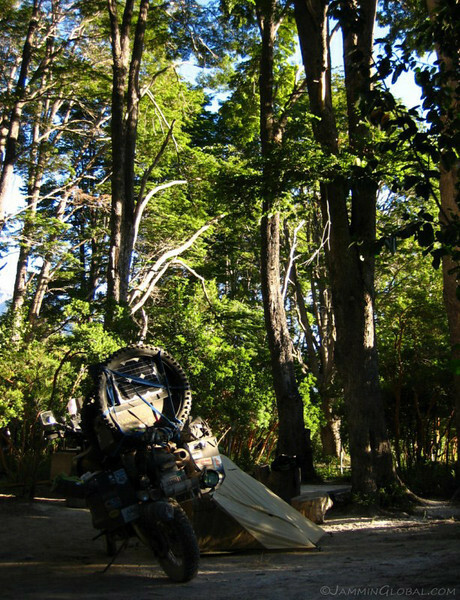 The next human settlement was Villa O’Higgins, leaving me close with nature. 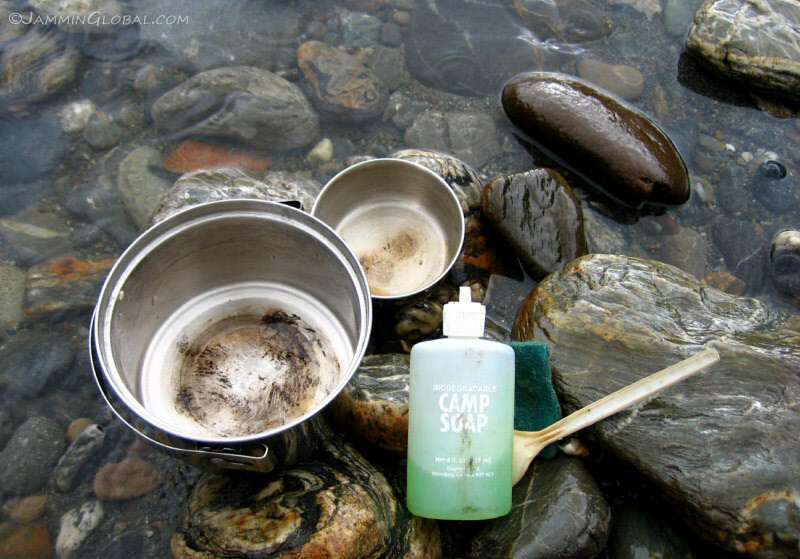 Washing my pots in the pristine rivers with biodegradable soap. 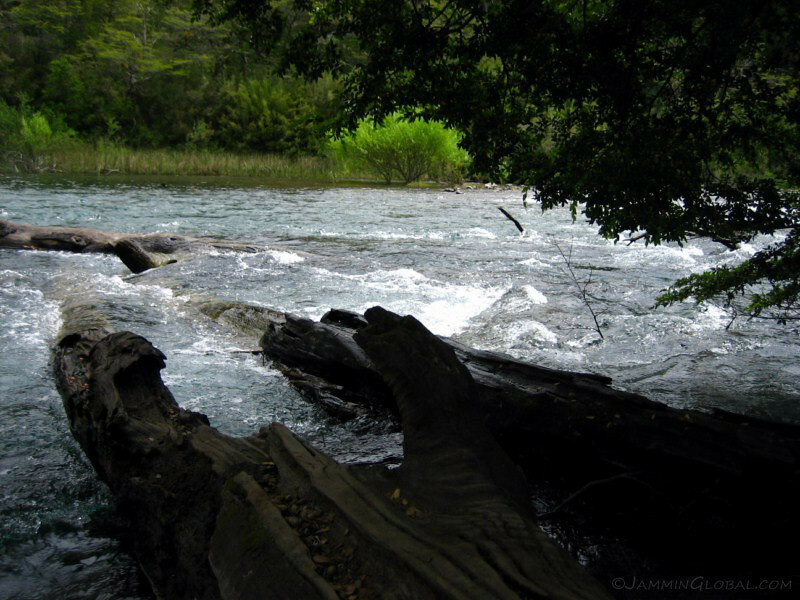 My camp was located in these trees, on the shores of Rio Bravo. 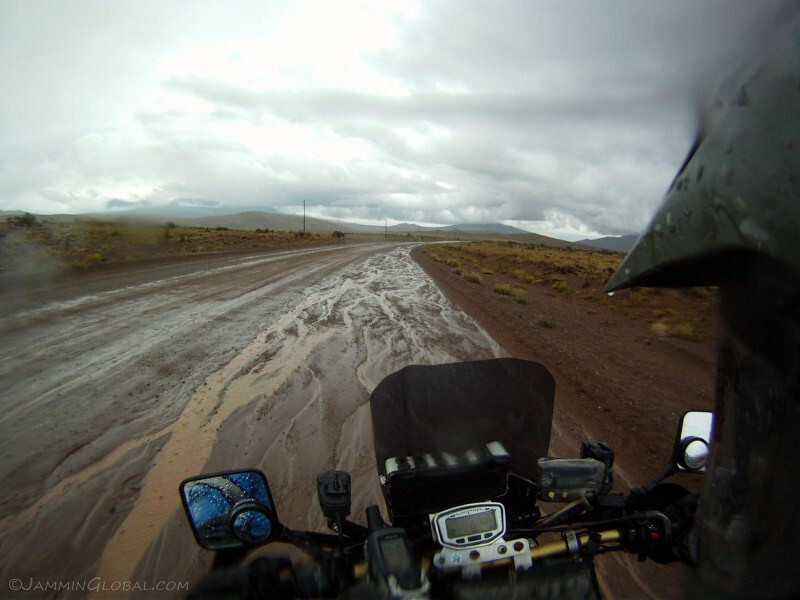 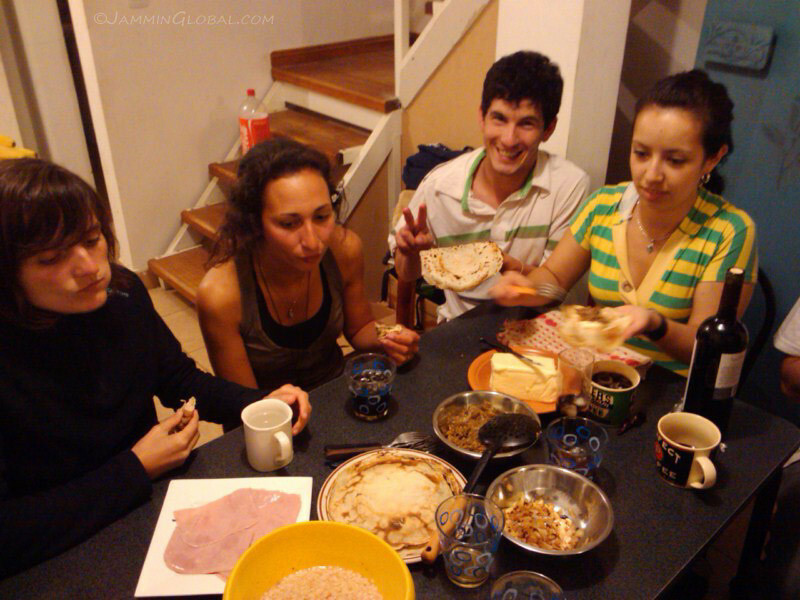 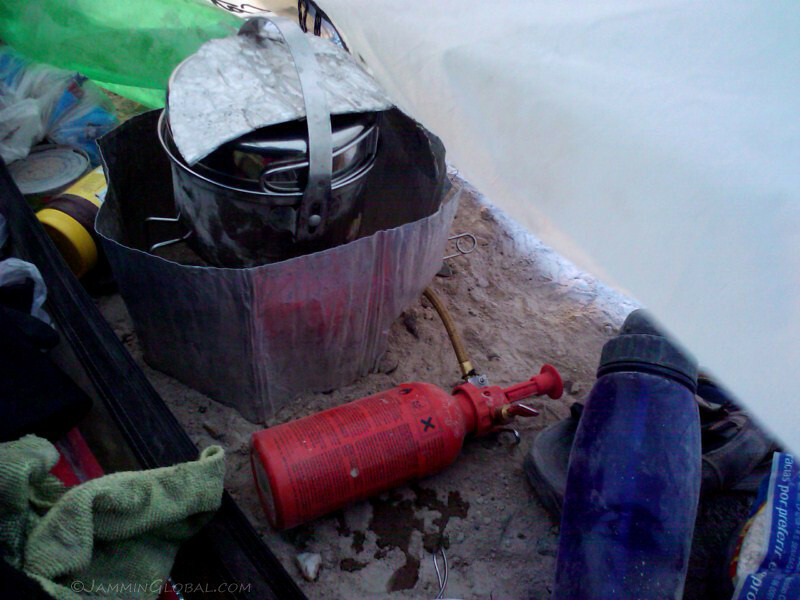 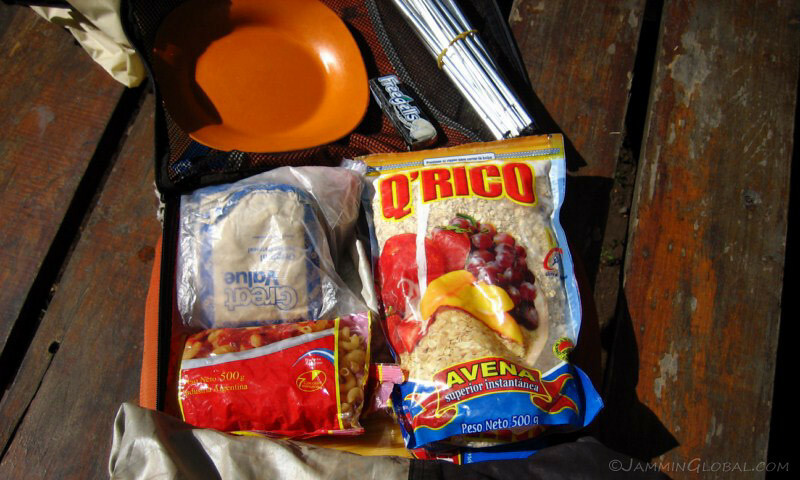 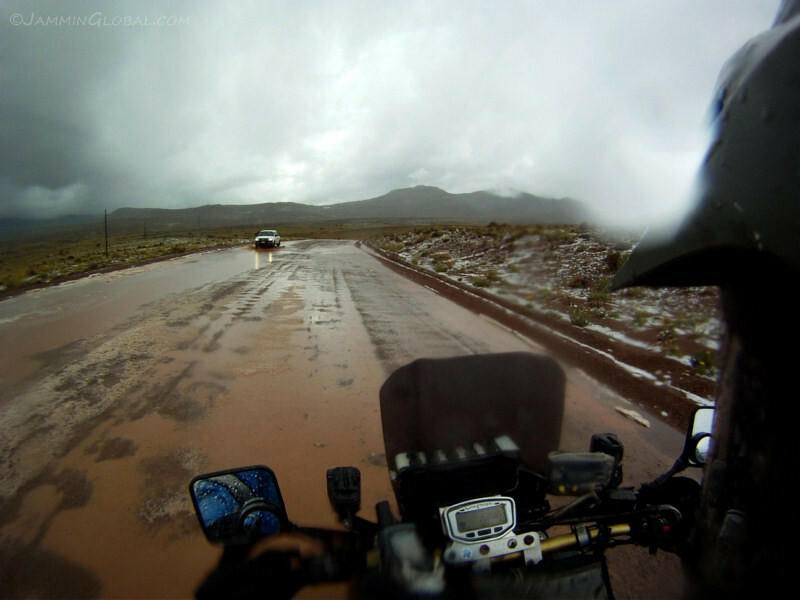 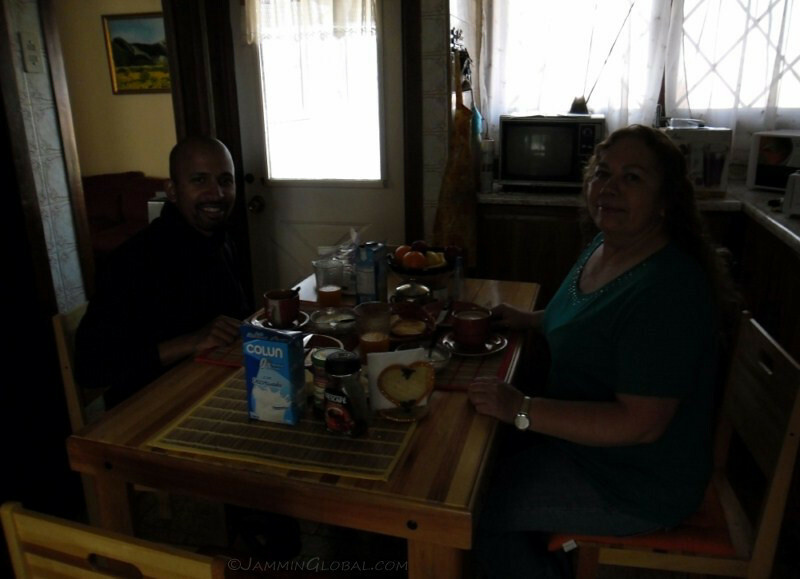 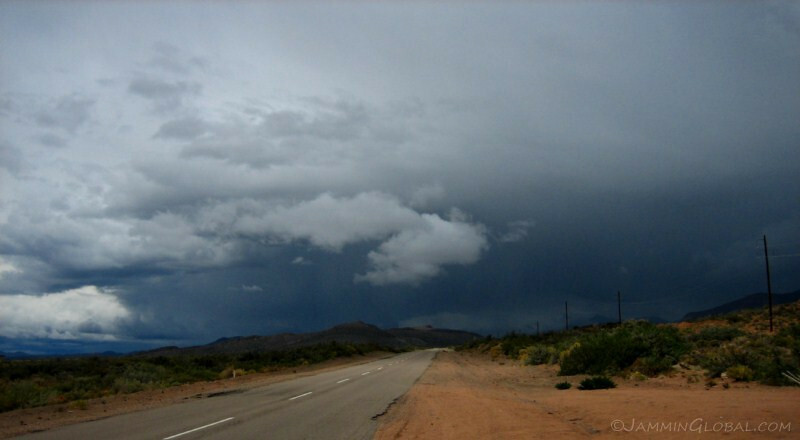 The next morning, after packing up a wet tent with overnight rains, the Carretera continued south. 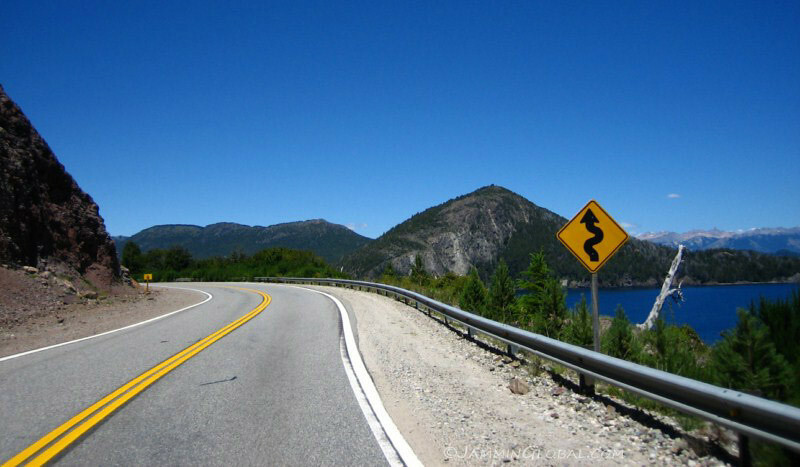 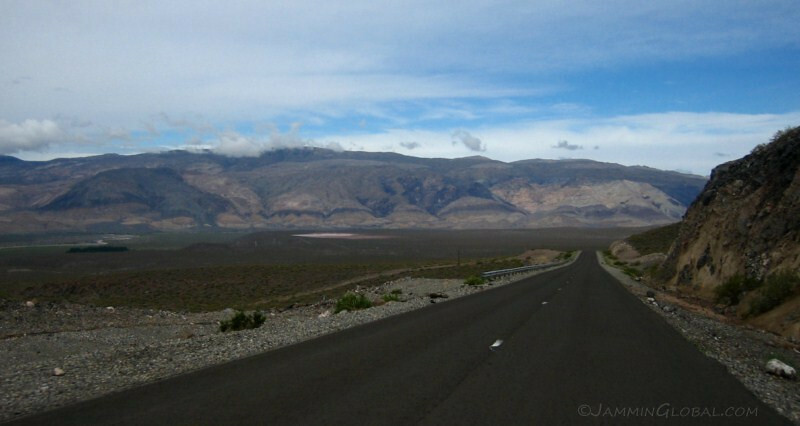 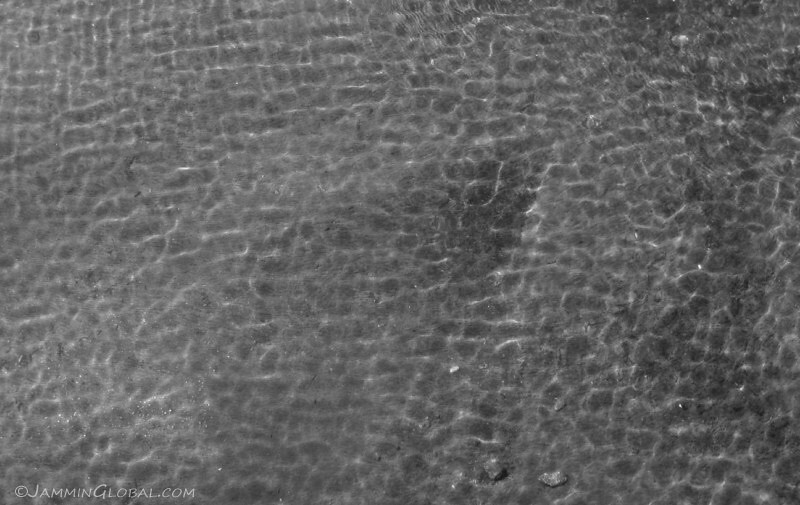 There was one big mountain ridge to cross and the sign warned of steep and tight curves. 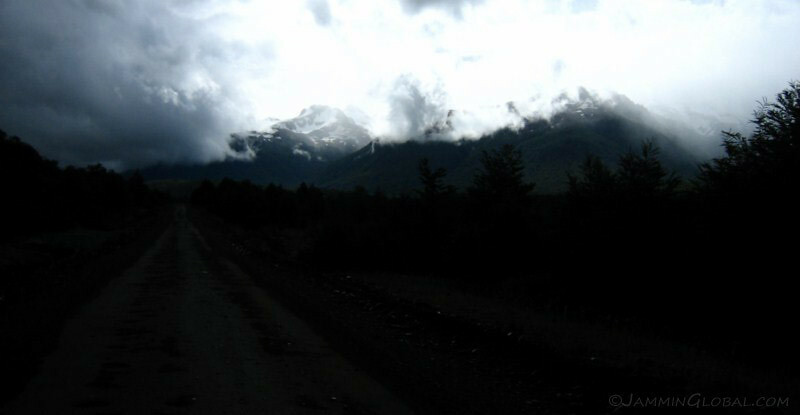 From the summit, looking ahead through the fog and wintry weather. 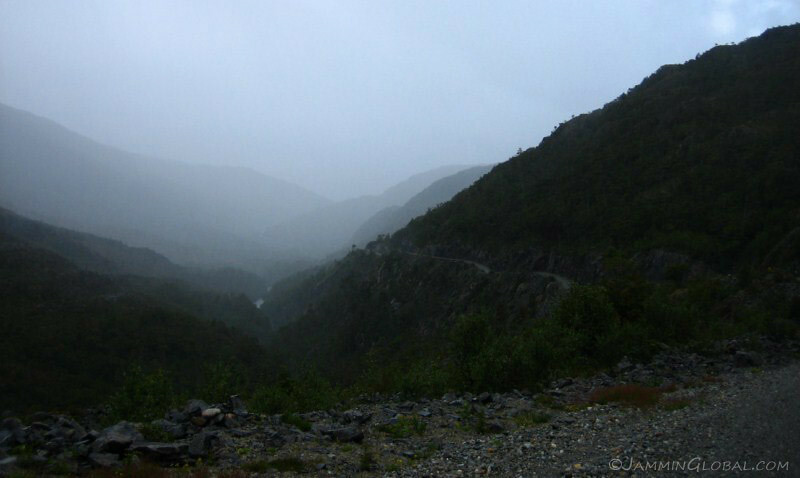 It was cold and wet but the desire to reach the end was enough to keep me going. 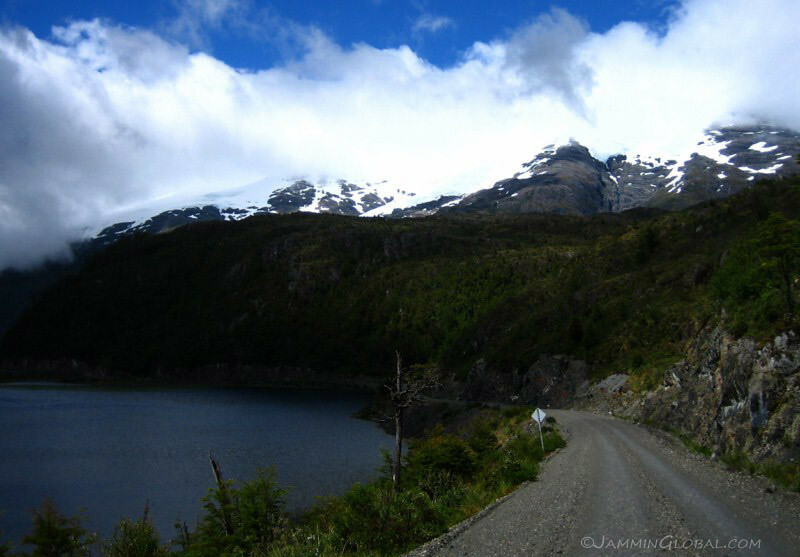 After a few more curves and climbs, the weather turned for the better revealing the closeness of the snow-capped peaks along the route. 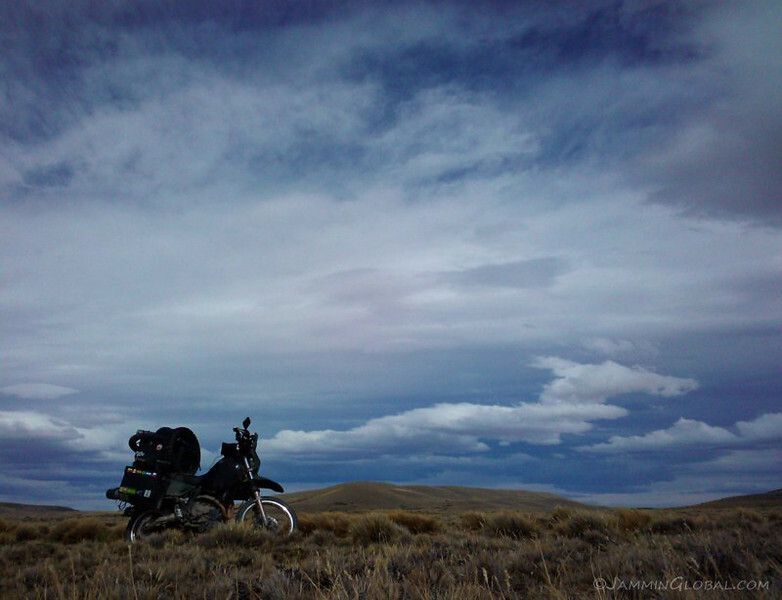 It was raining just across the ridge there, but I was glad to be in the sunshine here and took a break to warm up my cold fingers in the sun. 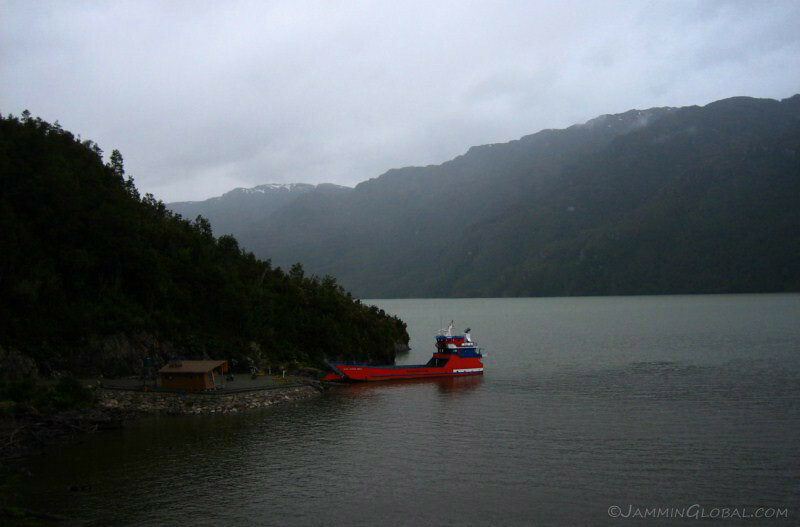 The route being cut into the cliffs as the mountains were right up against the water. 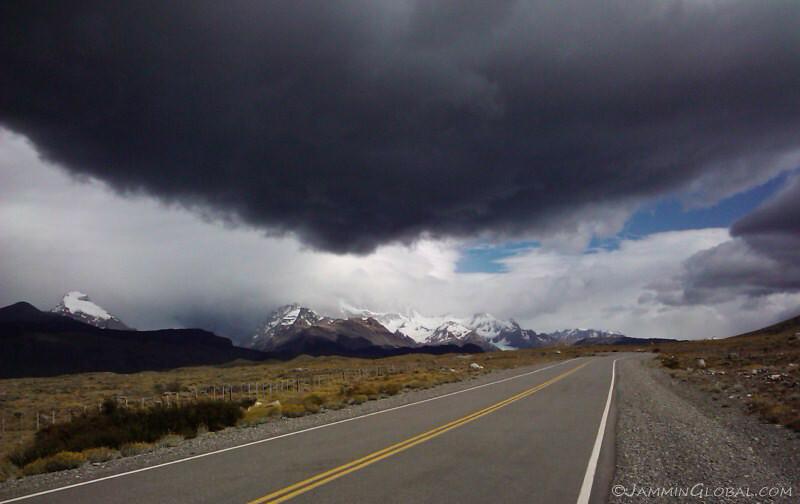 The clouds cleared as I got within 20 kms (12 mi) of the end and I was rewarded with beautiful views. 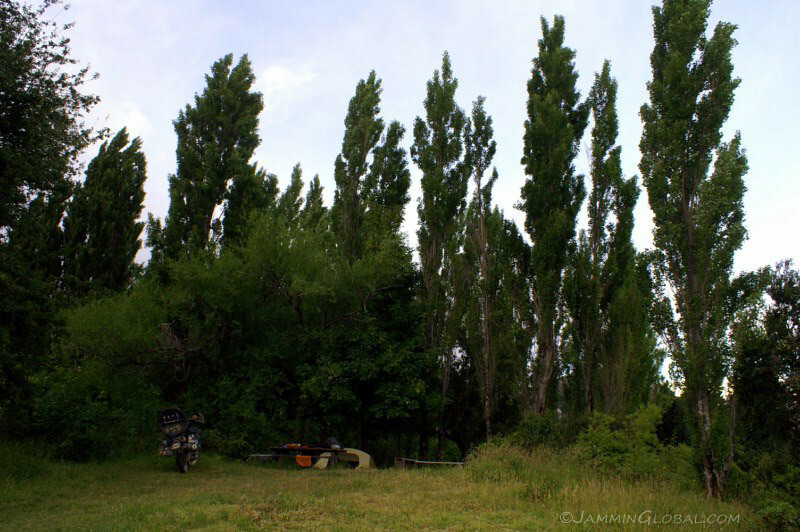 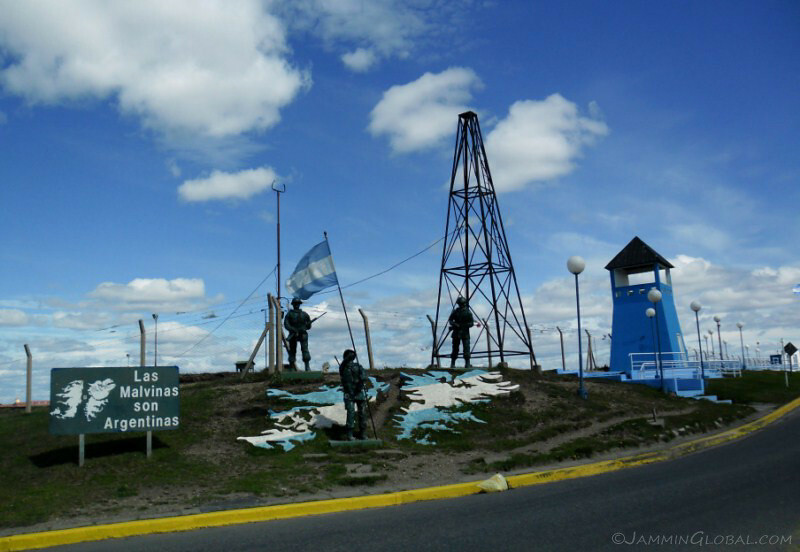 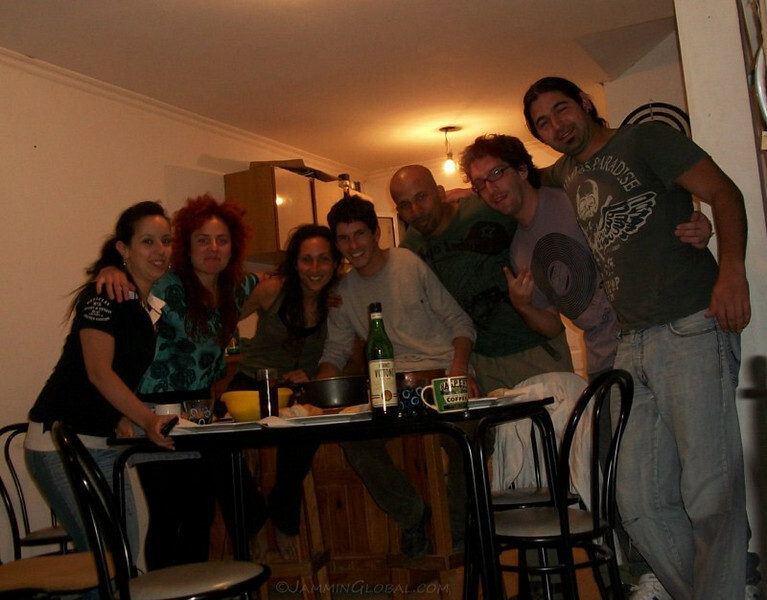 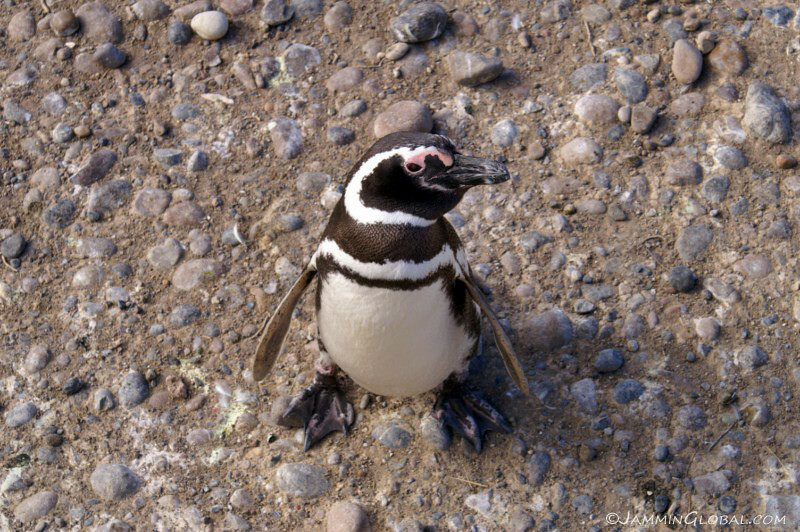 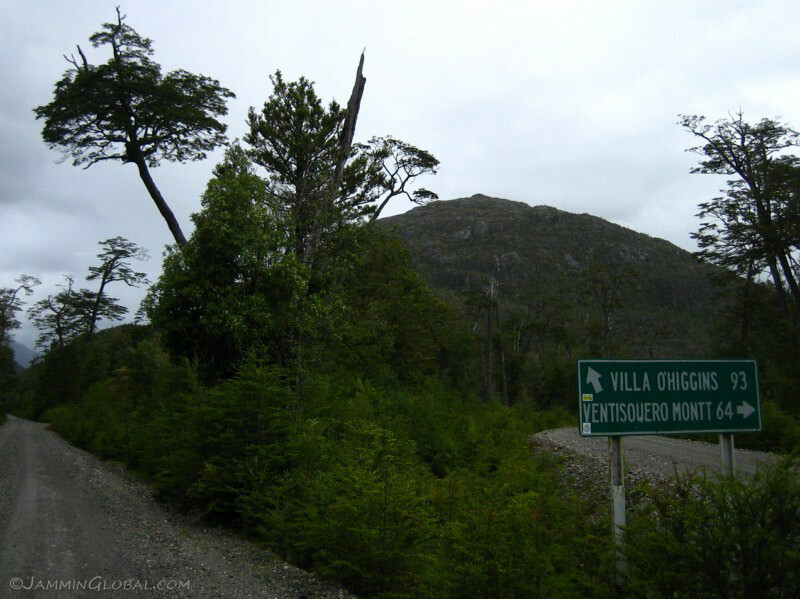 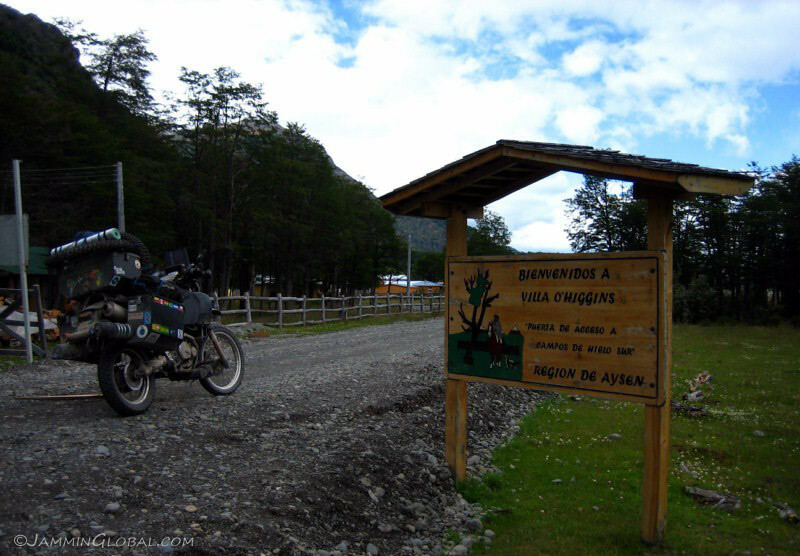 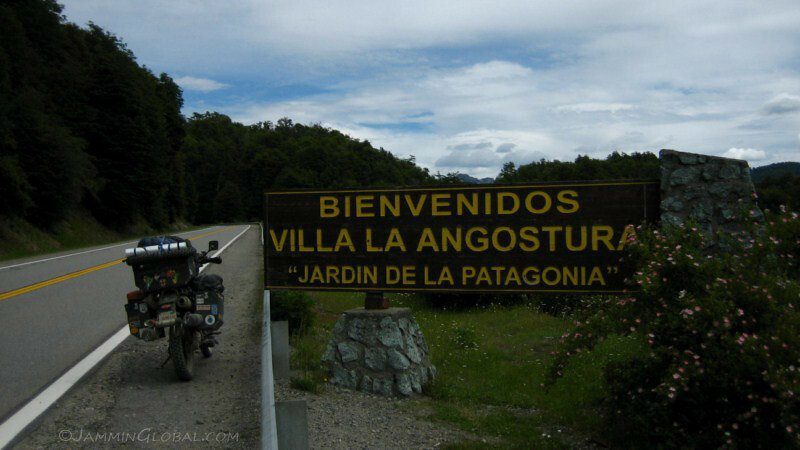 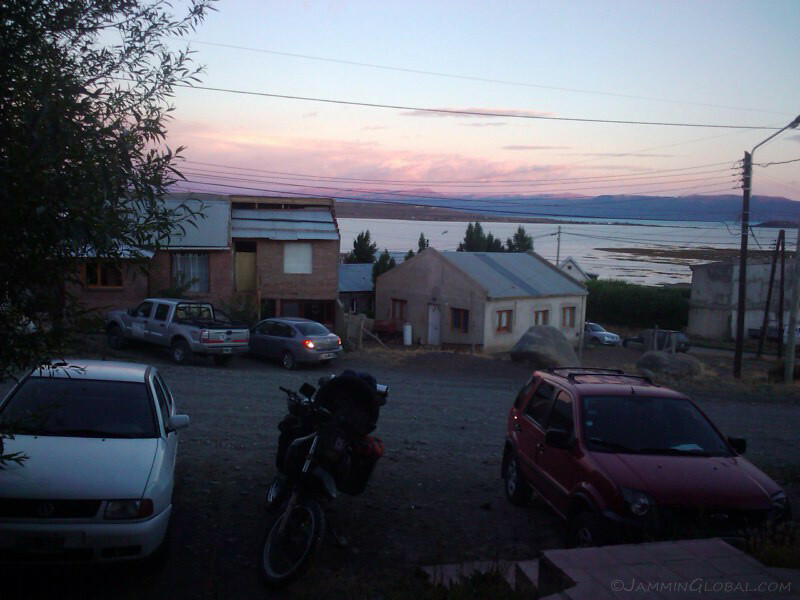 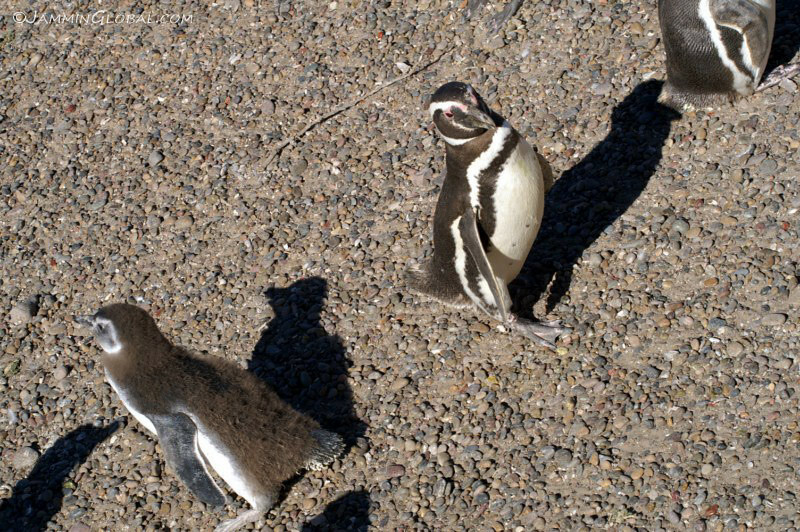 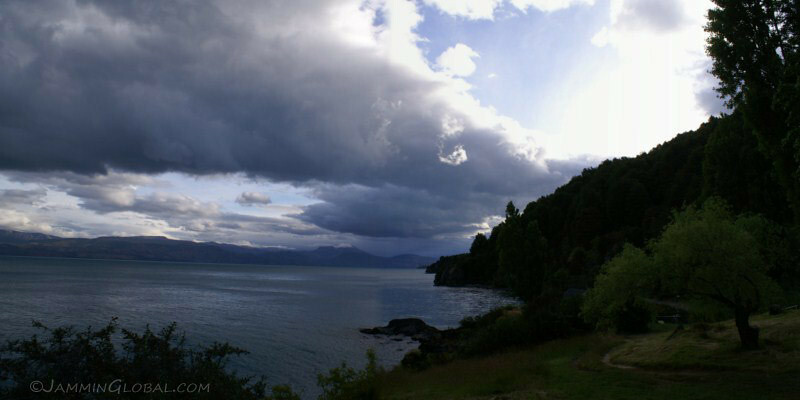 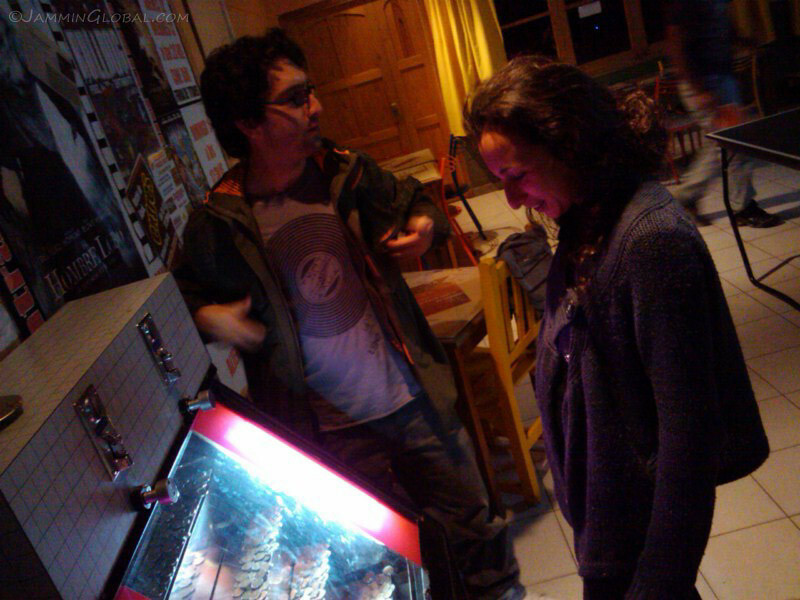 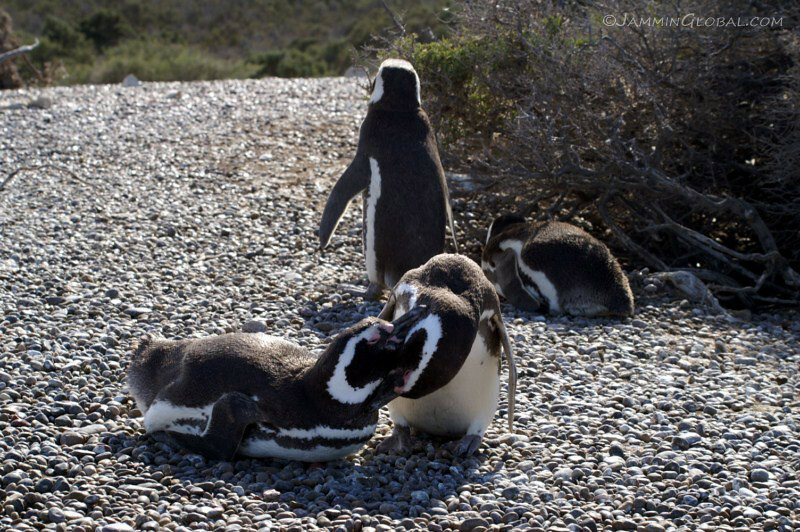 …I arrived in Villa O’Higgins, the end of the Carretera Austral. 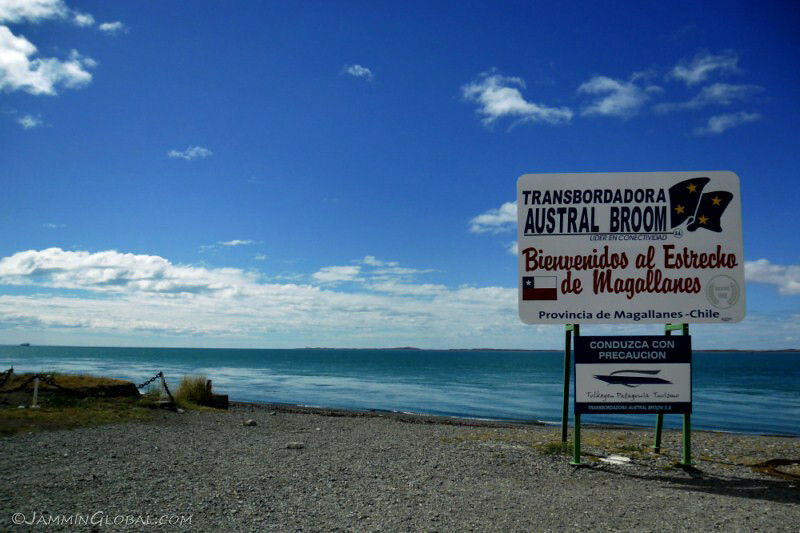 It’s a small outpost with about 500 inhabitants that was only recently connected to the rest of Chile via the Carretera Austral. 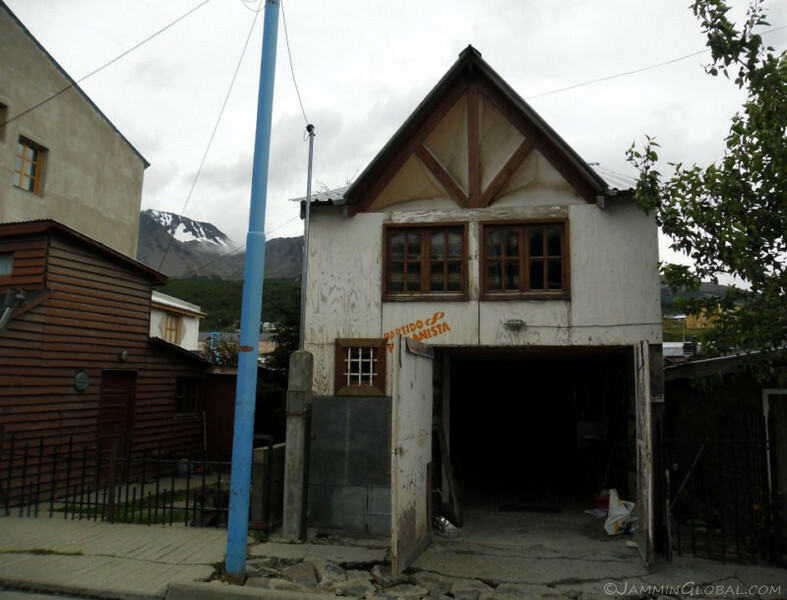 It was settled in the 1920s by European immigrants and renamed in 1966 to honour Chile’s independence hero, Bernard O’Higgins, who was born of Irish and Basque descent in the 18th century. 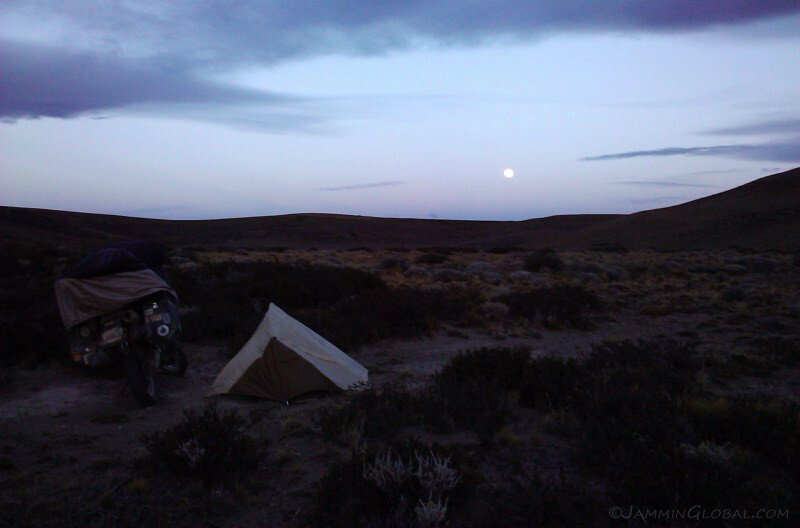 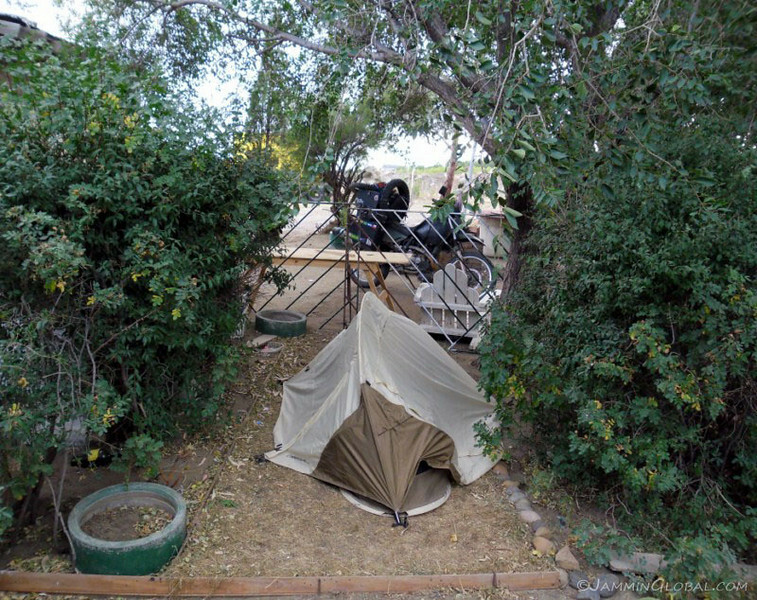 I found a place to camp for the night and then continued along the road to the actual end of the route, a few kilometers south of town. 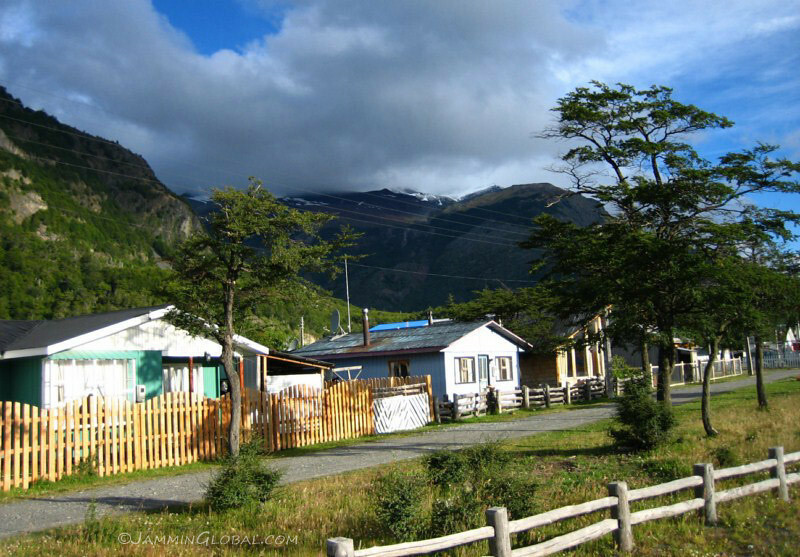 There’s free WiFi access in the town square as HidroAysén tries to buy the favour of the local people so that it can go ahead and flood Patagonia. 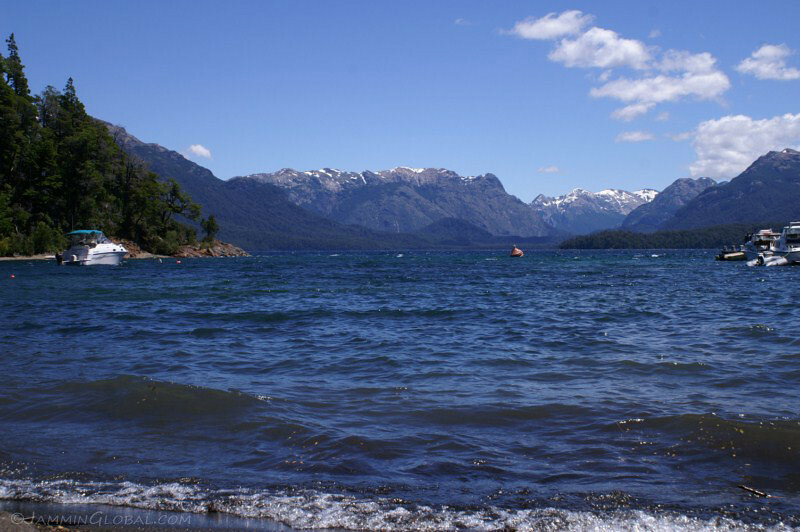 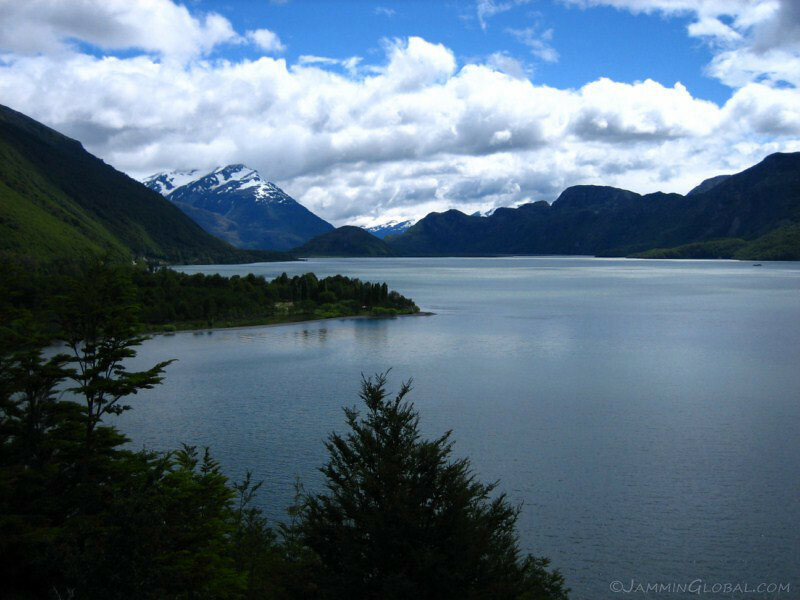 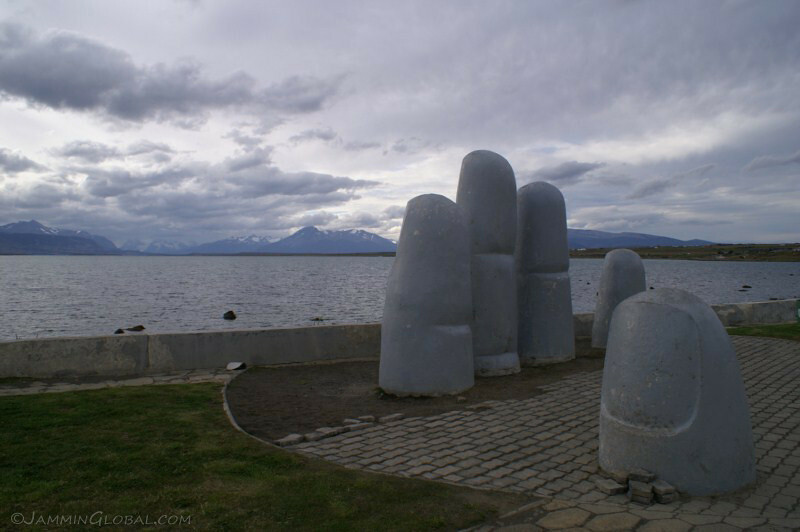 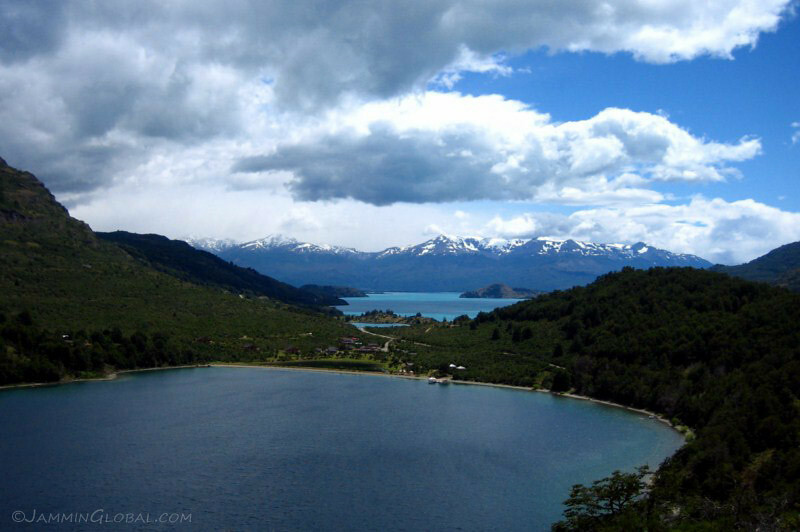 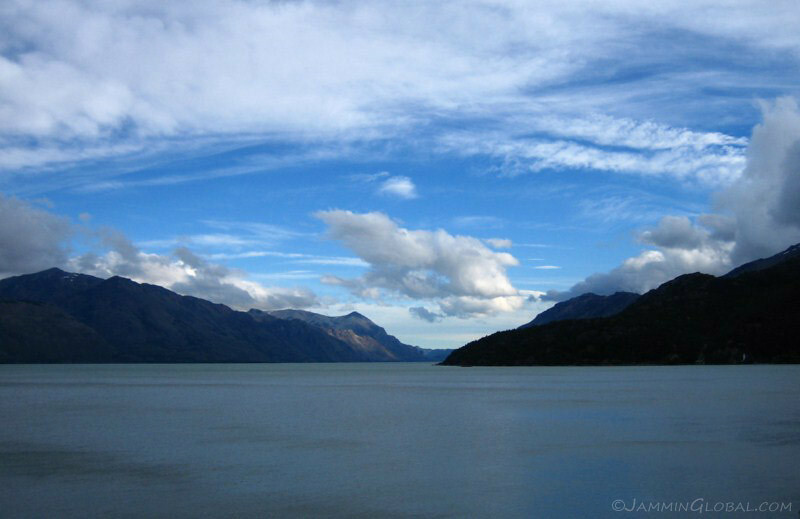 South of town lies the huge Lago O’Higgins, which straddles the border with Argentina and their half is called Lago San Martín, named after Argentina’s independence hero of José de San Martín. 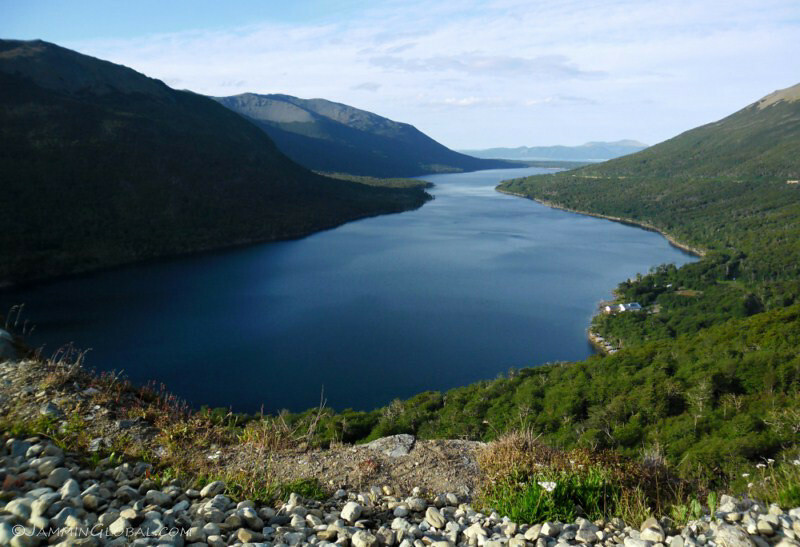 It’s the most irregular of the large Patagonian lakes with eight well-defined fingers, four on each side of the border that runs along the mountains to the left. 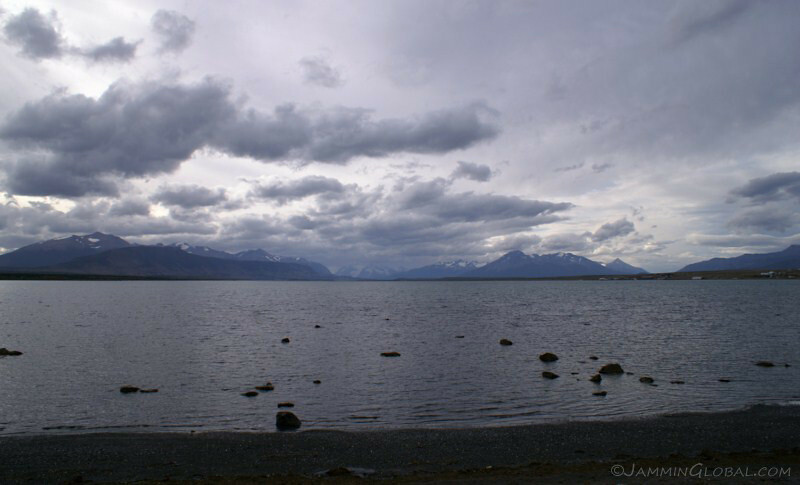 To the right is the huge Southern Patagonian Ice Field, which feeds the lake through numerous glaciers. 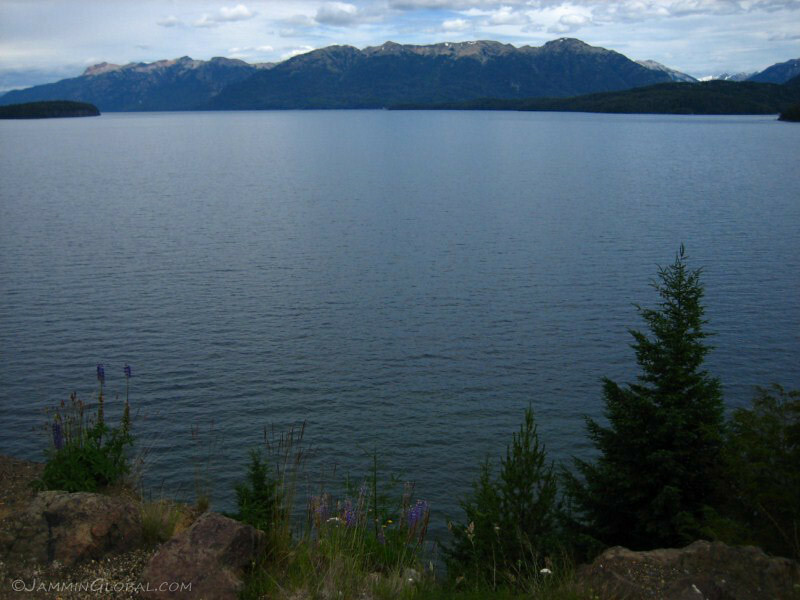 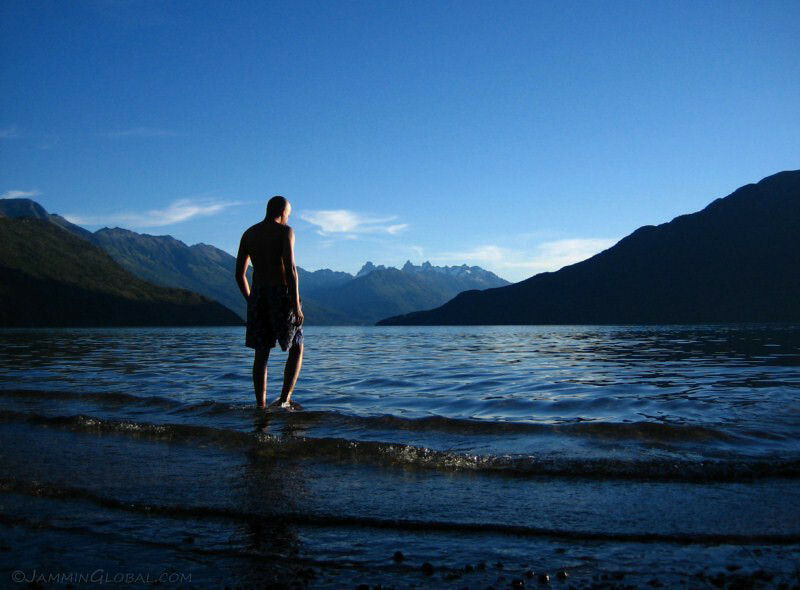 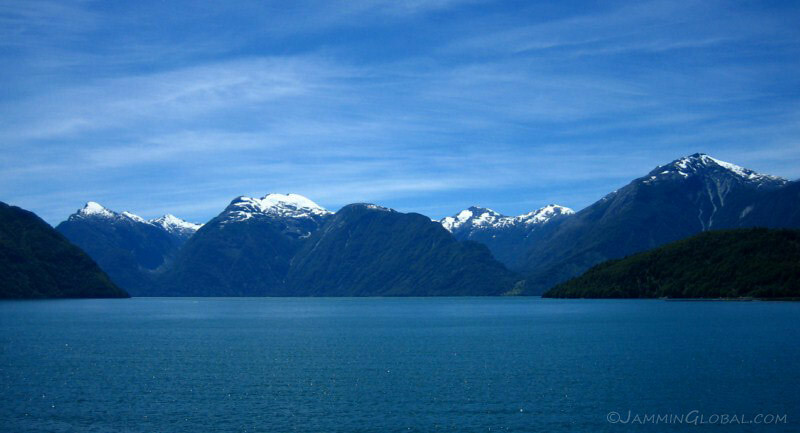 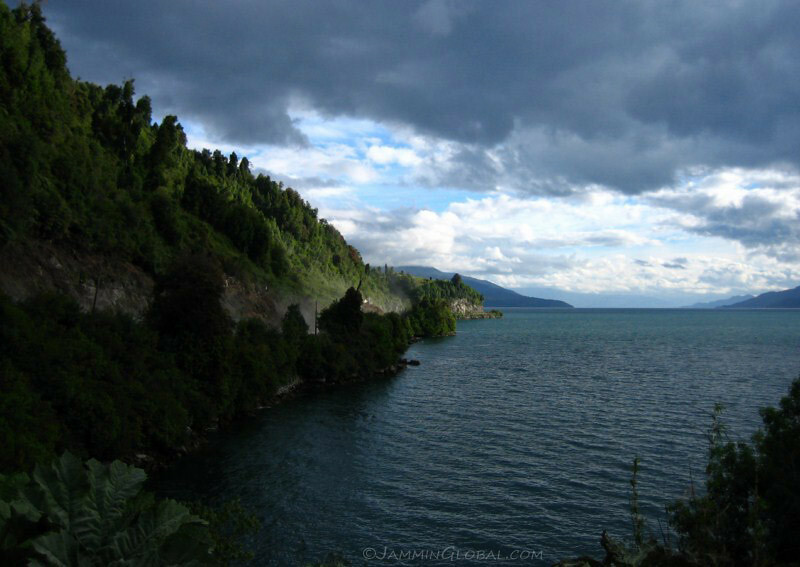 An interesting feature is that this is the deepest lake in South America with a maximum depth of 836 m (2,742 ft), even though it only sits at an elevation of 250 m (820 ft). 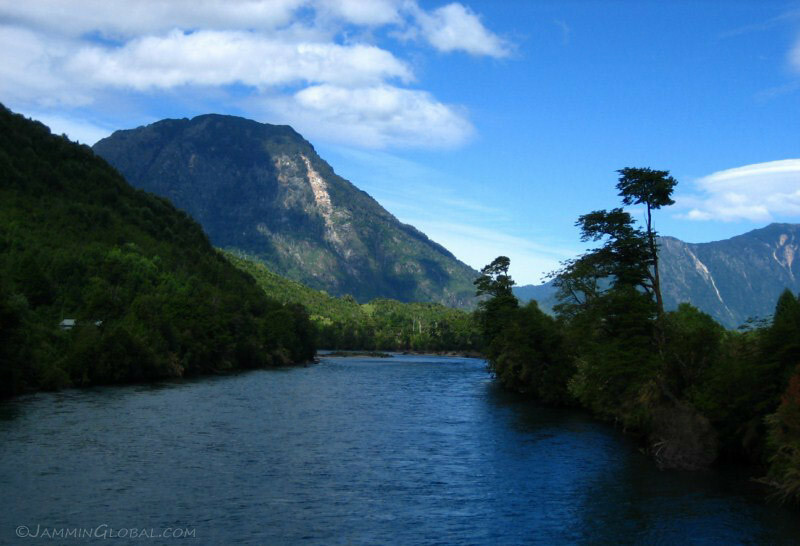 Besides damming Rio Baker, HidroAysén would like to build a dam across Rio Pascua, which drains this lake into the Pacific. 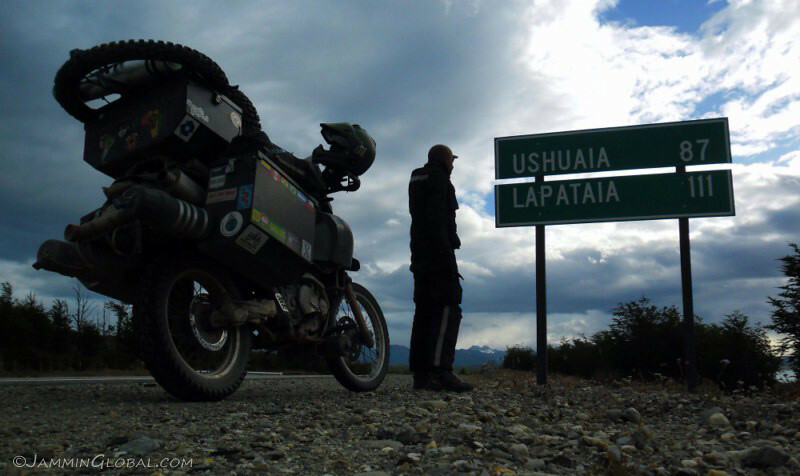 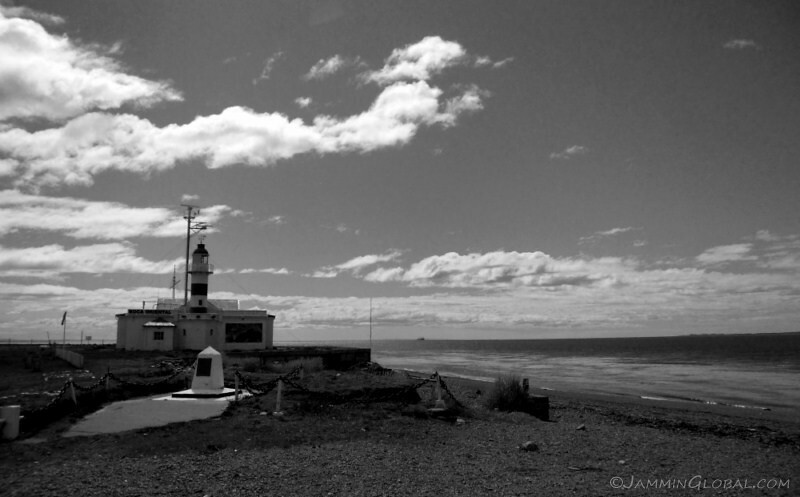 At the unceremonious end of the Carretera Austral. 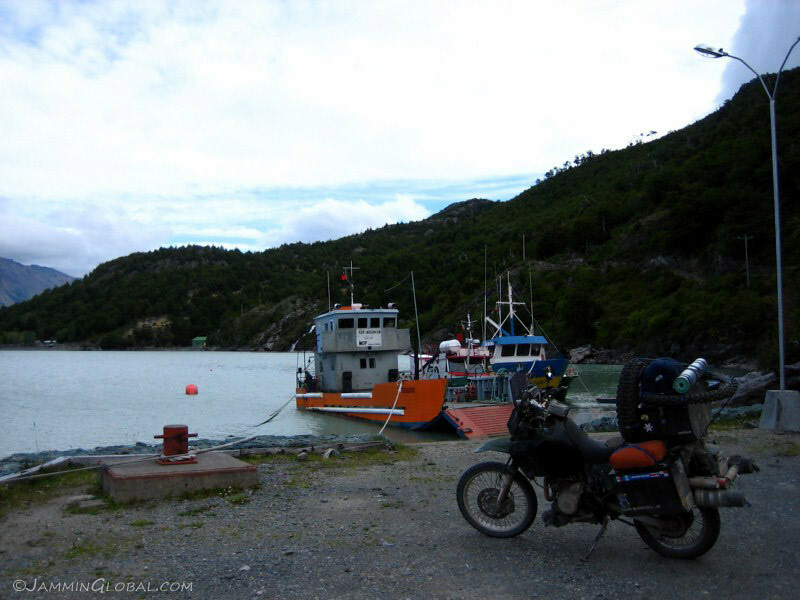 From this port, tourist boats leave for day trips to the O’Higgins Glacier and provide transport for bicyclists and hikers for the route to El Chaltén in Argentina. 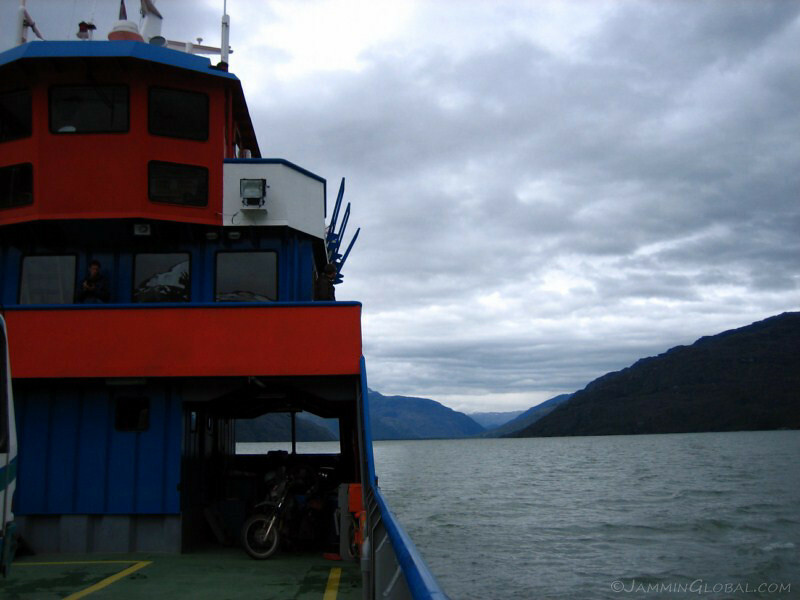 That route consists of taking this ferry for $40, hiking 12 kms along a rough horse path, which is not suitable for any kind of motorized traffic and then catching another ferry across Lago del Desierto to El Chaltén. 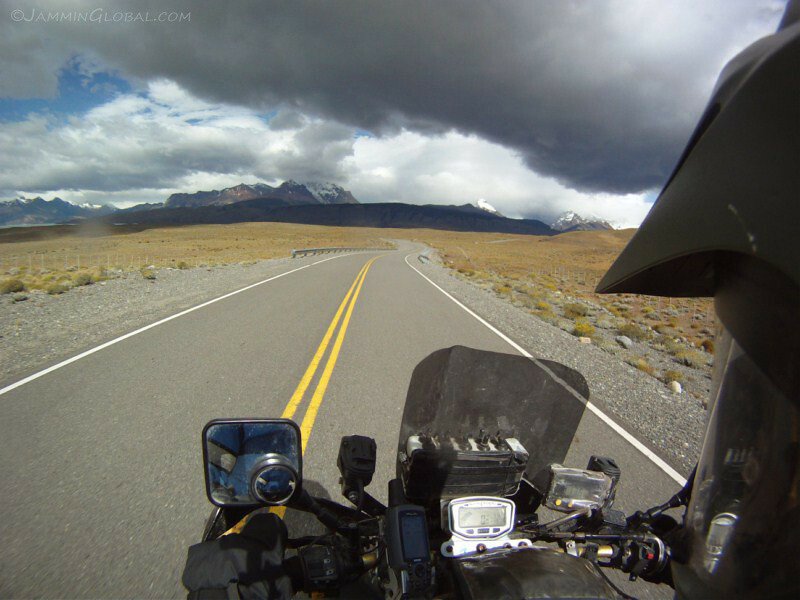 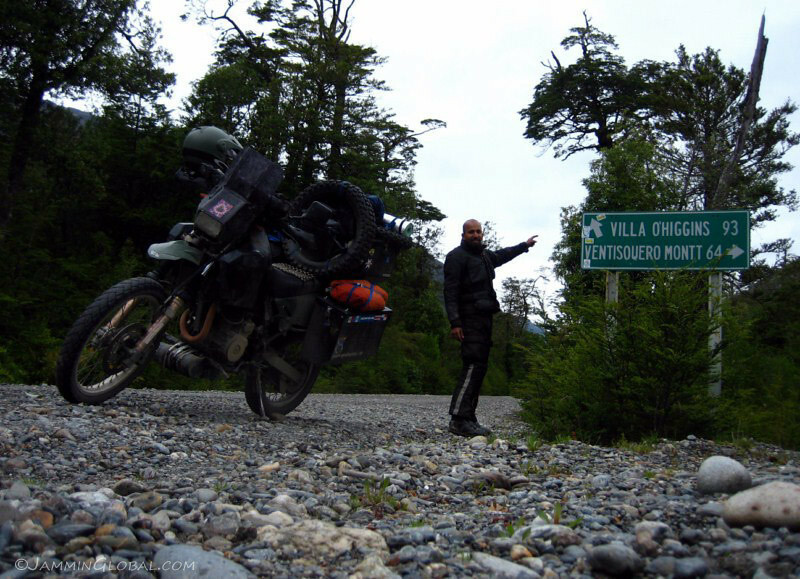 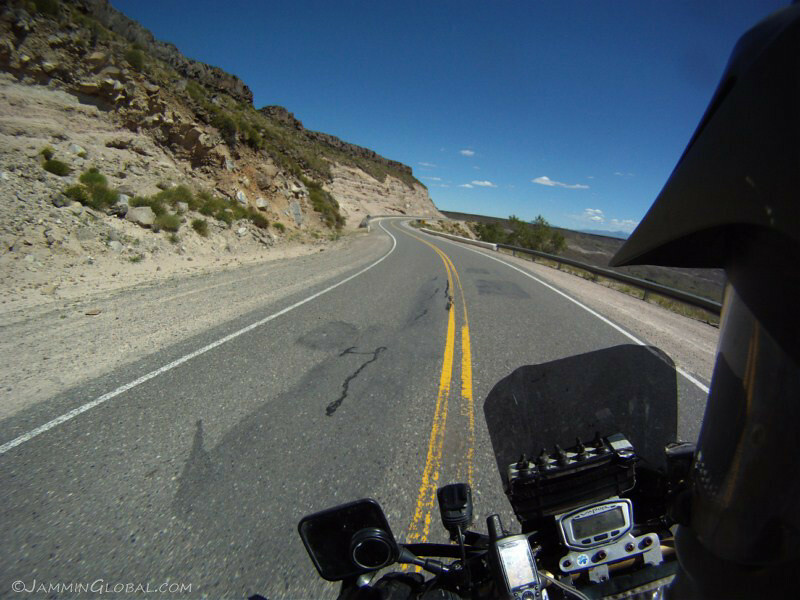 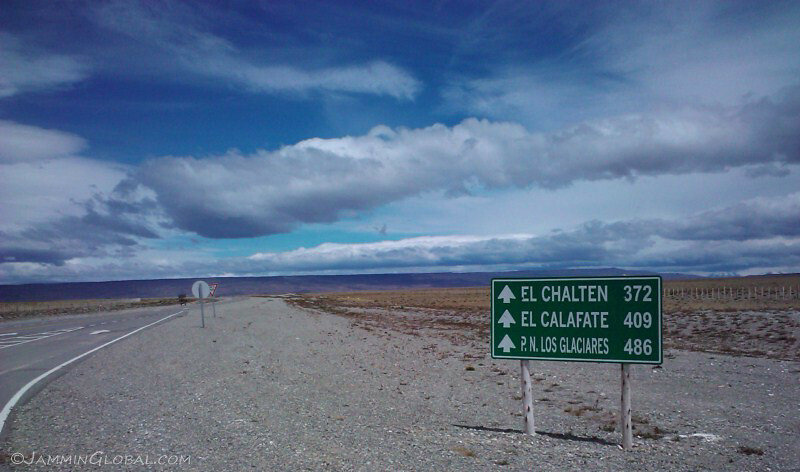 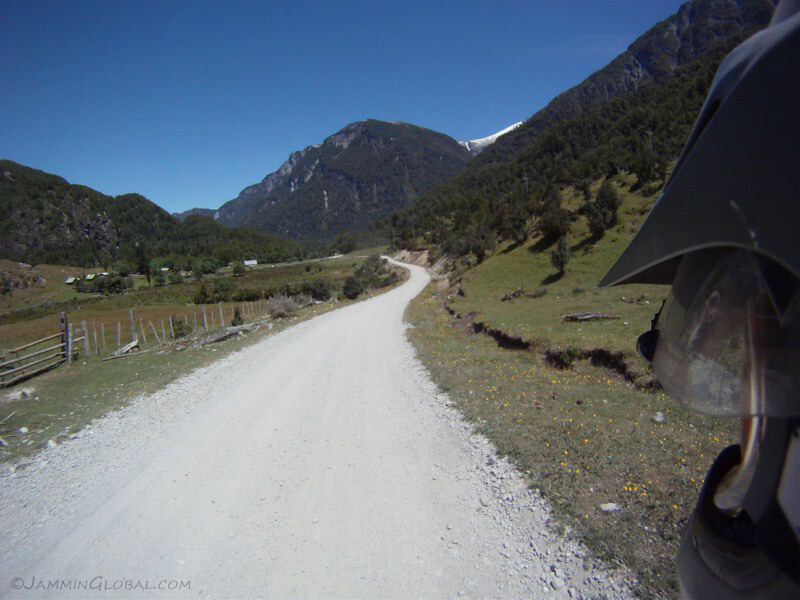 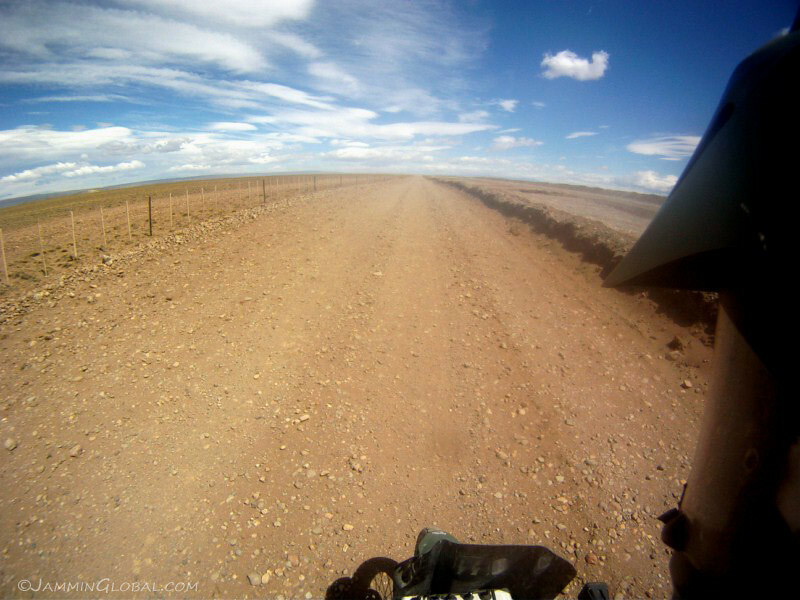 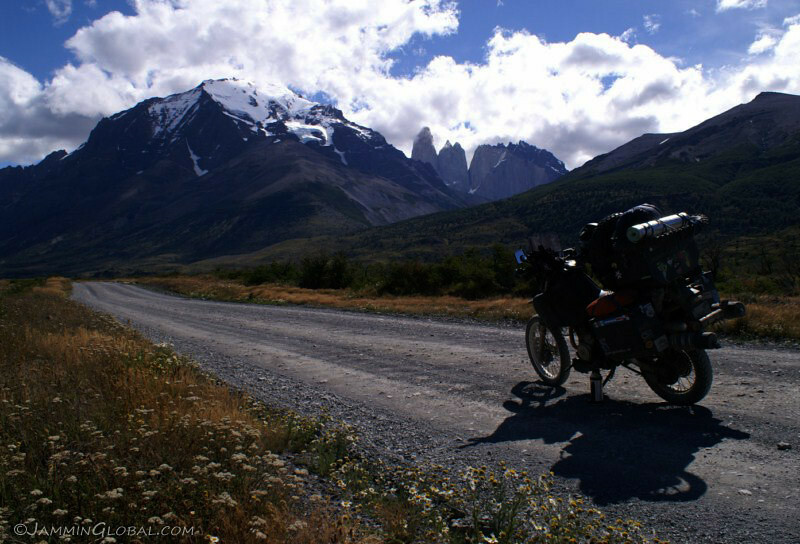 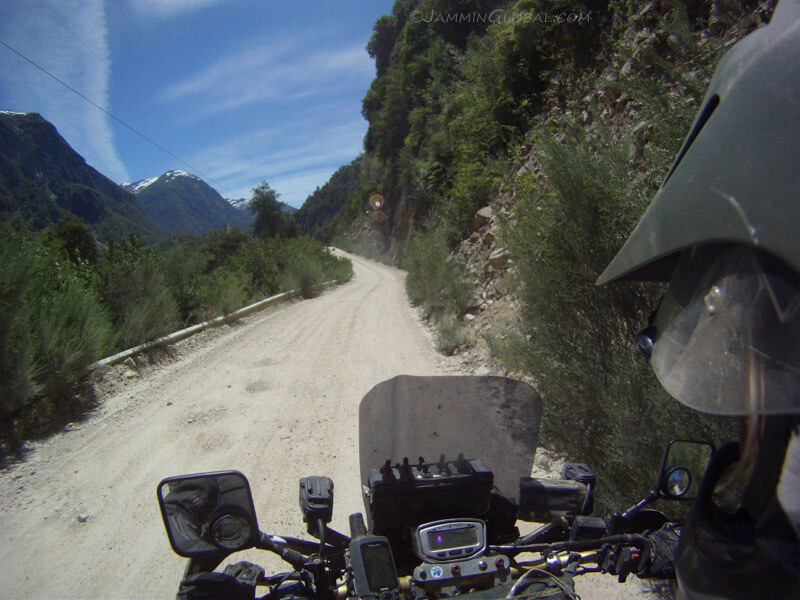 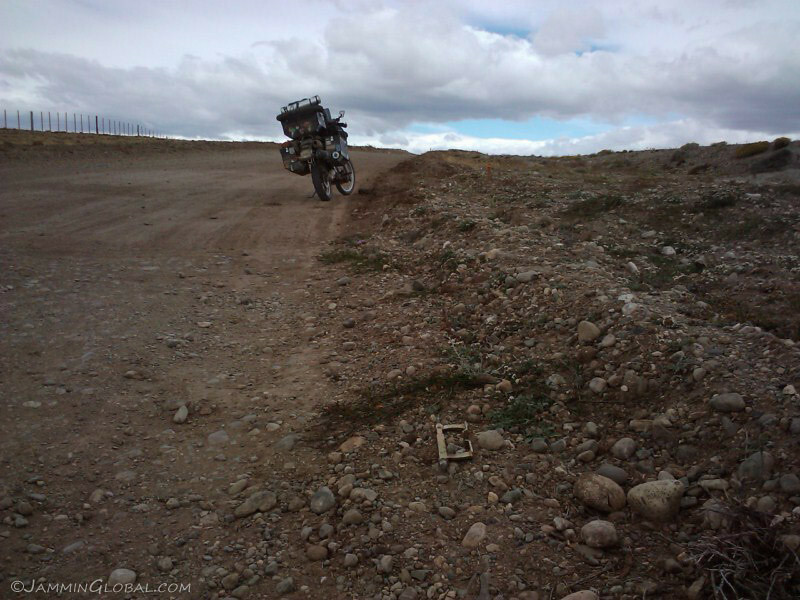 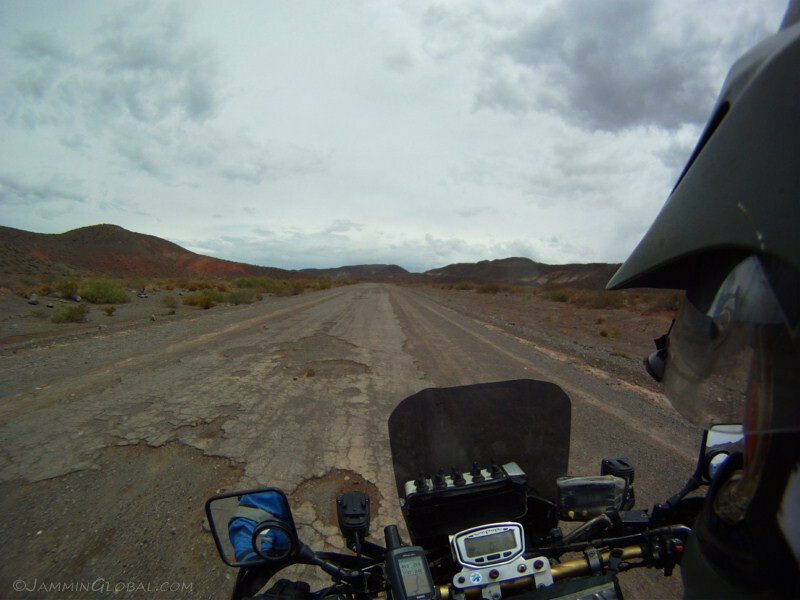 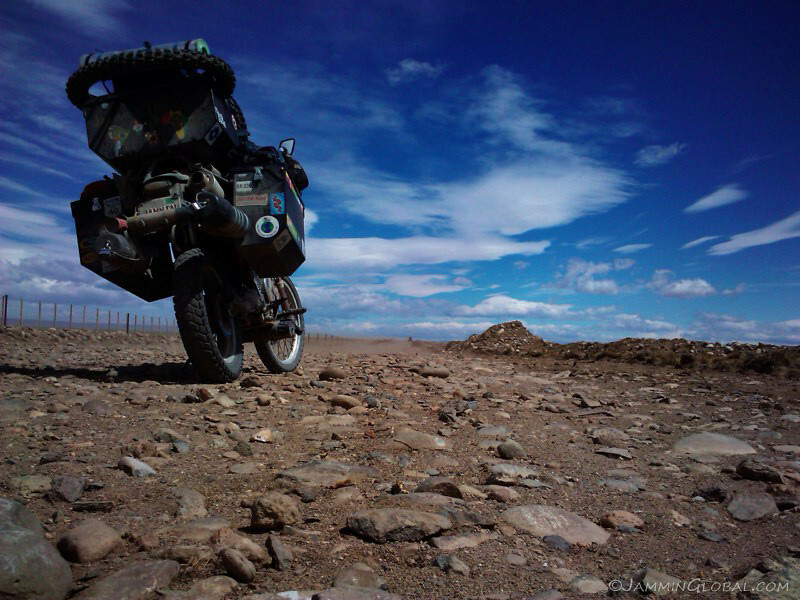 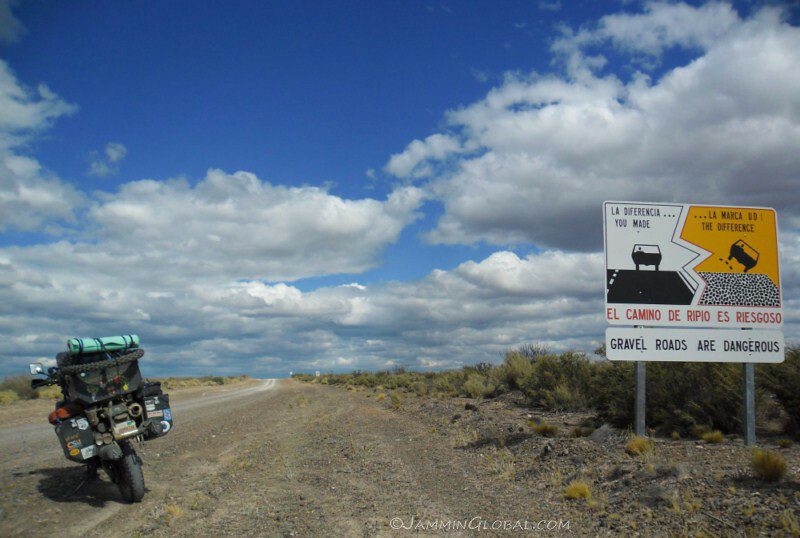 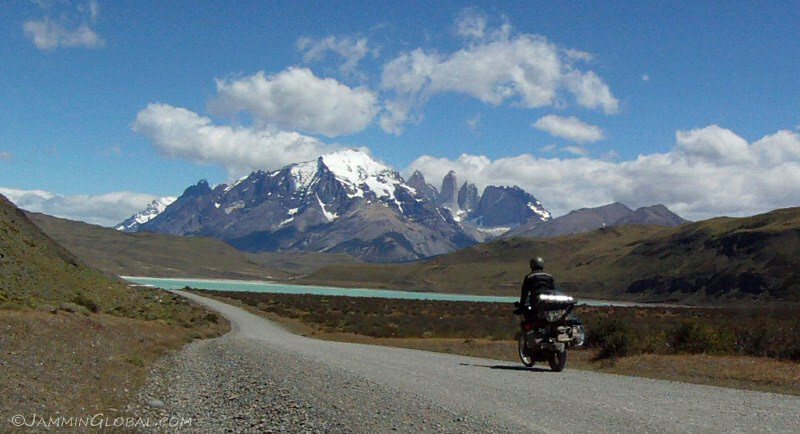 For motorized traffic, the only way to El Chaltén is back-tracking up to cross at Chile Chico or Paso Roballos. 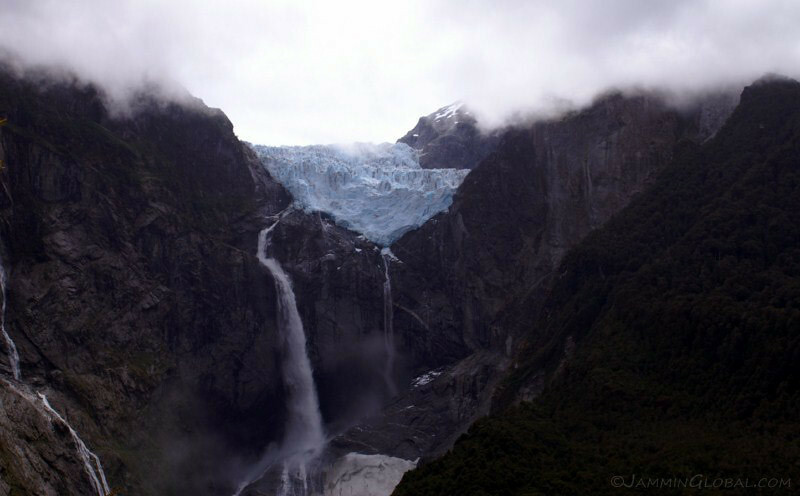 A small glacier hanging above the town as I returned for the evening. 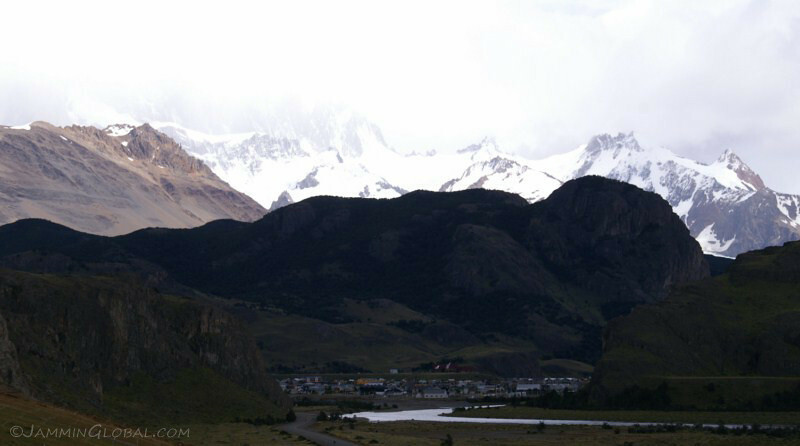 From the campground, looking across the valley and marveling at the fact of this huge extent of ice, the Southern Patagonian Ice Field, lying just behind those mountains. 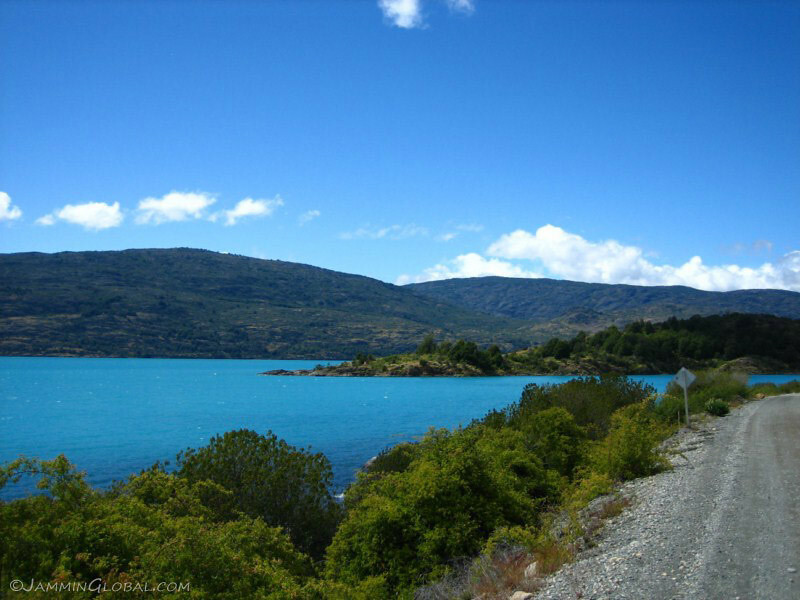 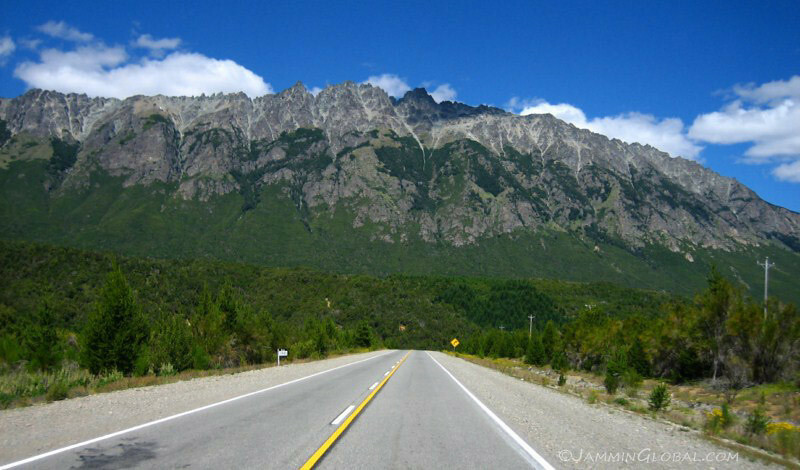 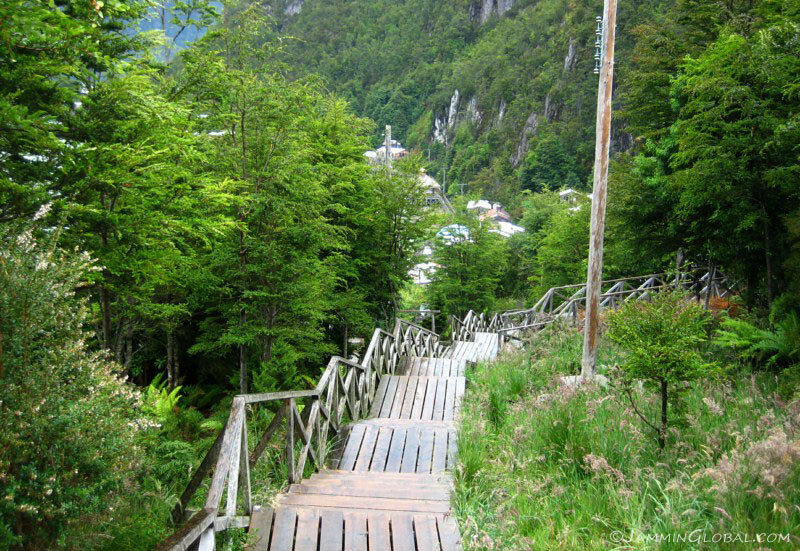 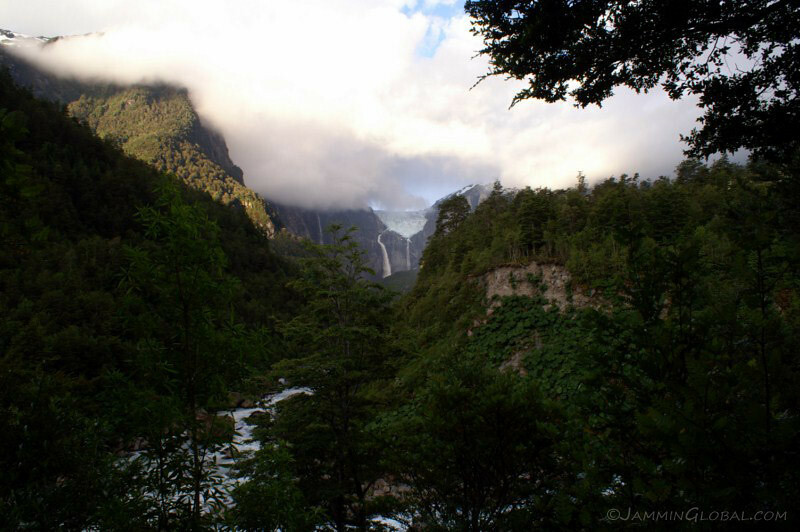 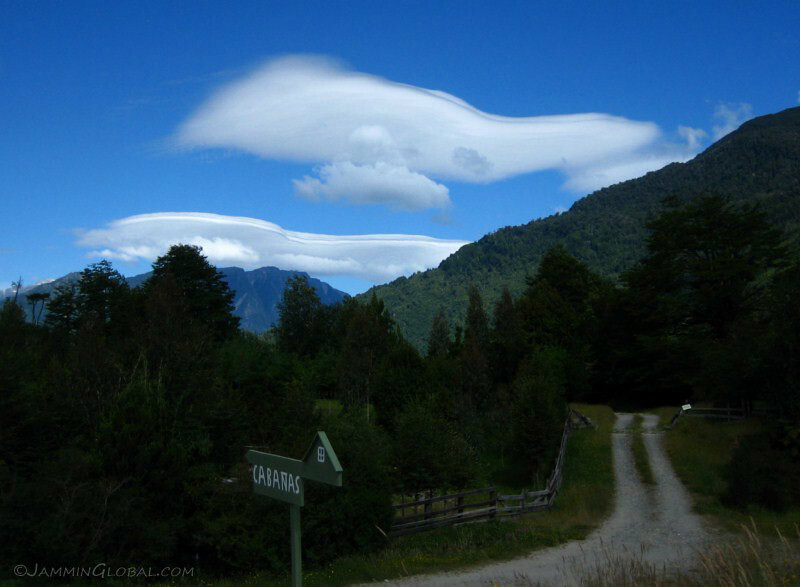 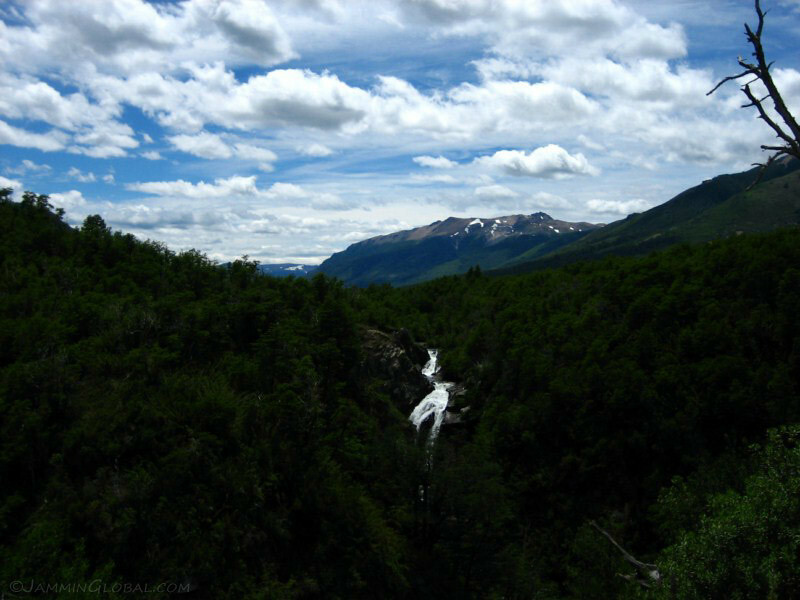 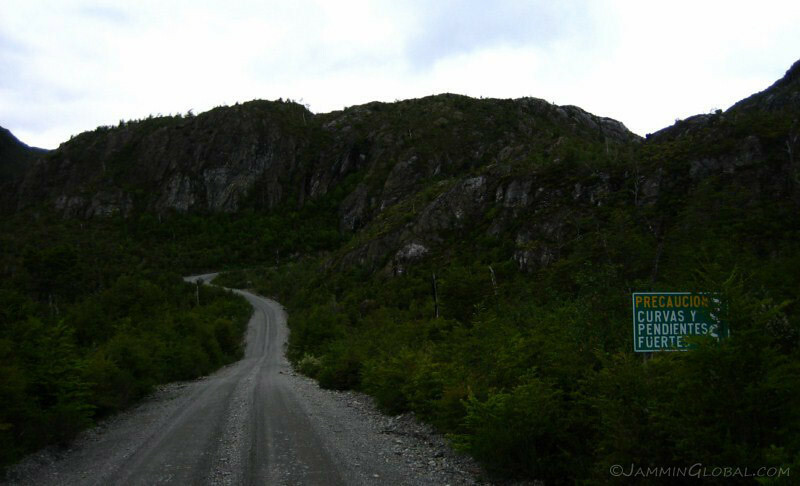 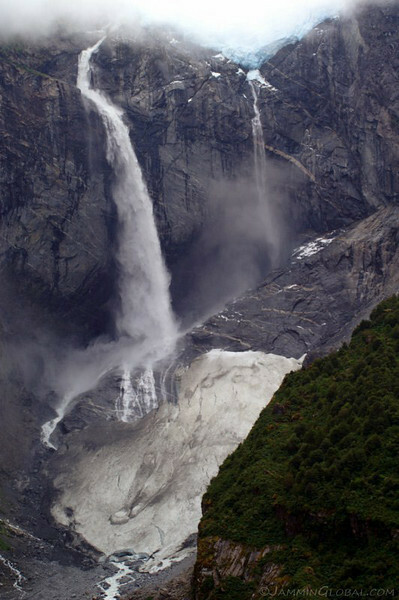 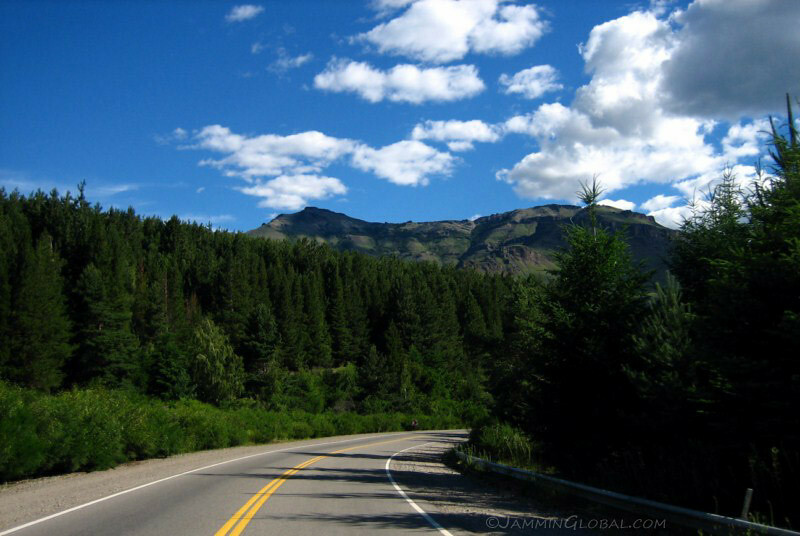 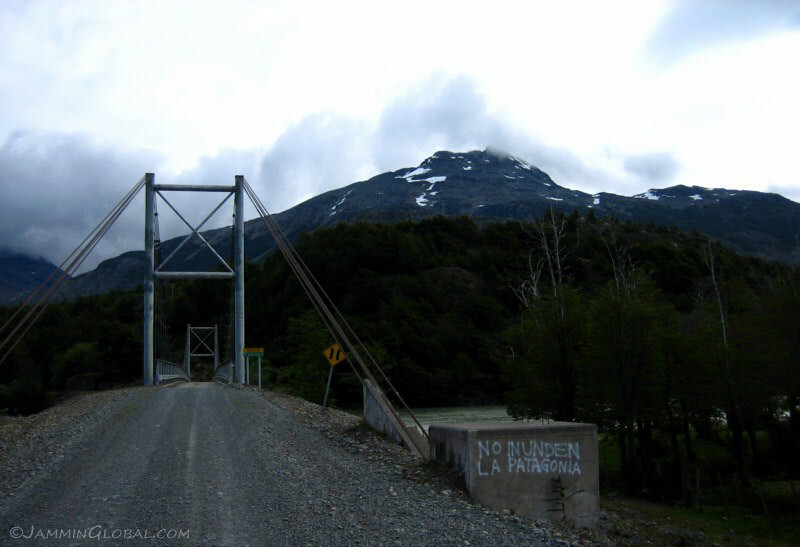 It dictates the current terminus of the Carretera Austral. 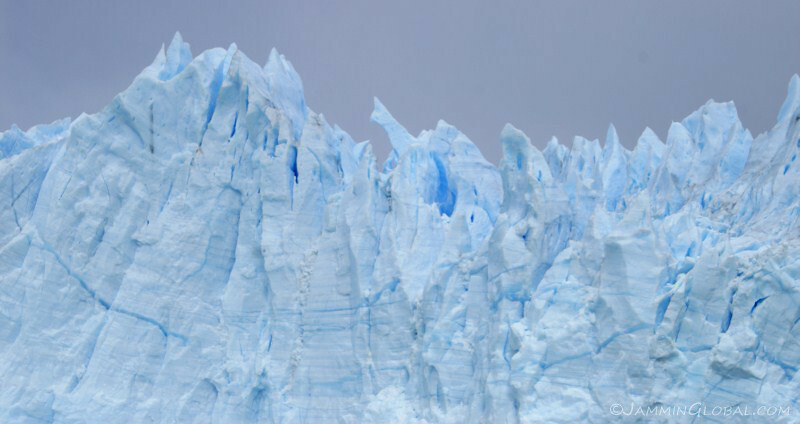 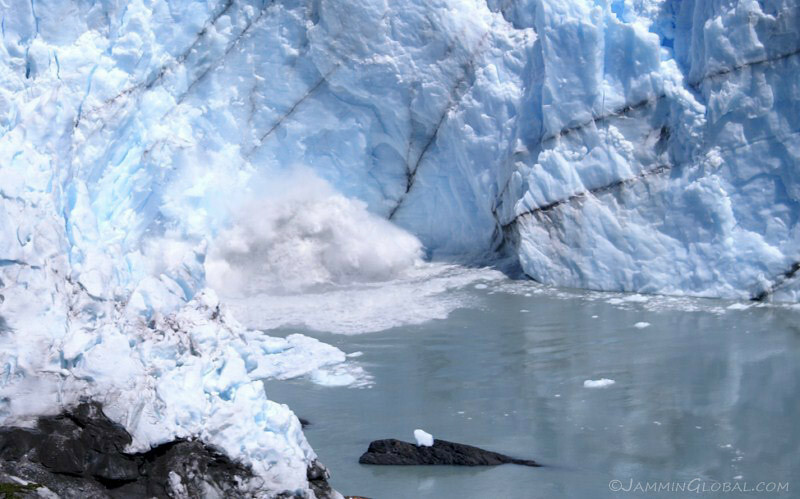 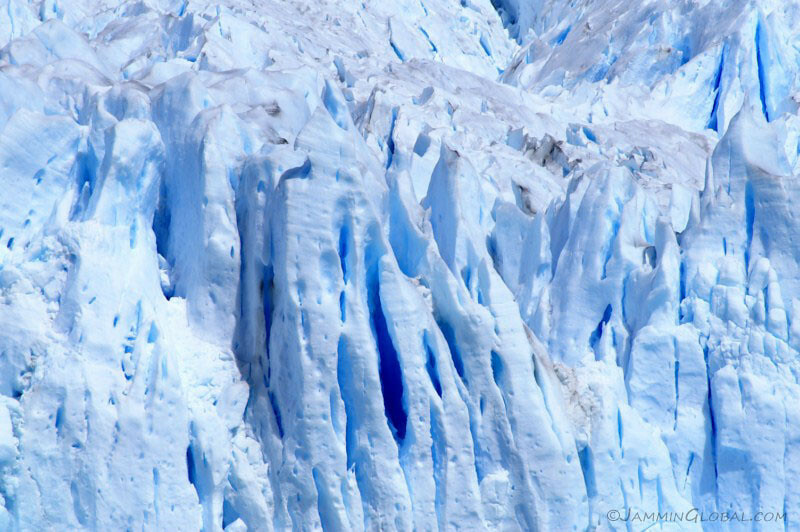 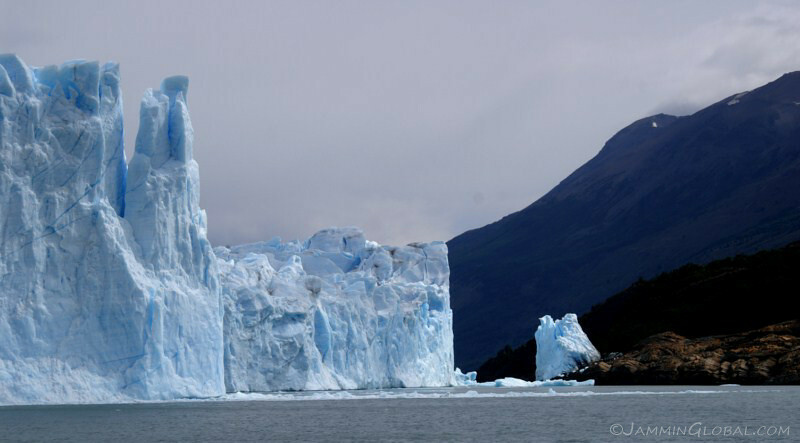 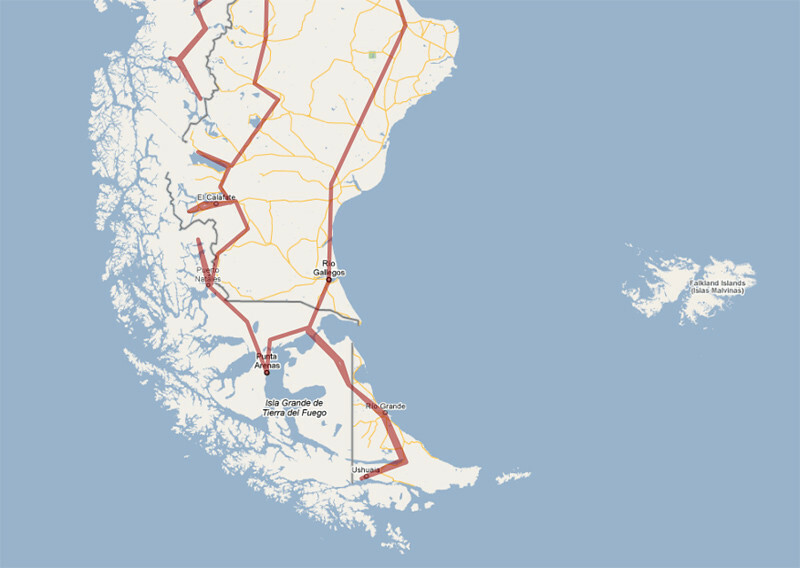 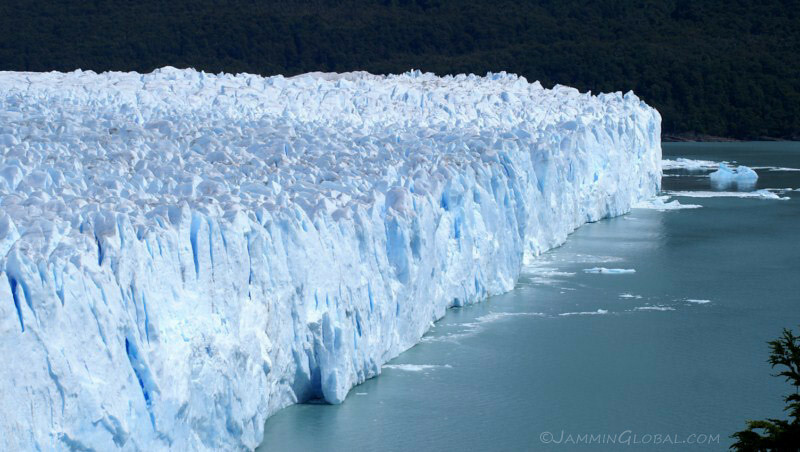 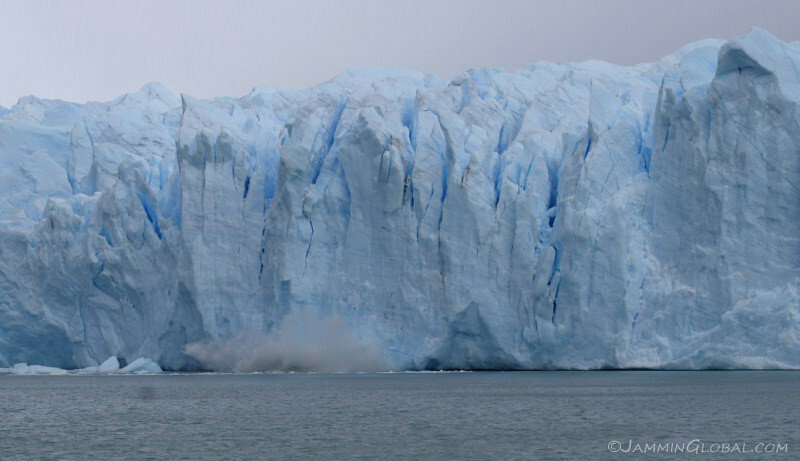 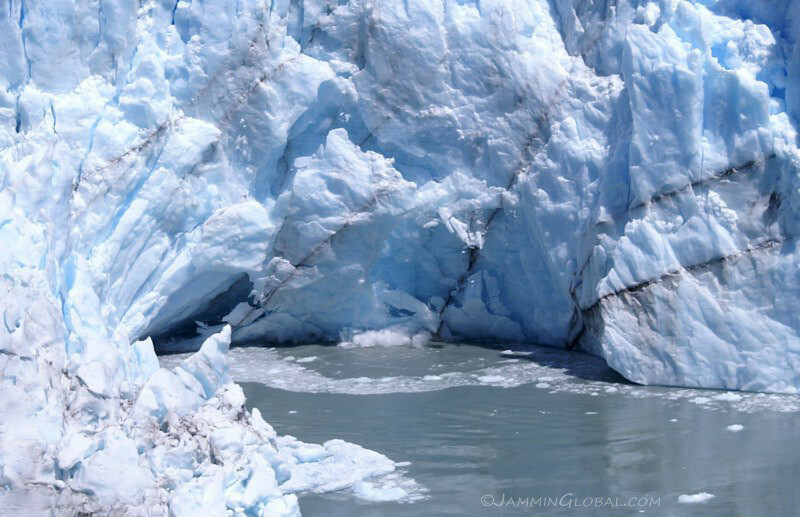 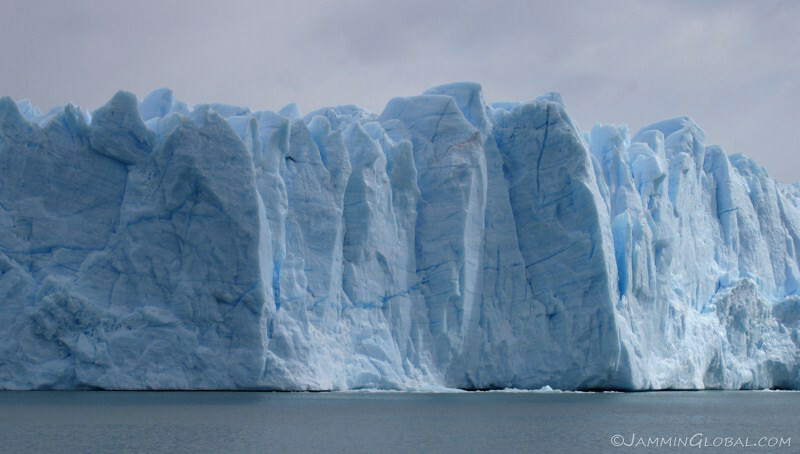 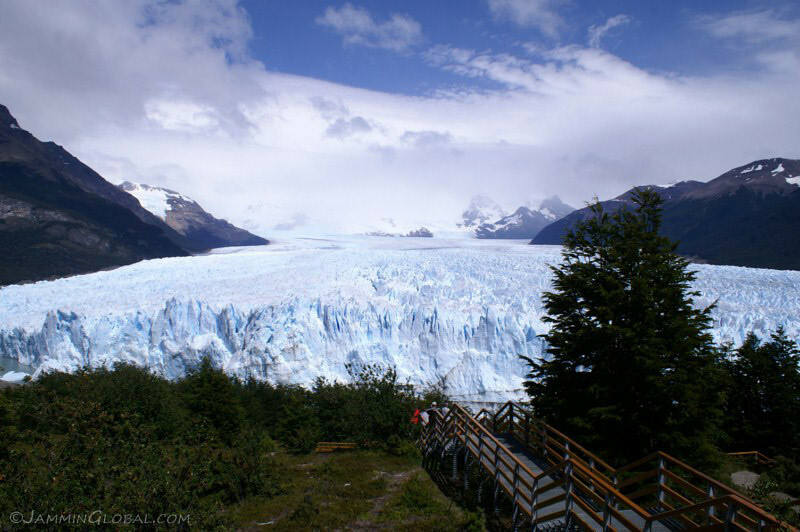 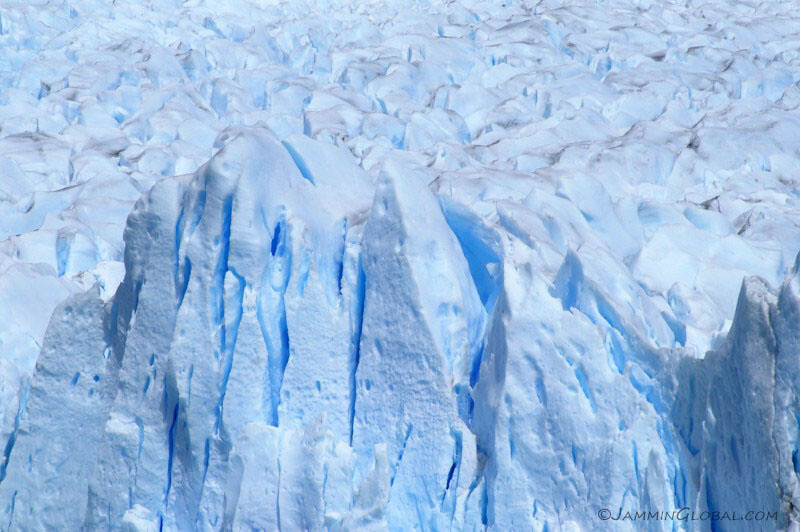 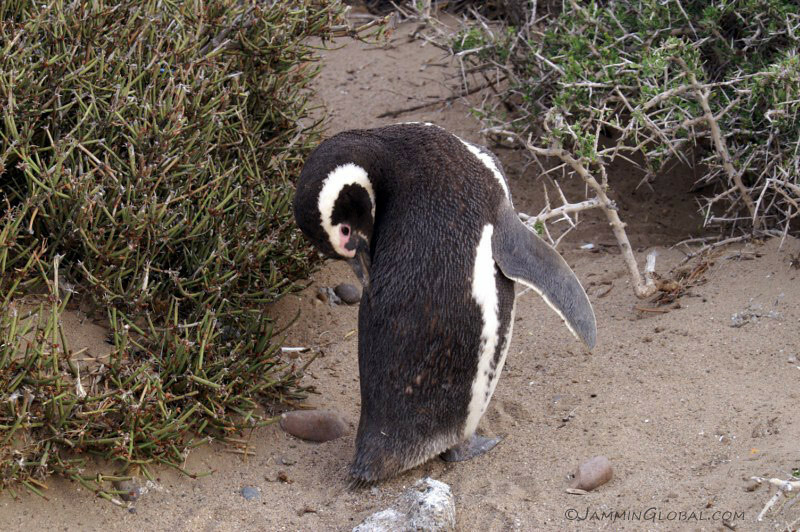 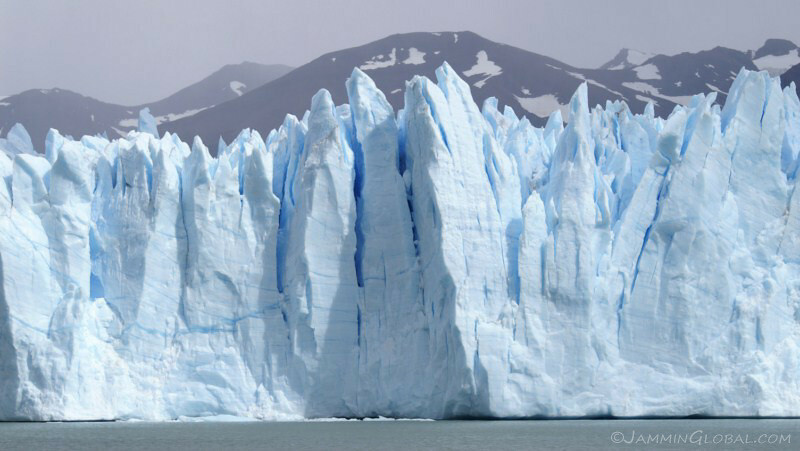 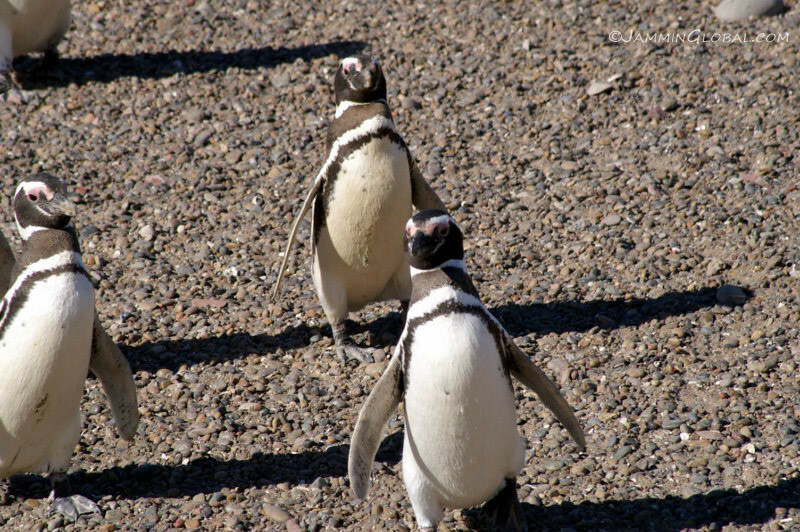 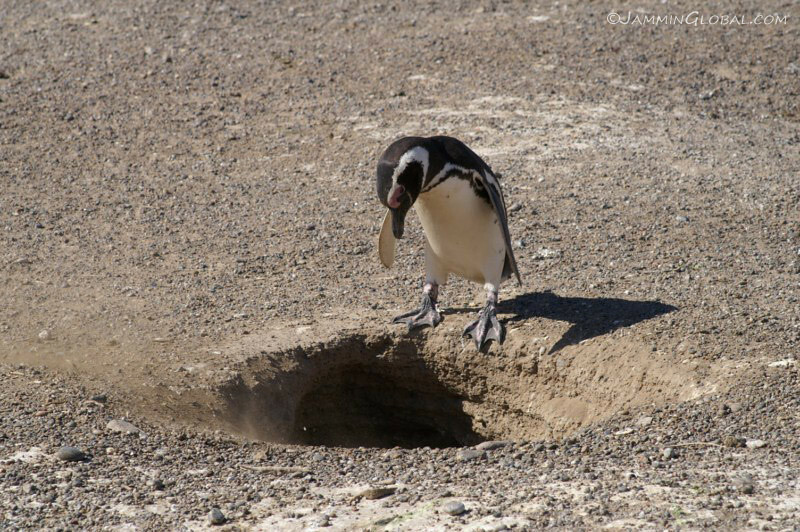 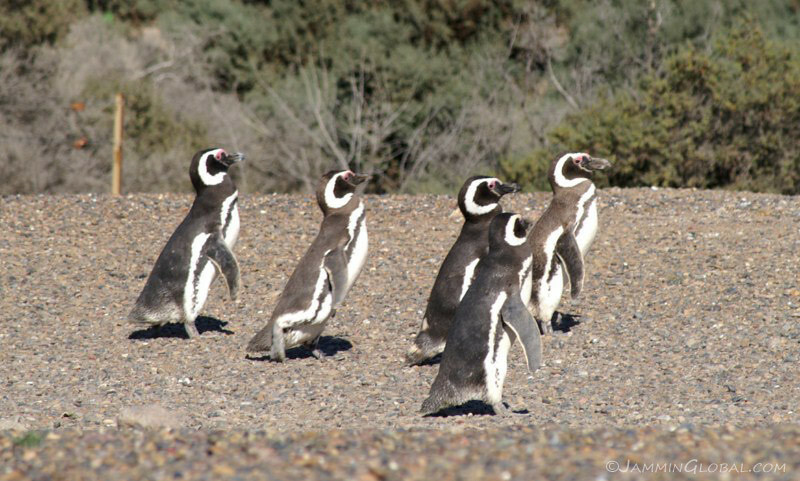 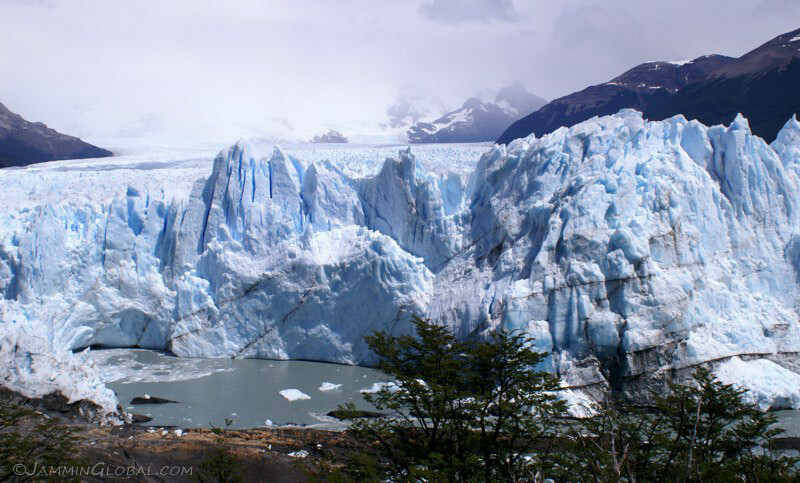 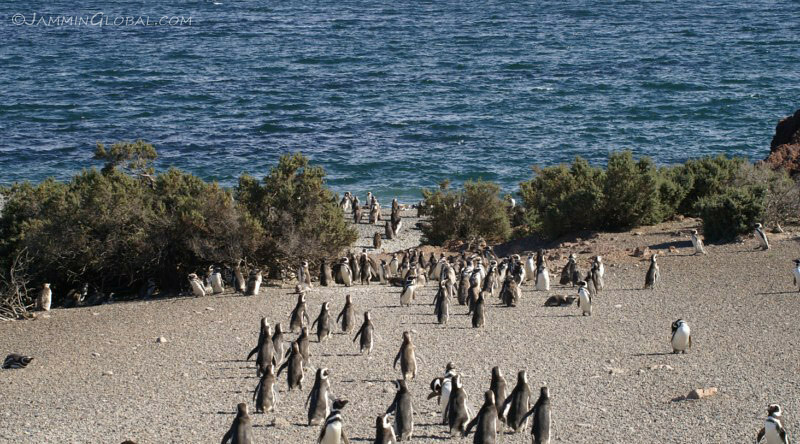 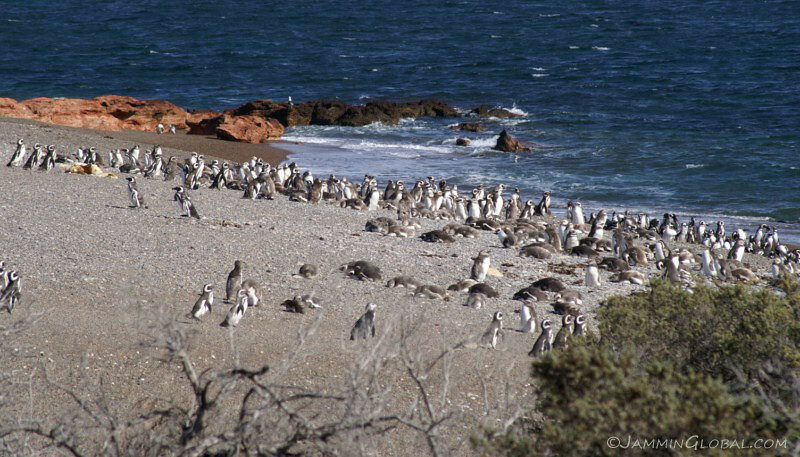 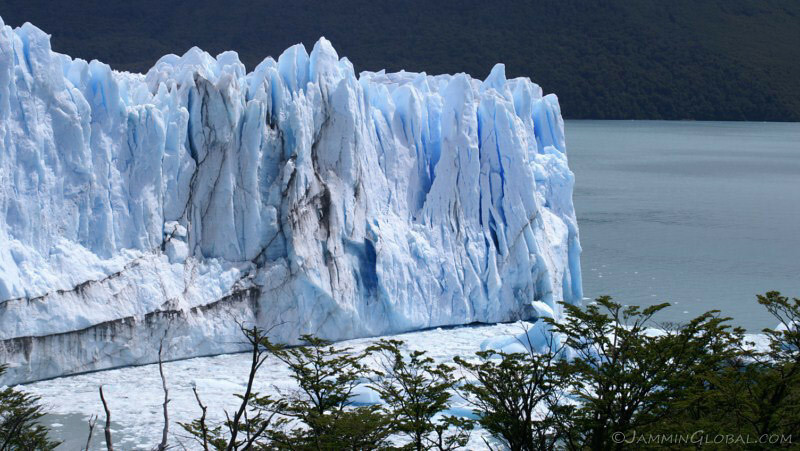 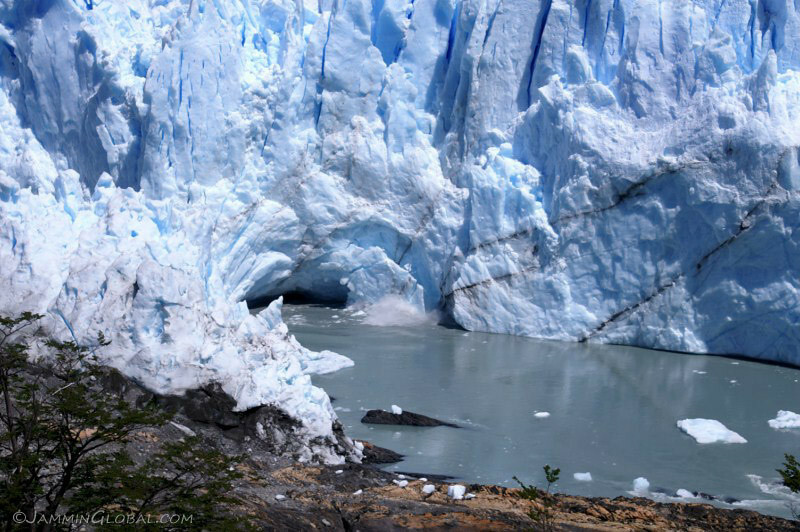 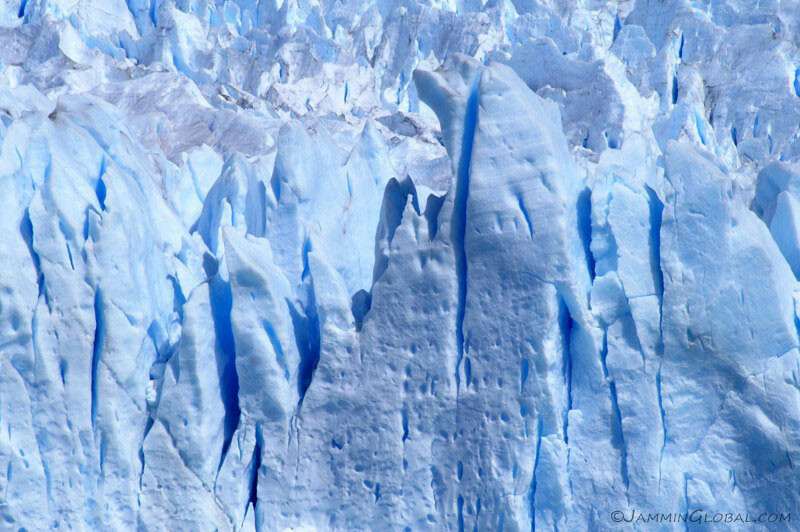 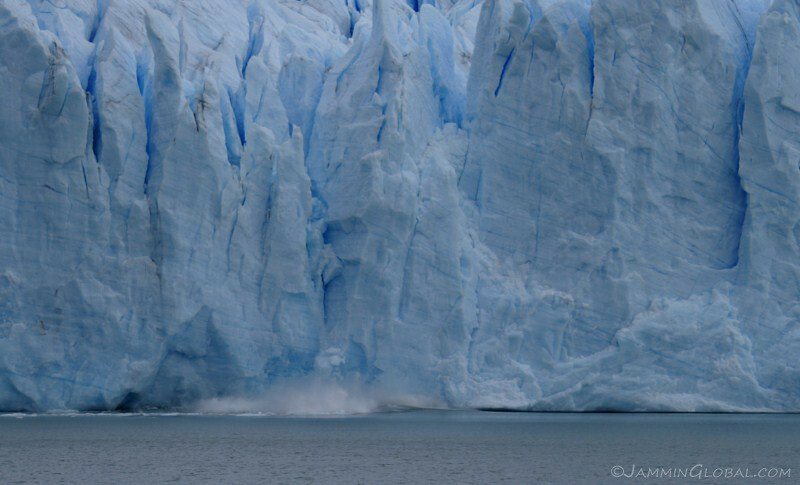 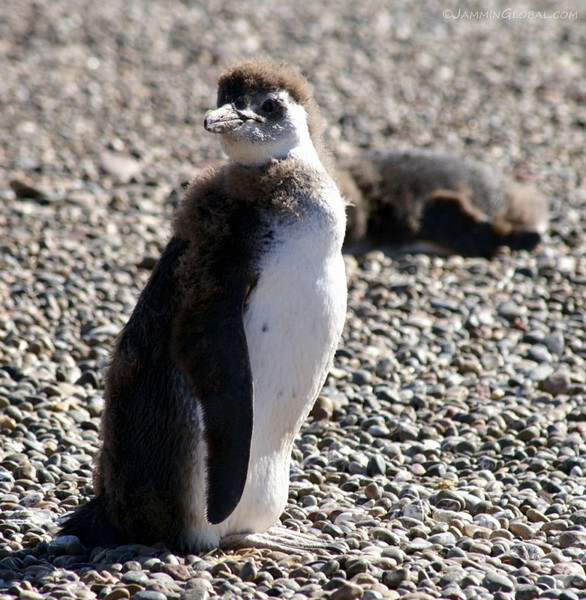 To continue south, the route must go around the ice field, either via ferries along the coast or via land in Argentina.